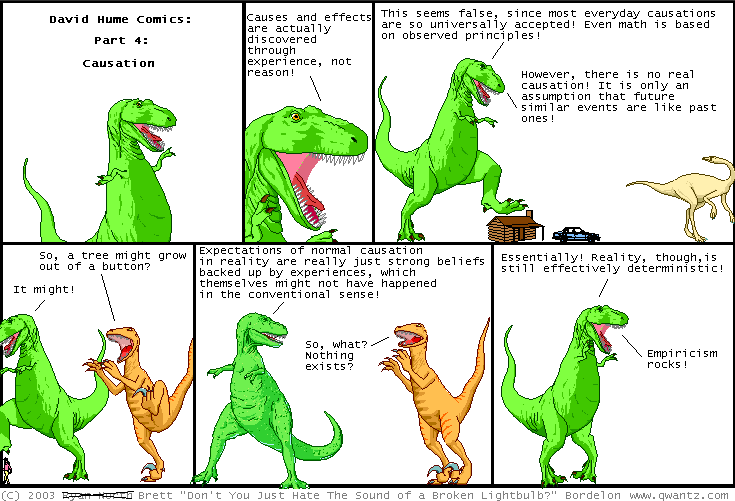 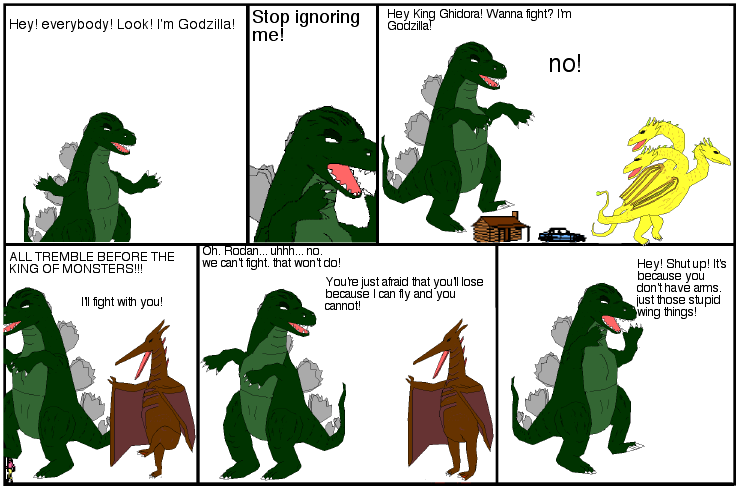 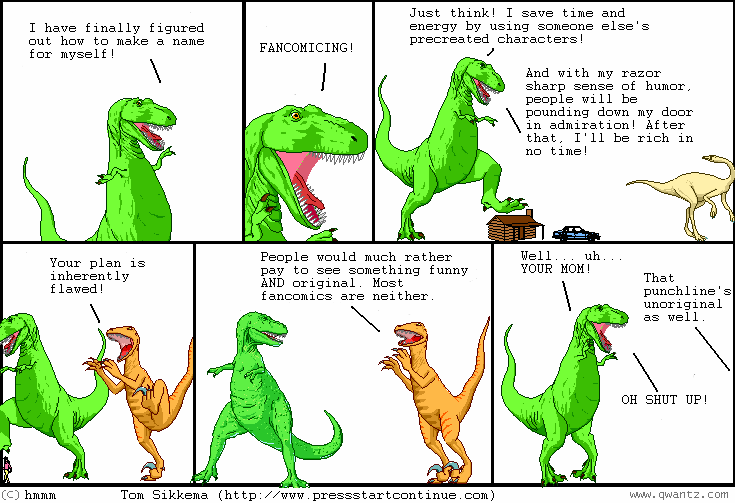 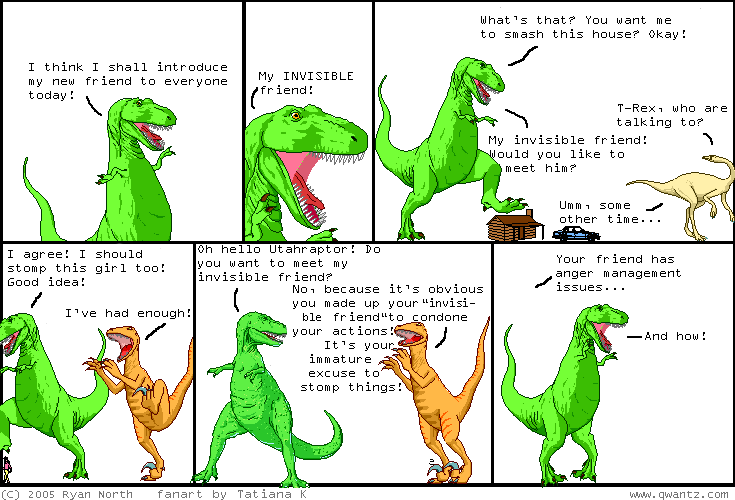 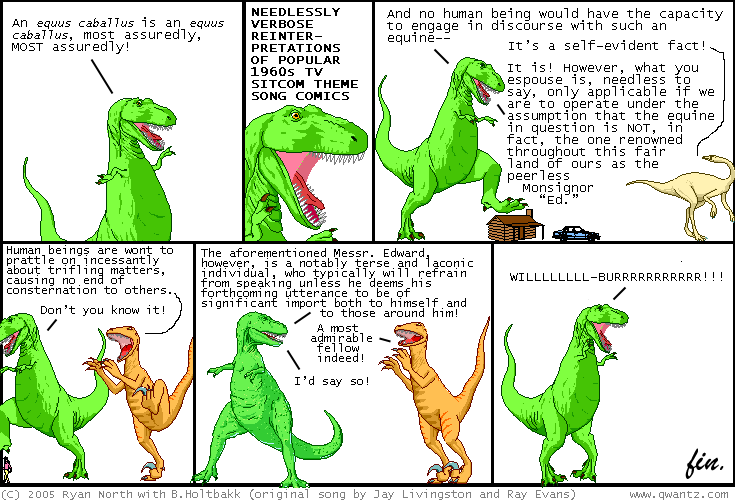 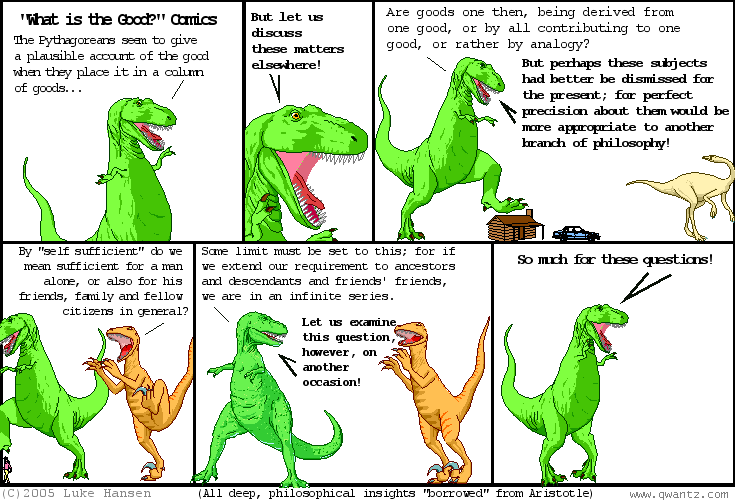 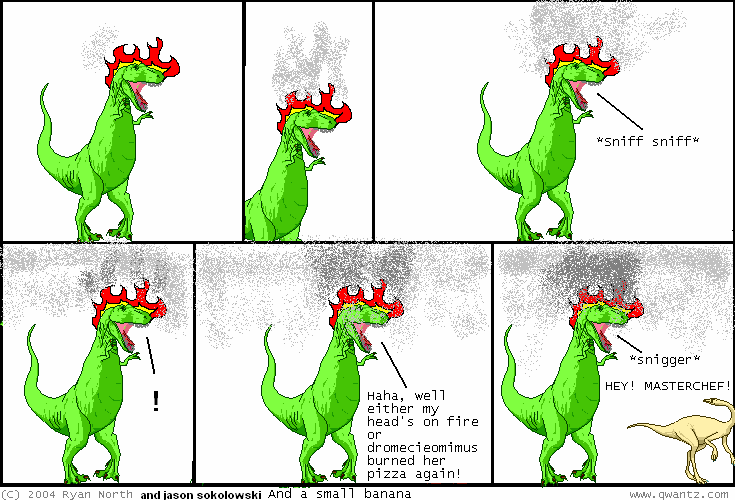 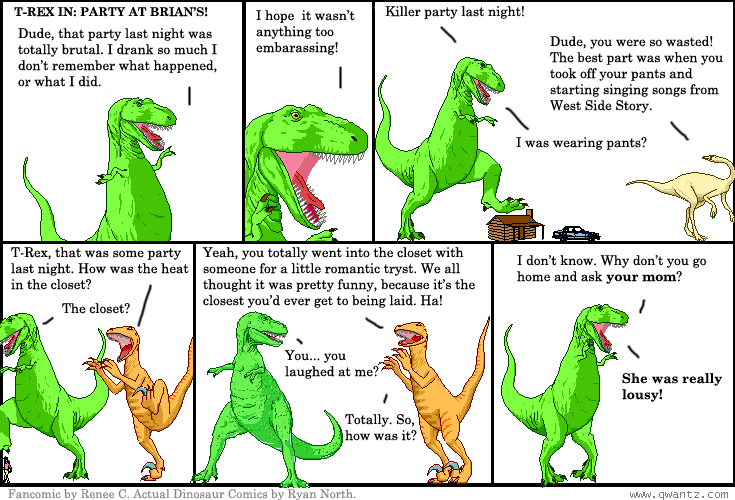 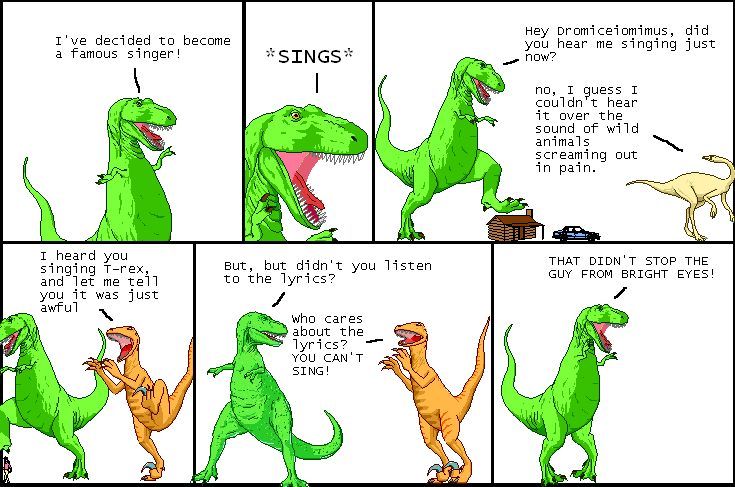 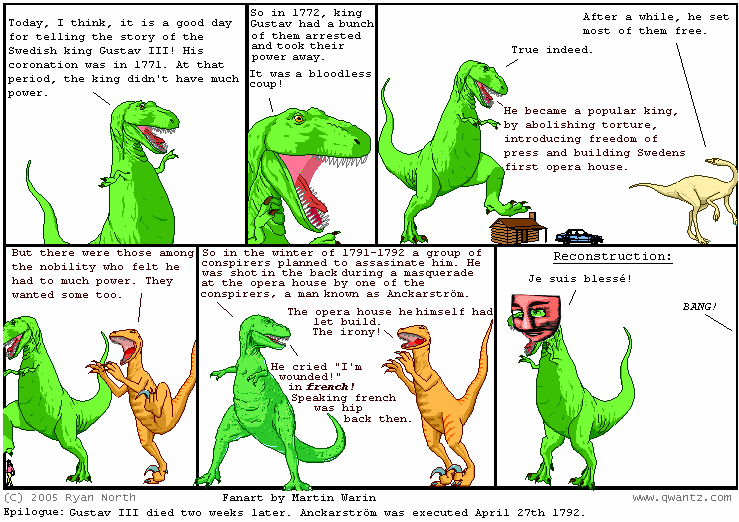 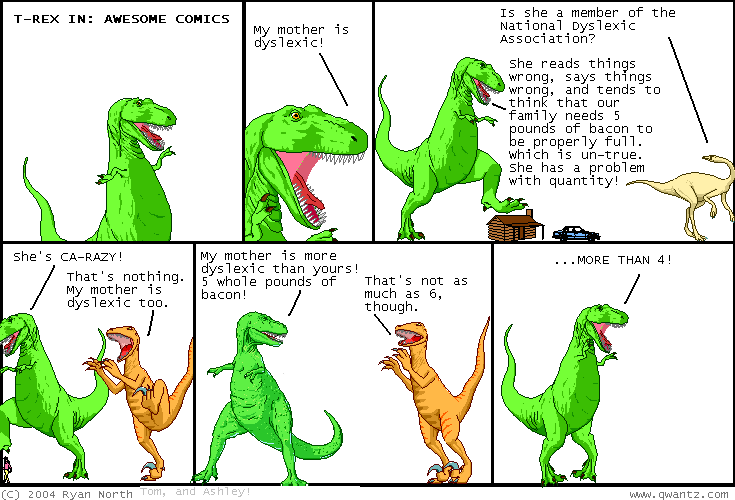 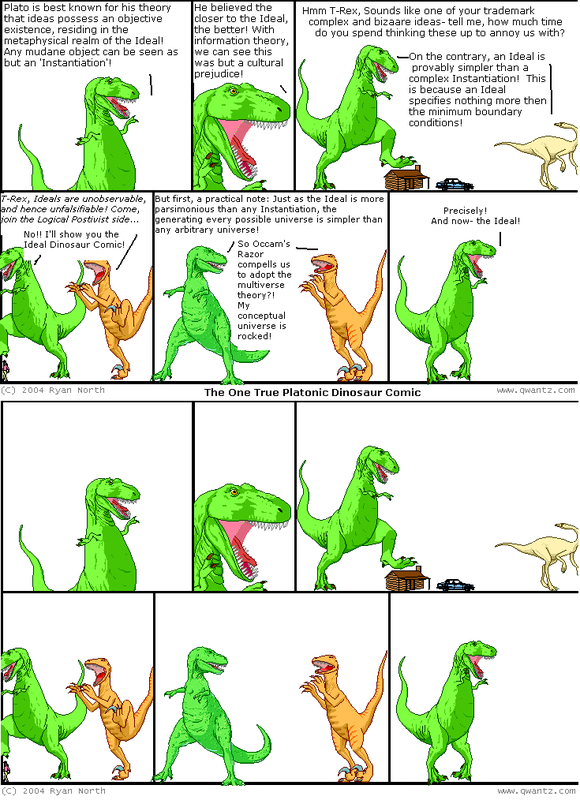 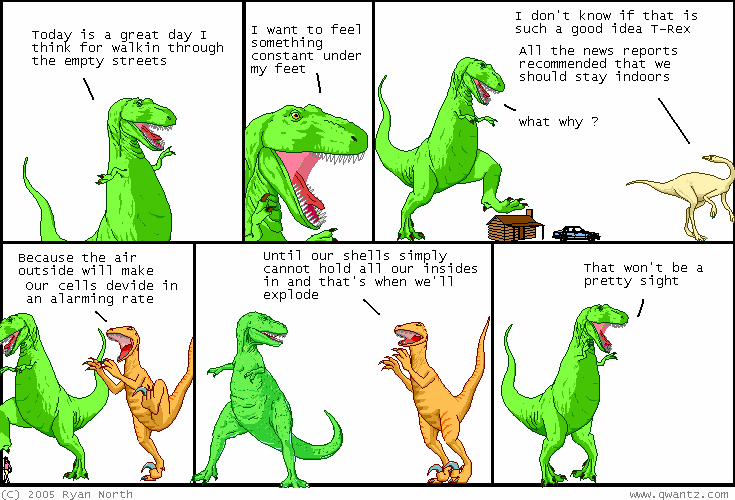 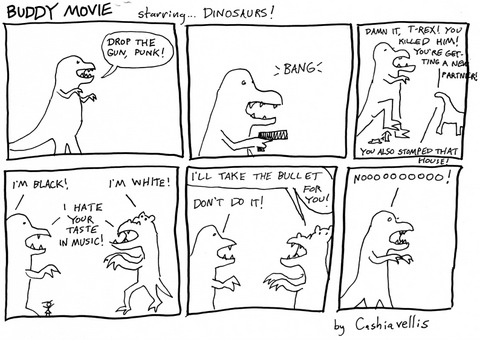 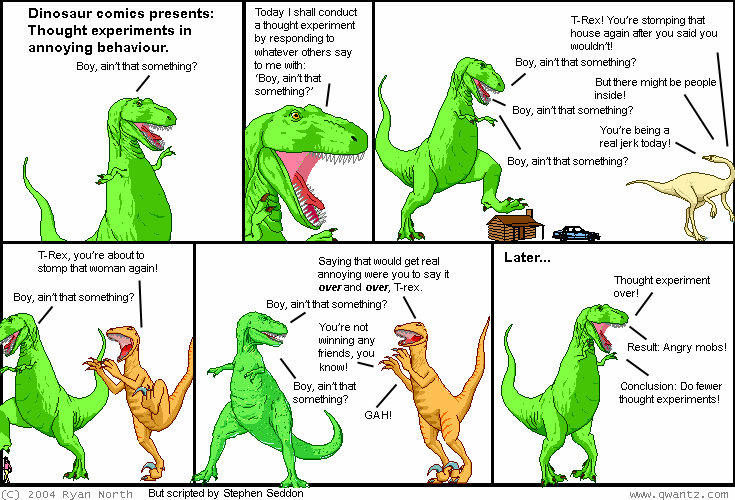 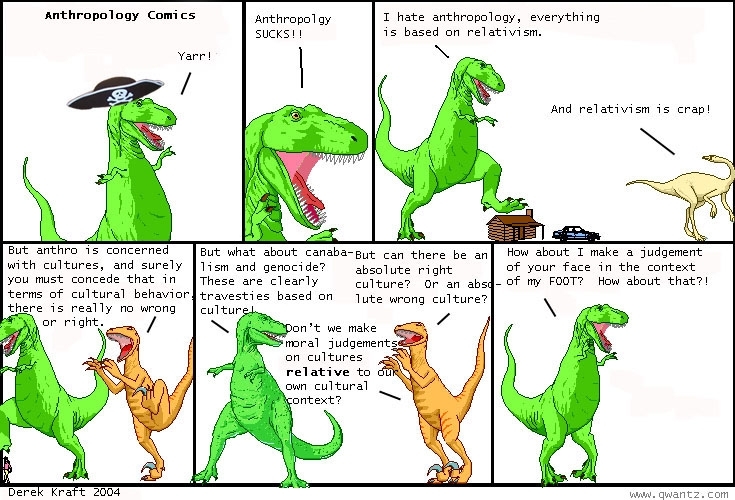 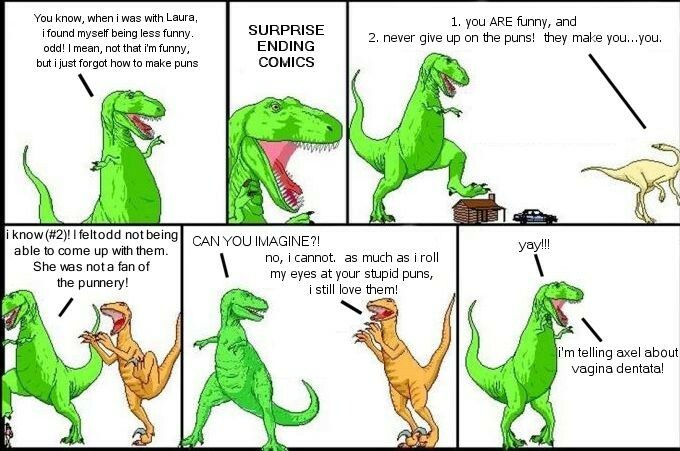 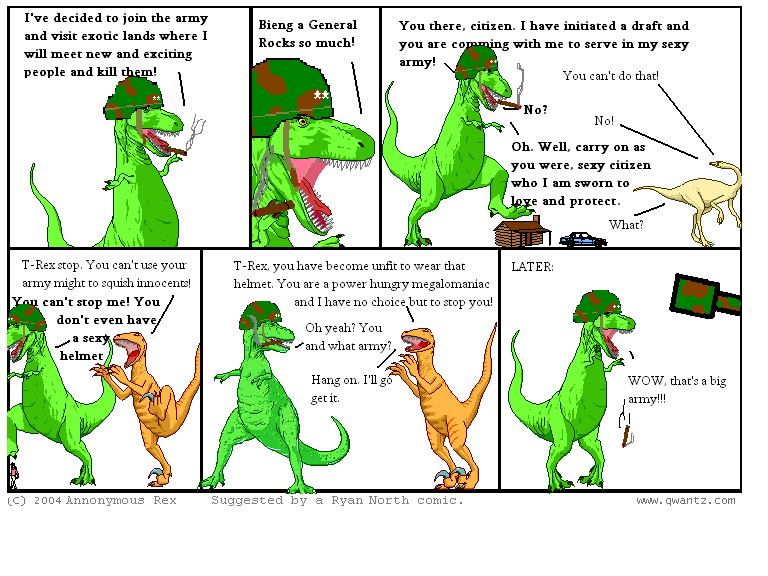 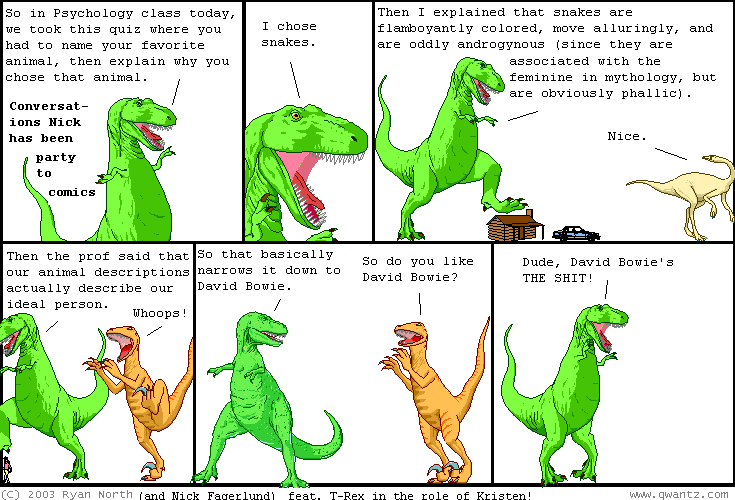 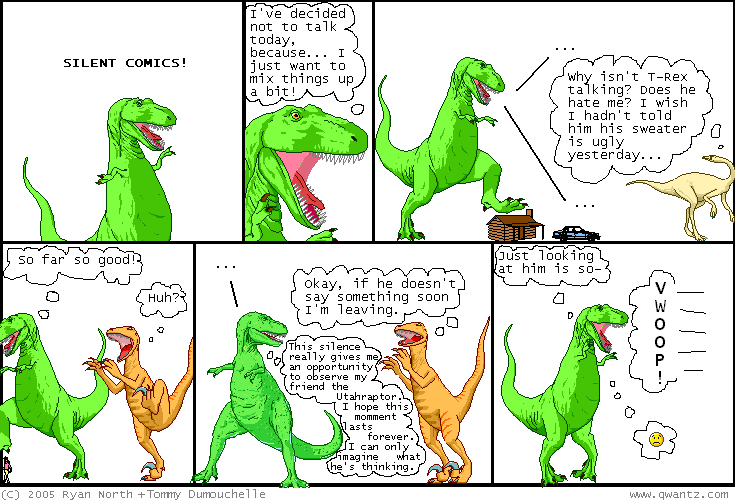 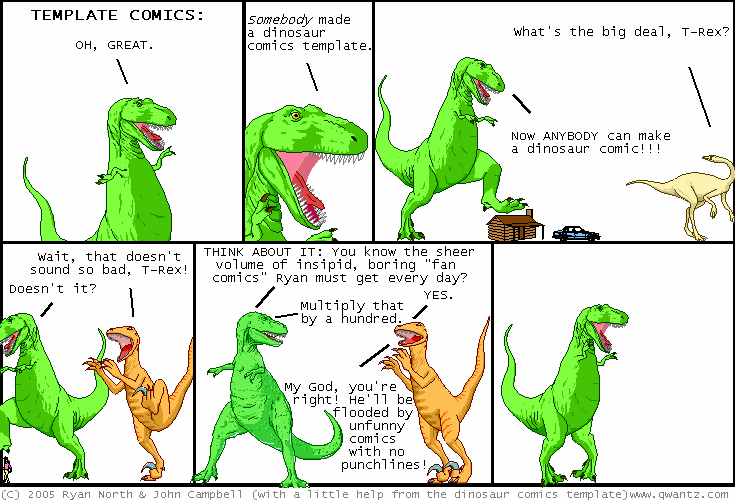 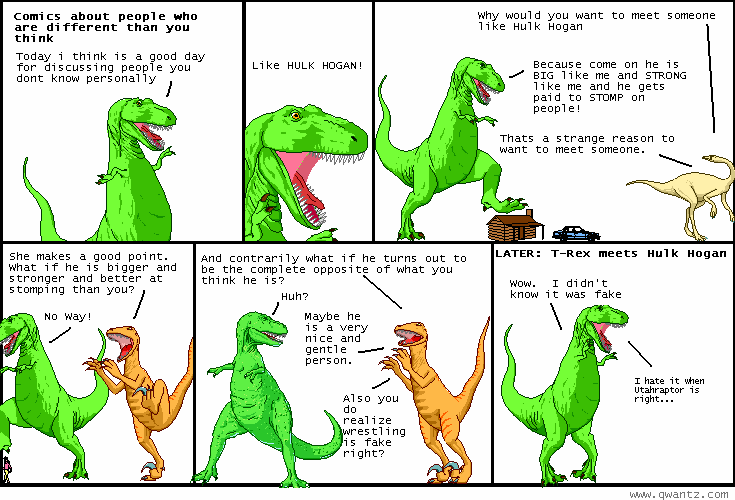 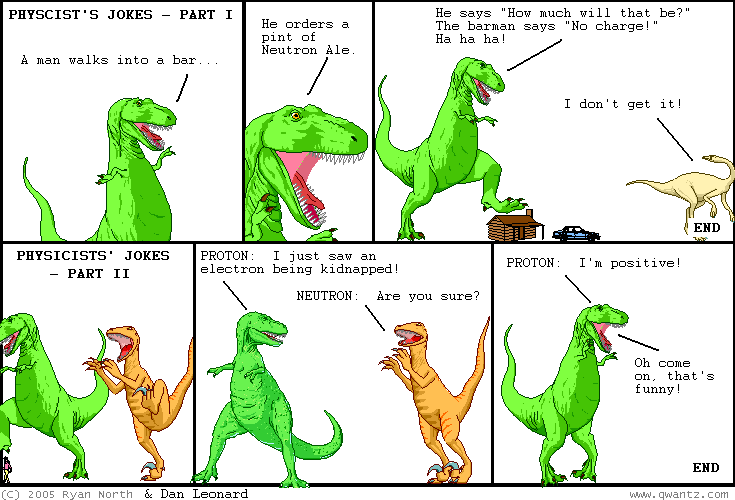 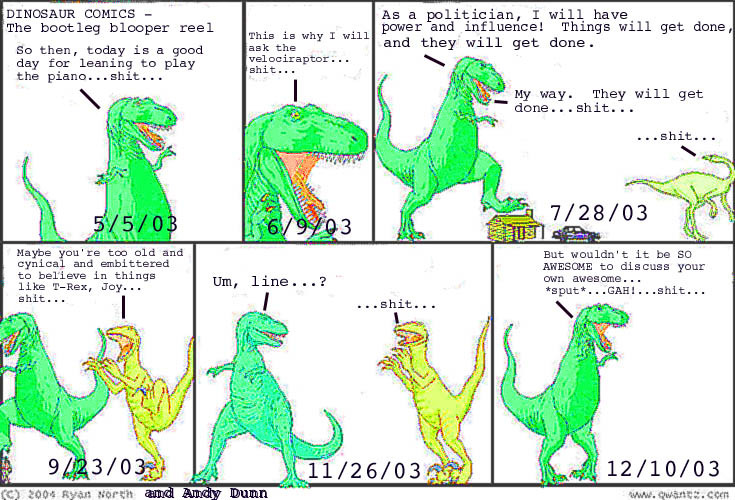 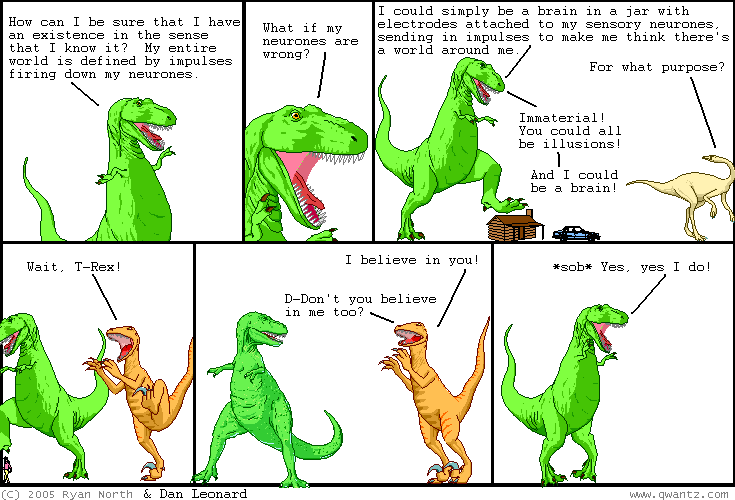 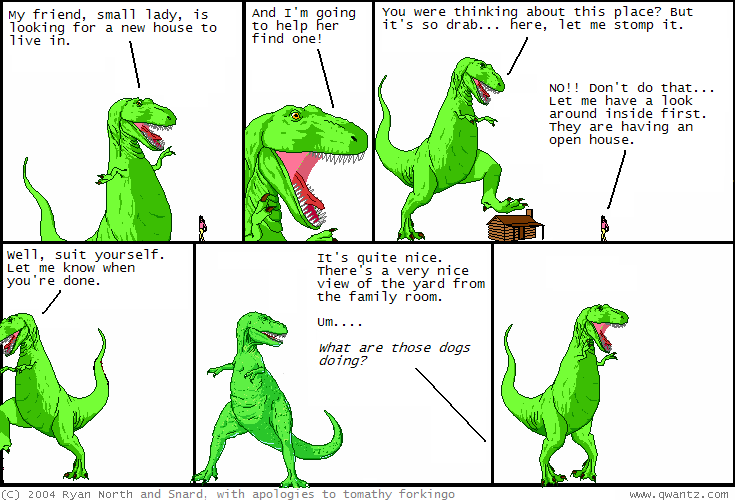 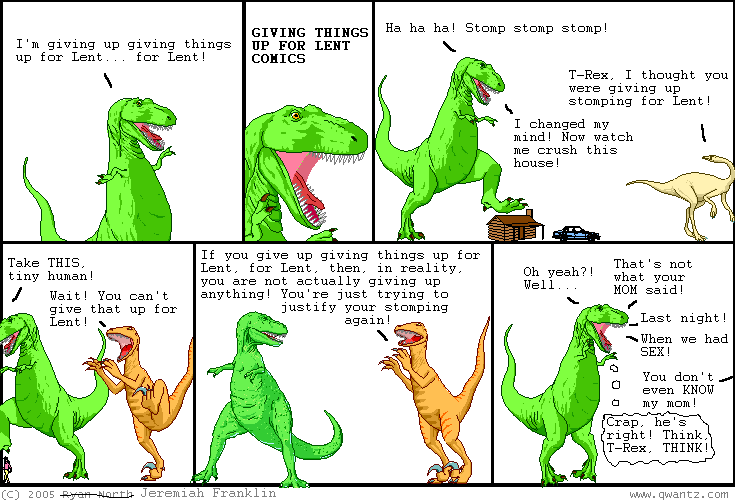 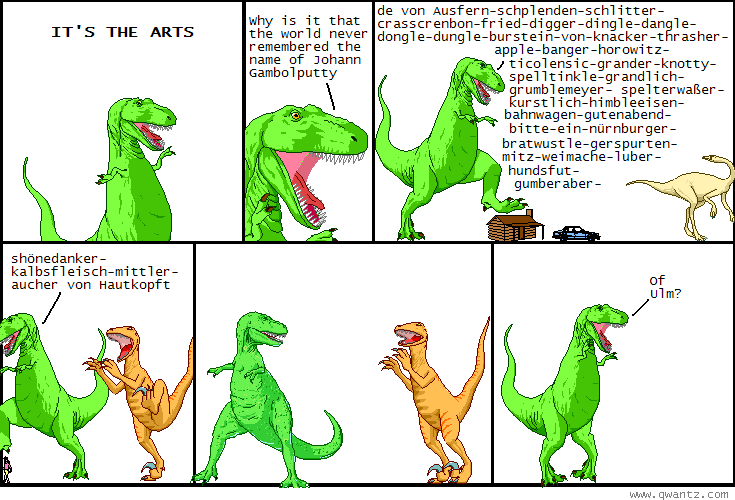 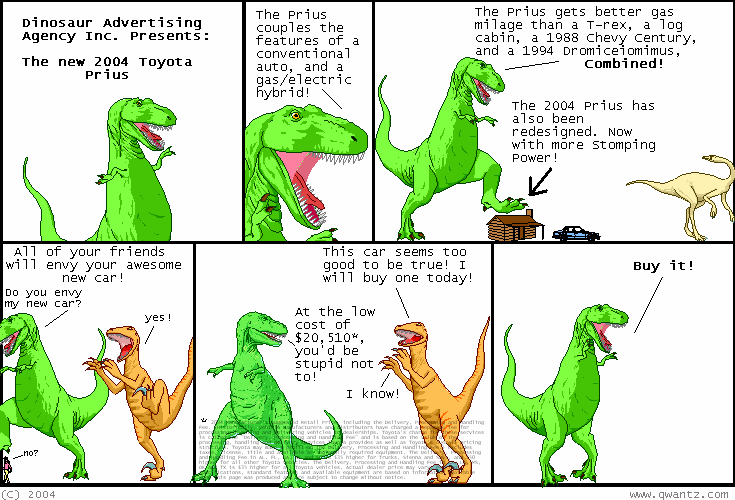 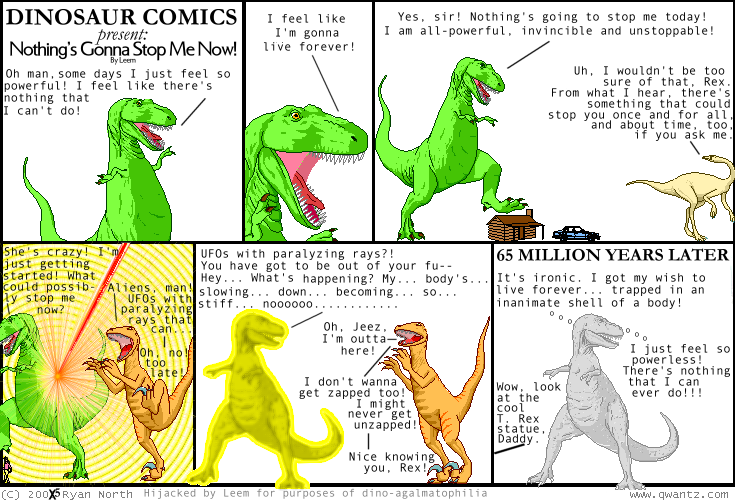 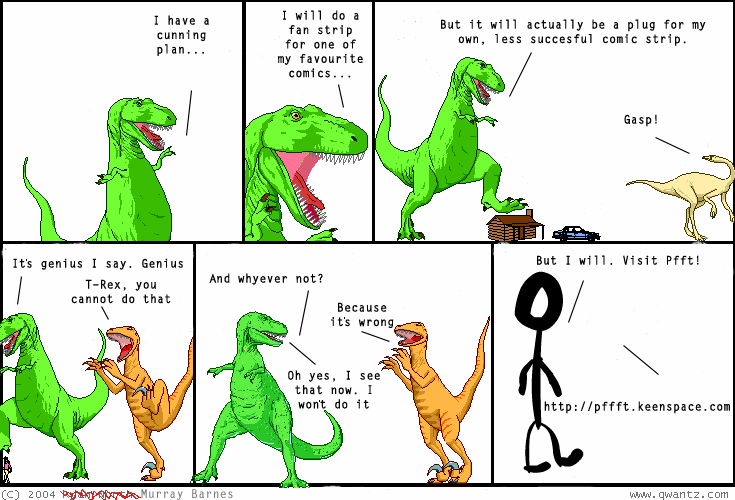 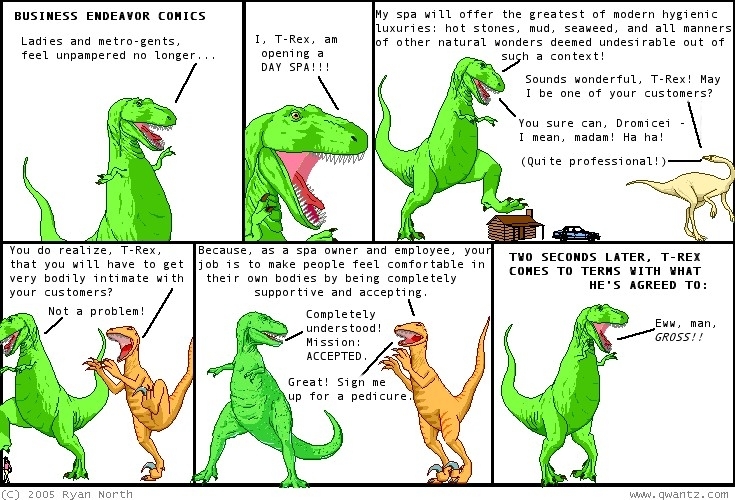 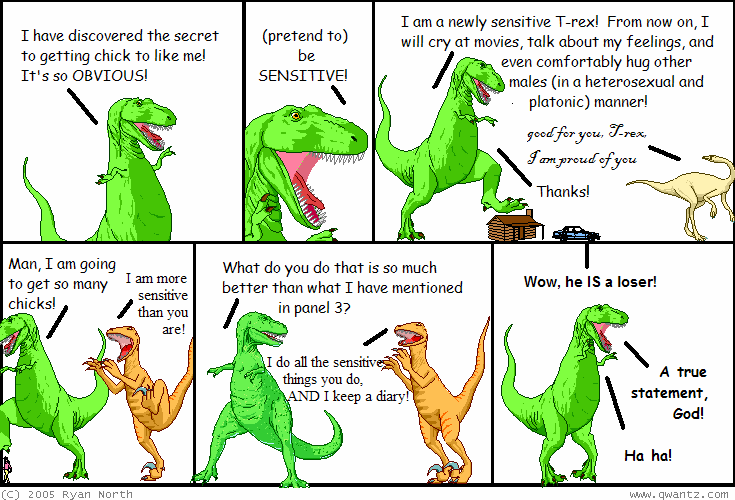 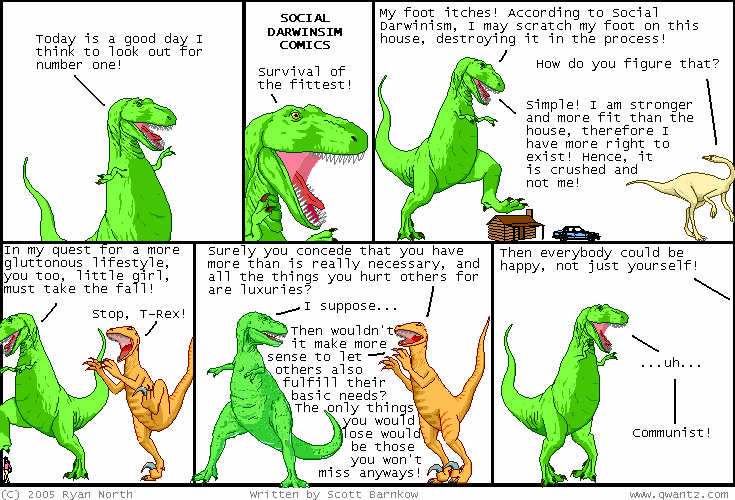 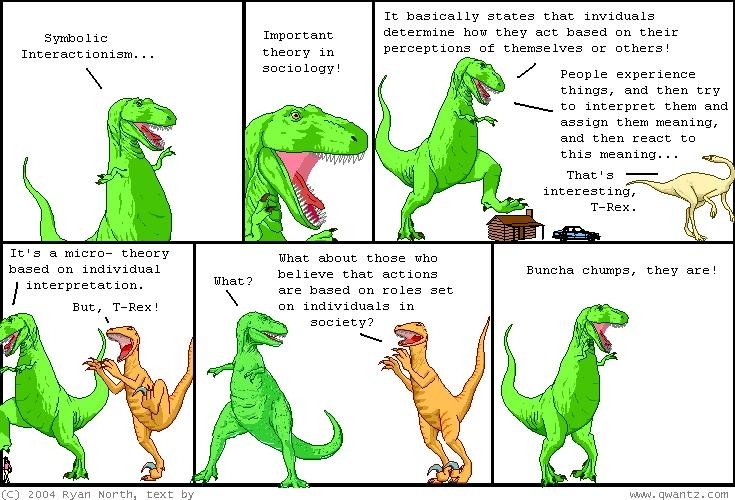 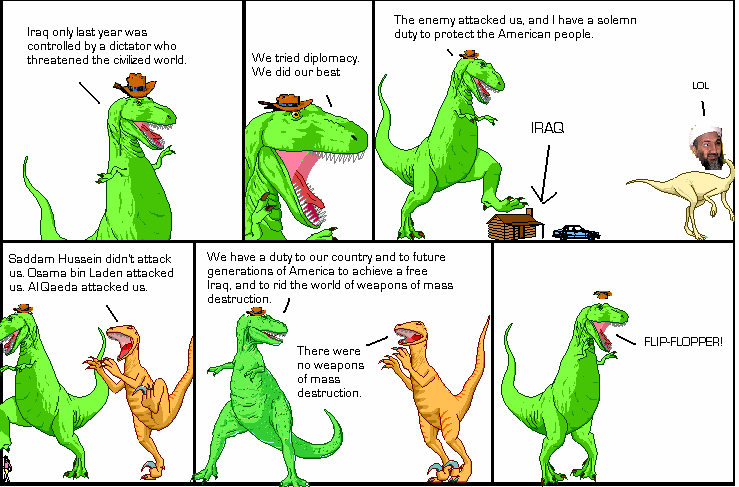 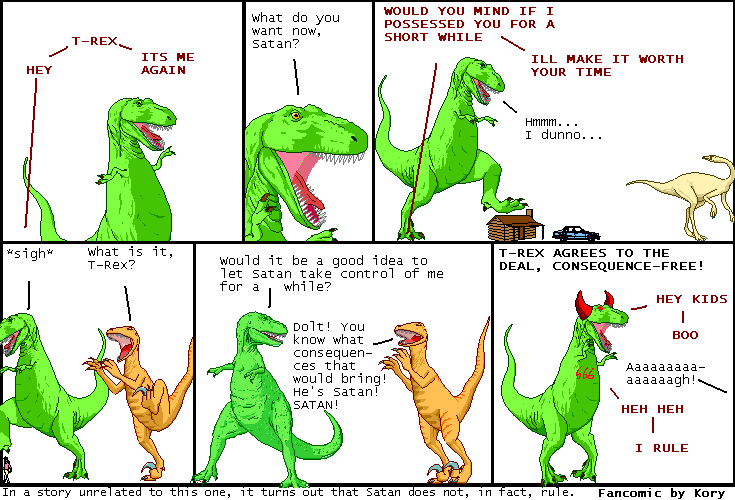 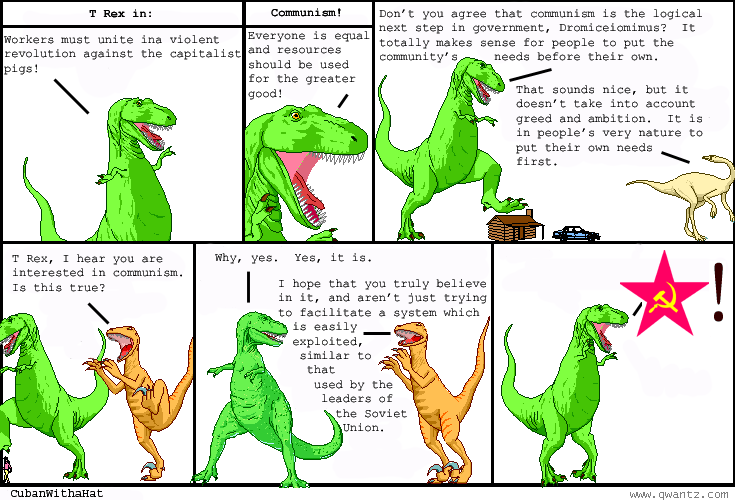 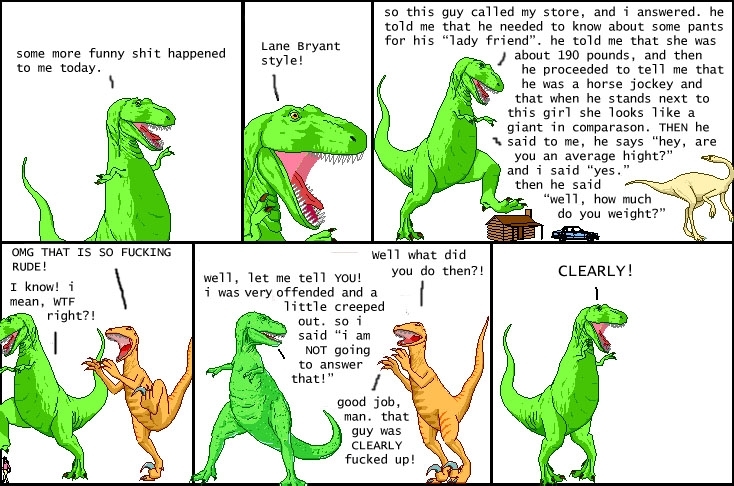 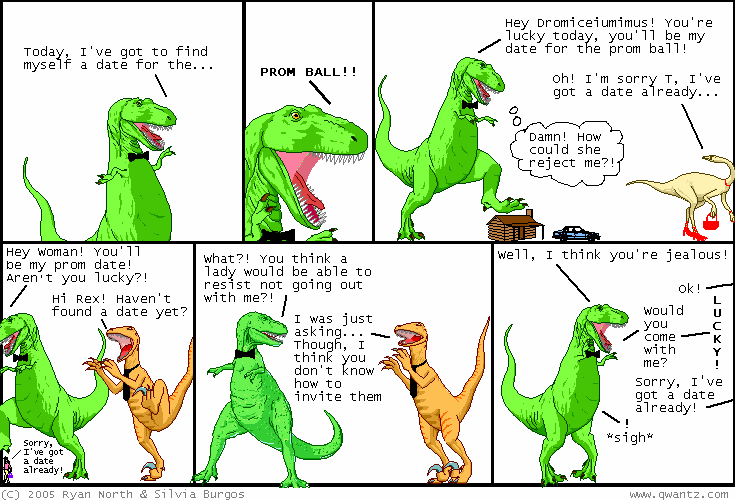 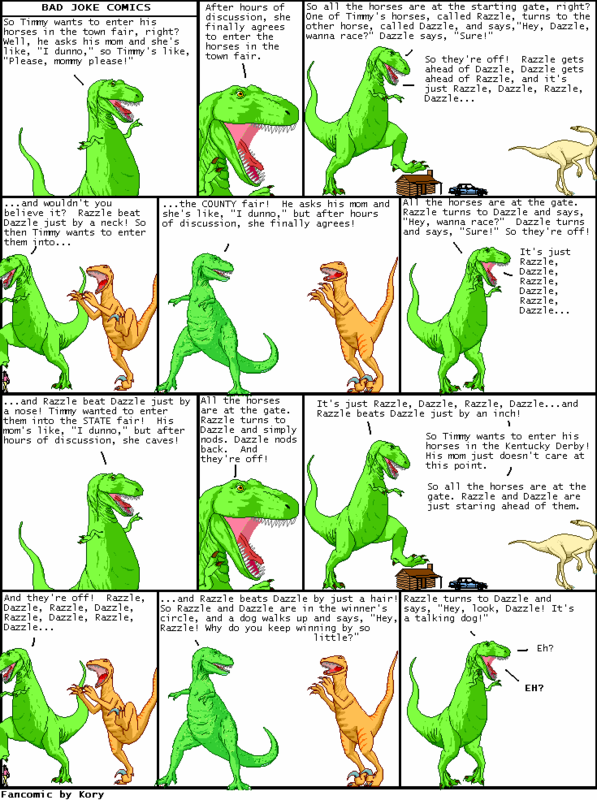 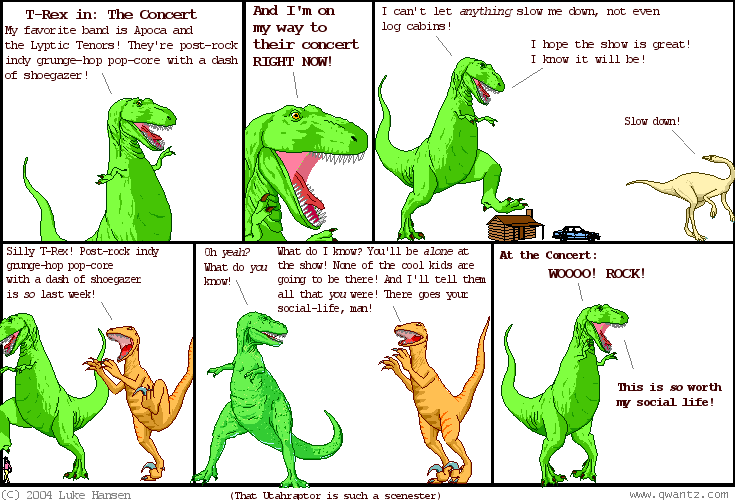 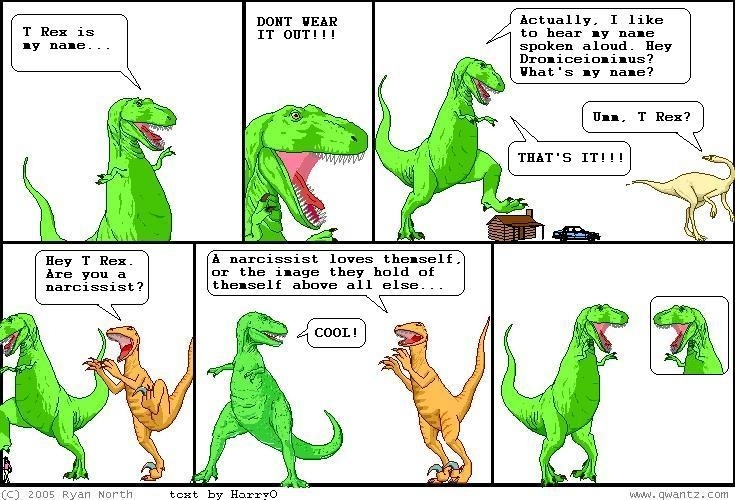 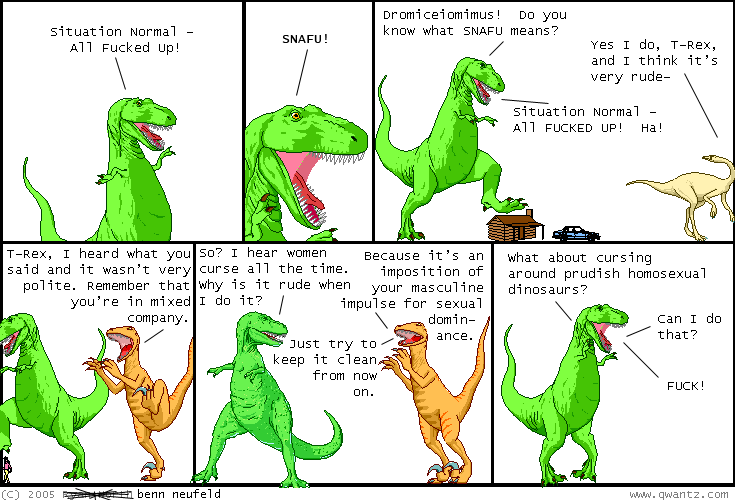 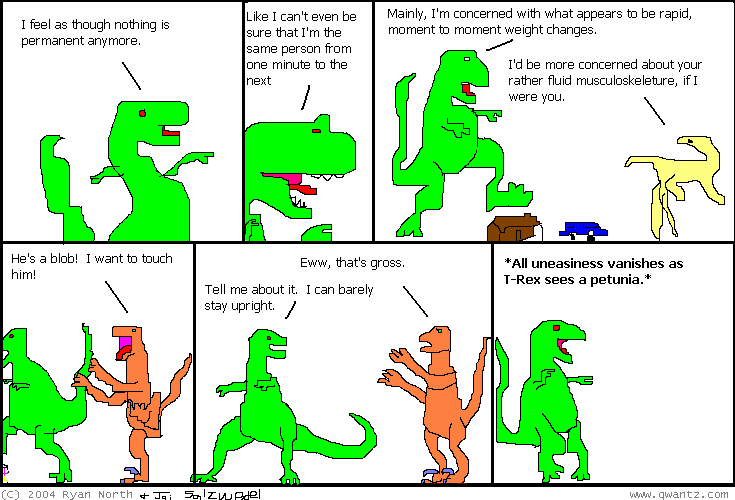 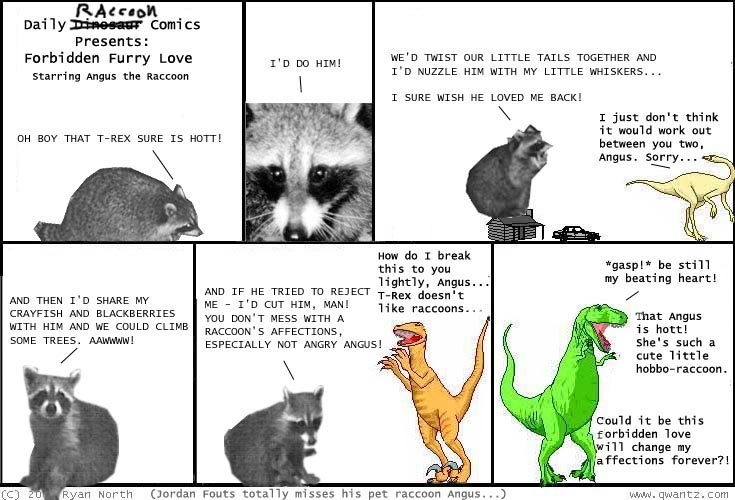 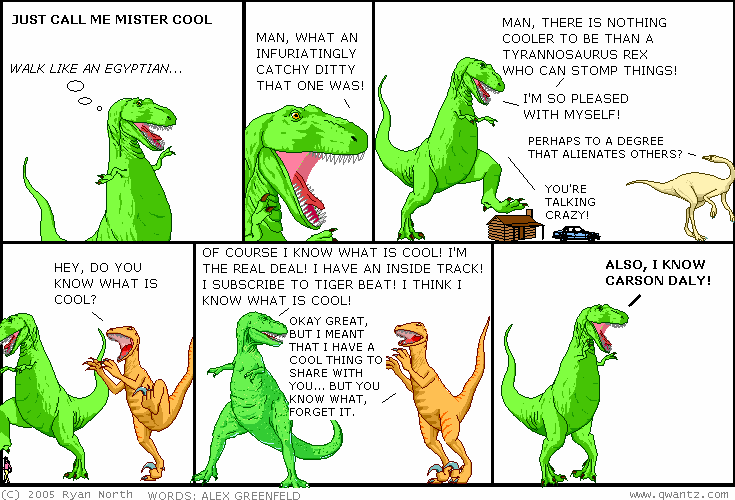 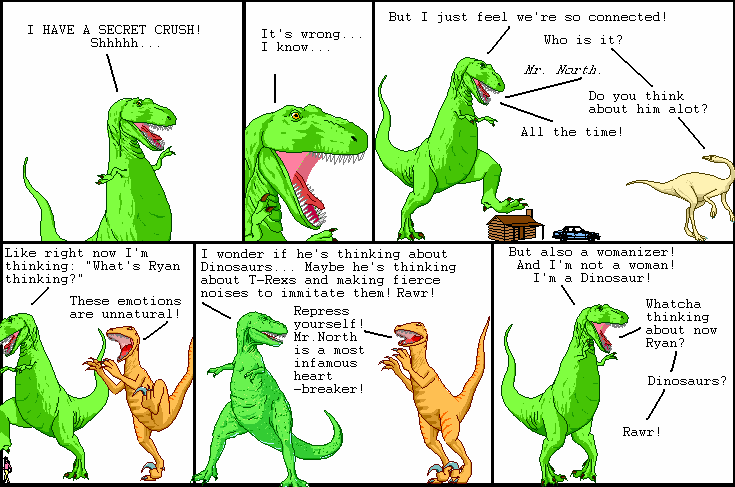 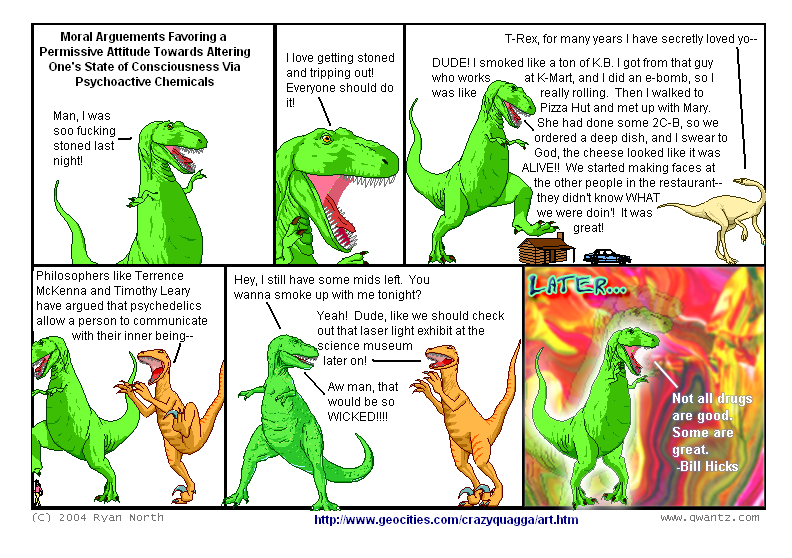 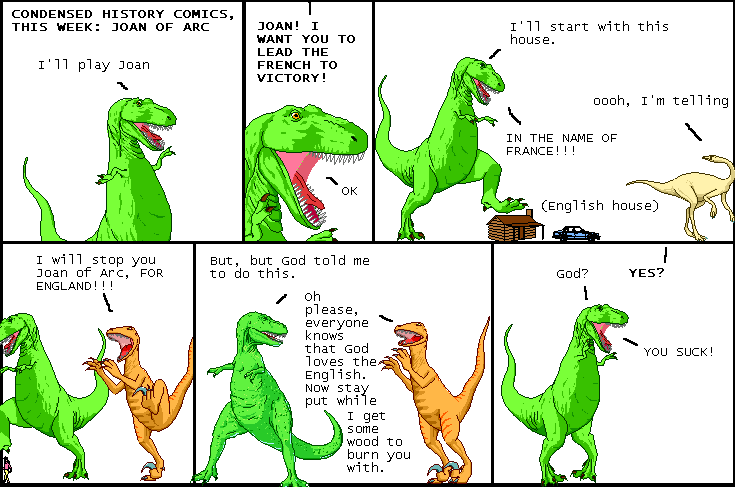 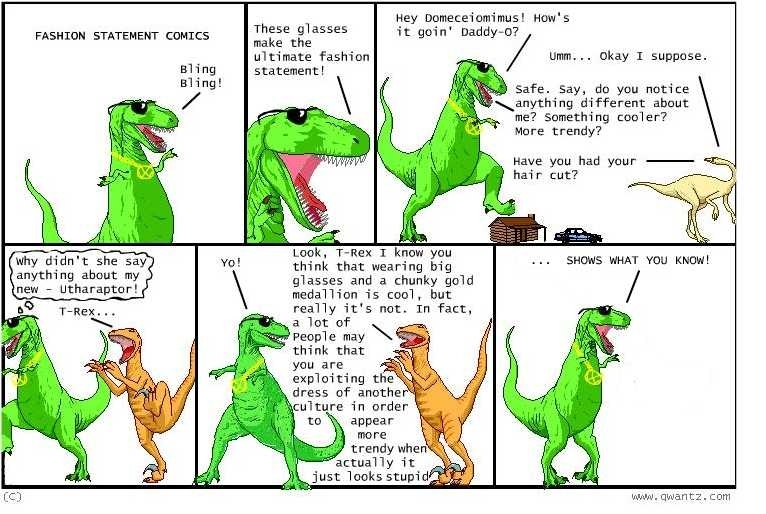 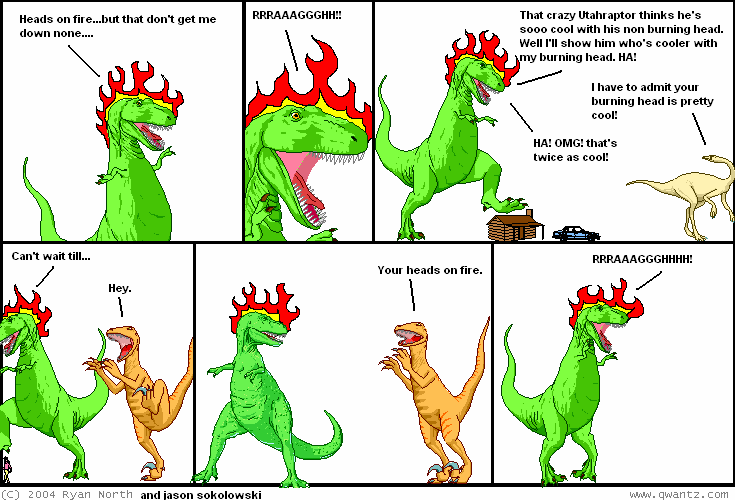 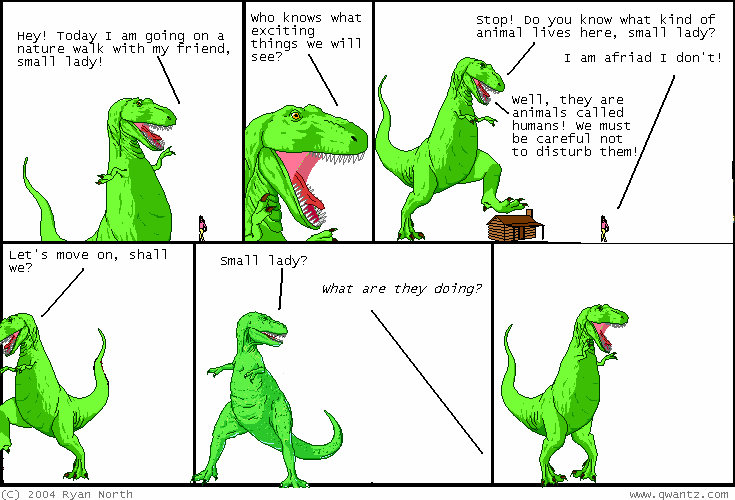 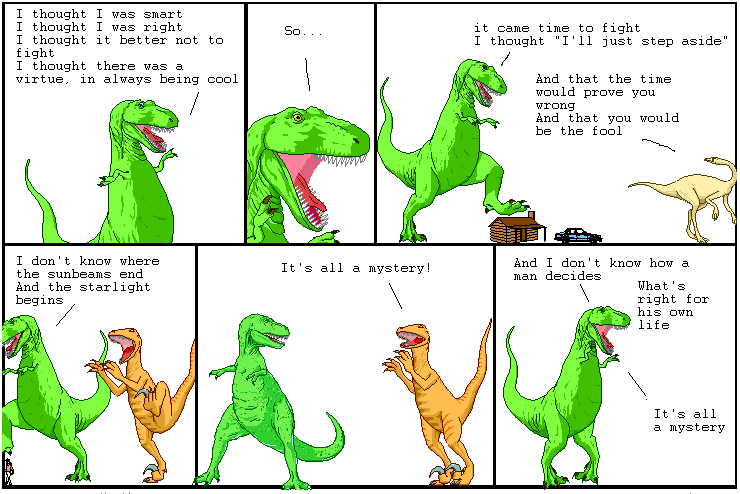 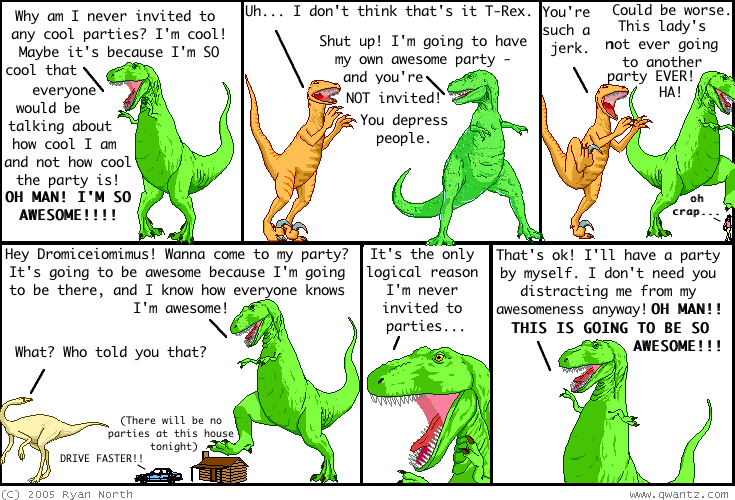 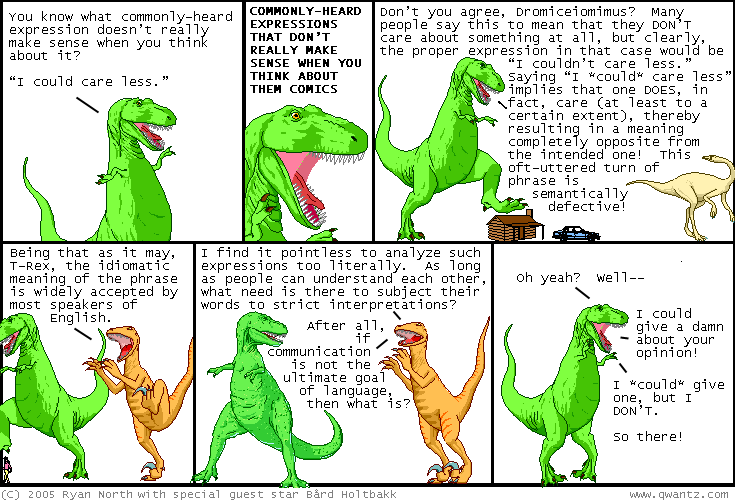 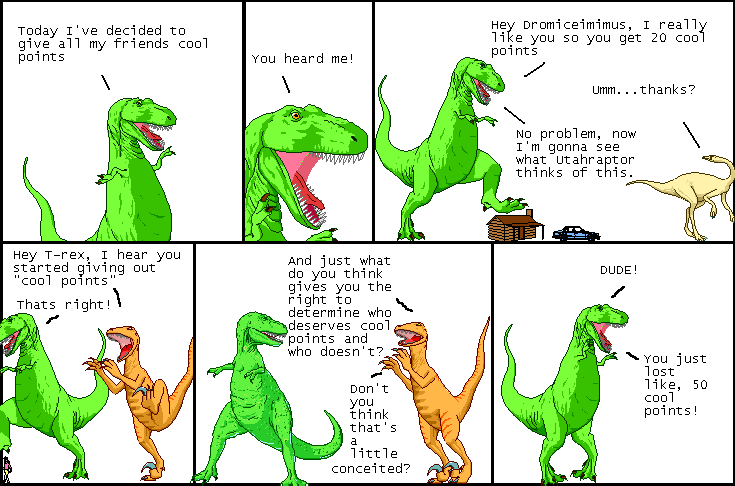 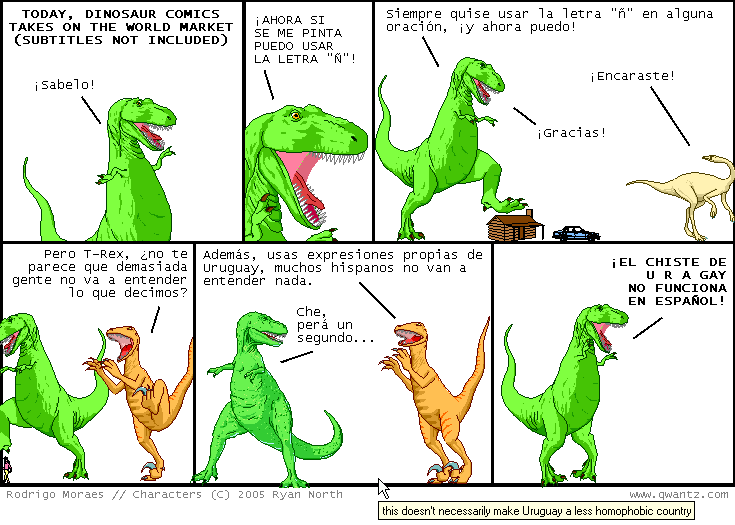 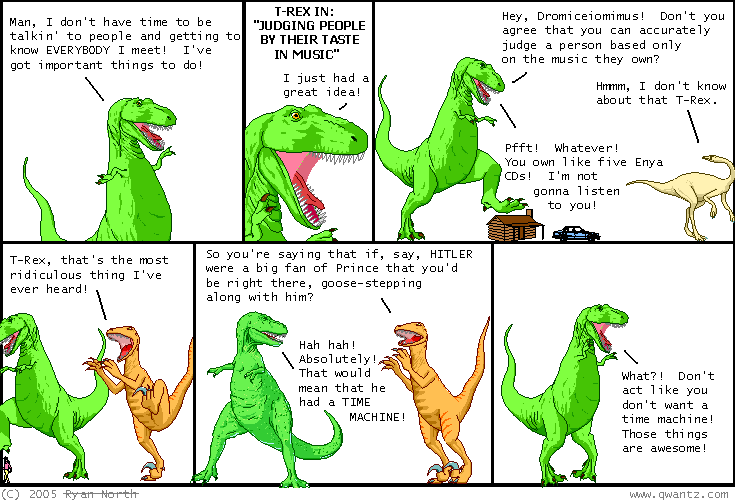 Dinosaur Comics - people are cool - awesome fun times! 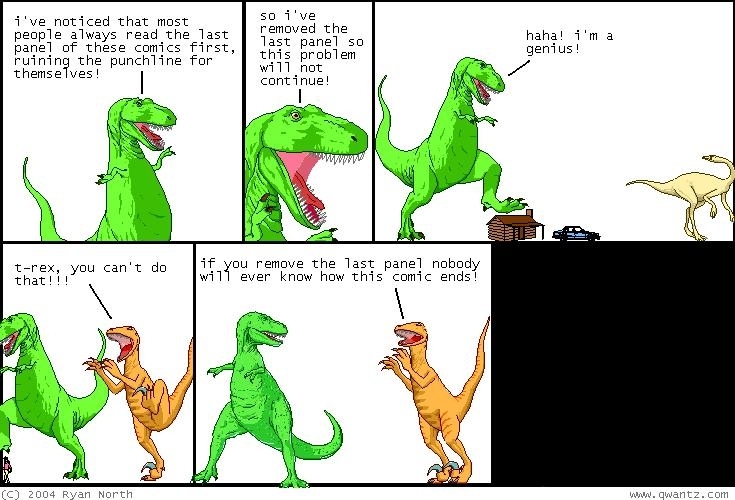 –...and they WENT FOR IT. 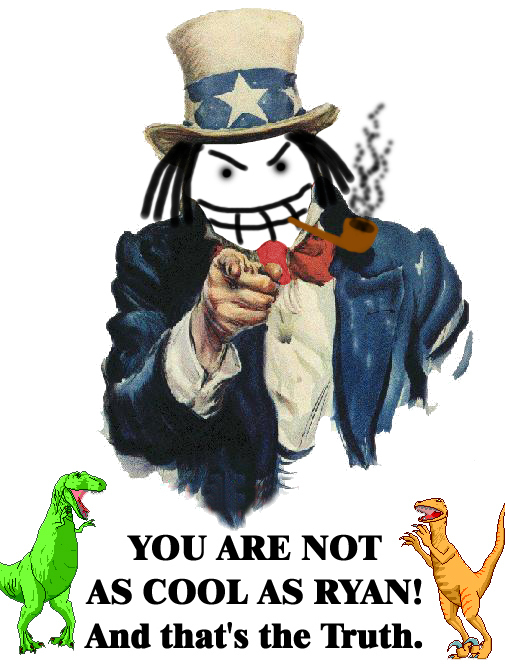 look at all this stuff people sent me! 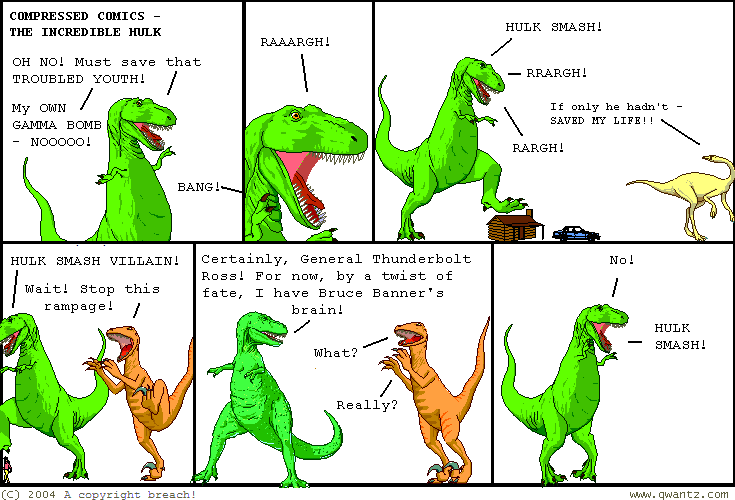 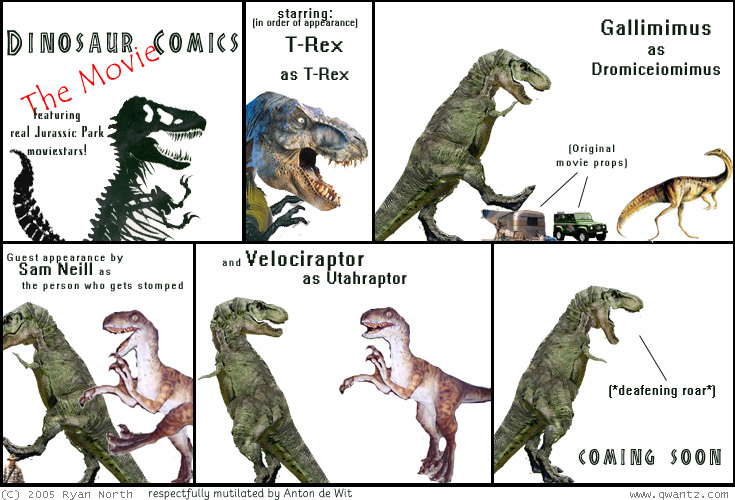 dinosaur comics mashup: choose your universe! 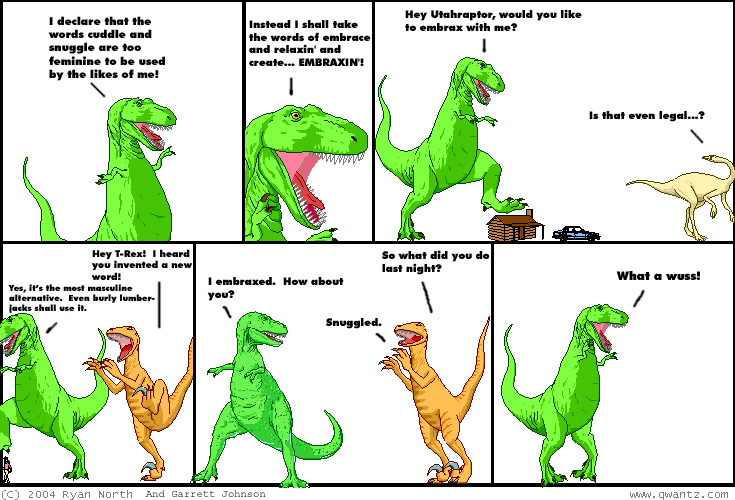 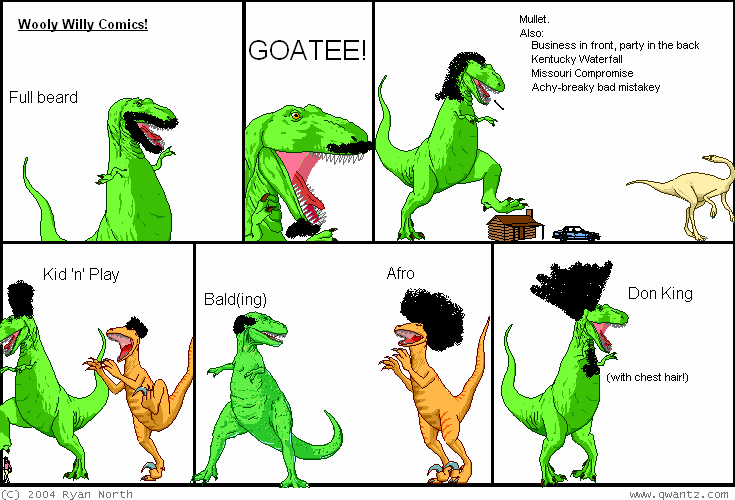 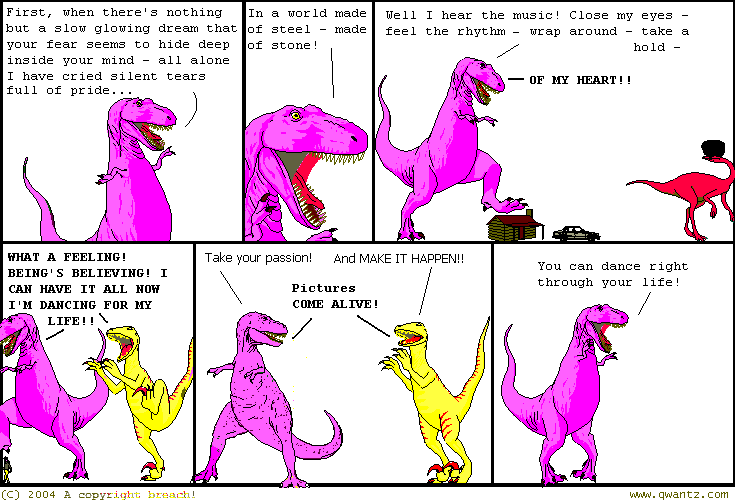 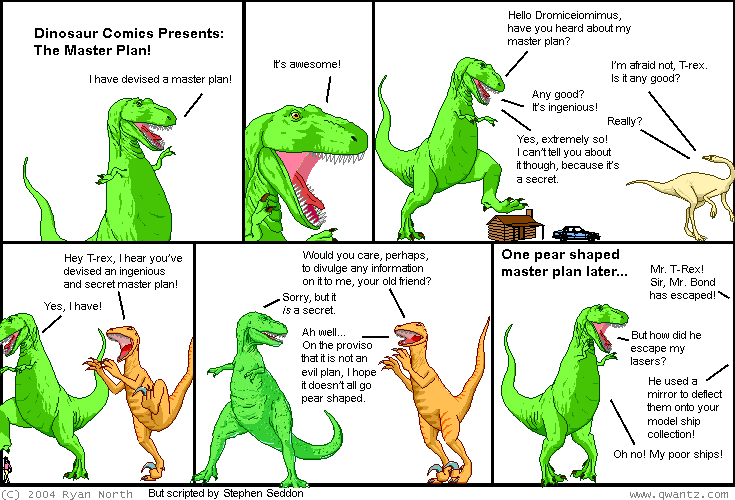 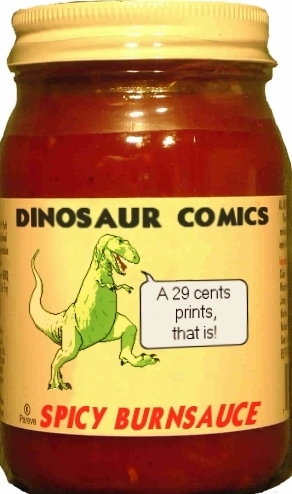 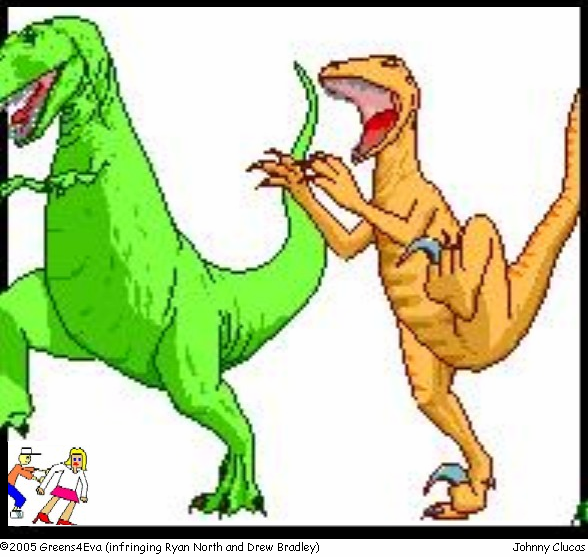 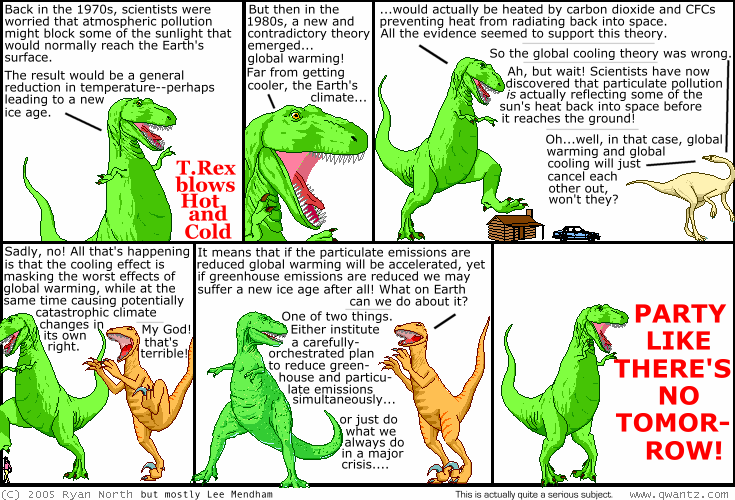 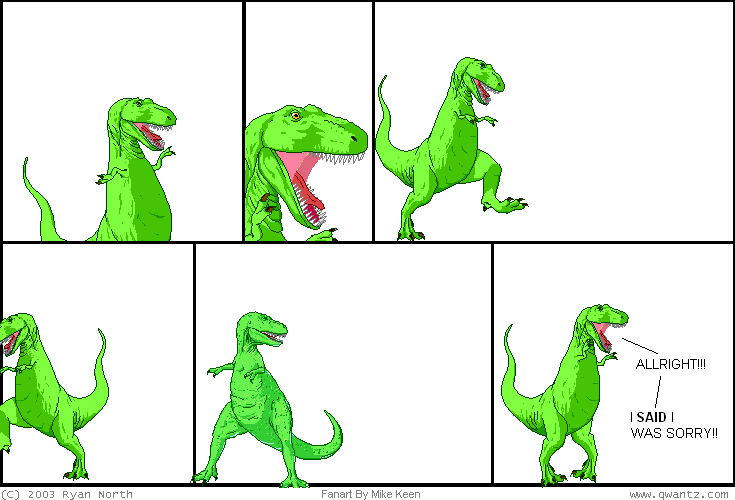 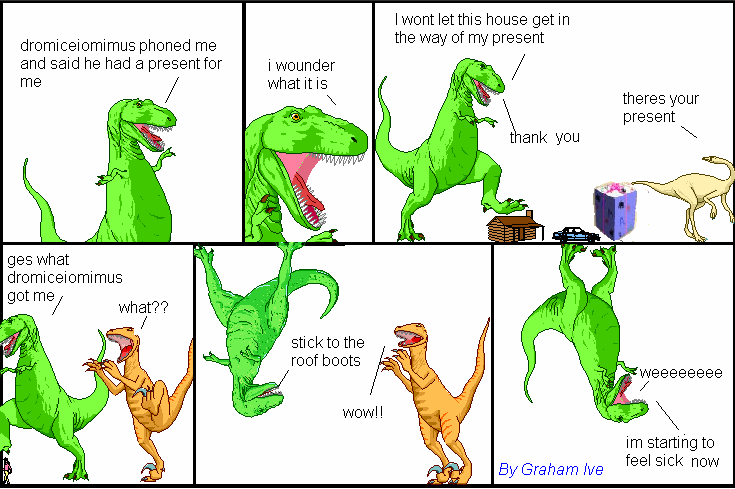 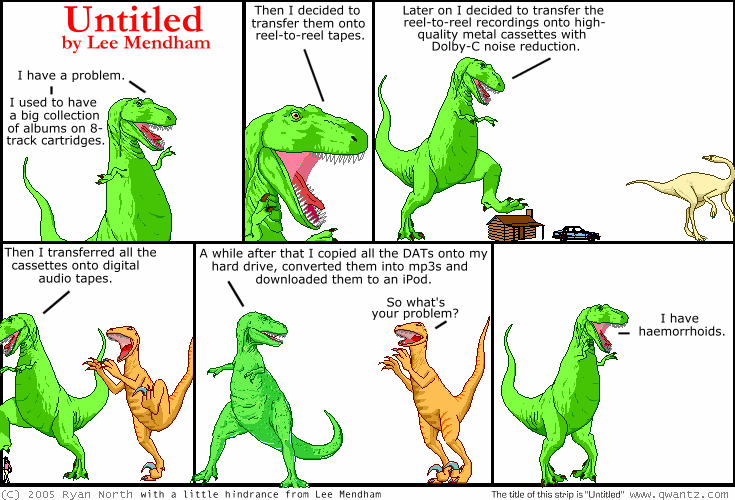 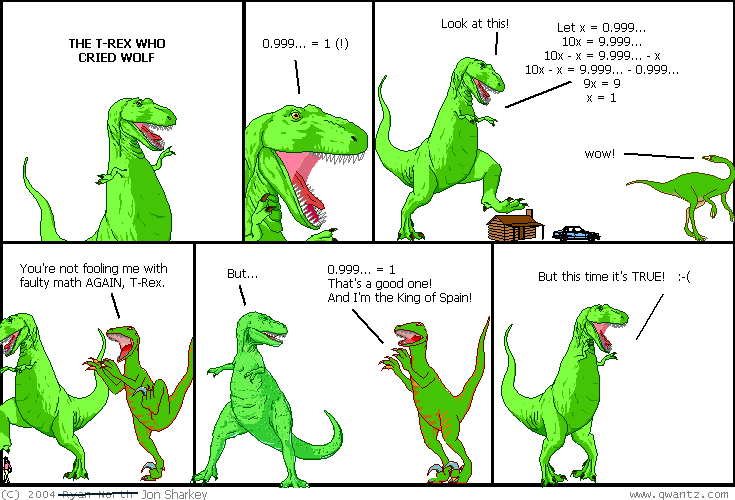 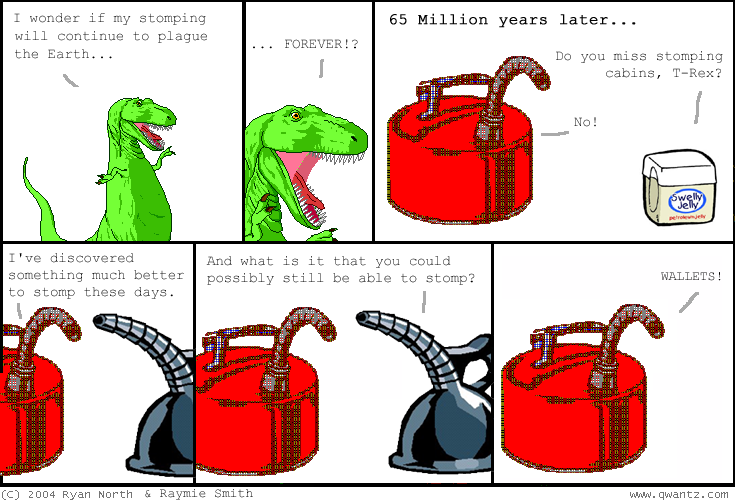 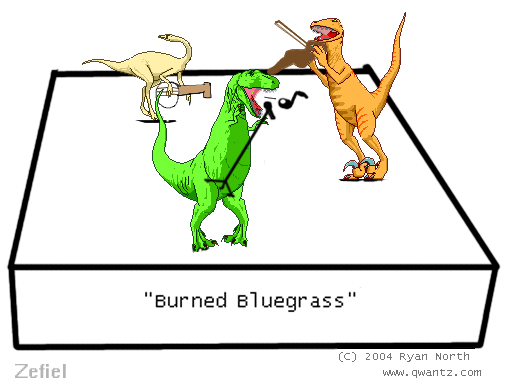 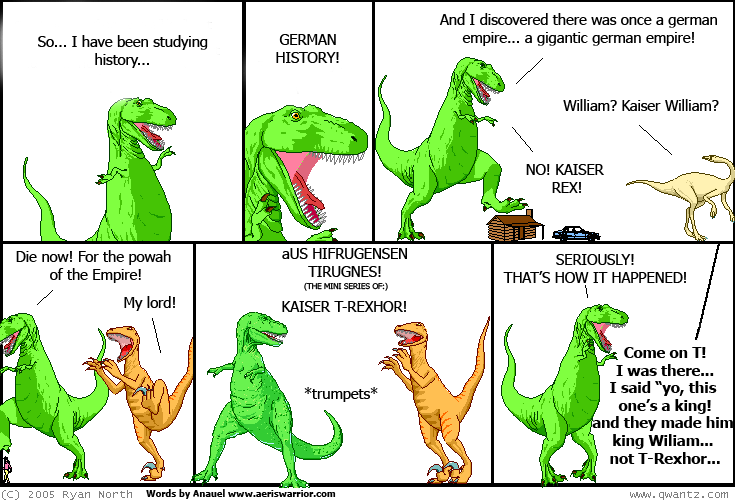 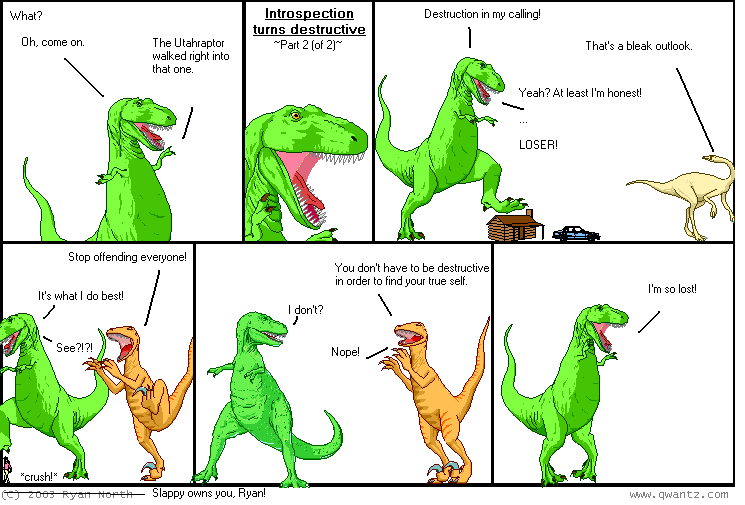 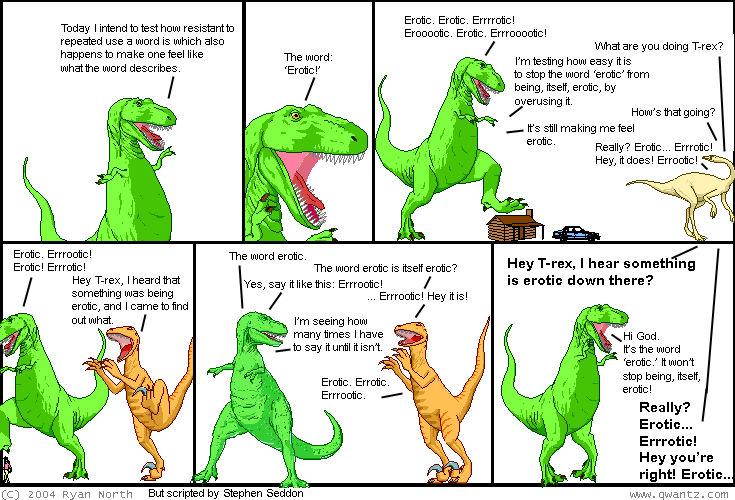 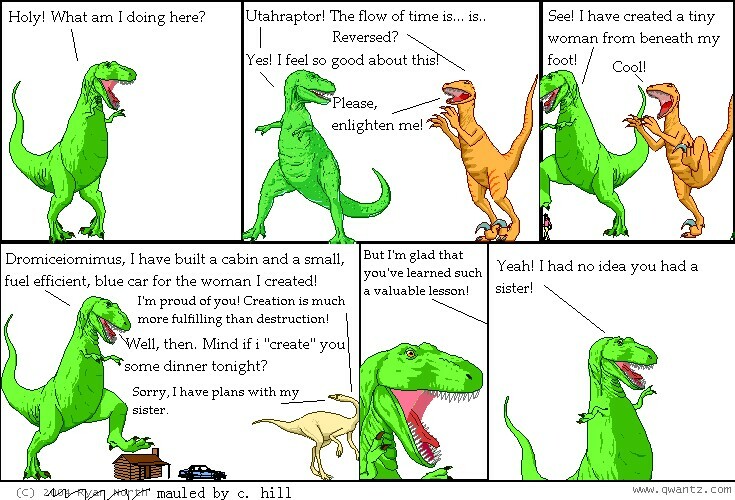 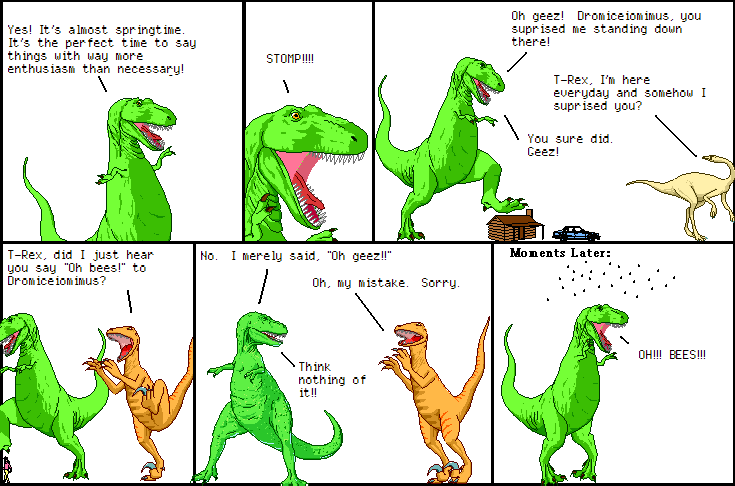 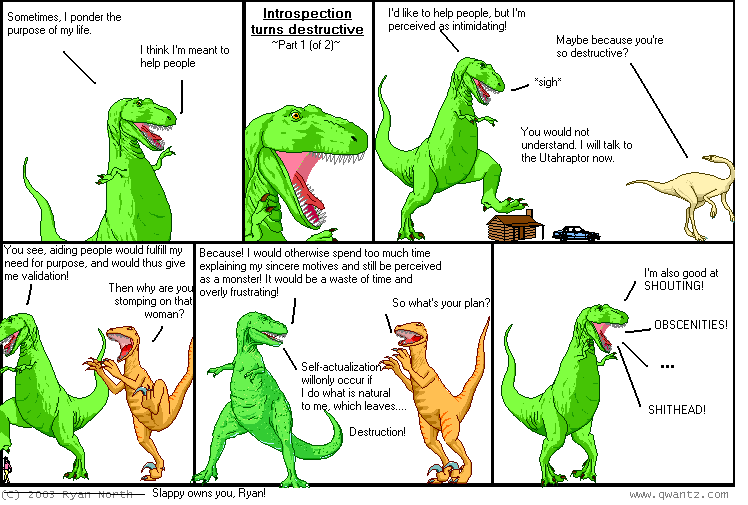 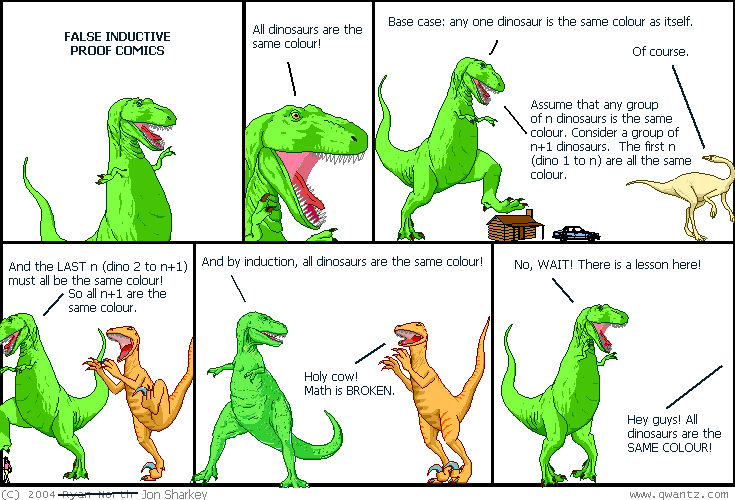 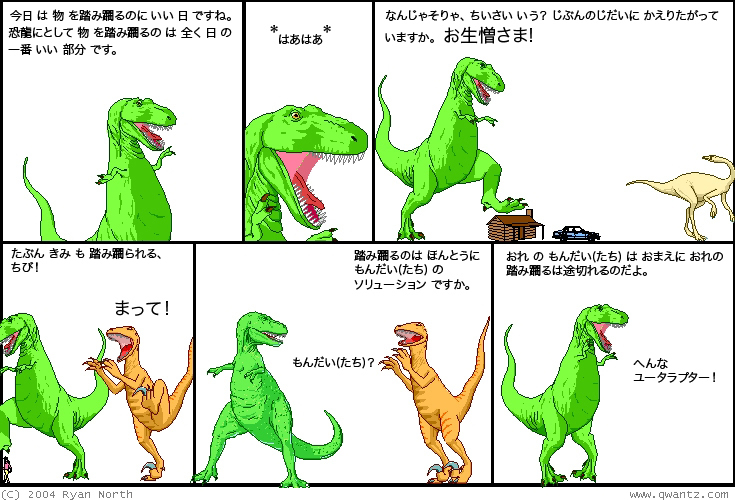 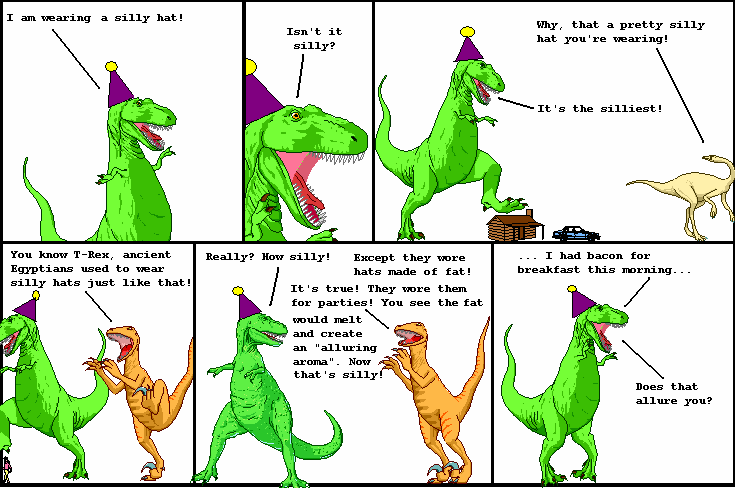 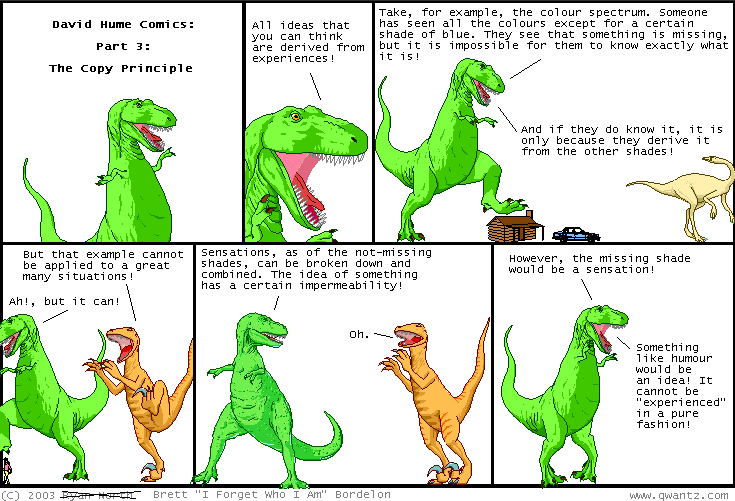 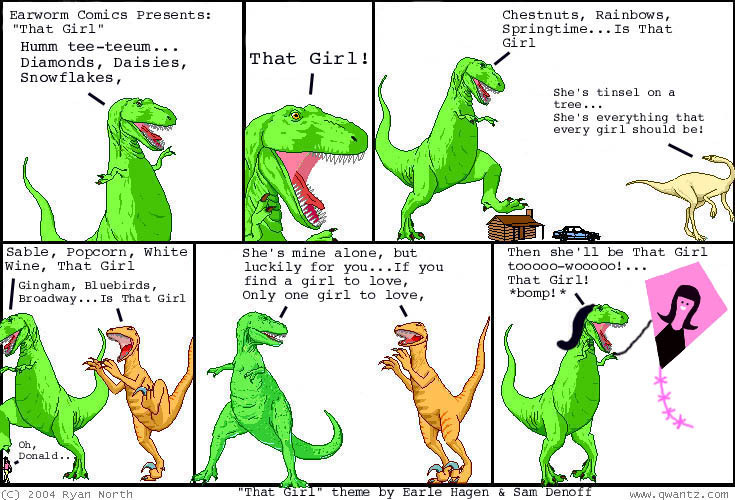 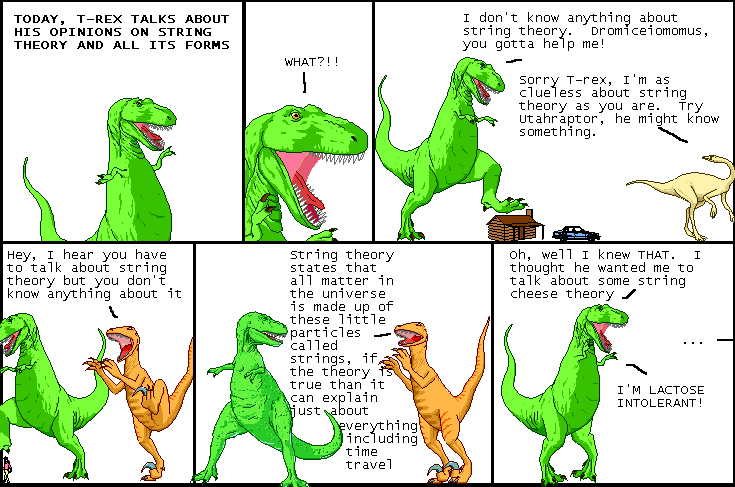 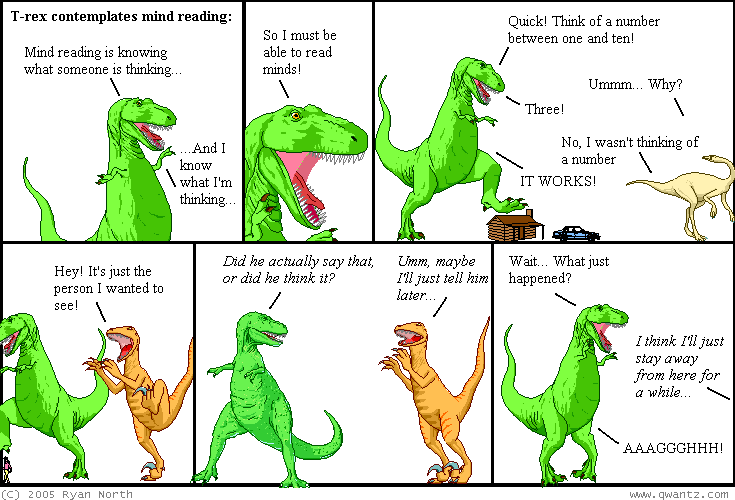 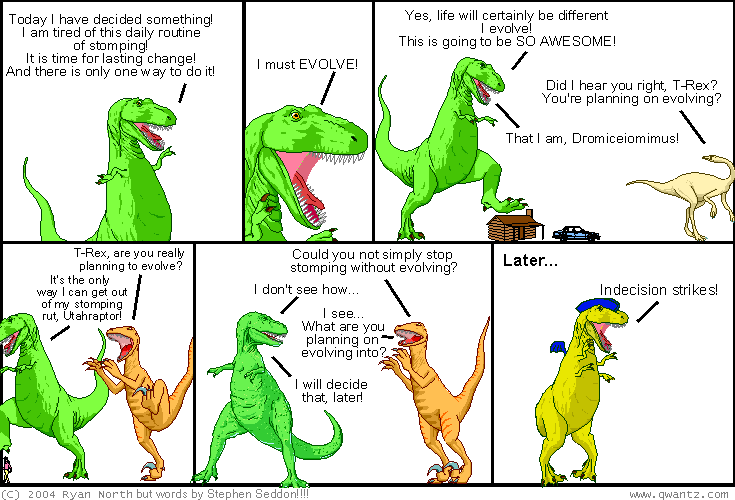 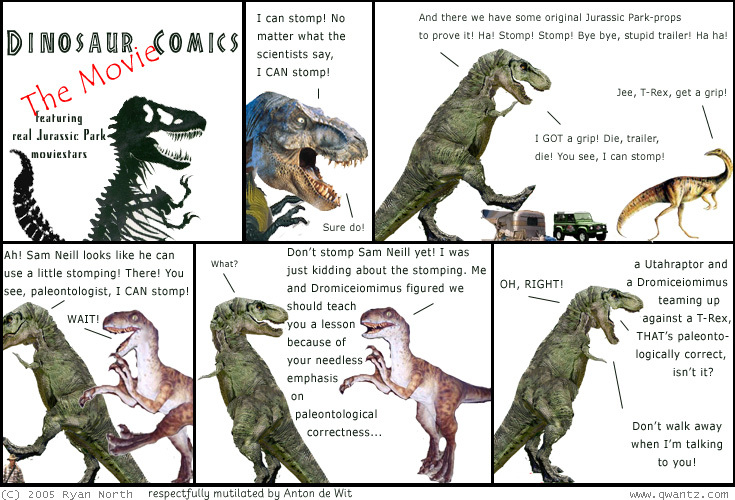 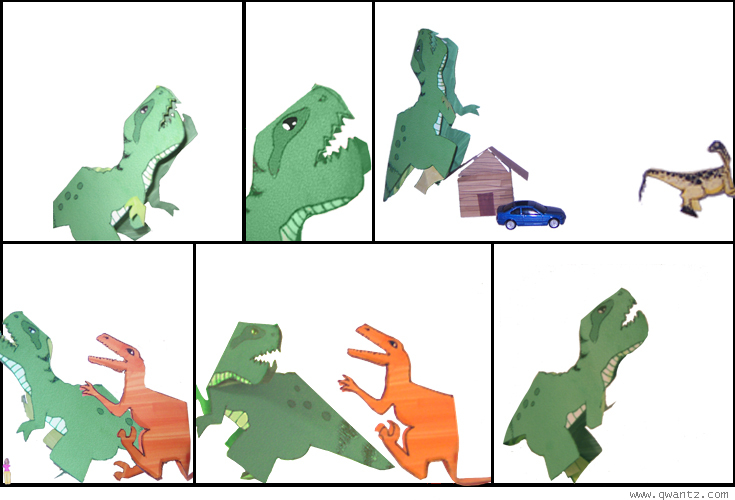 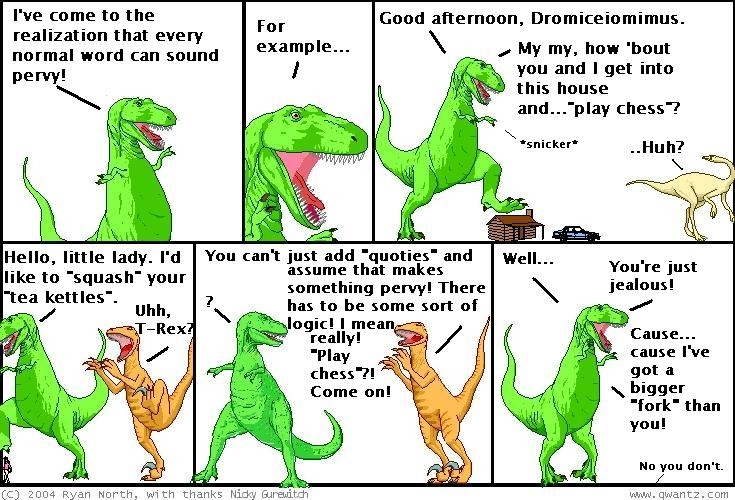 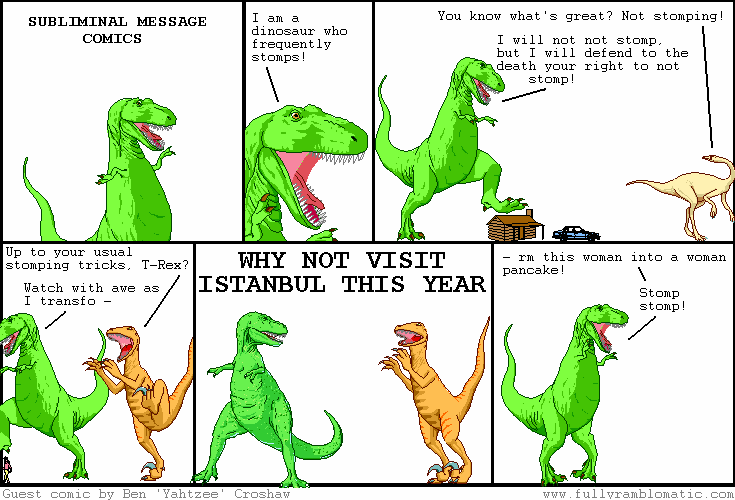 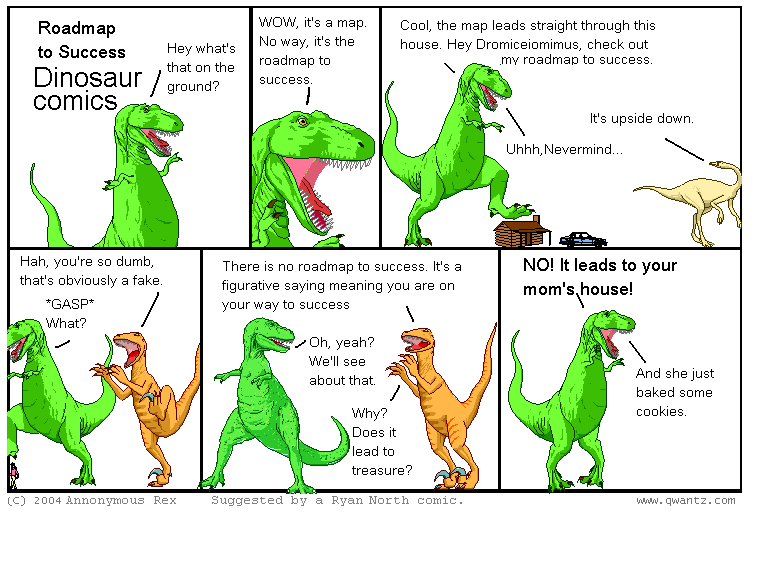 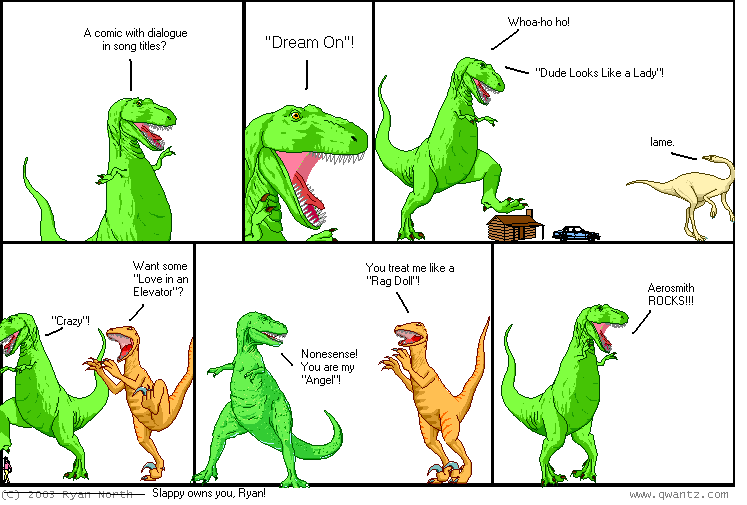 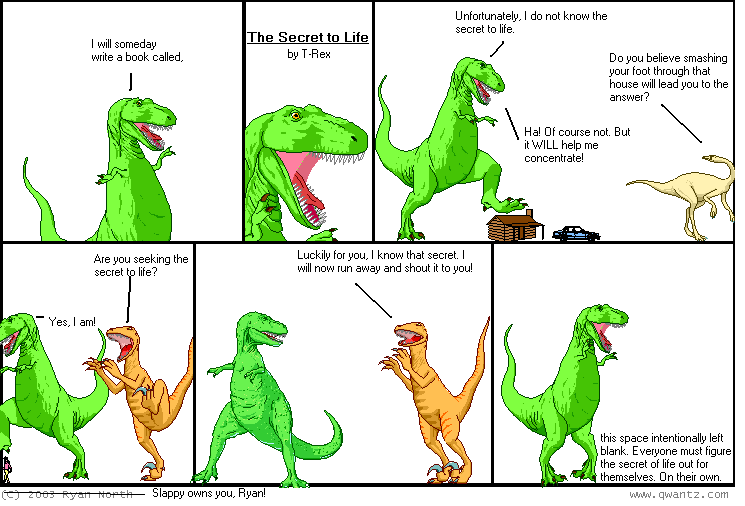 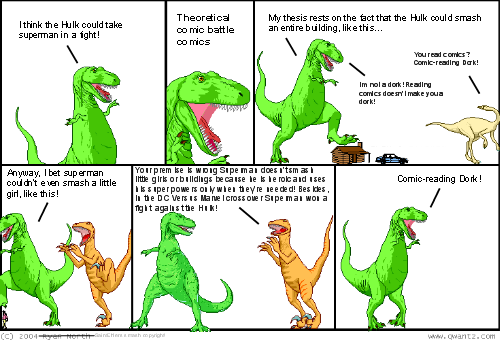 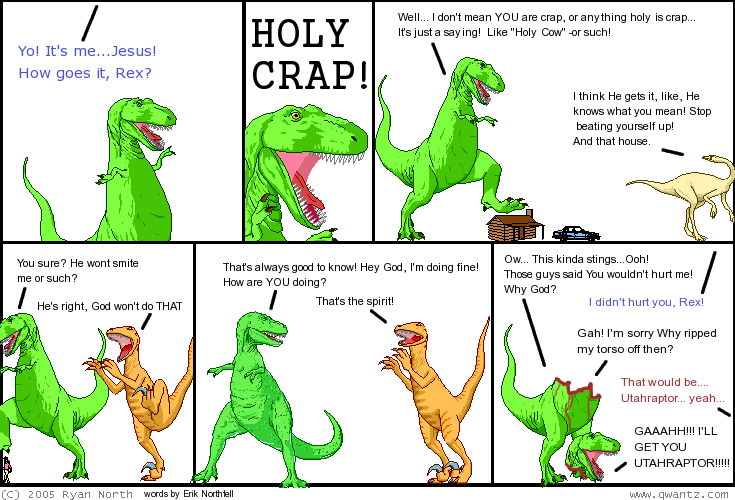 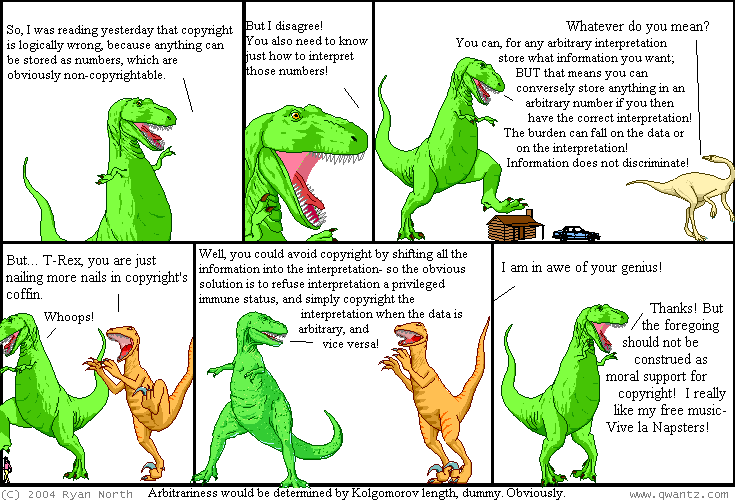 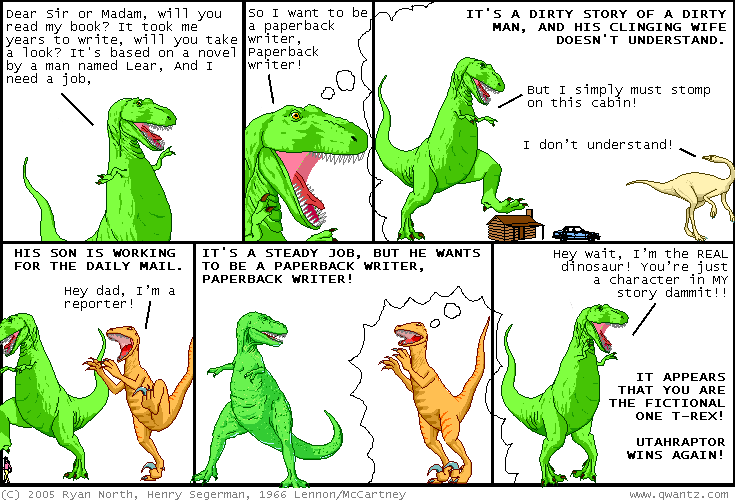 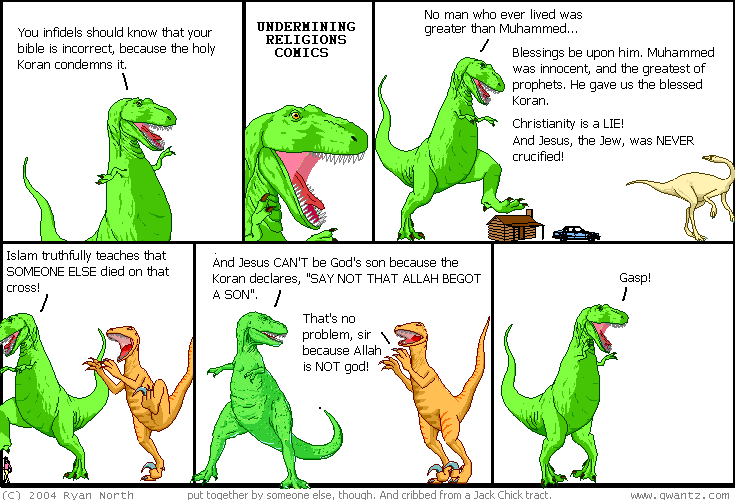 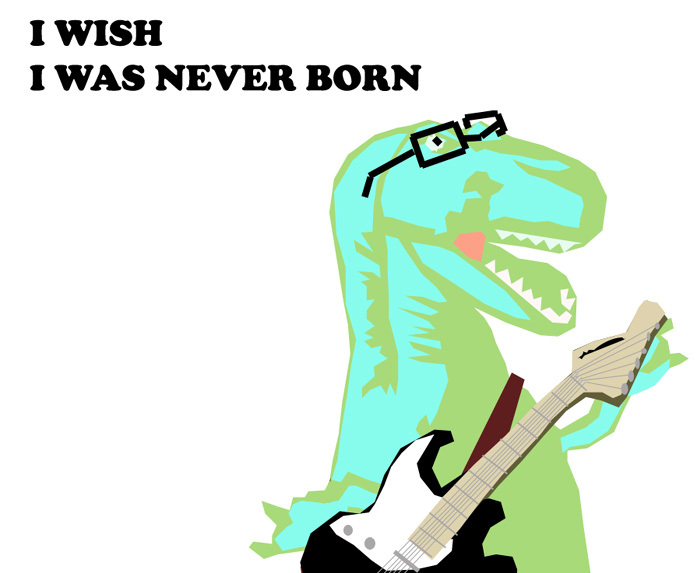 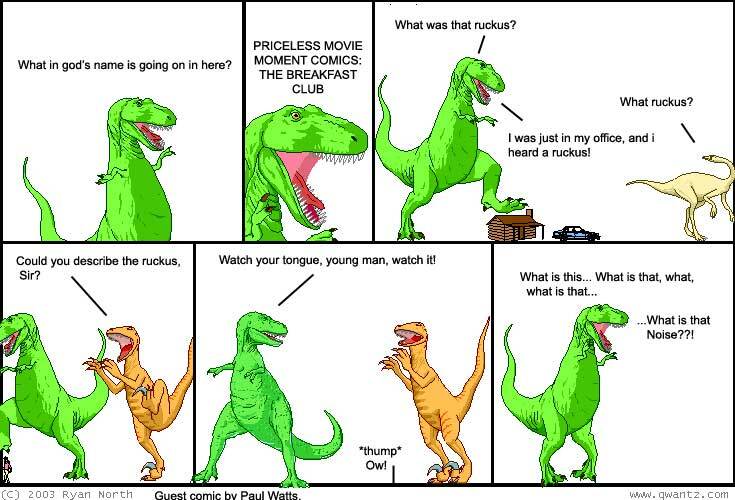 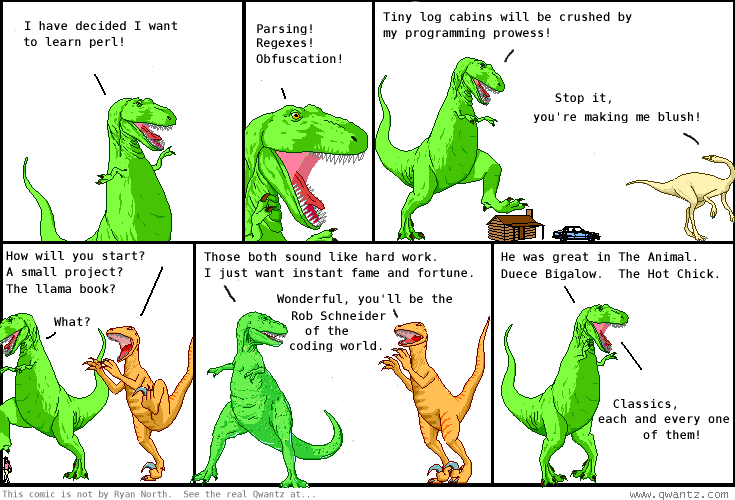 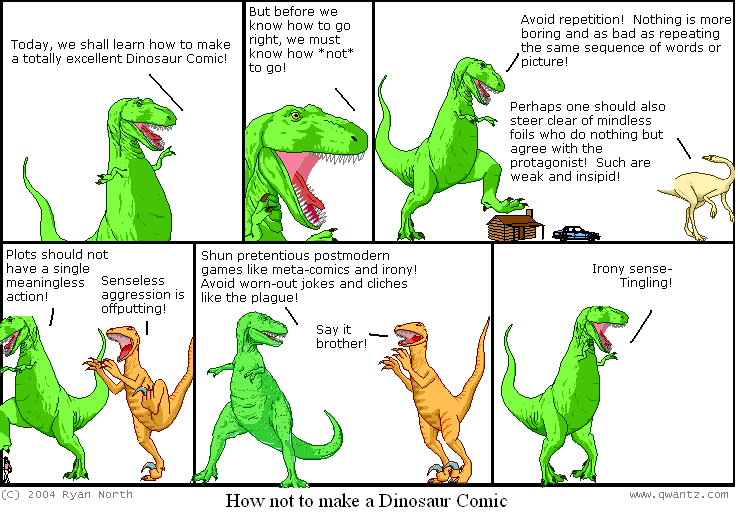 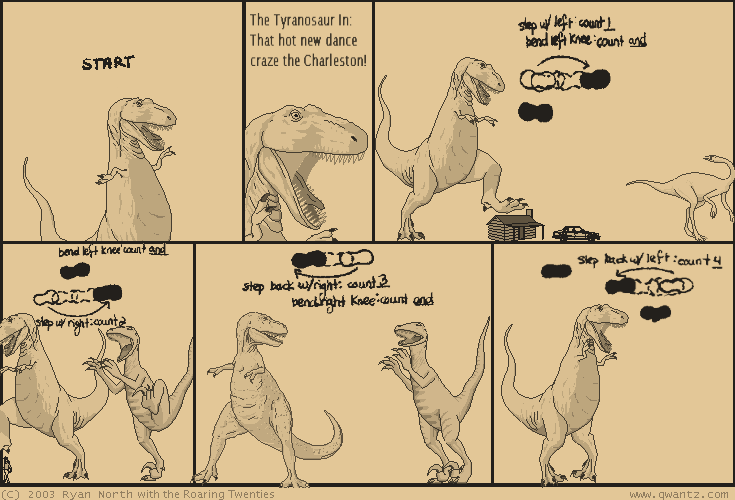 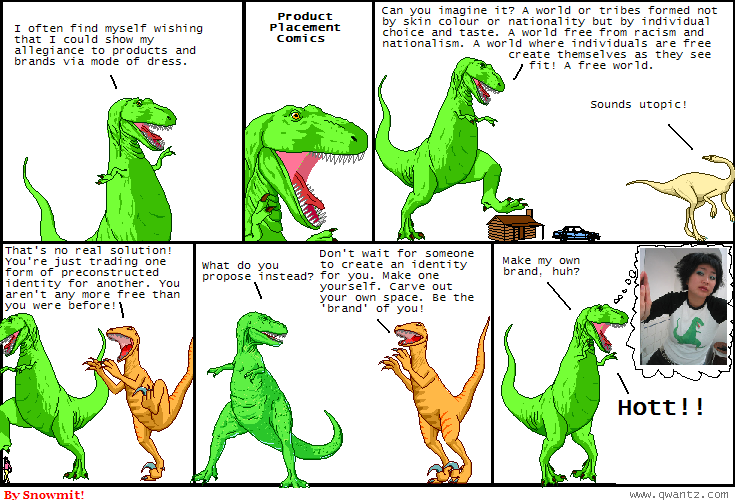 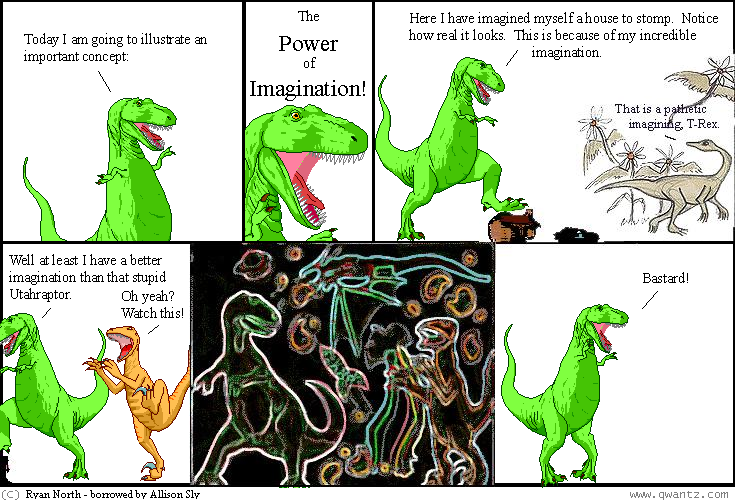 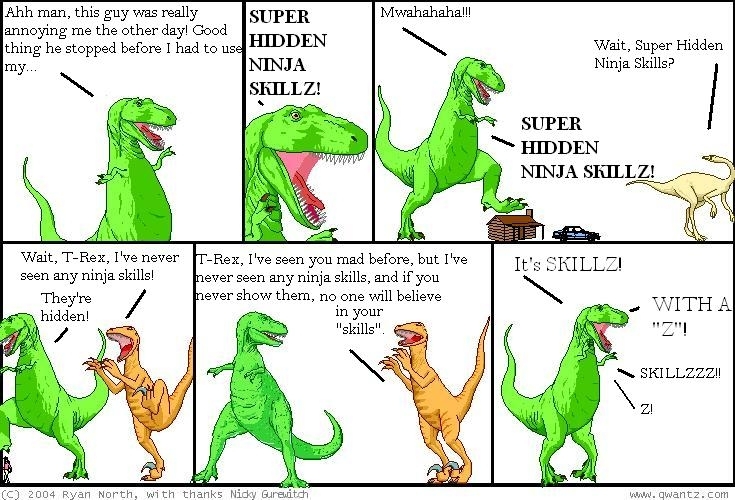 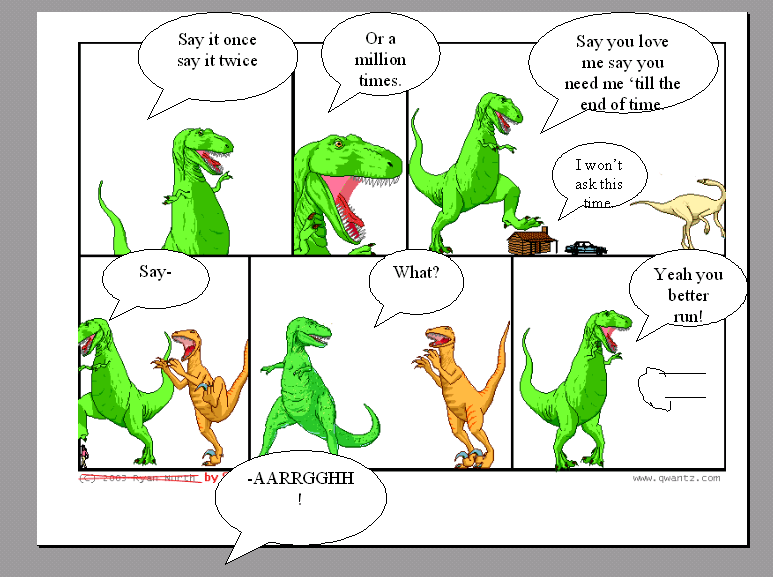 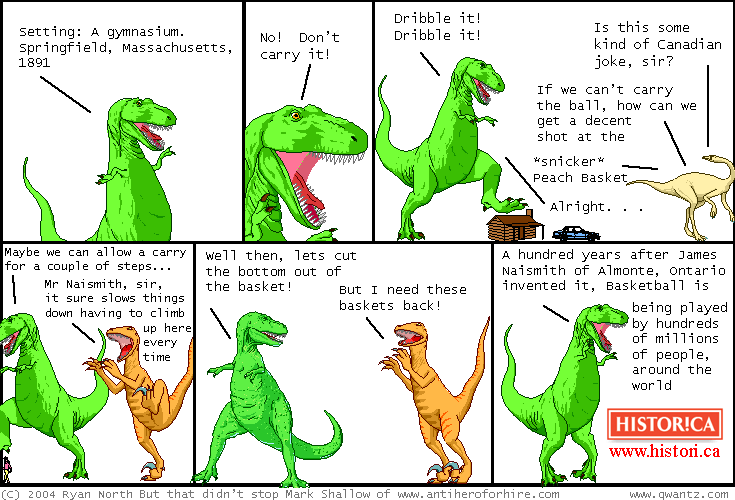 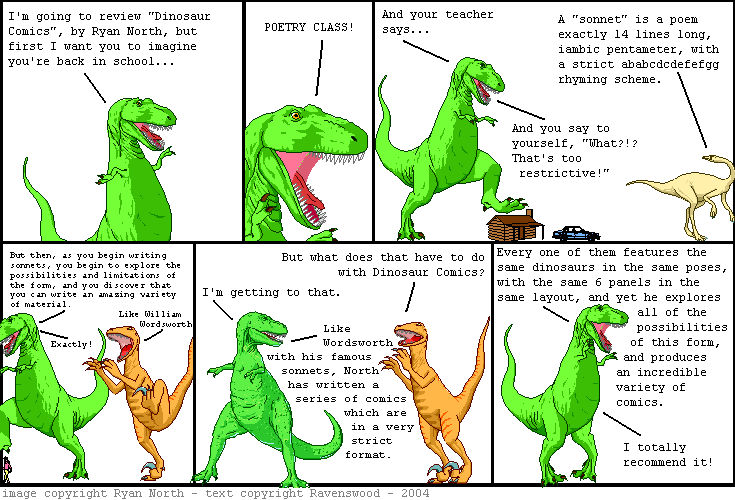 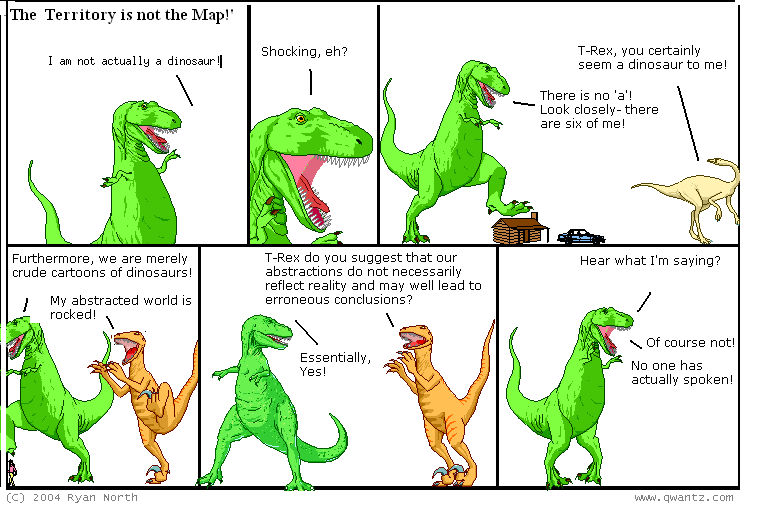 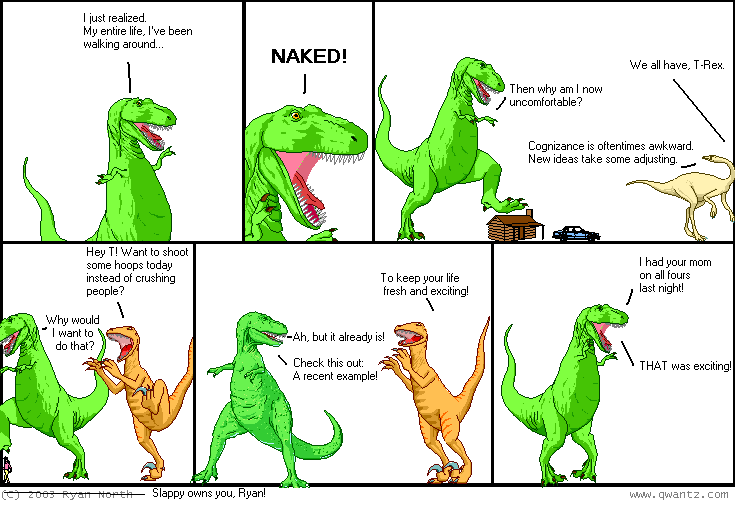 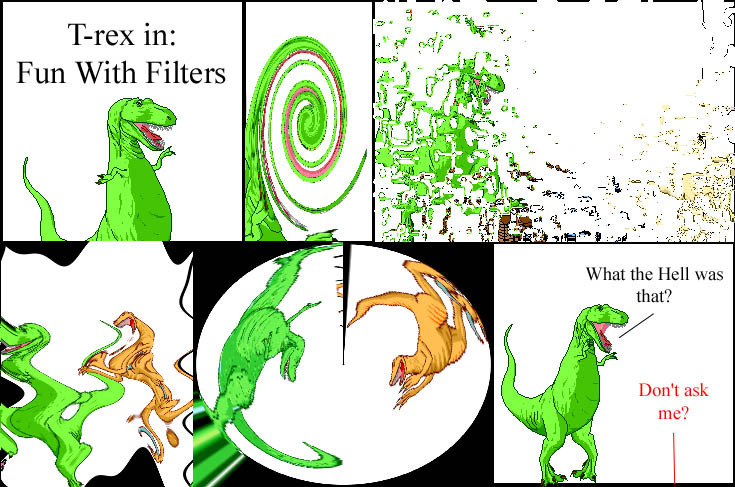 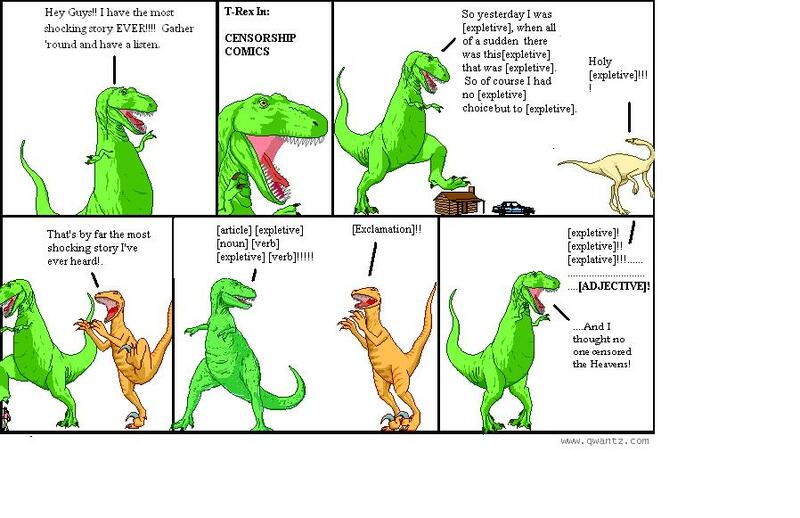 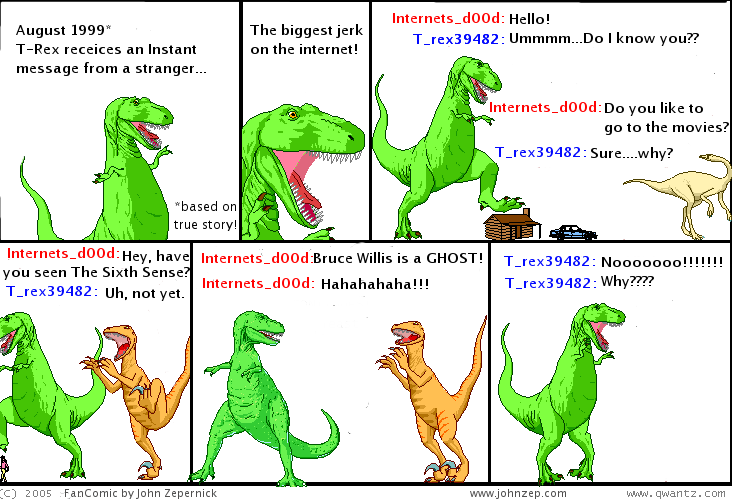 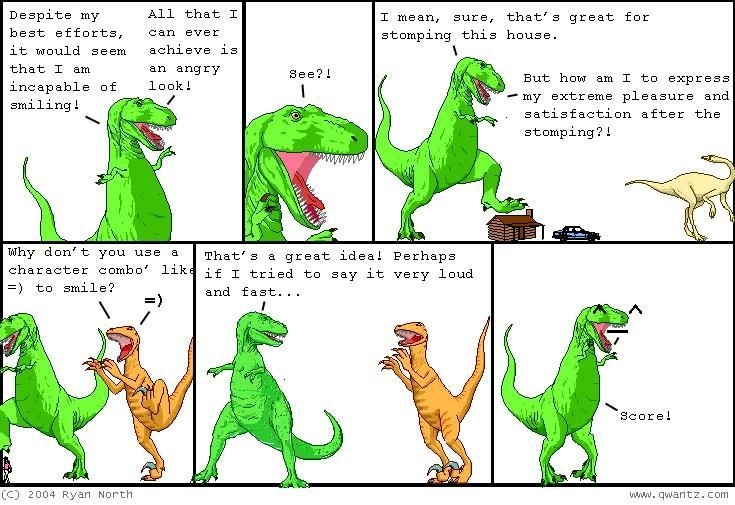 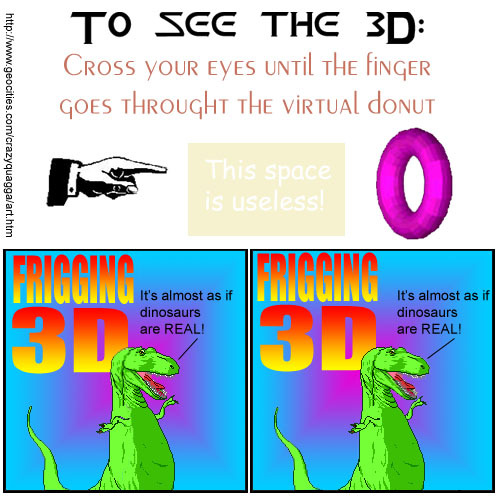 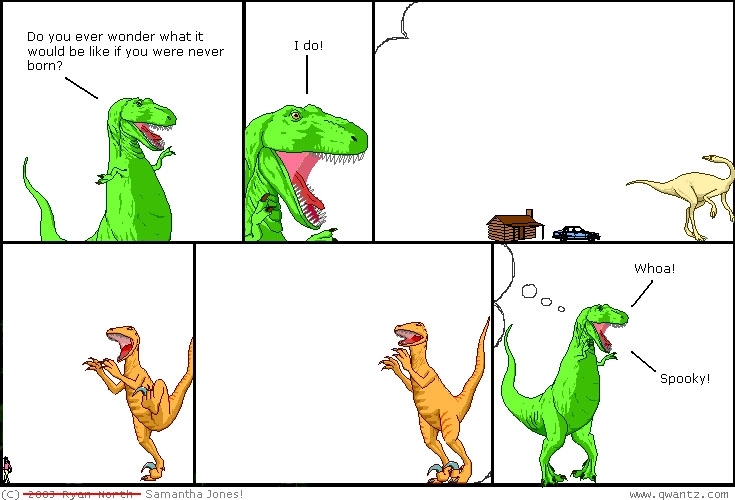 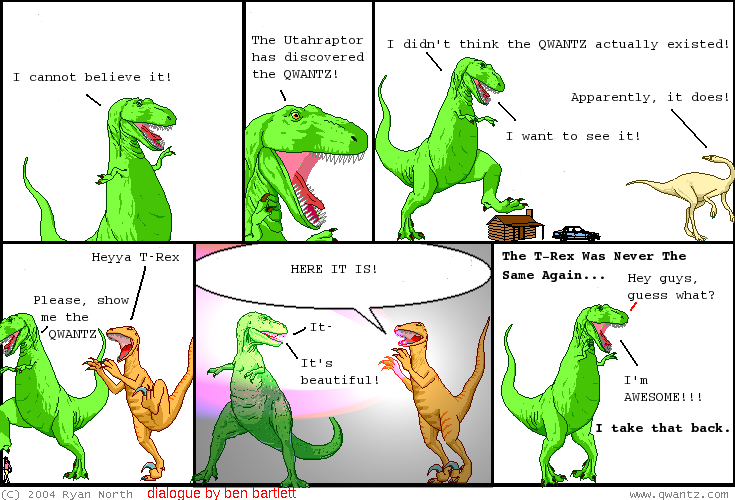 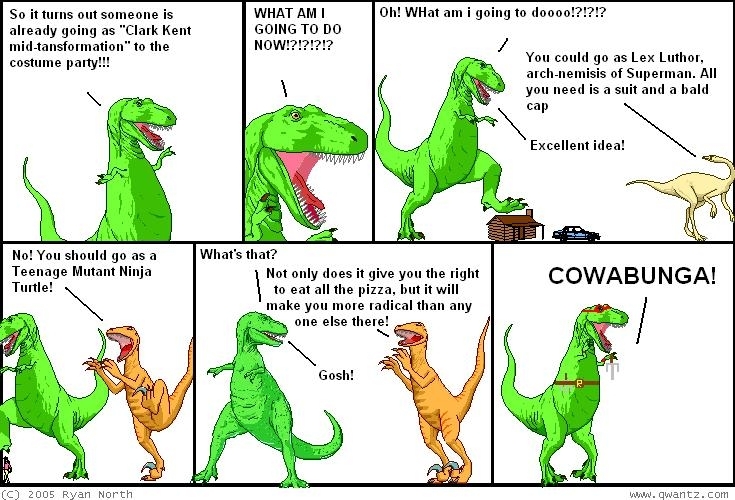 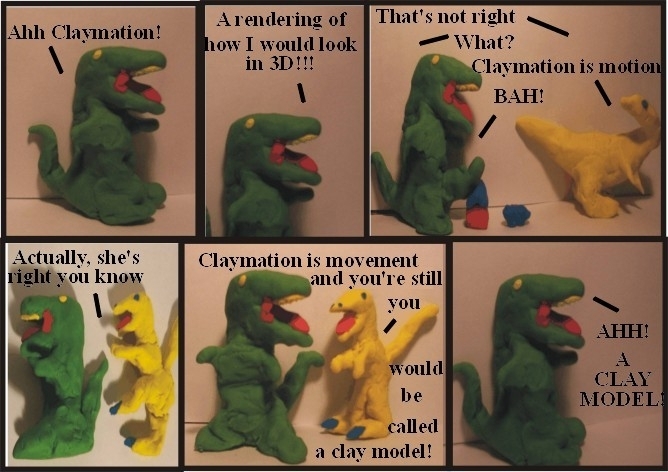 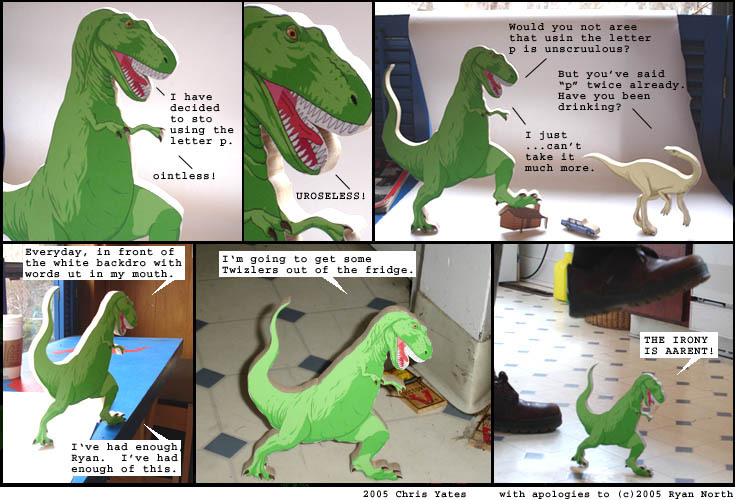 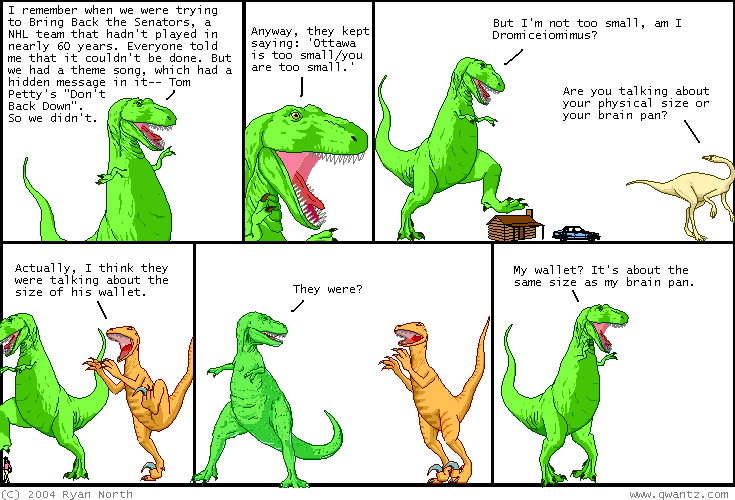 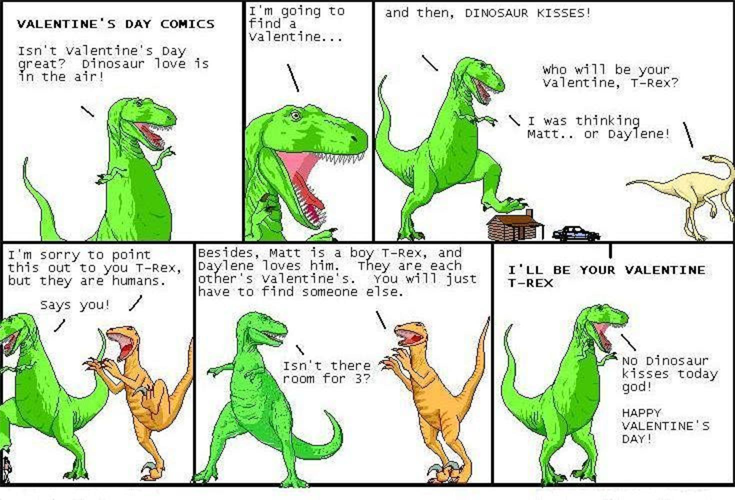 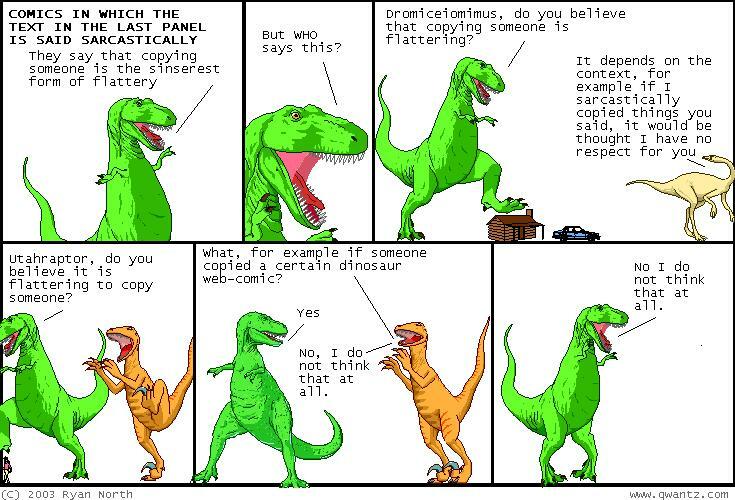 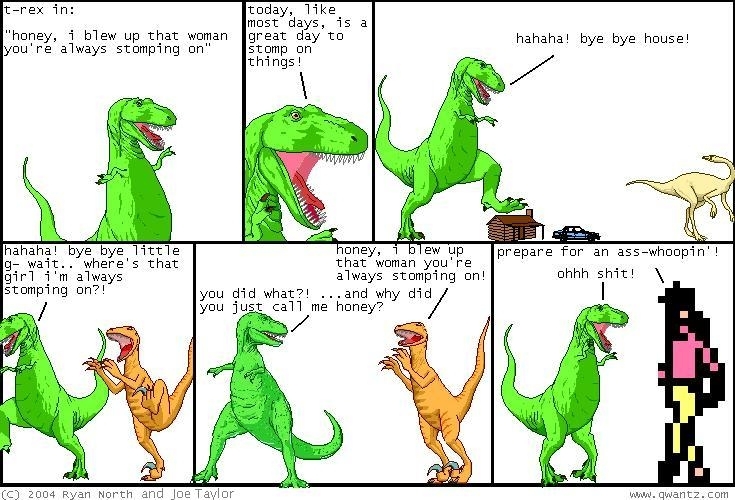 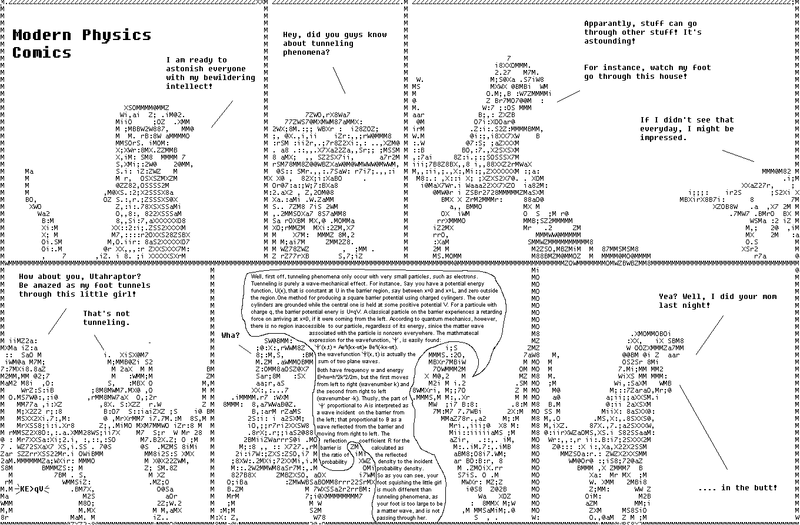 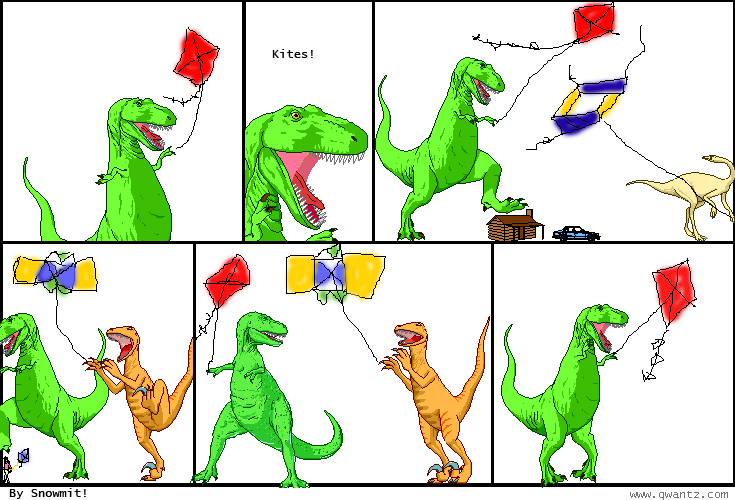 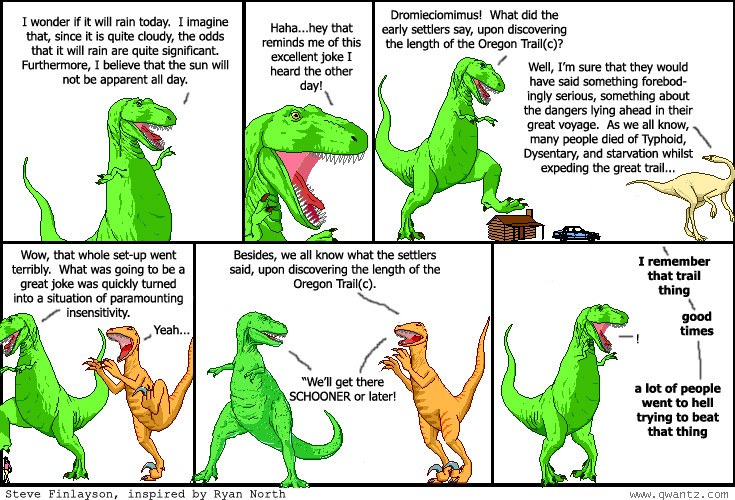 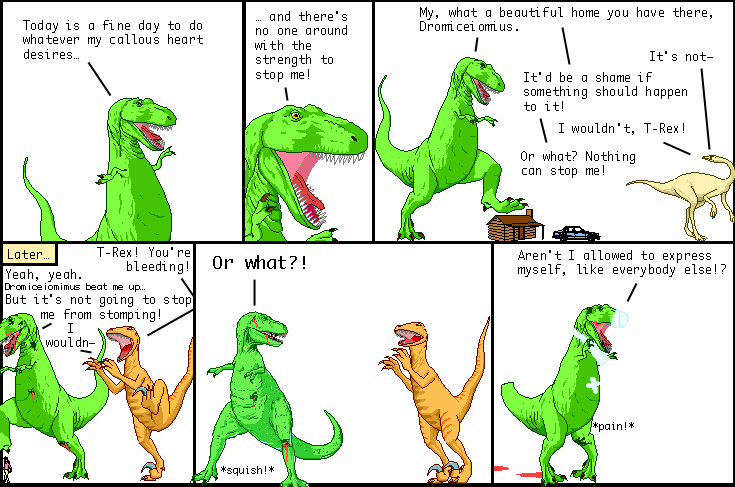 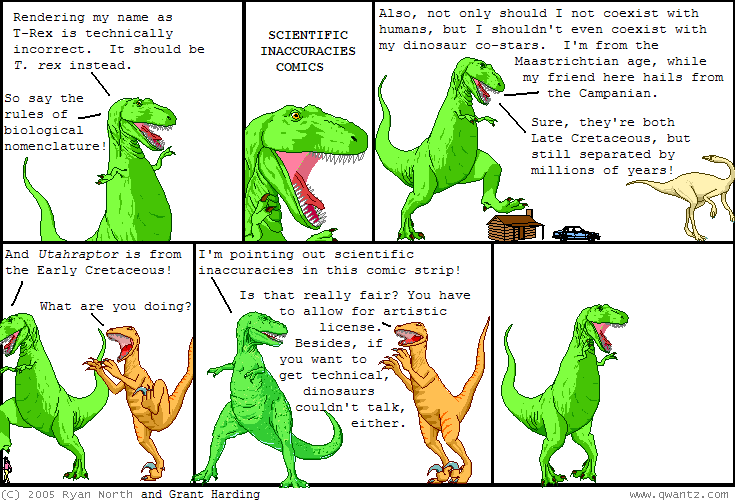 evan hall uses his clever skills to add new images to the dinosaur comics template! 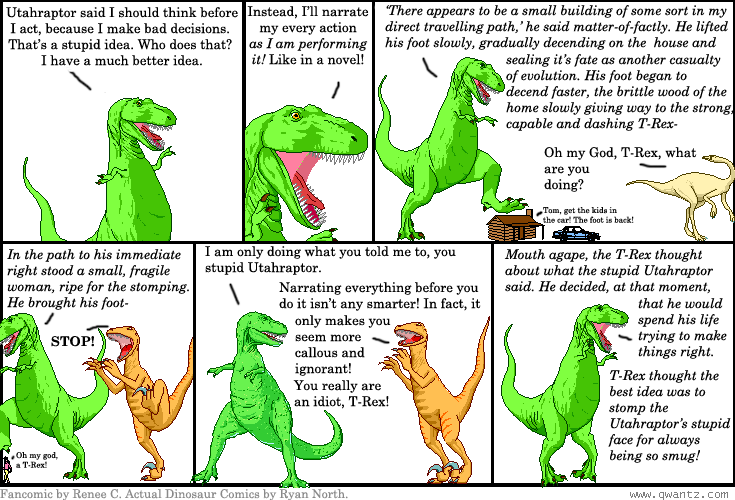 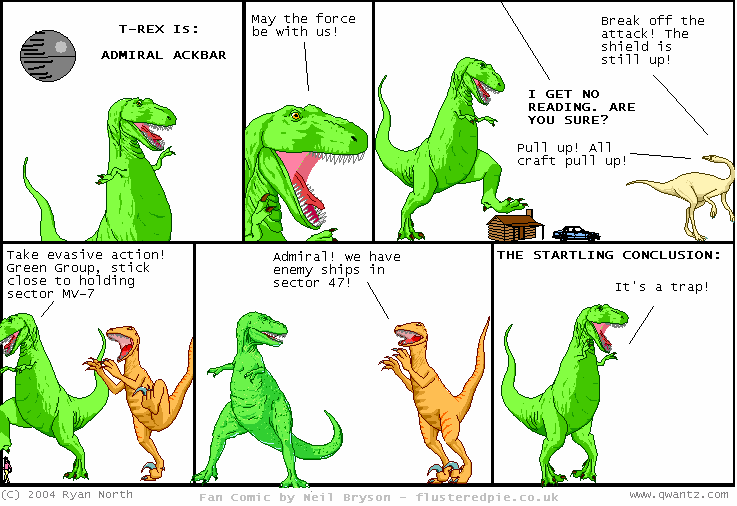 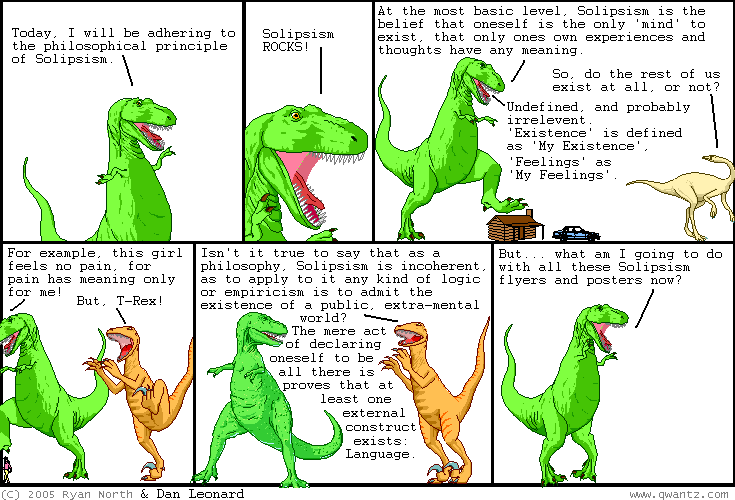 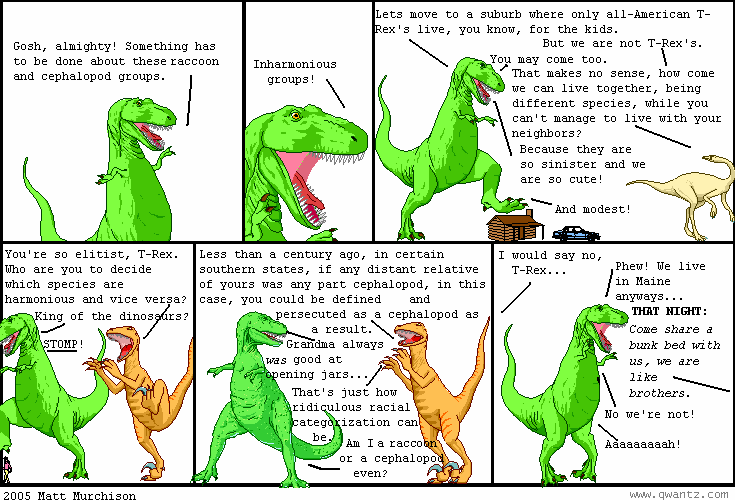 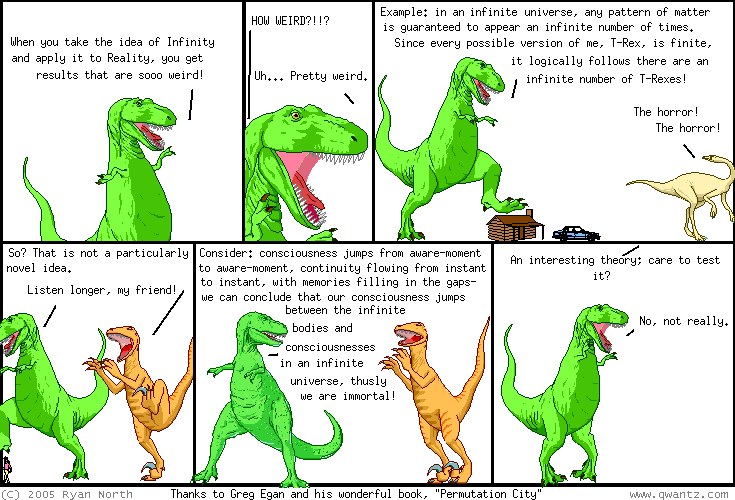 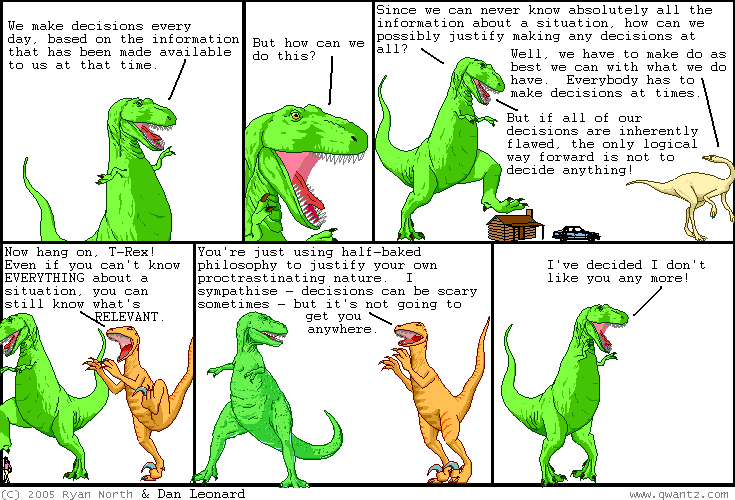 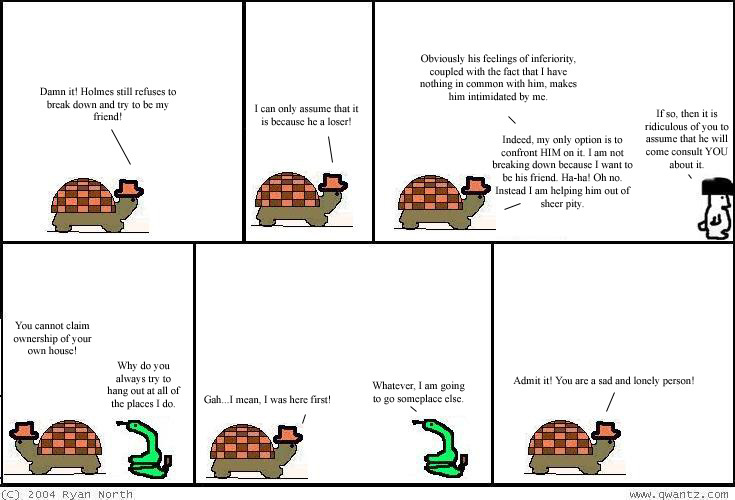 choose your universe and enjoy the dinosaur comics in an hilarious new context. 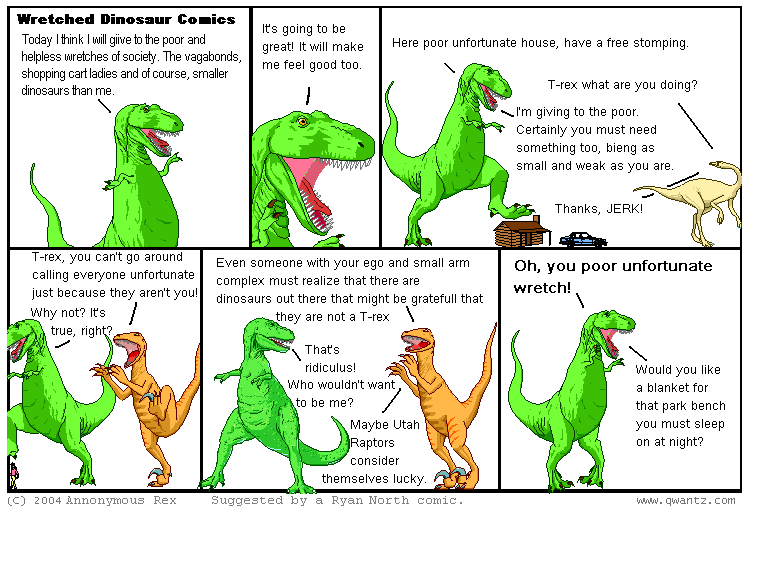 see what it would be like if dinosaur comics had puppies with wigu, buttercup festival, pokey the penguin, penny arcade, and dead funny! 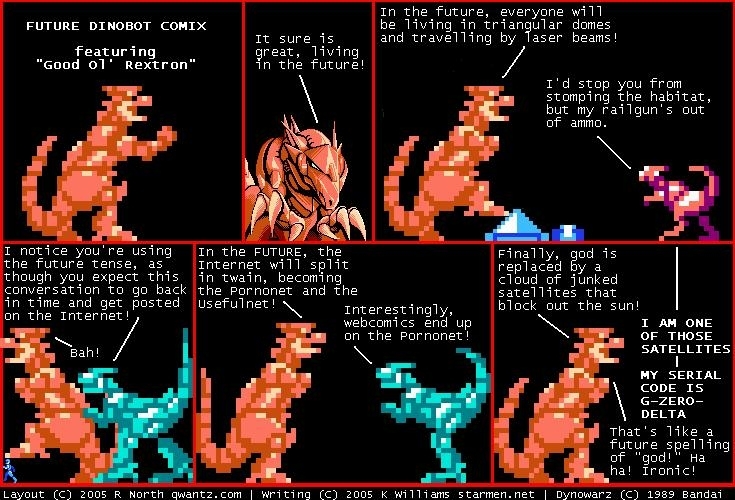 leonard richardson uses his sweet computer skills to bring you over a billion billion new comics. 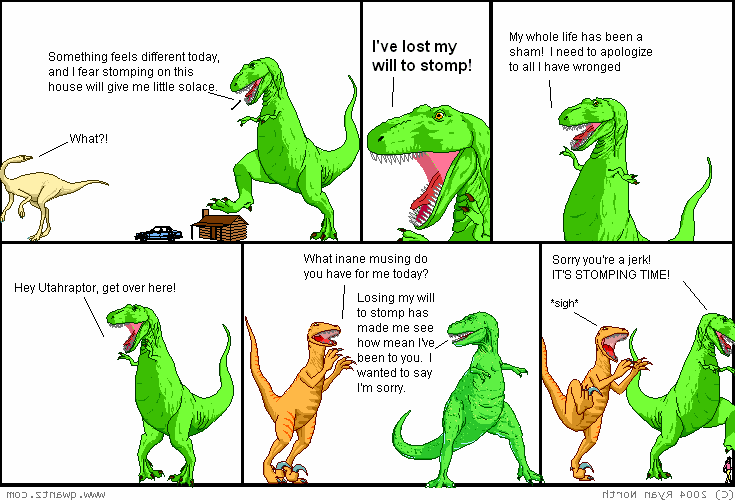 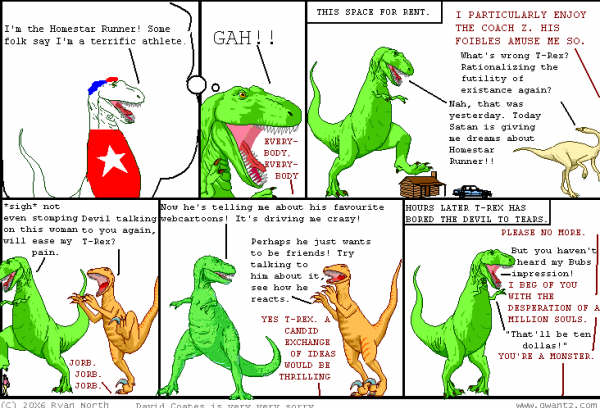 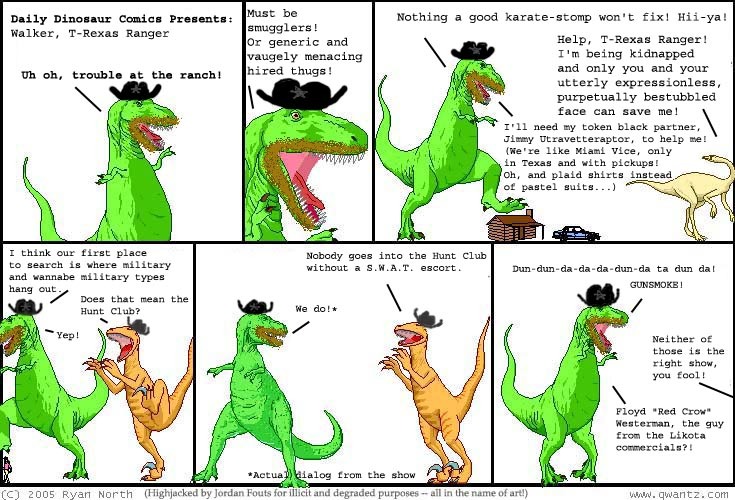 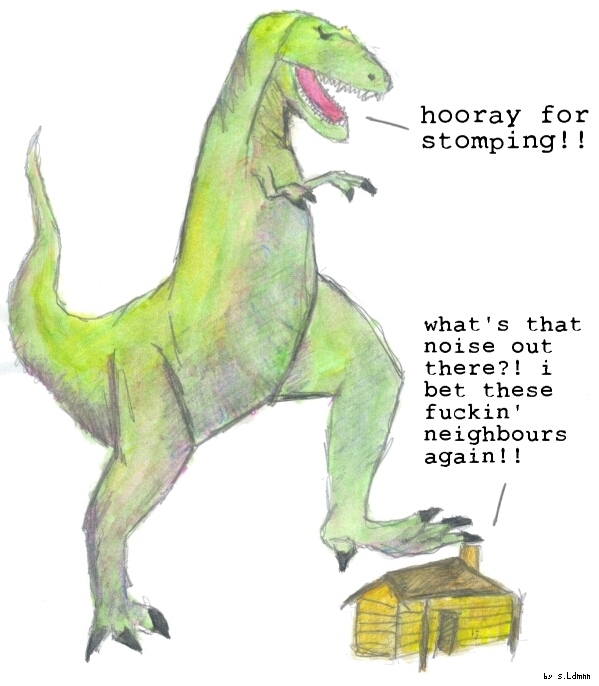 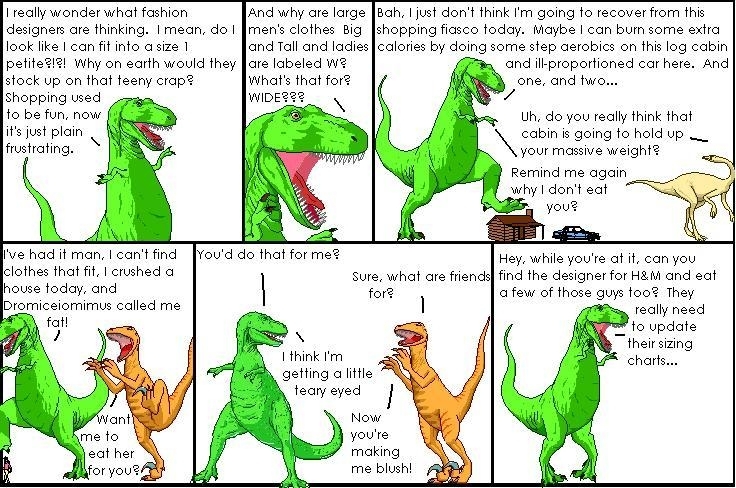 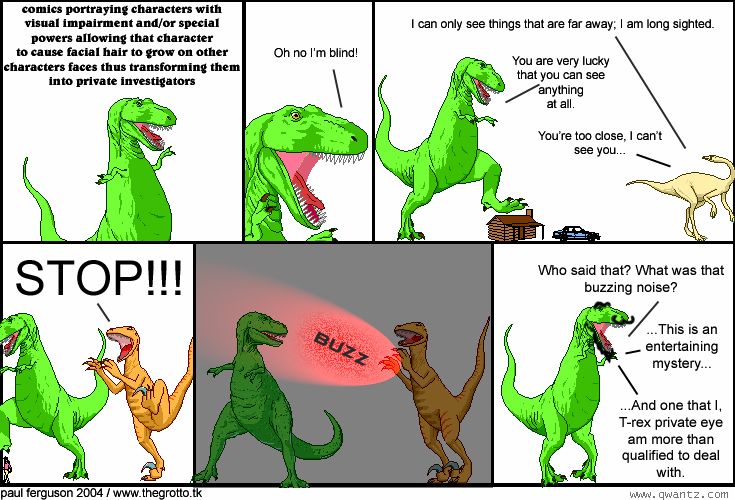 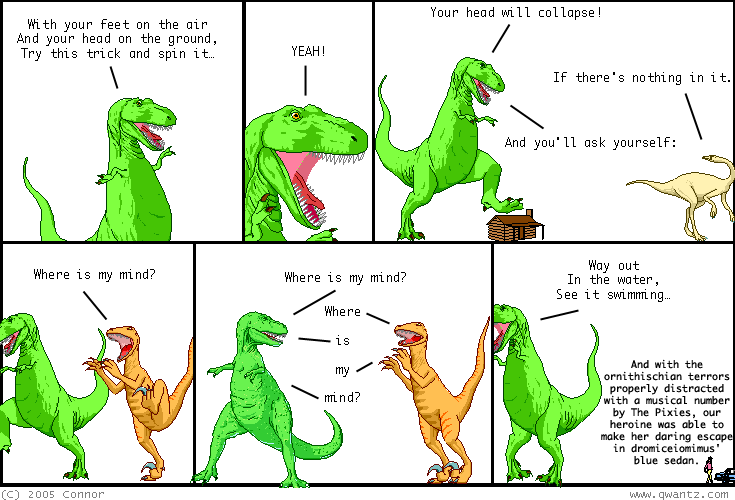 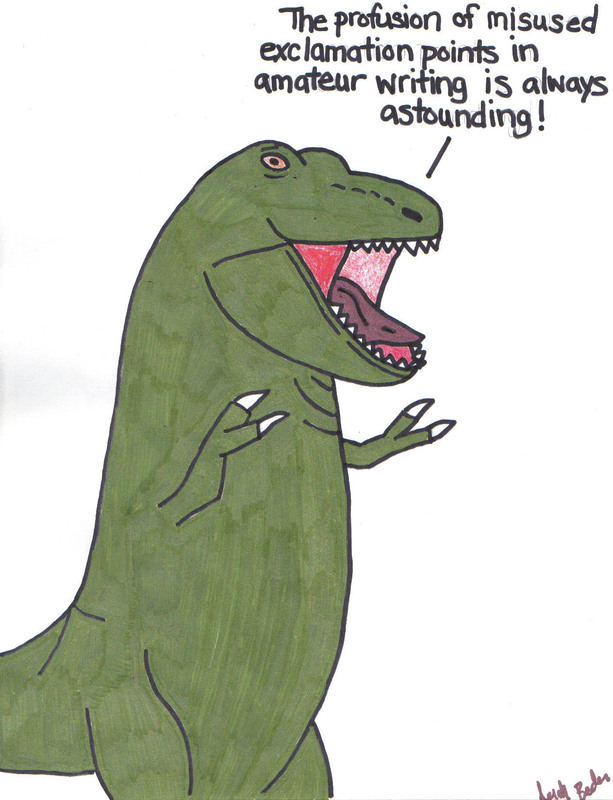 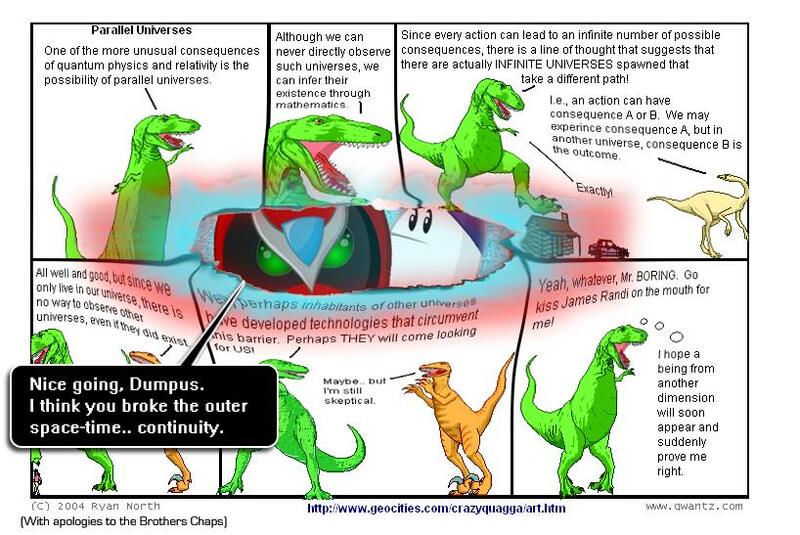 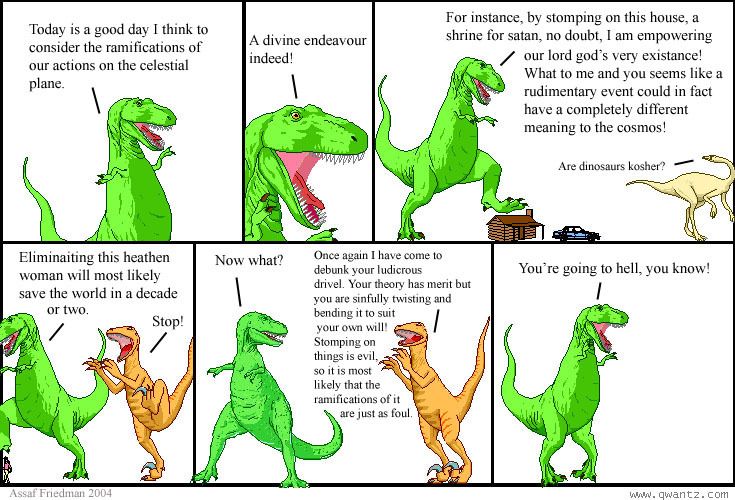 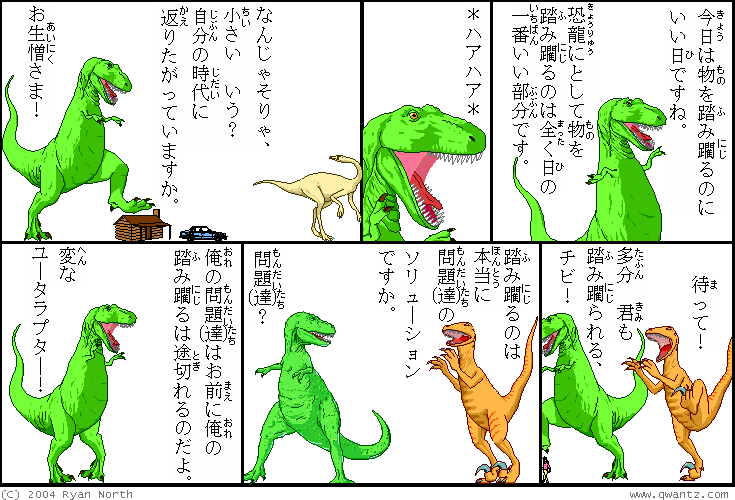 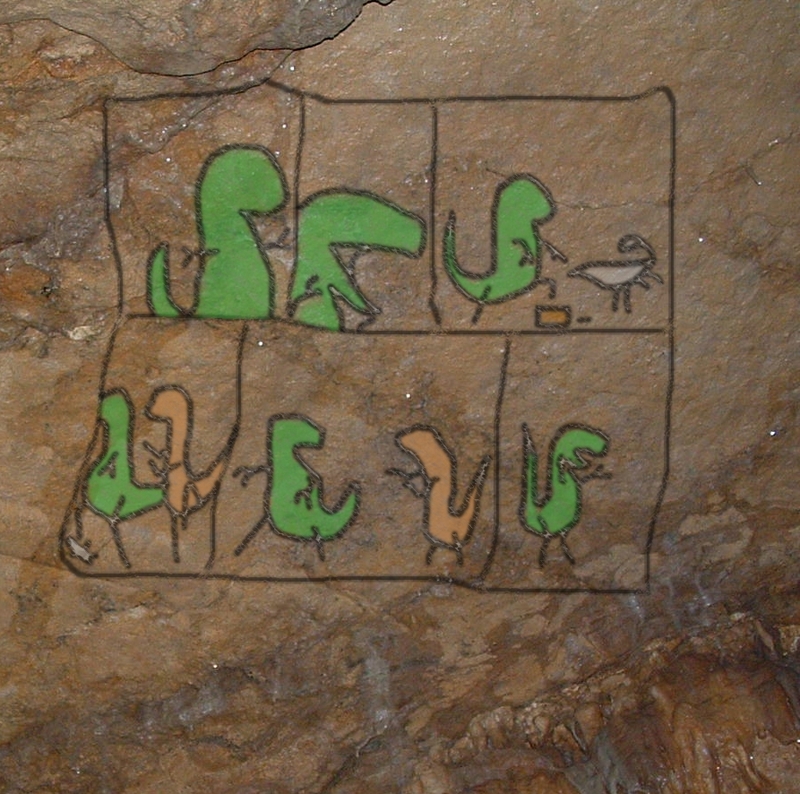 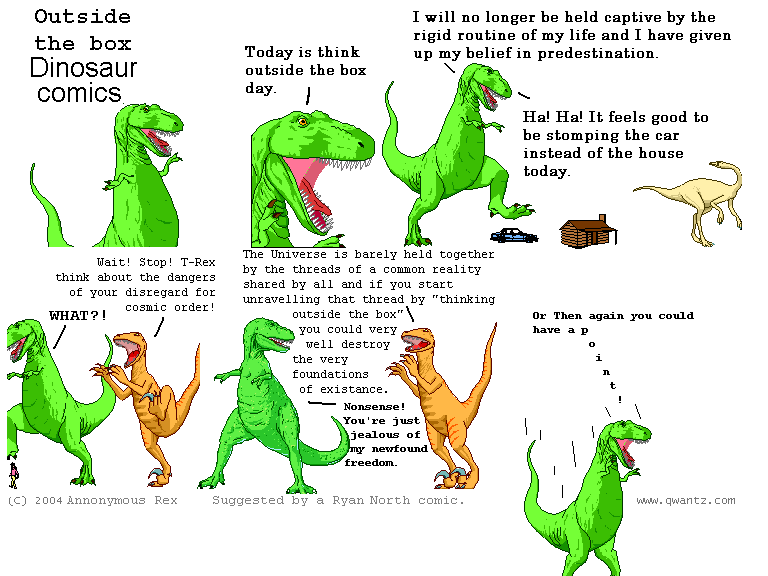 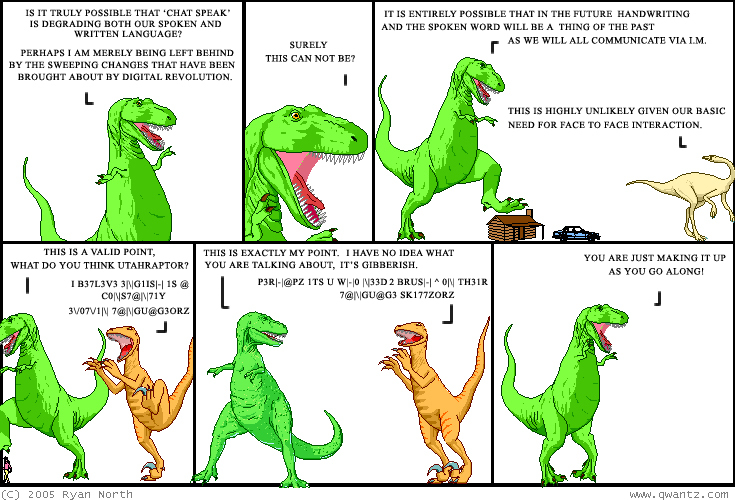 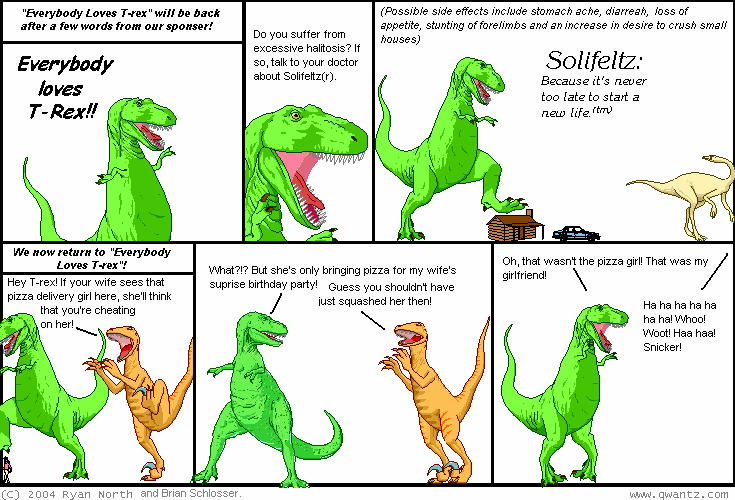 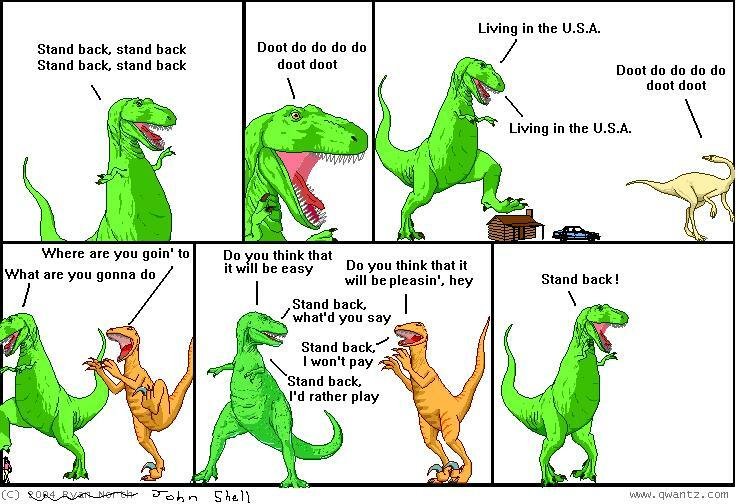 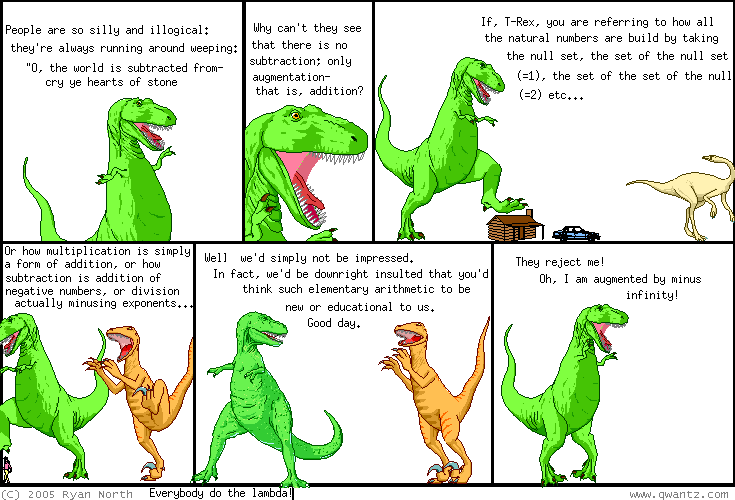 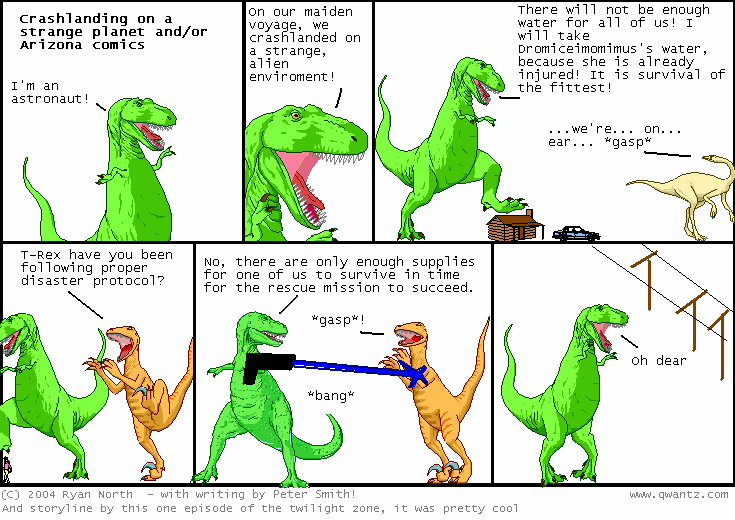 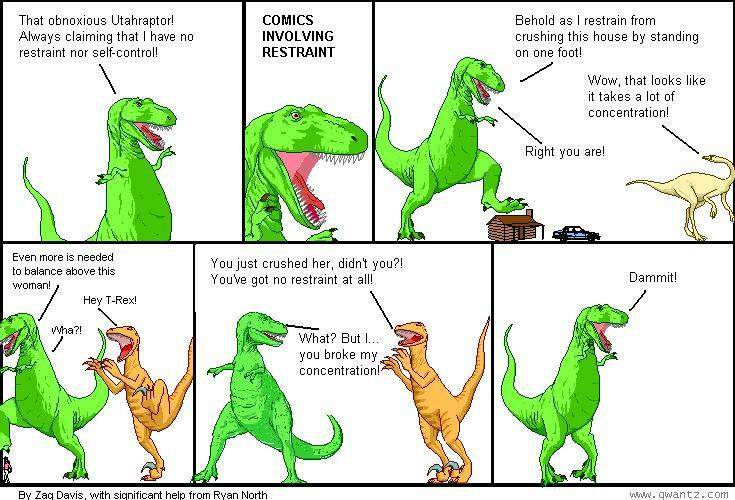 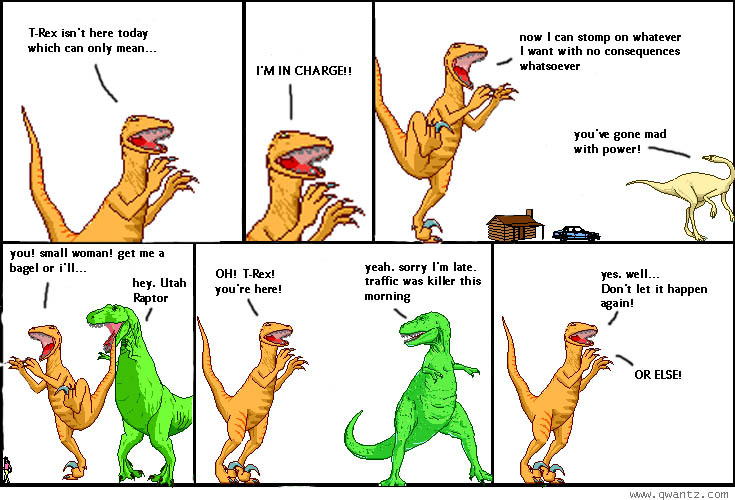 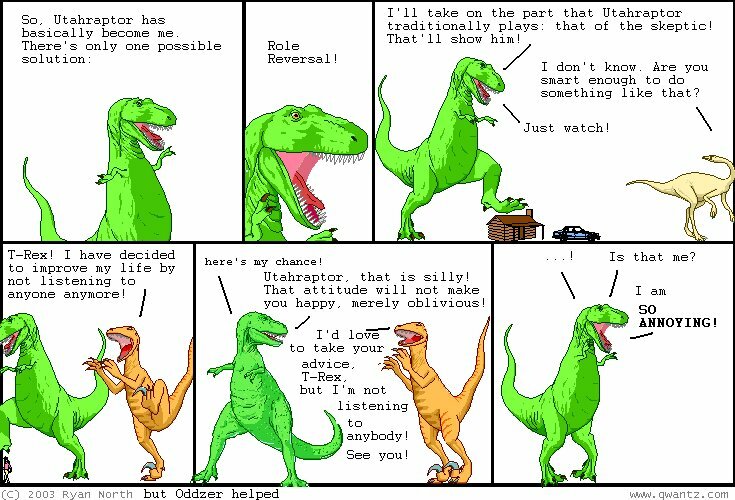 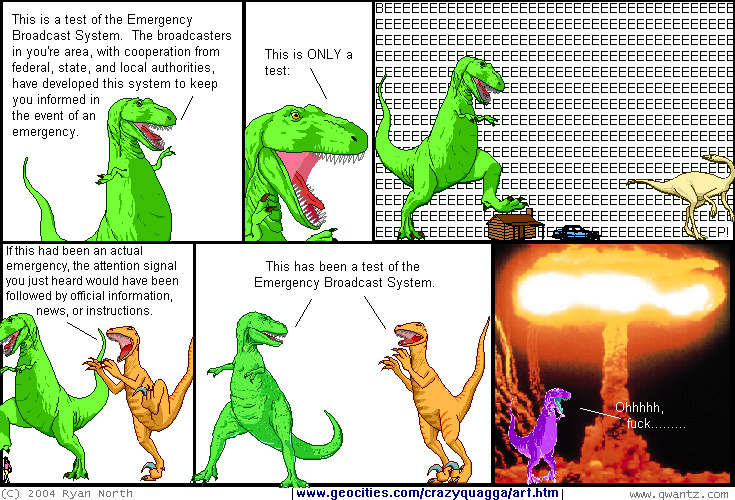 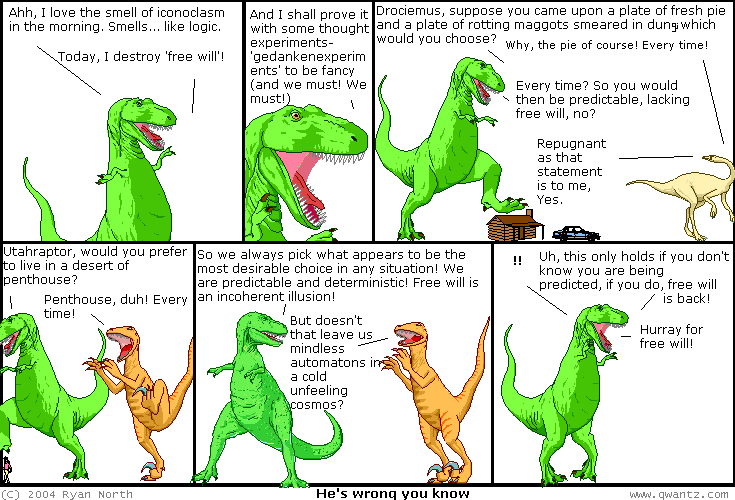 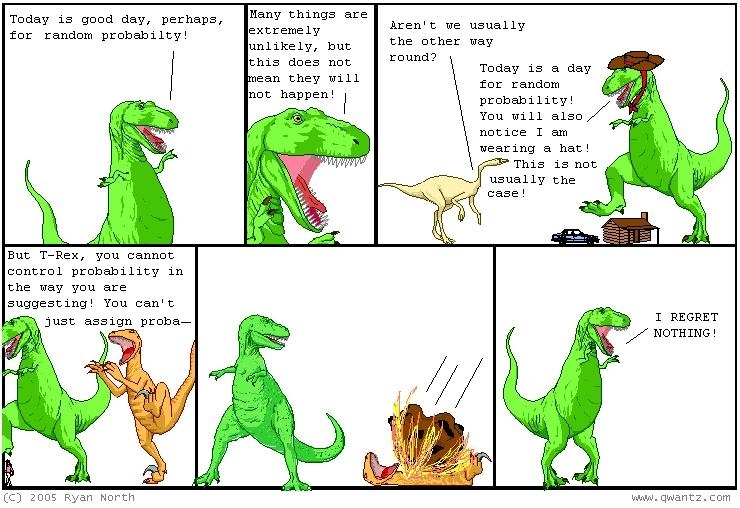 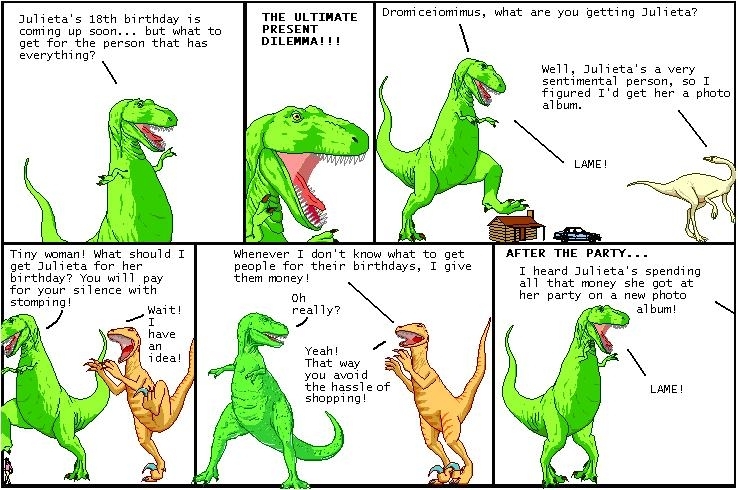 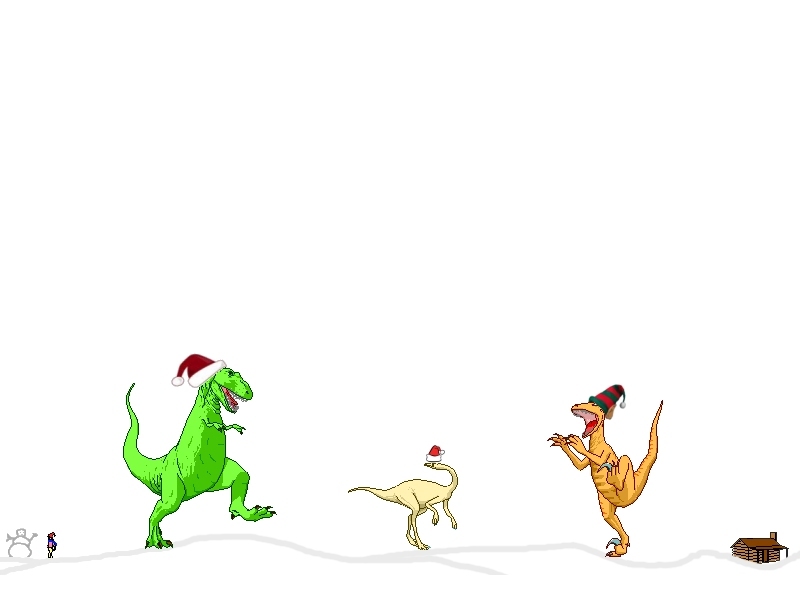 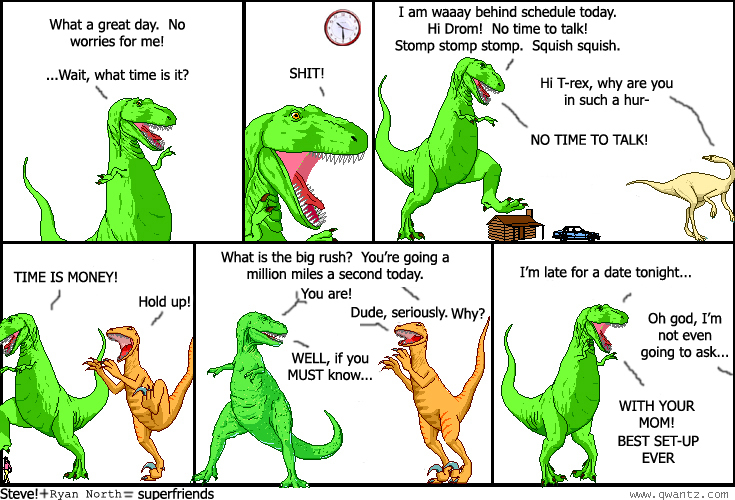 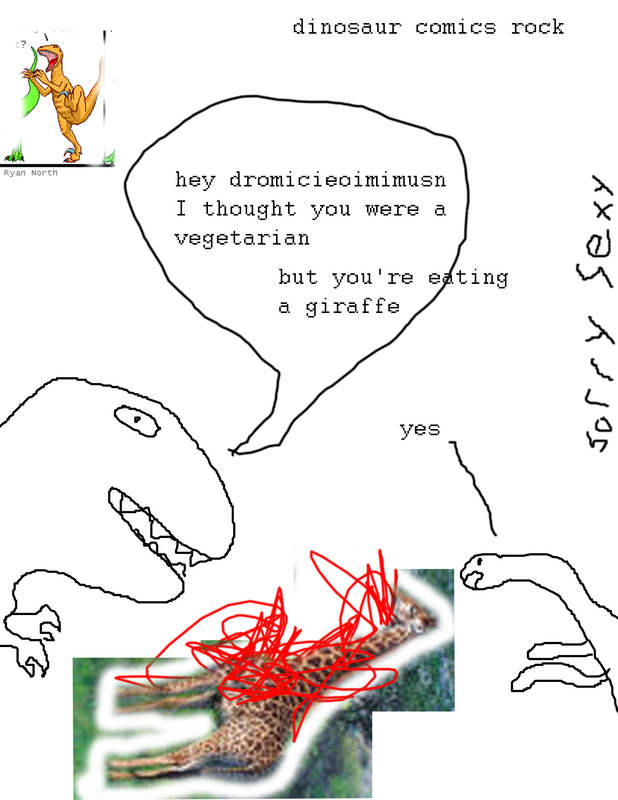 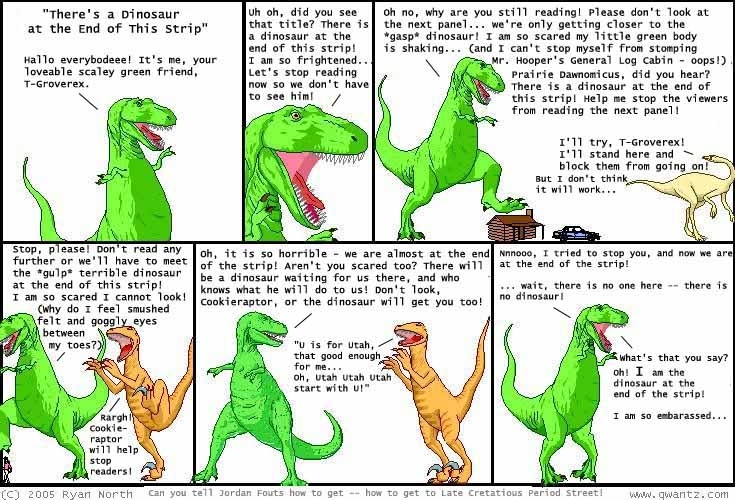 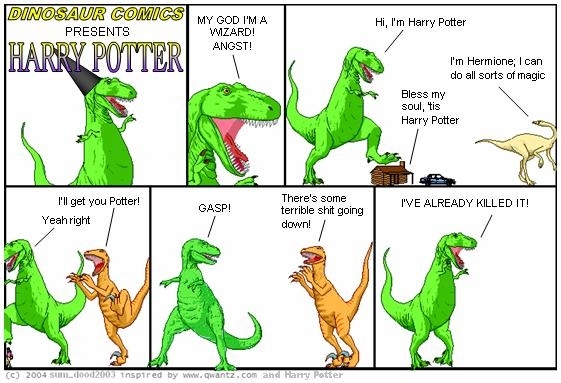 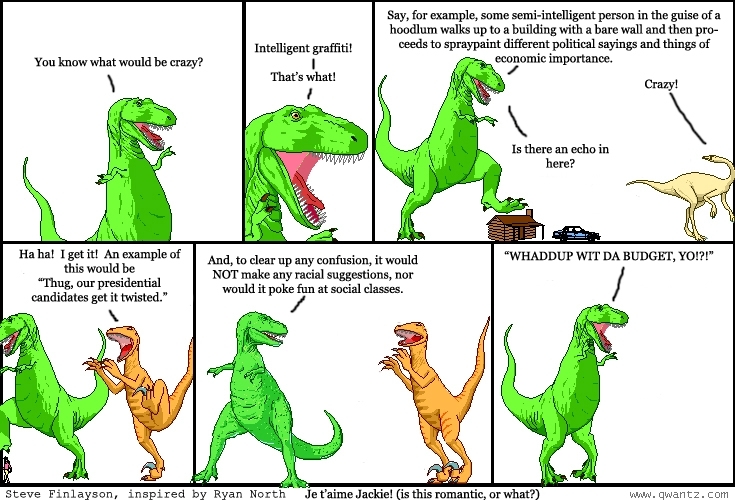 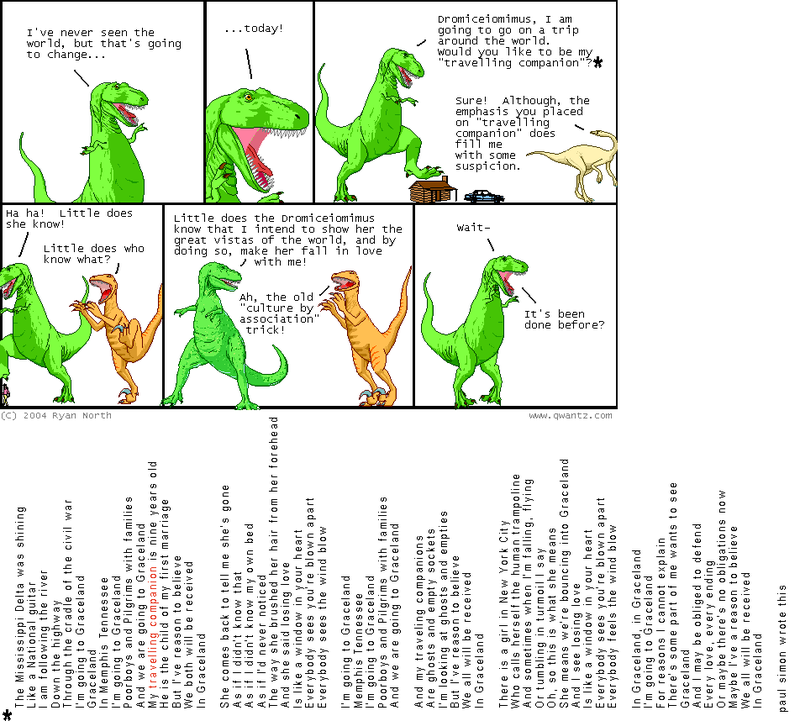 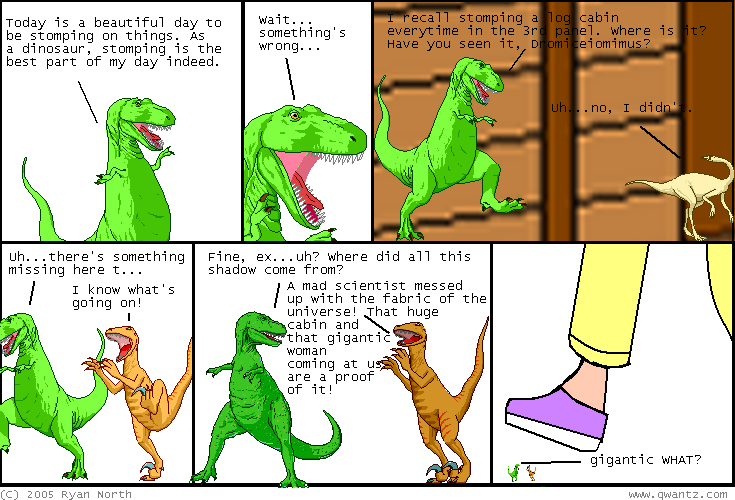 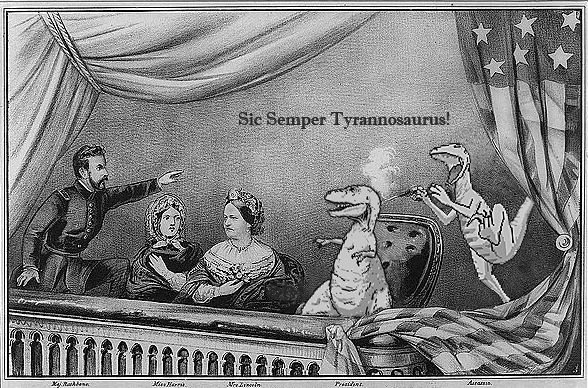 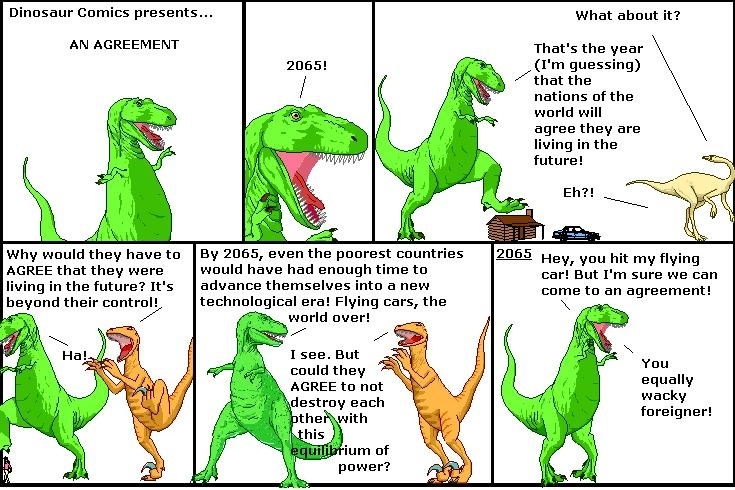 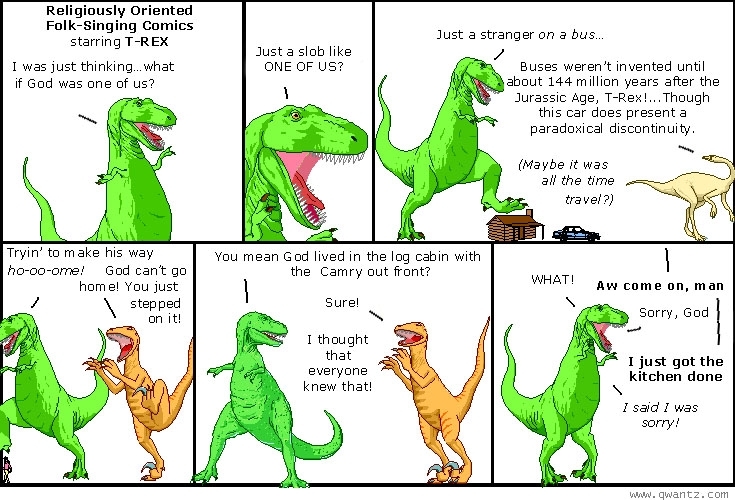 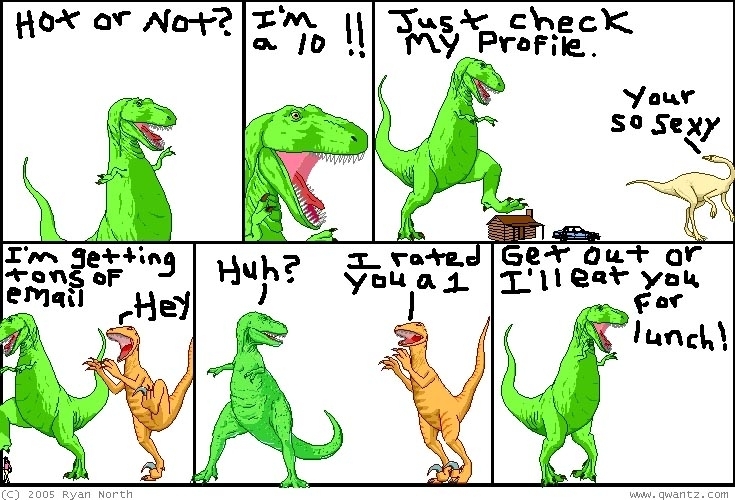 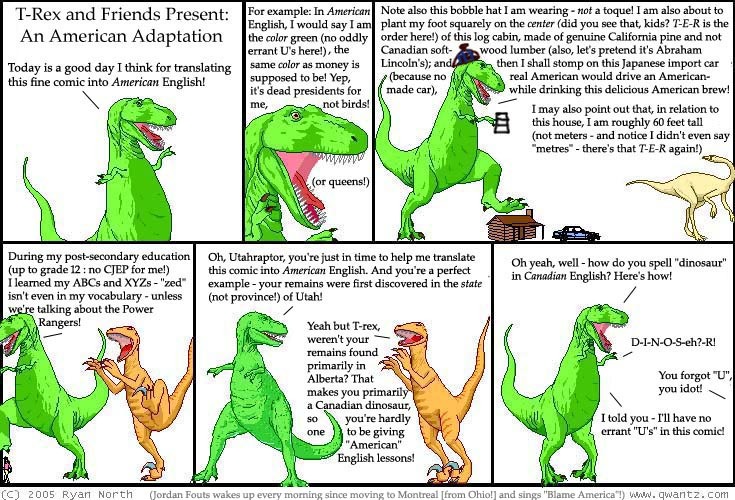 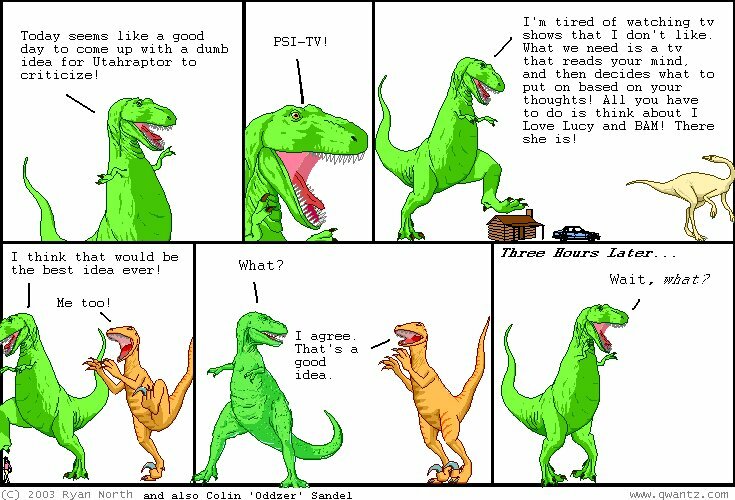 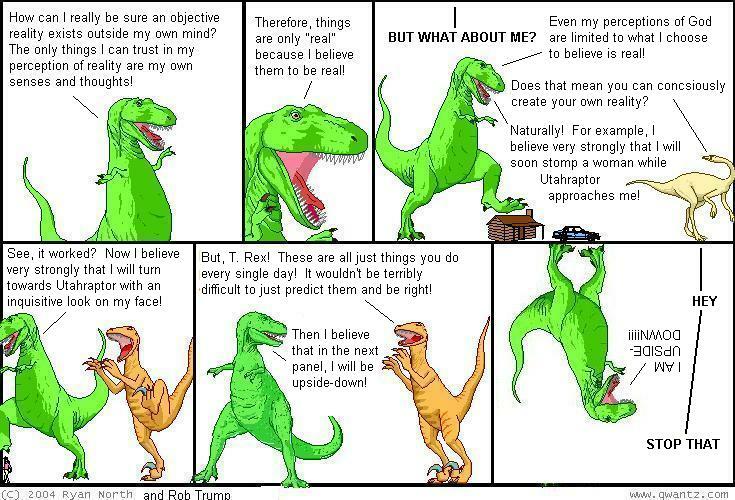 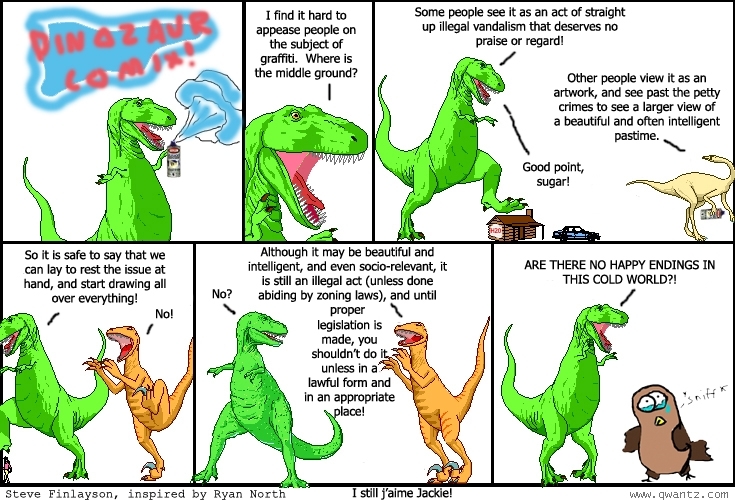 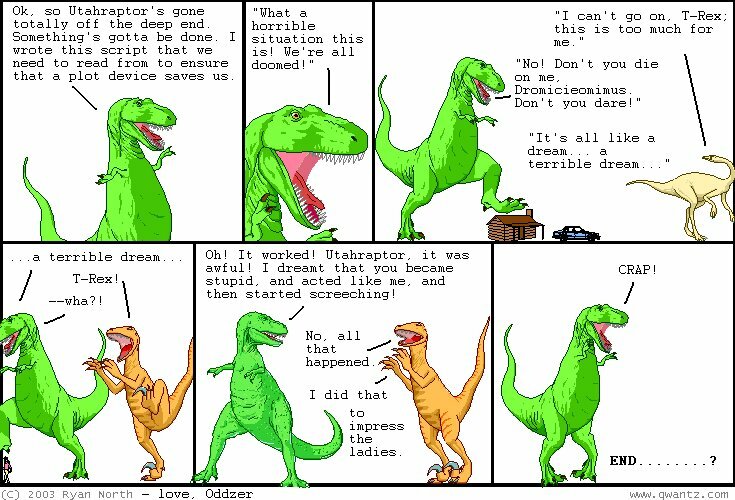 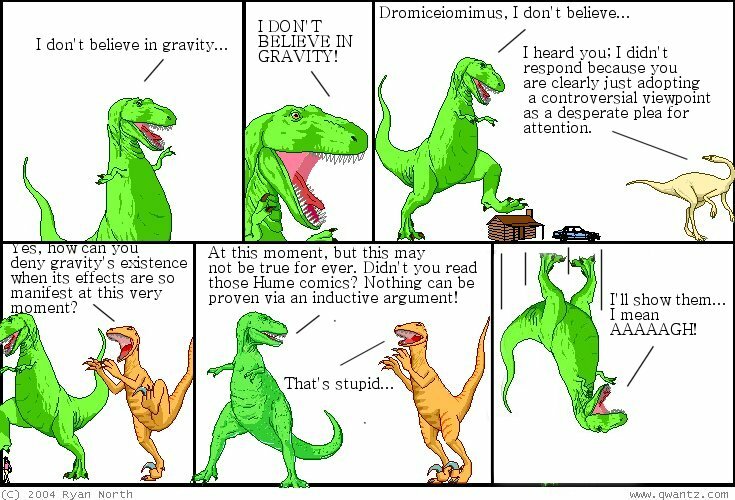 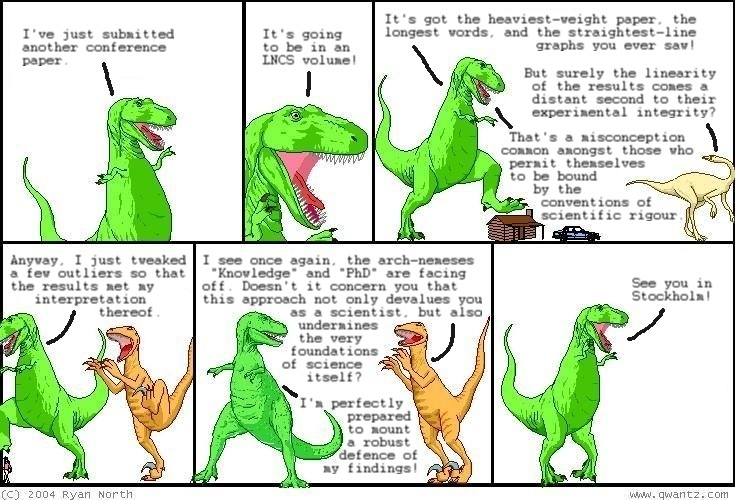 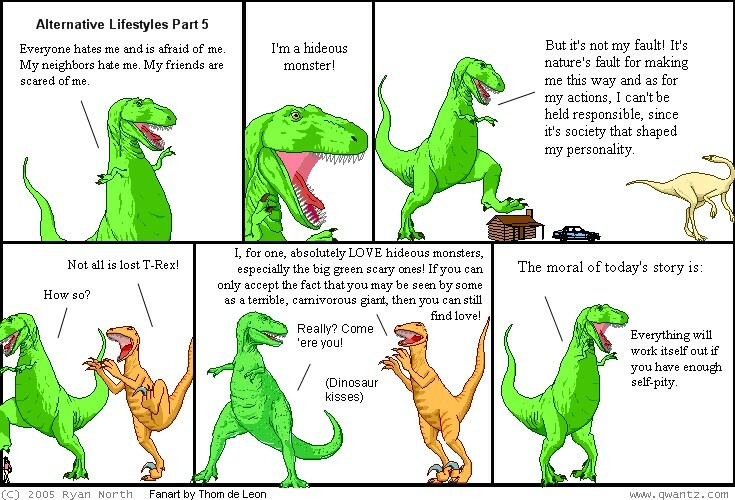 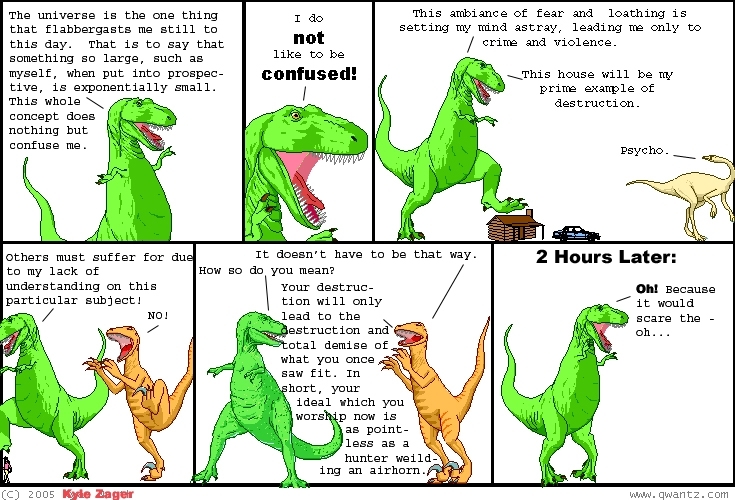 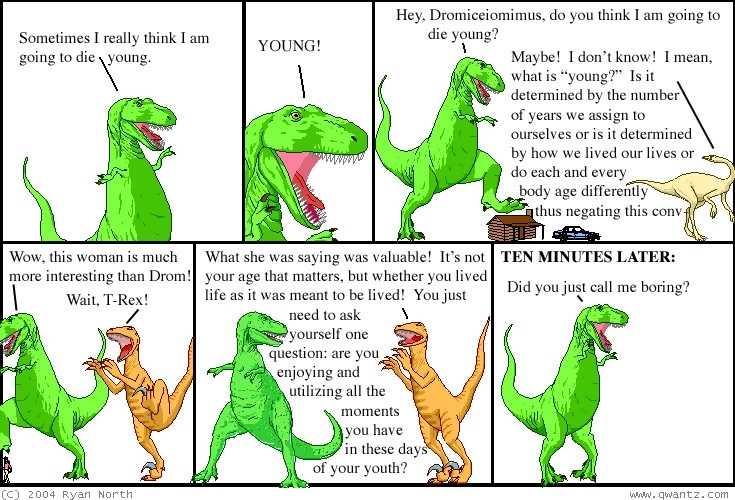 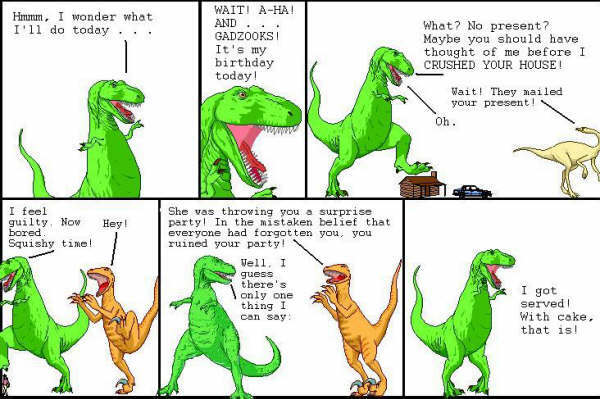 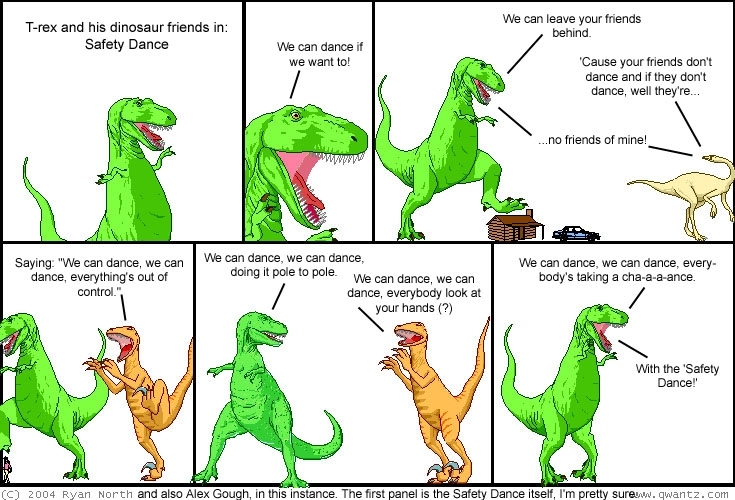 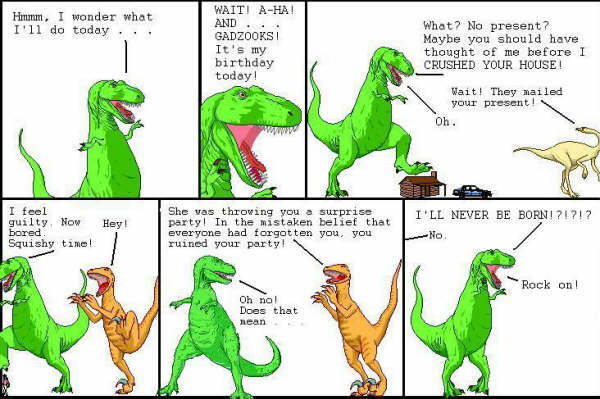 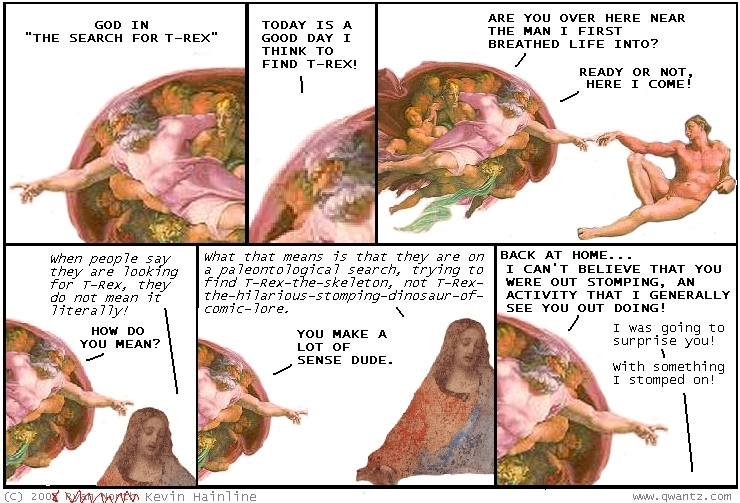 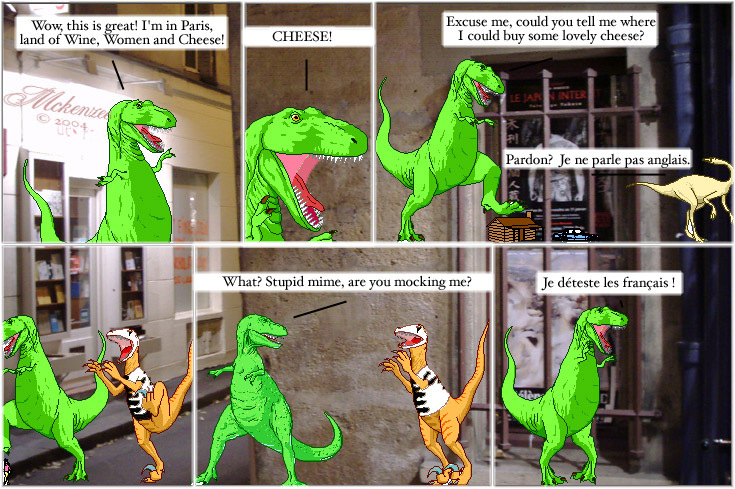 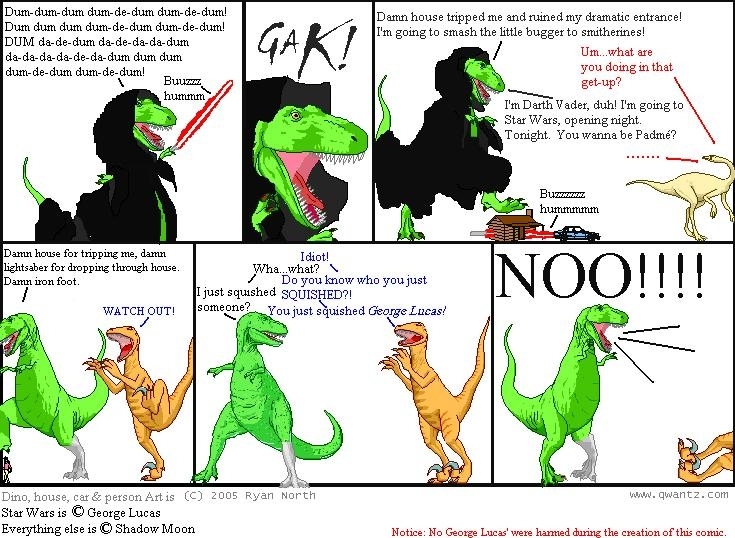 a panel is taken from one randomly-chosen dinosaur comic, combined with panels from 5 other random dinosaur comics, combined with a random footer, and the result is surreal hilarity. 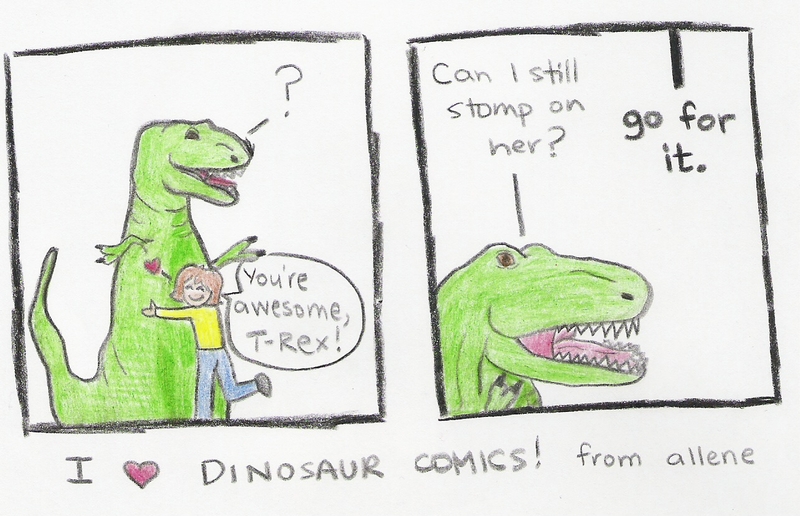 updated every minute with a new comic! 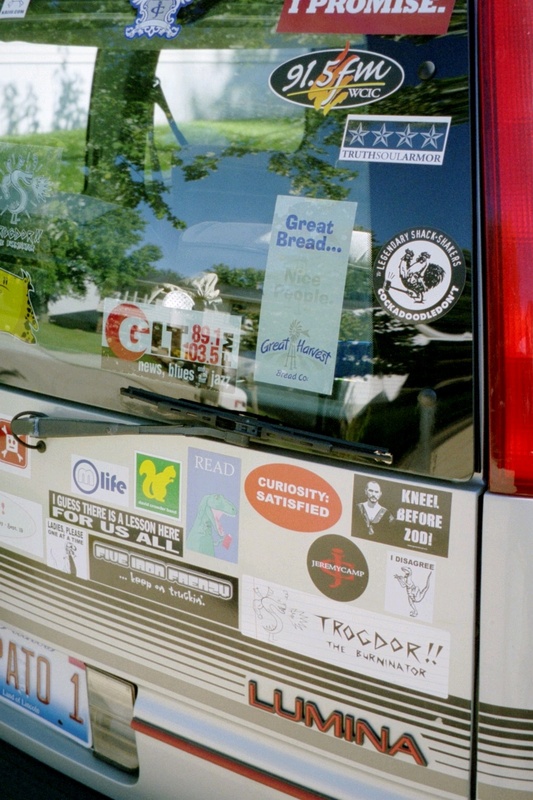 some favourites are listed here on the messageboard. 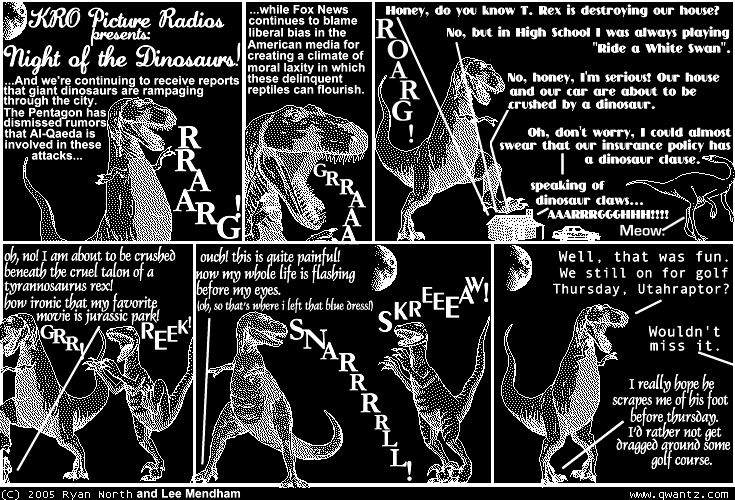 Chris Noessel has put together a very cool news-reading site called NewsRex! 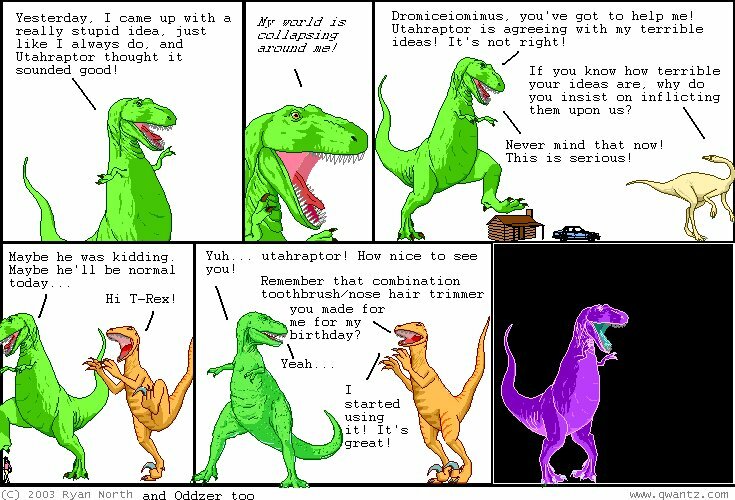 It gets the latest headlines from Reuters in 8 different categories, and presents these stories in Dinosaur Comics form. 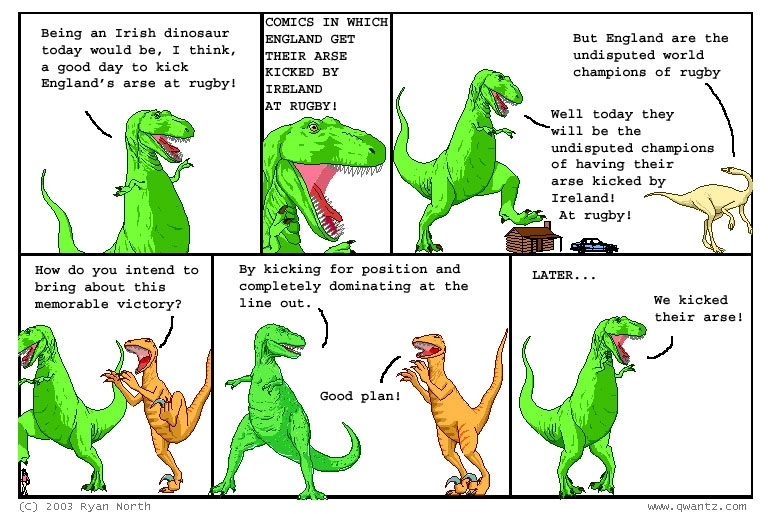 This is brilliant. Do you have trouble keeping up with international news because it's always presented in a non-comics format? 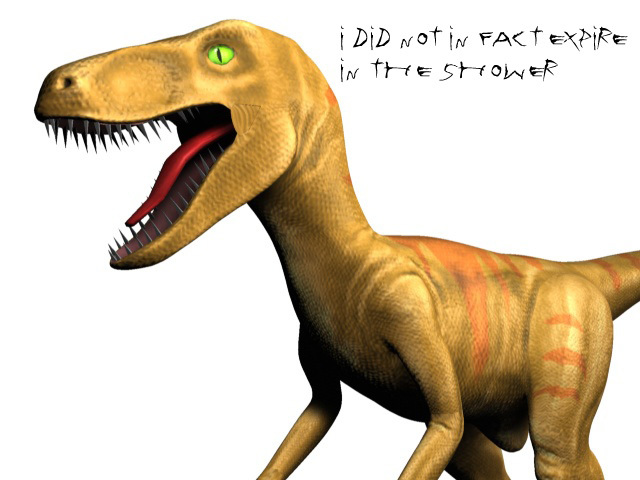 Not anymore you don't. 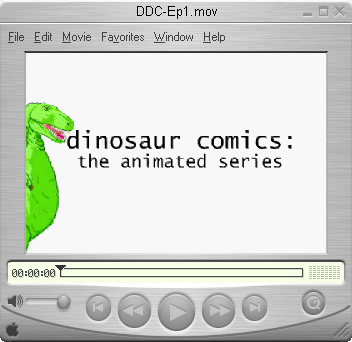 Matthew Fickett wrote a great Dinosaur Comics Widget for the Max OS 10 Dashboard, which "displays the first panel of the current Dinosaur Comic. 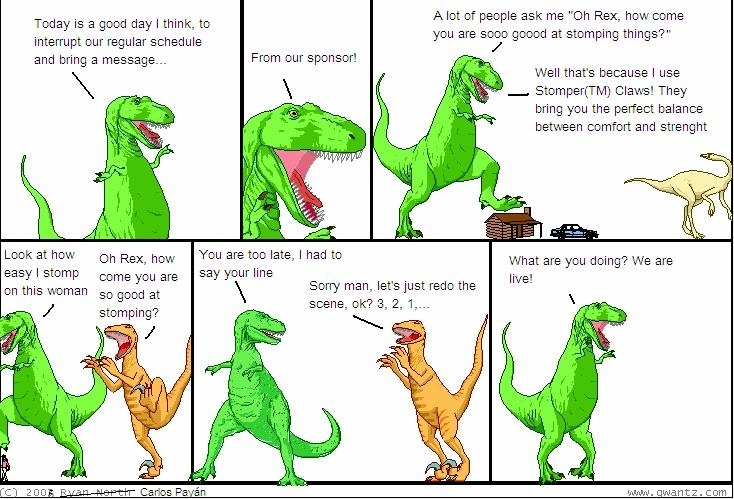 Now, at a single keystroke or mouse move, you can see what the state of the Rex is (and if it's lit up bright, I know it's time to click on it and see the new one)." 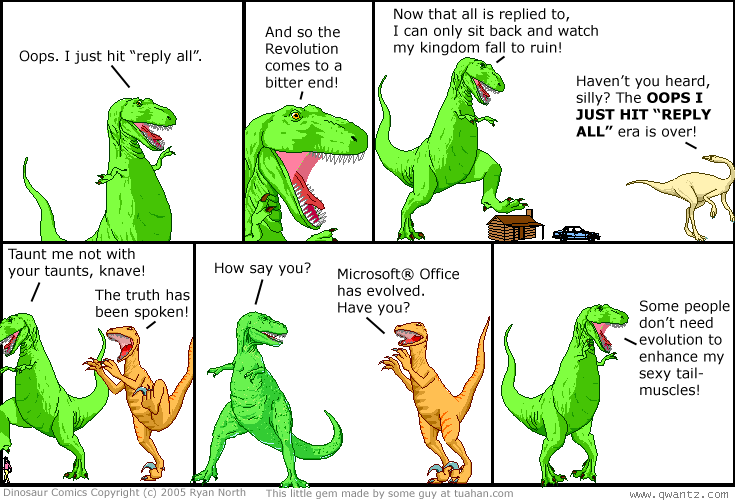 If you've got a Mac, you'll probably like this! leonard richardson brings the t-rex, utahraptor, and dromiceiomimus (and adorable baby versions!) 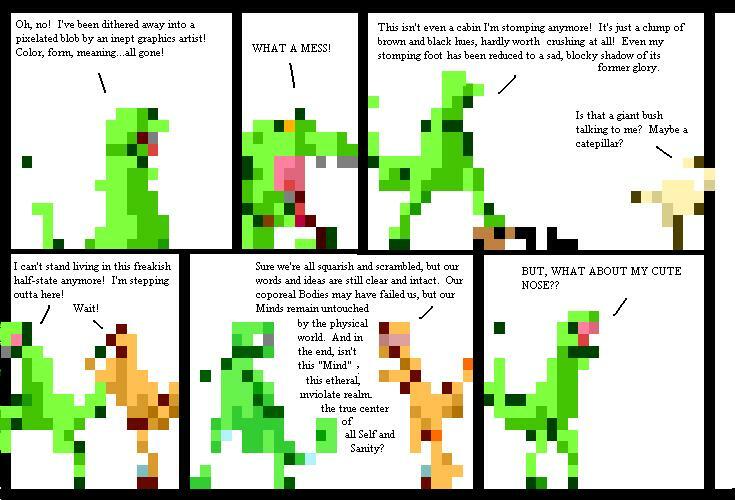 to the extremely addictive, text-based, single-player game of nethack. 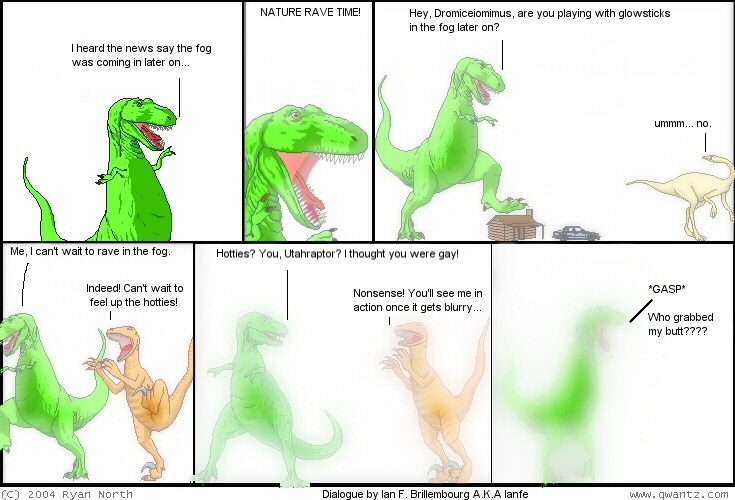 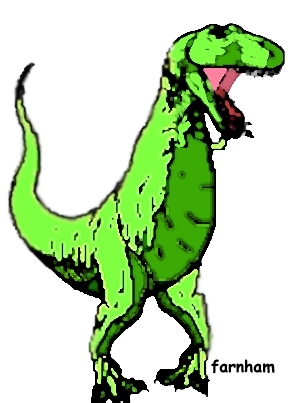 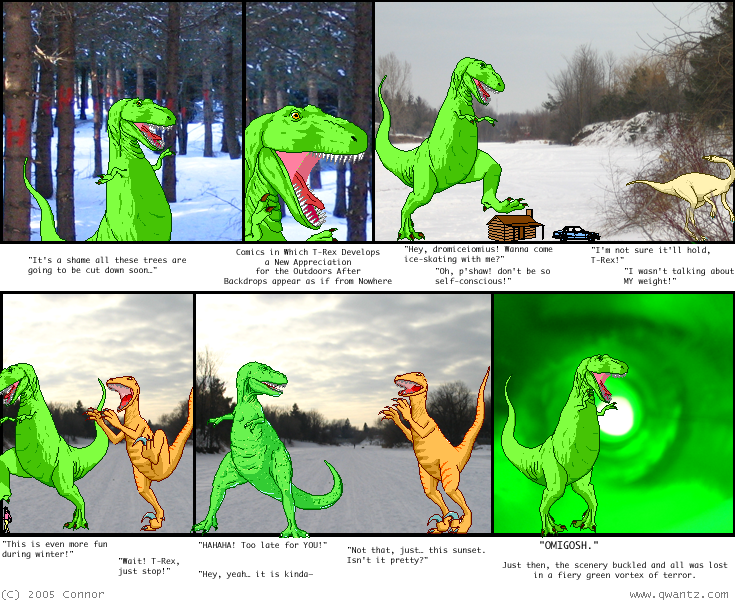 Jeff Mumm, who does a comic called Obscured By Species, made a Dinosaur Comic game. Sweet! 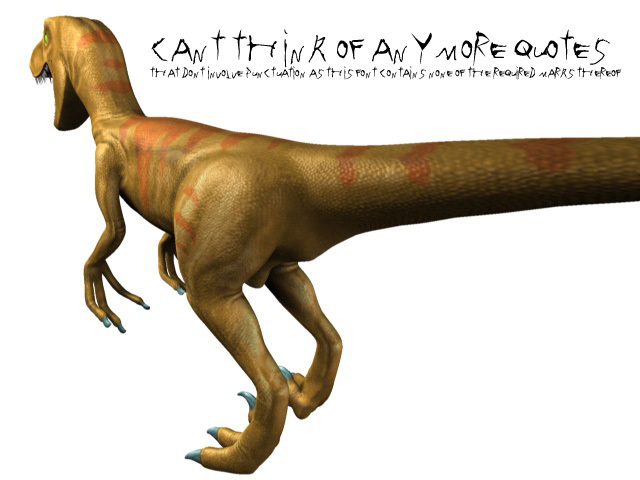 You can play it under Windows and you can check it out here! 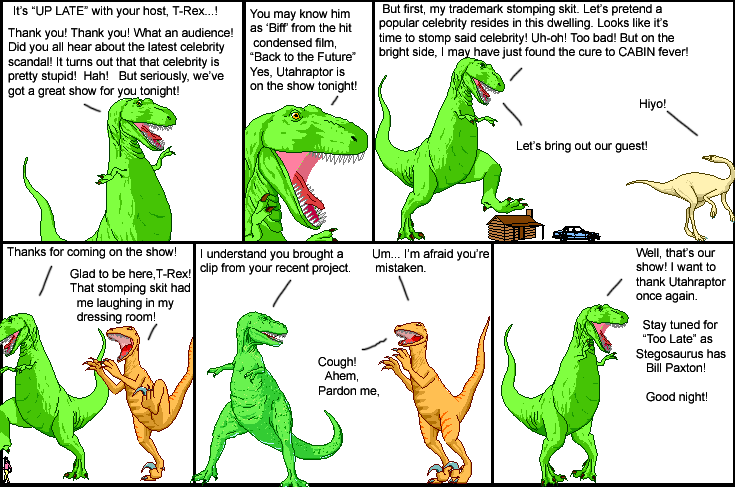 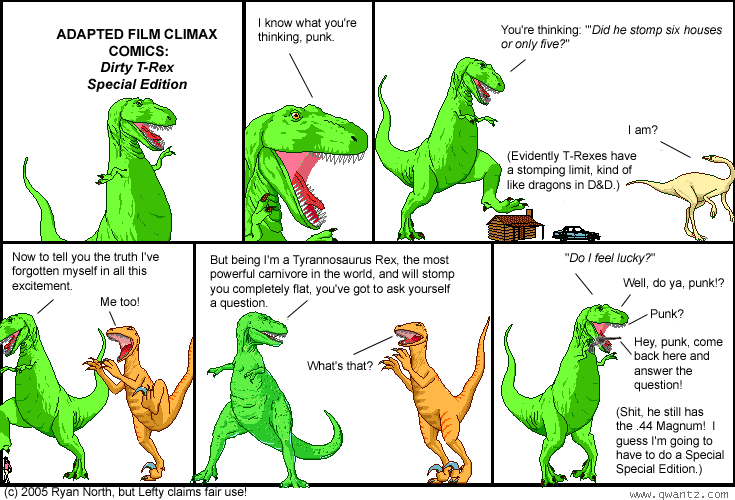 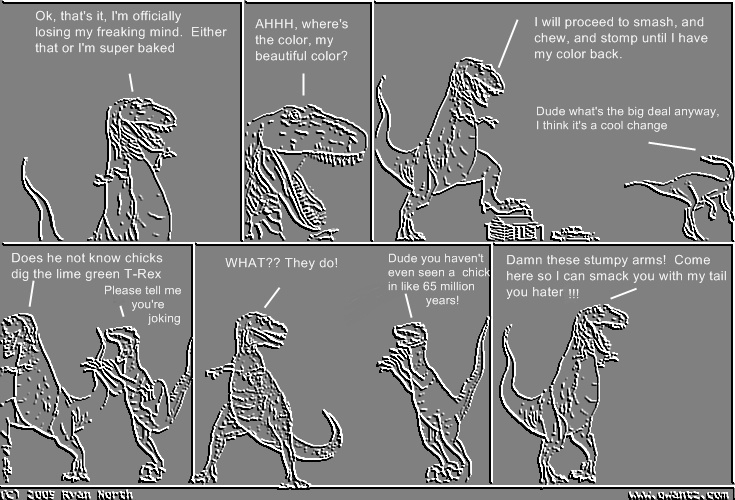 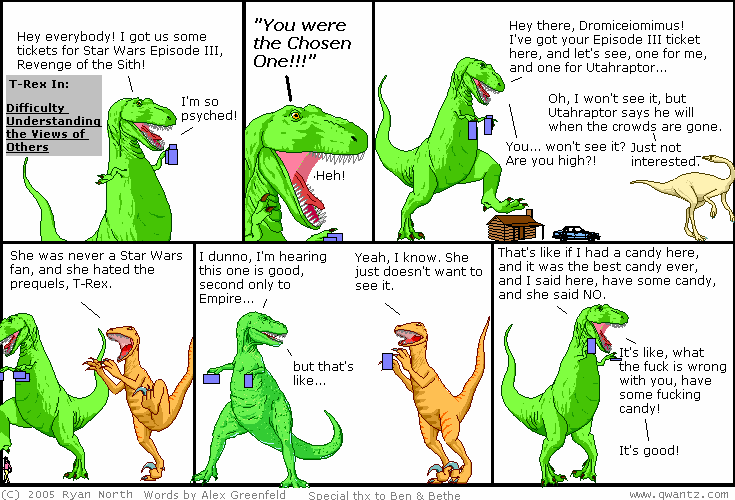 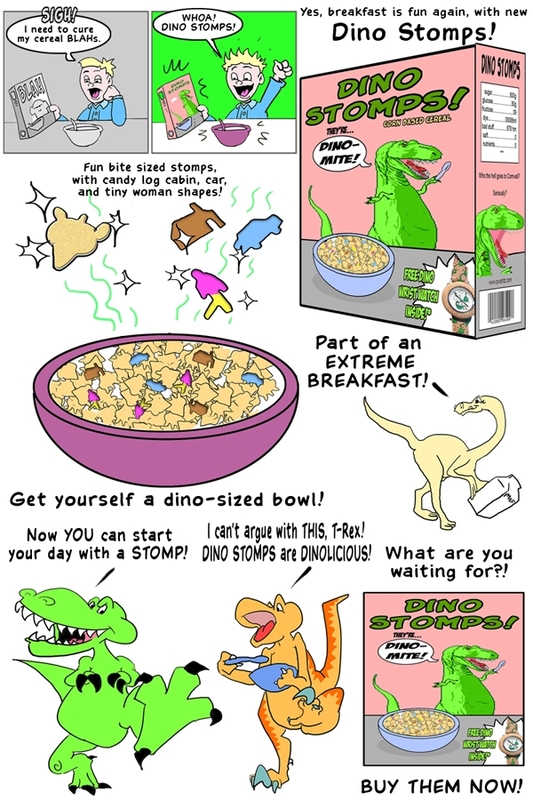 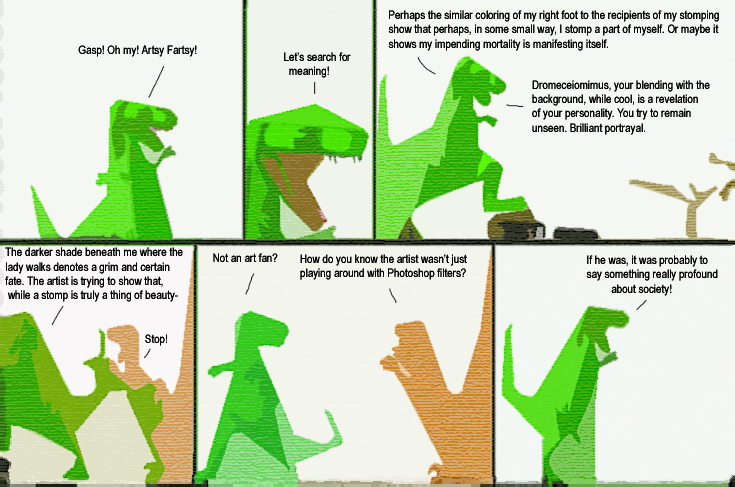 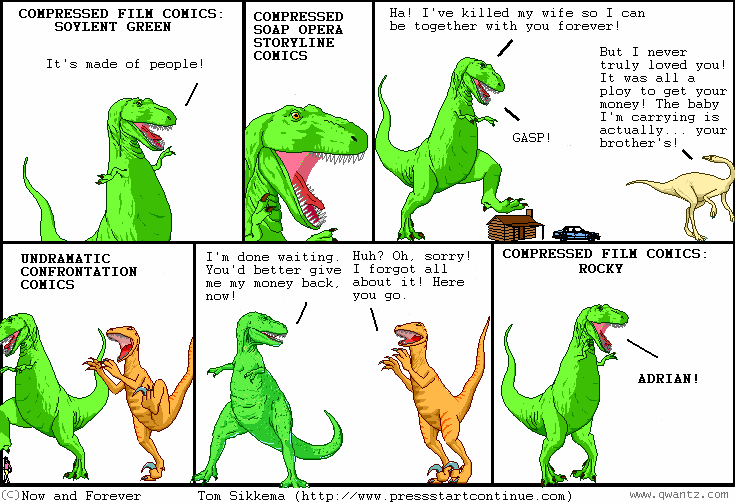 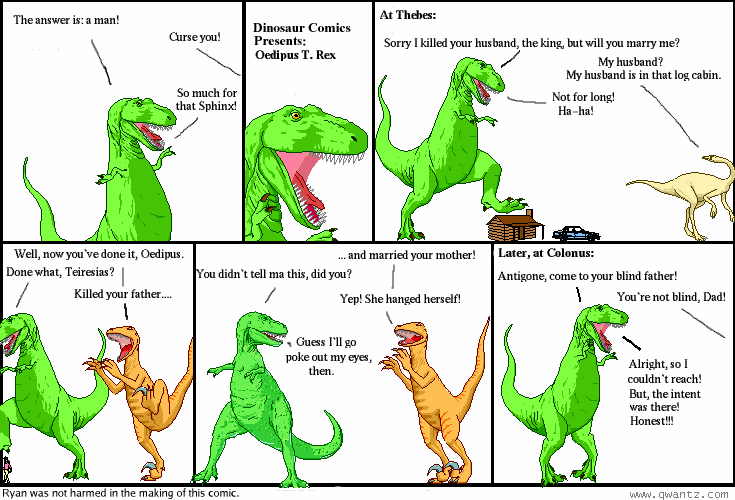 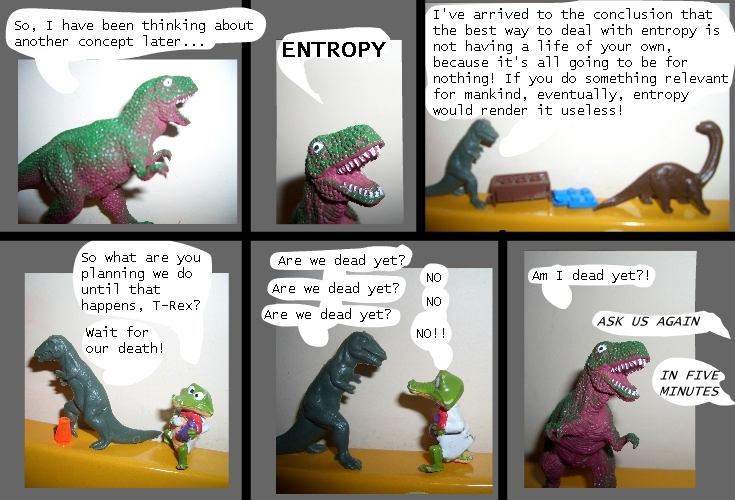 dinosaur comics: the animated series - episode one by jason eppink! 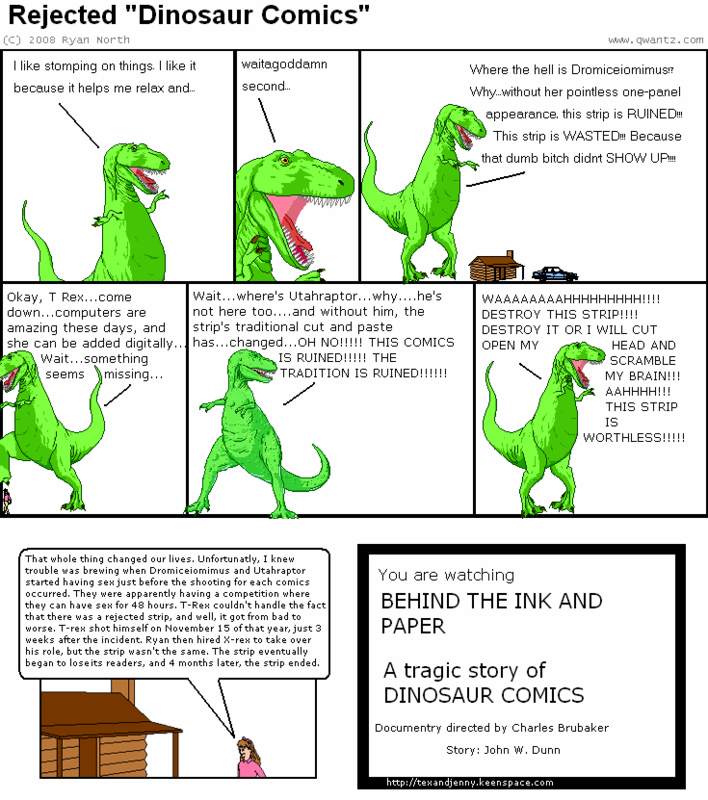 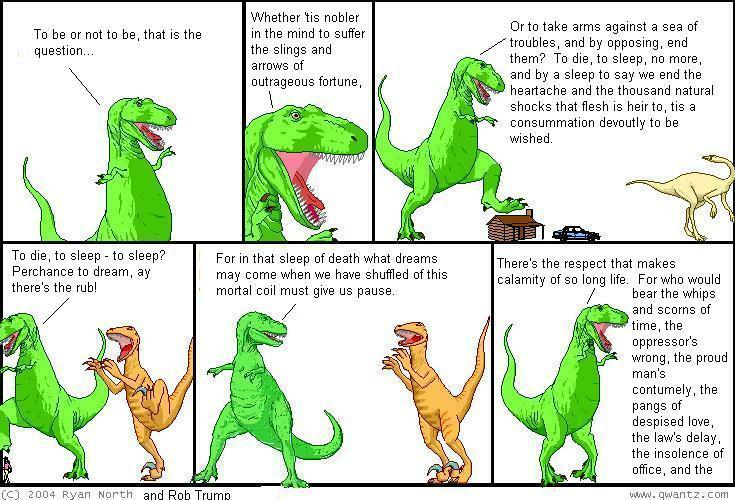 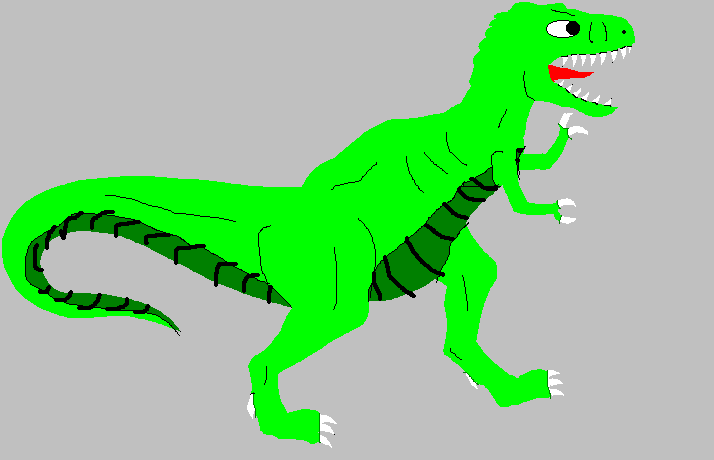 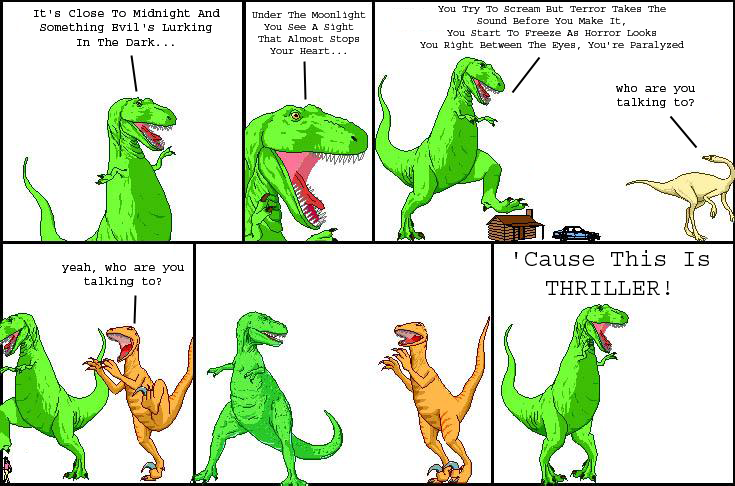 if you ever wondered what the dino comics animated series would look like, this might help you sleep at night! pretty much the best video ever. 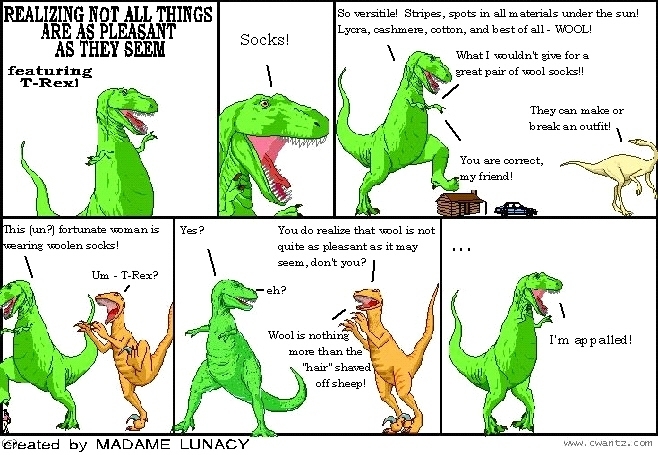 singing sock puppets talk about things that don't exist! 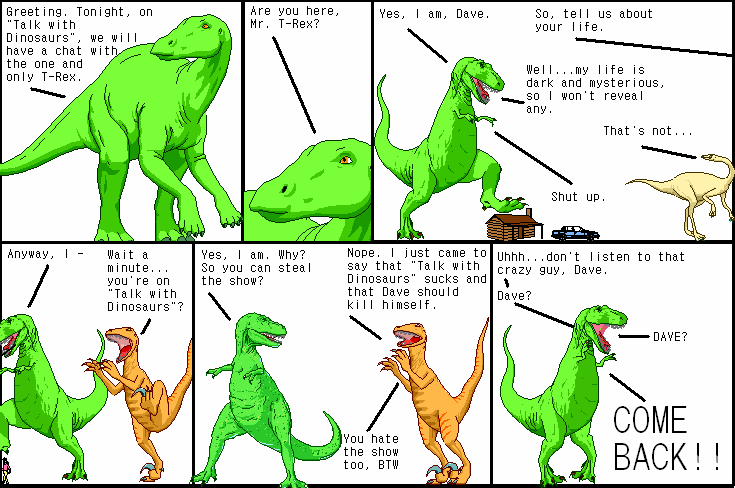 as seen on malibu's randumb show. 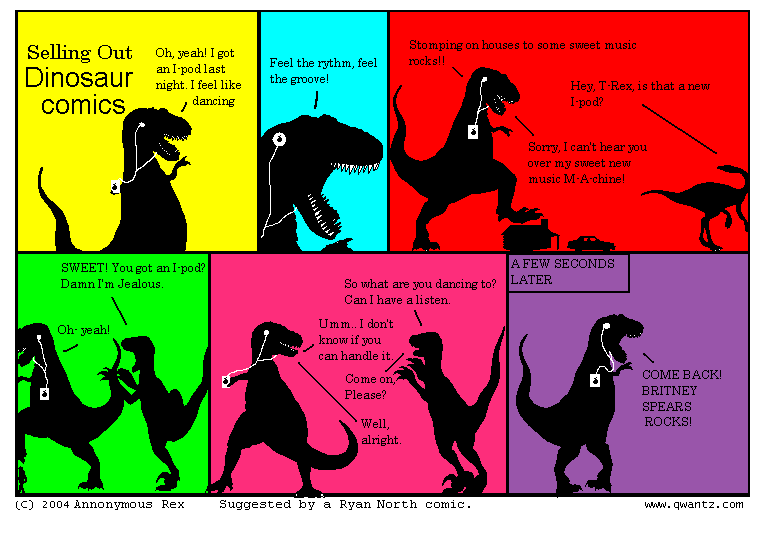 here's the mp3 and here's the lyrics! 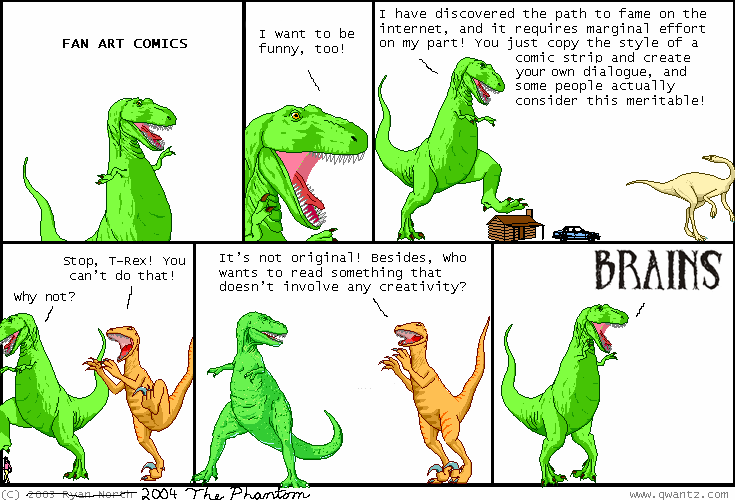 jason applies the dinosaur comics concept to video! 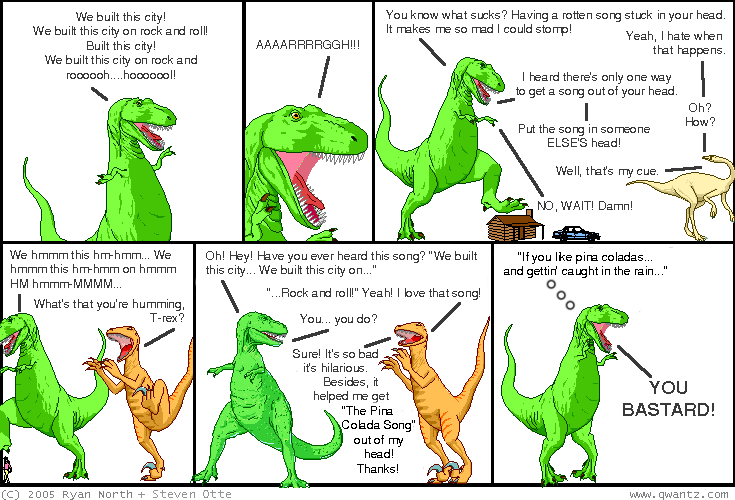 if you wanted to make your OWN audio track to this, that would be pretty cool! 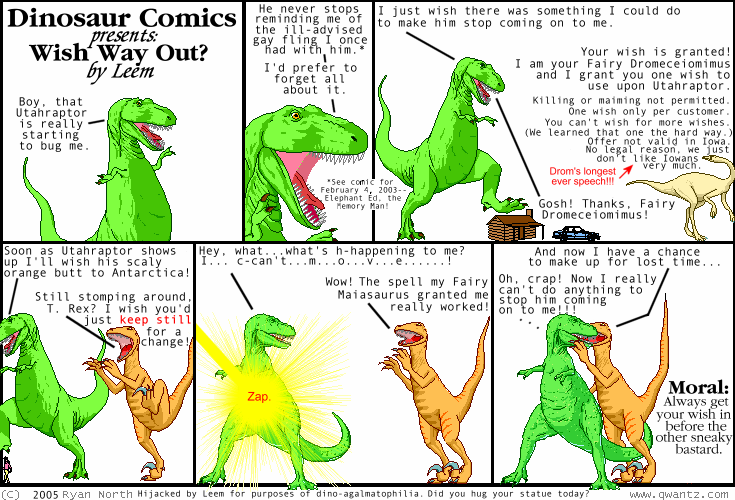 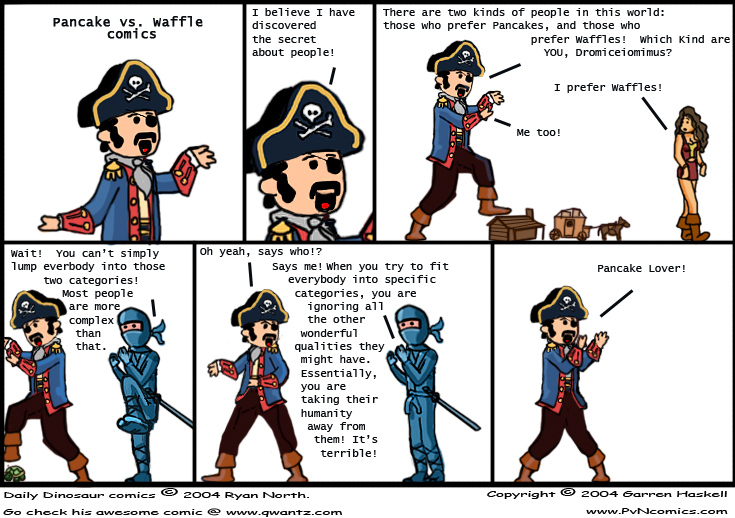 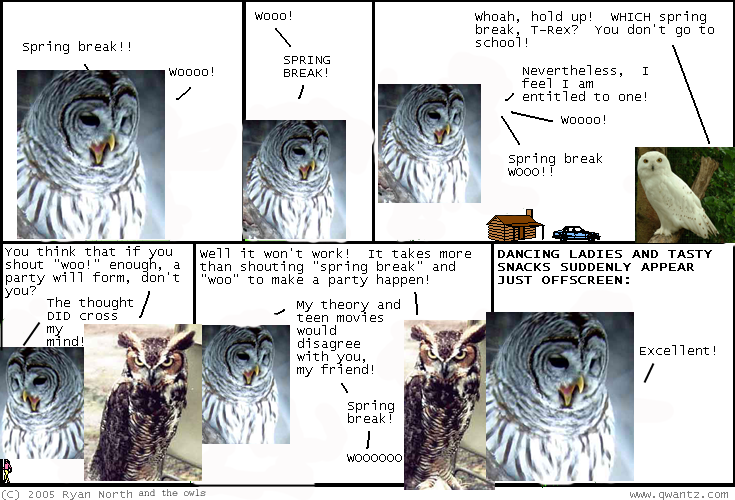 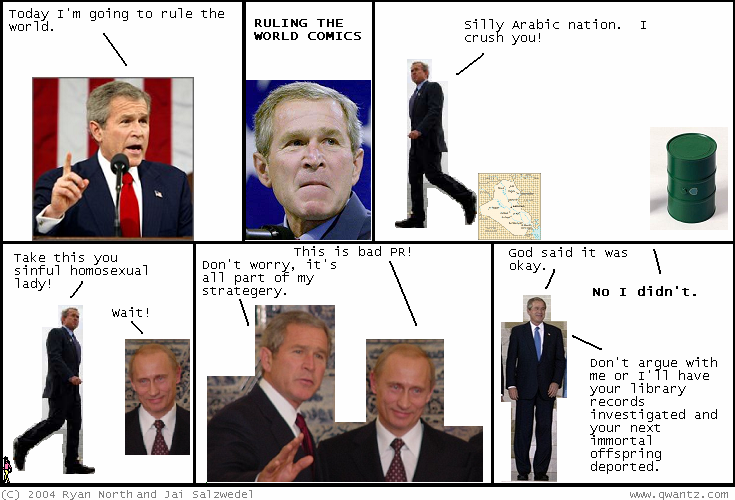 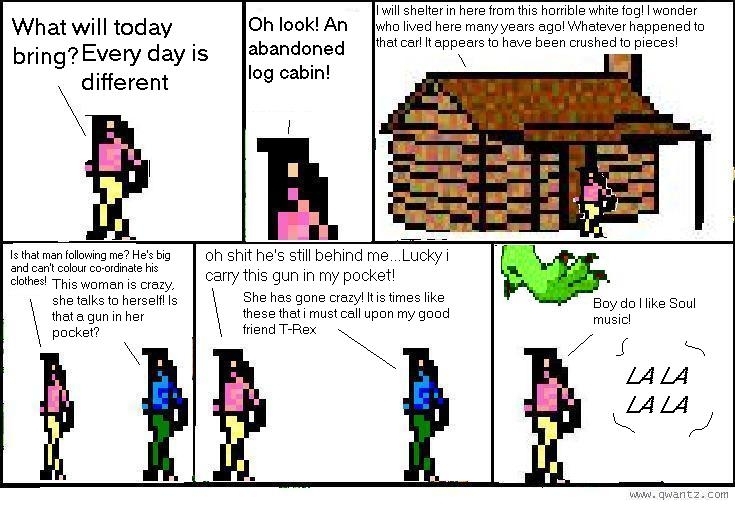 based on these guest comics by zole! 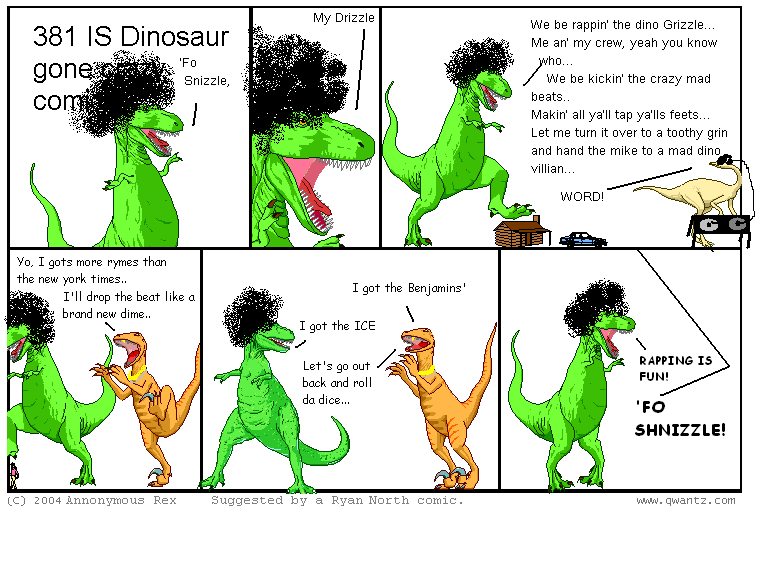 also available: a crazy euro-funk remix! 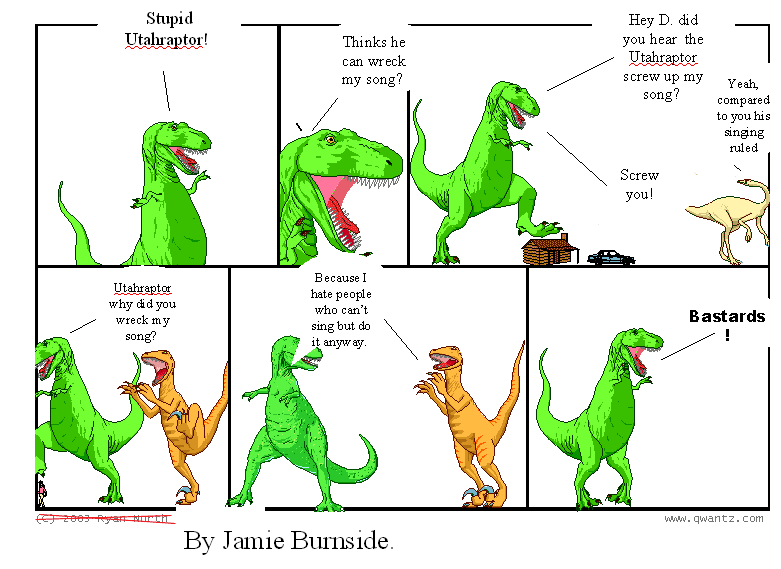 Jimmy has also been working on a ska version of this song. 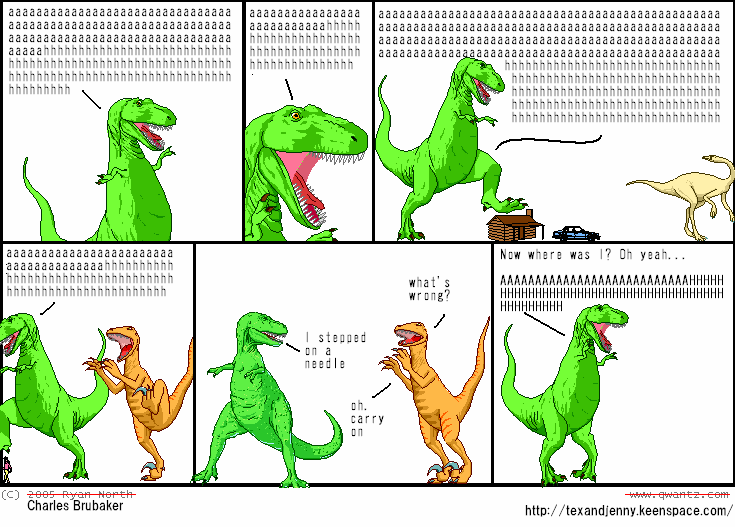 Here is a MIDI of it. 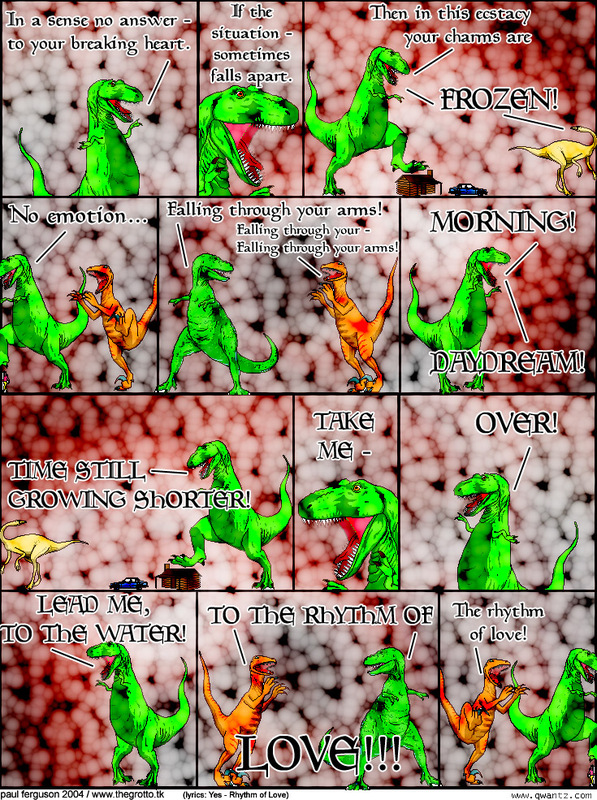 It totally sounds like the theme song to a dino comics sidescrolling platform game from the early nineties! The Stomping Song, by Snyder. If you like your stomping beats to be electronic and fresh, this is totally the song for you! 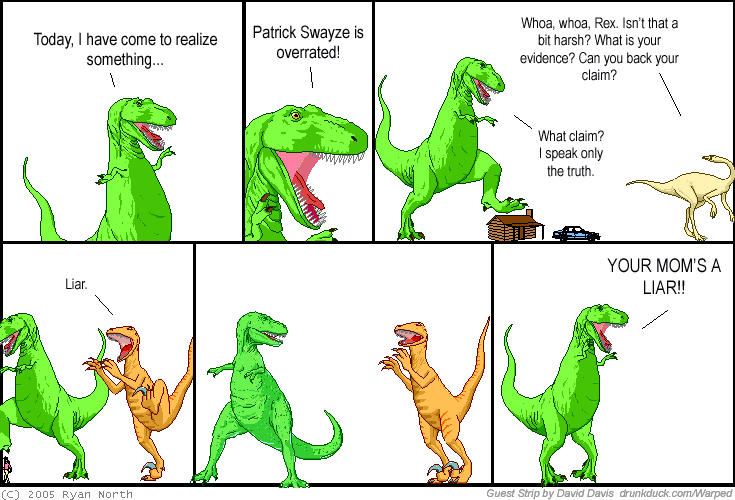 My Truth, The Right Truth, by Snyder. 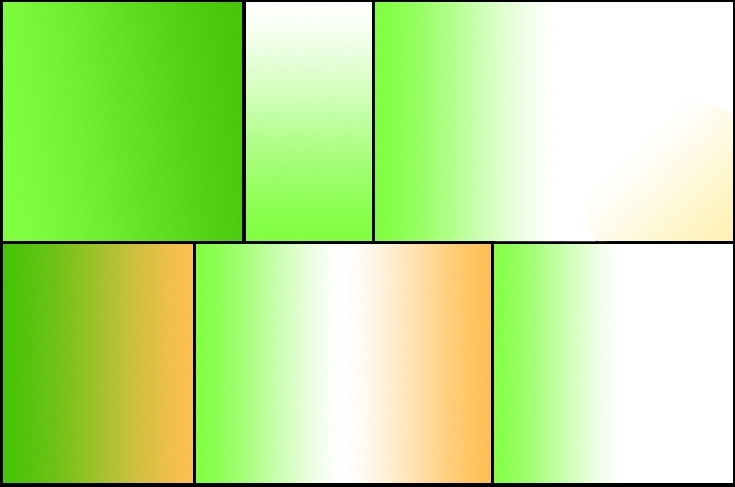 You might want to use this blank template put together by Ciaran! duck on the menu tonight by jon g.
super hidden ninja skillz by matt p.
pervy words by matt p.
evading satan by bob b.
hand-painted watercolour t-rex and utahraptor! by tommy dumouchelle. 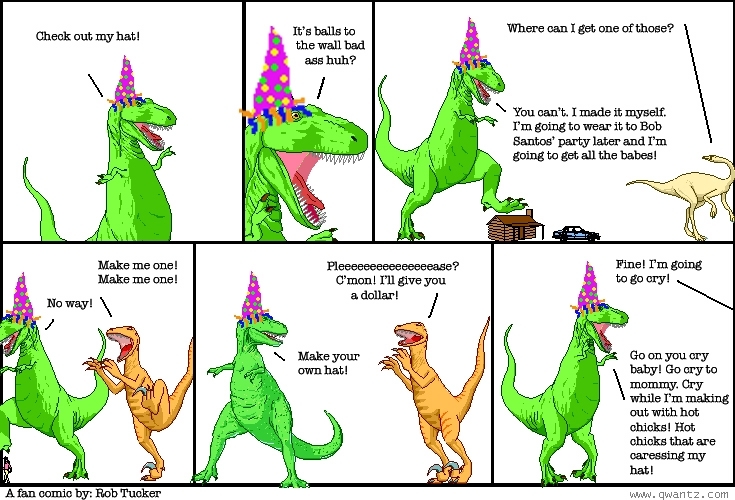 i hung it up on my wall! 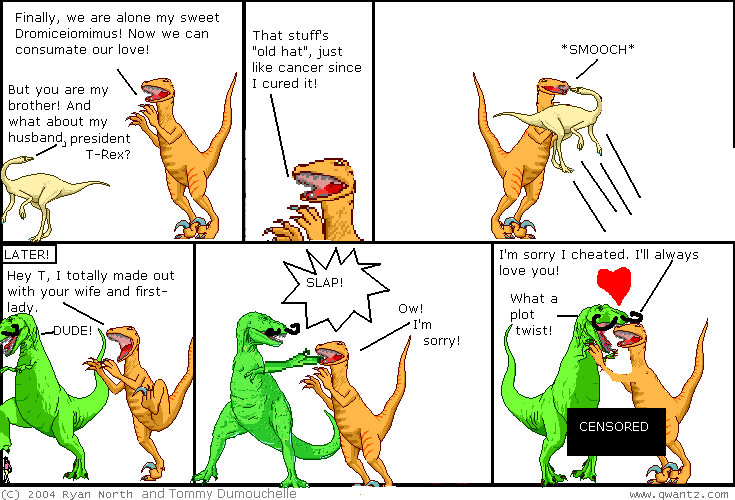 it's sweet. 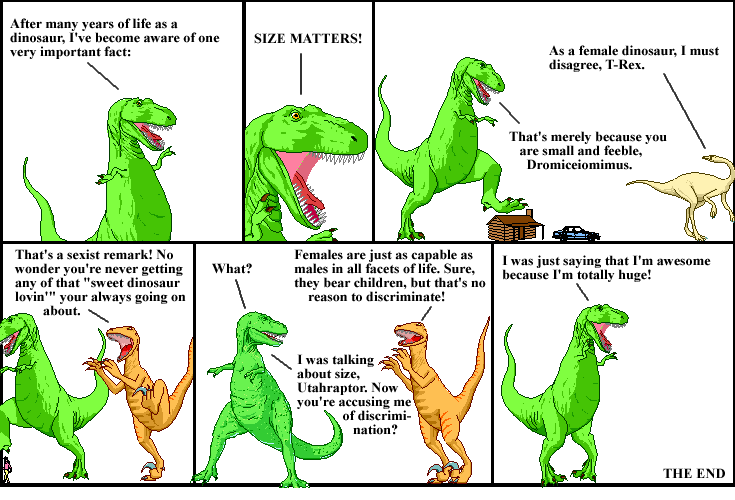 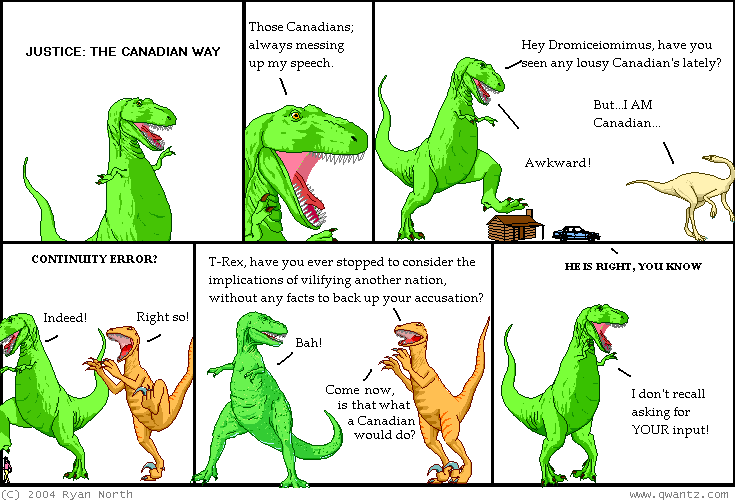 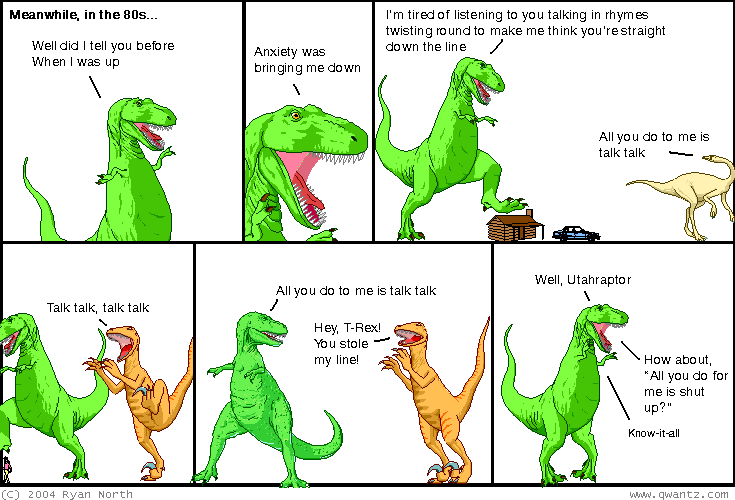 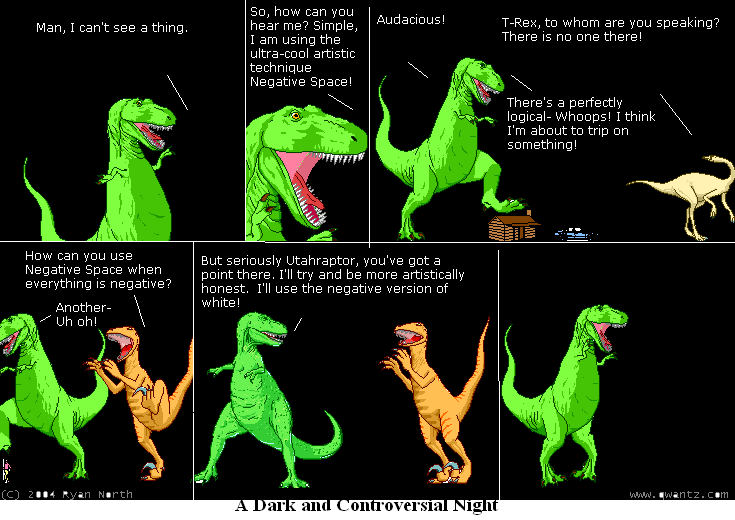 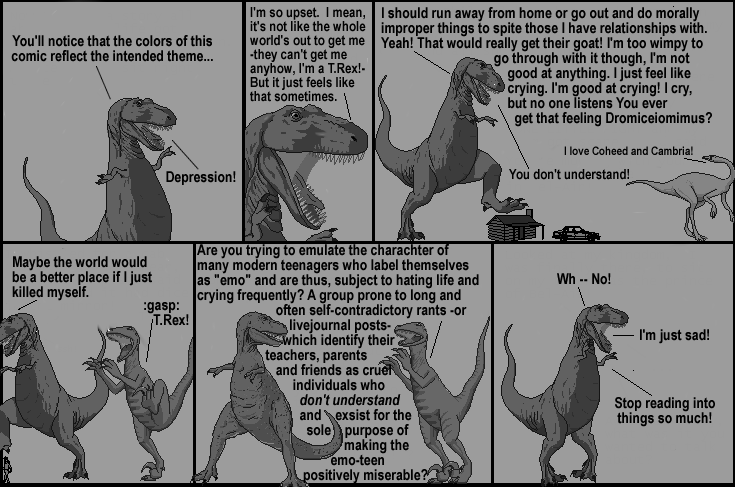 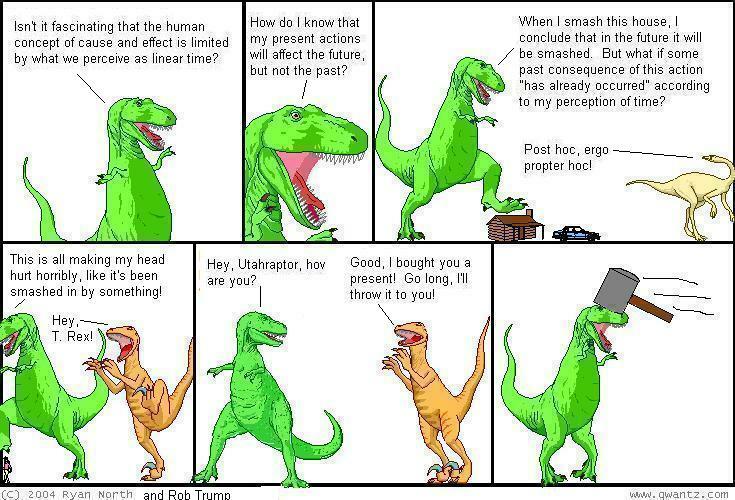 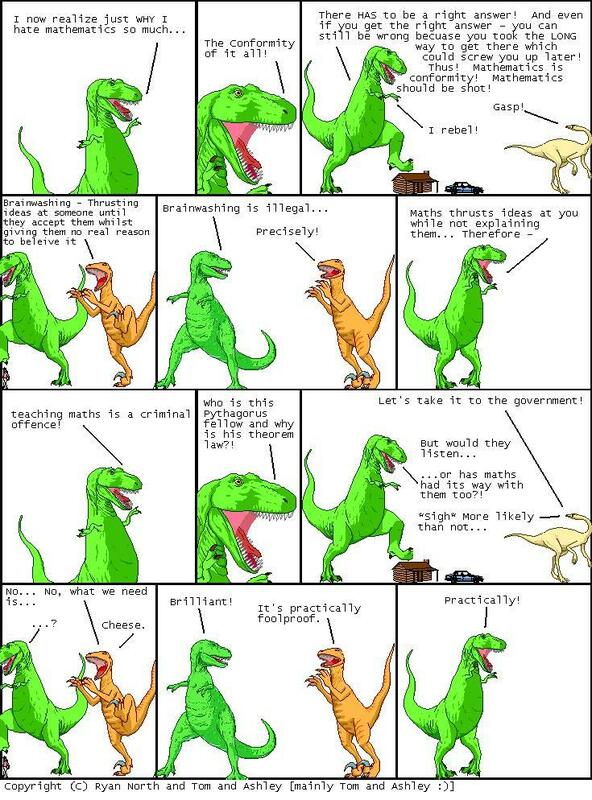 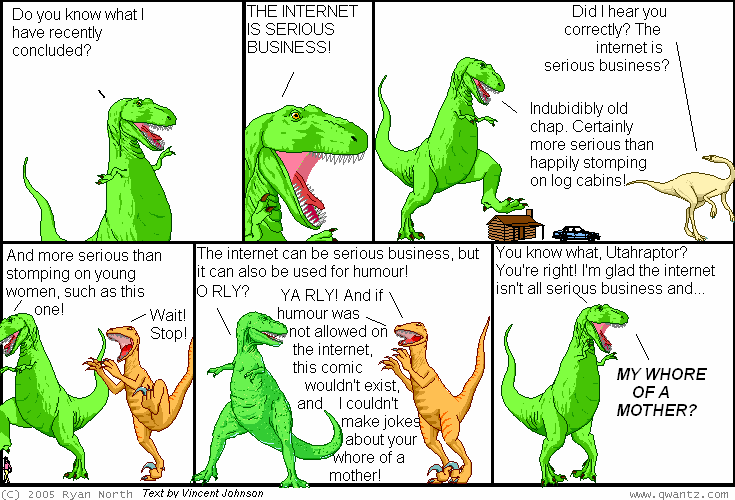 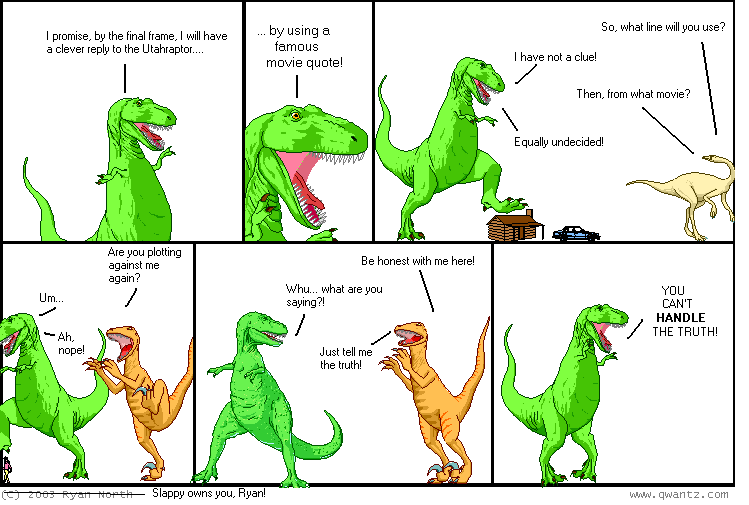 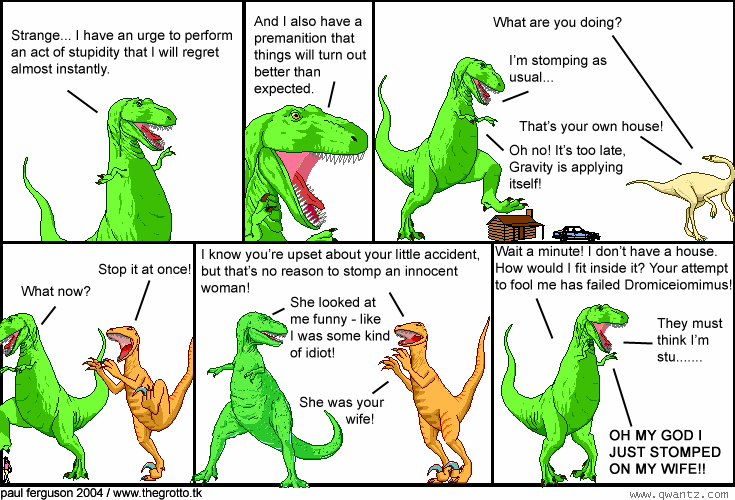 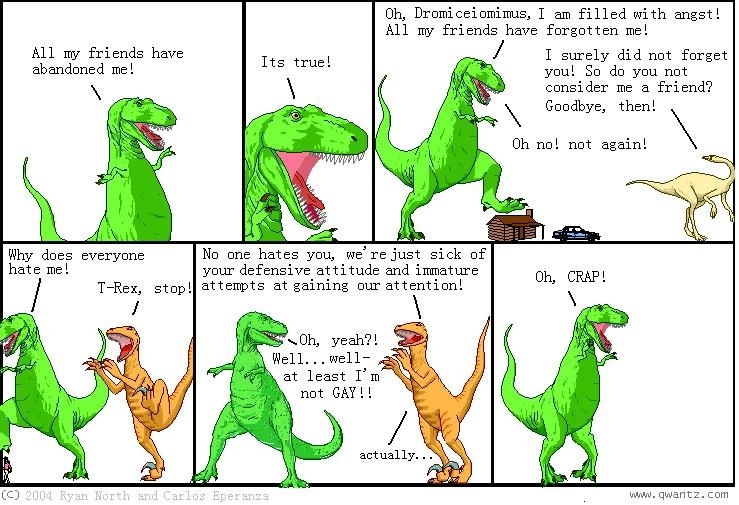 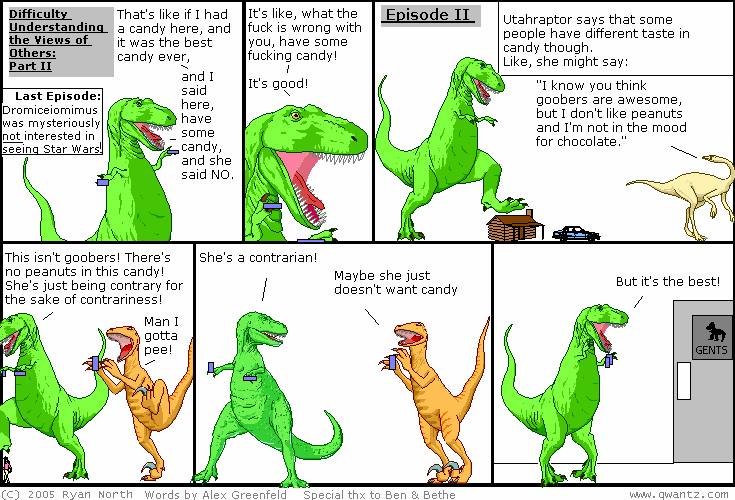 the utahraptor has just lost an argument. 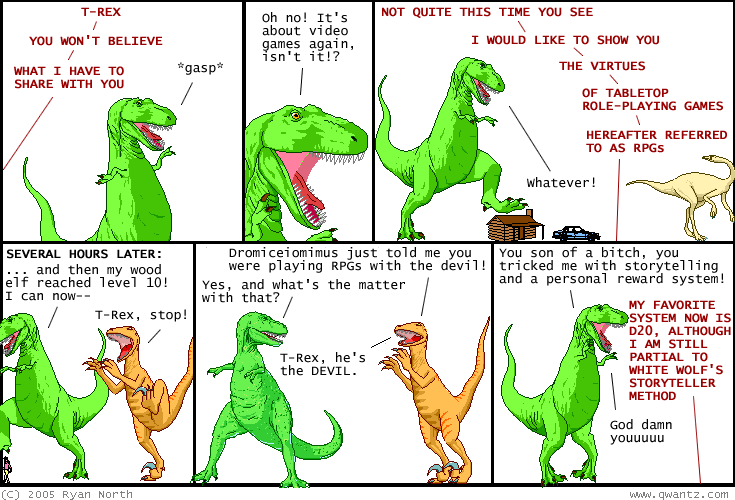 t-rex and triceratops! 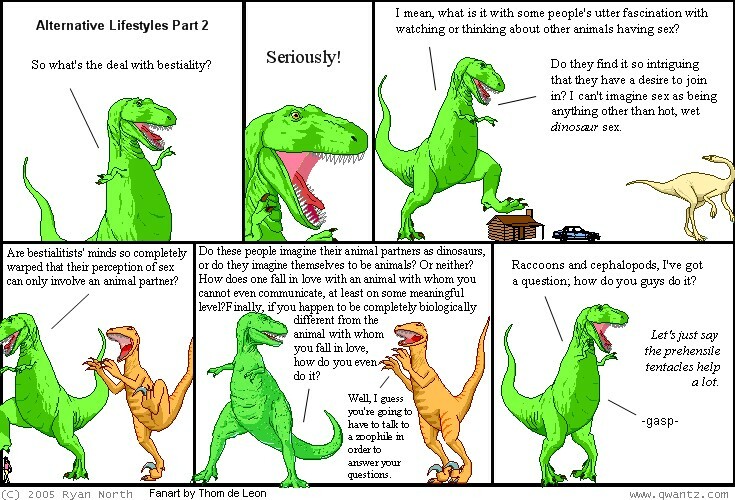 by wendy bateman. 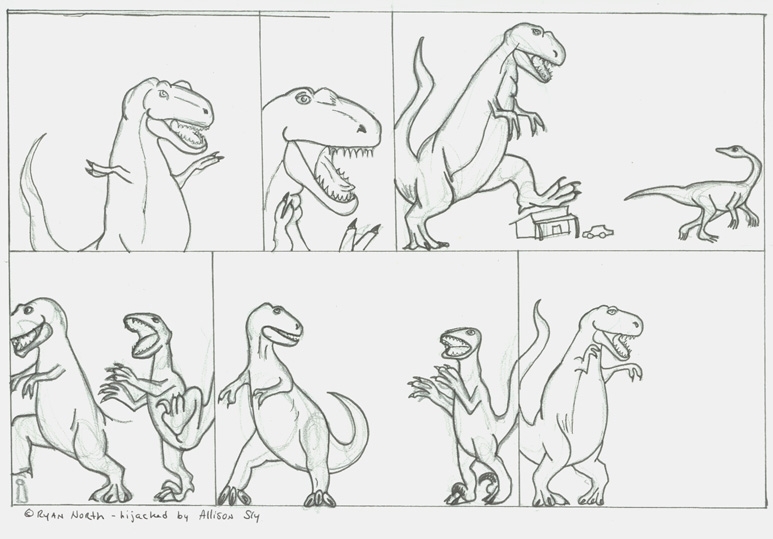 i don't know what they're doing in the drawing but it makes me blush! 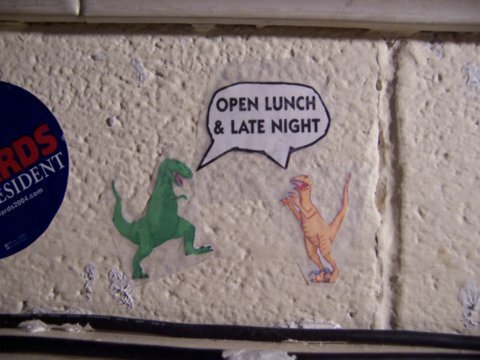 i'm sorry it didn't photograph better, but it was laminated. 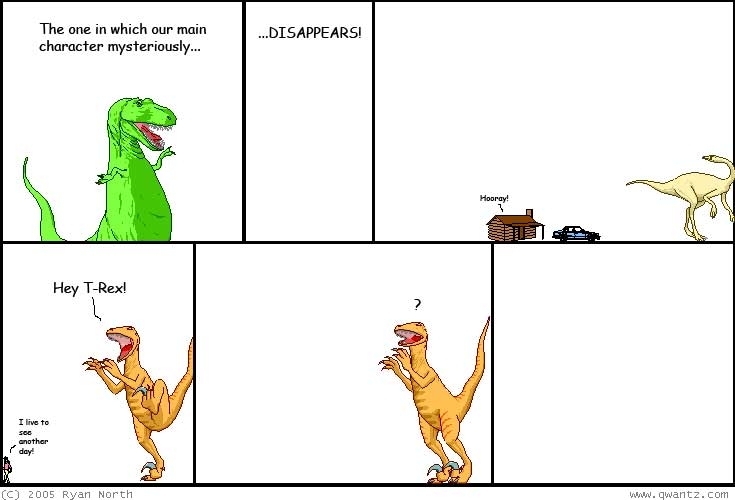 there is a lot of detail you can't see! 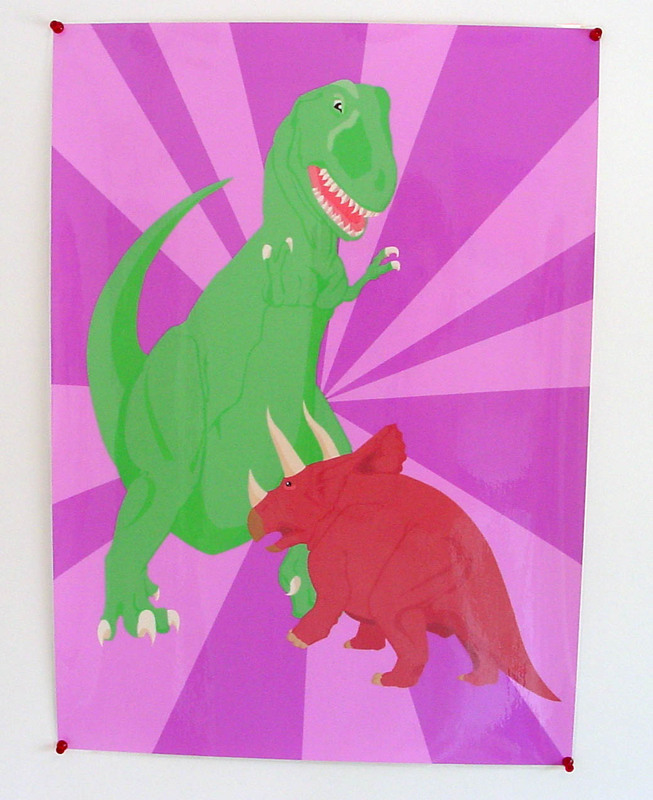 i put this up on my wall too - it's giant! 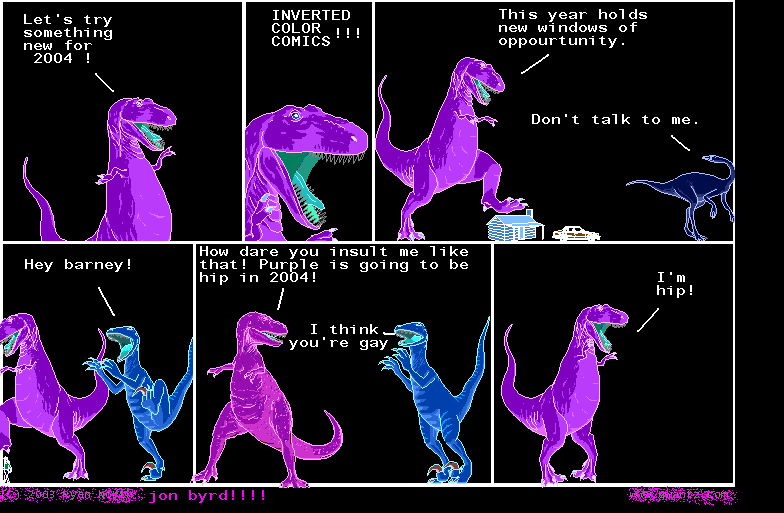 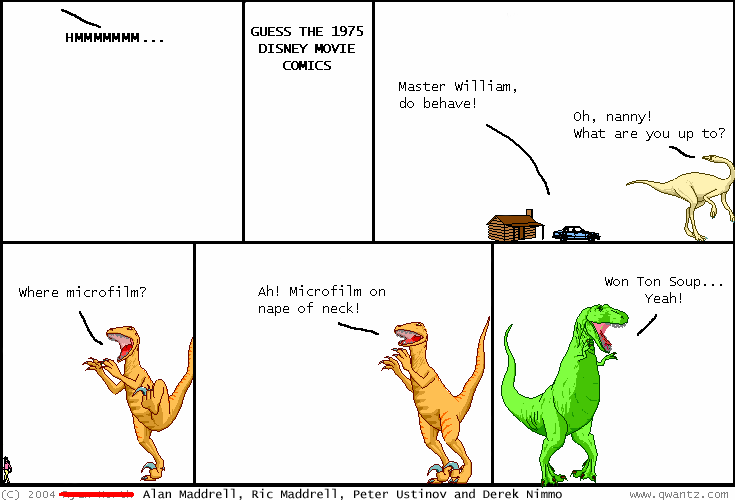 dinosaur comics kids by justin pierce! did you see what rebecca did to her wall? 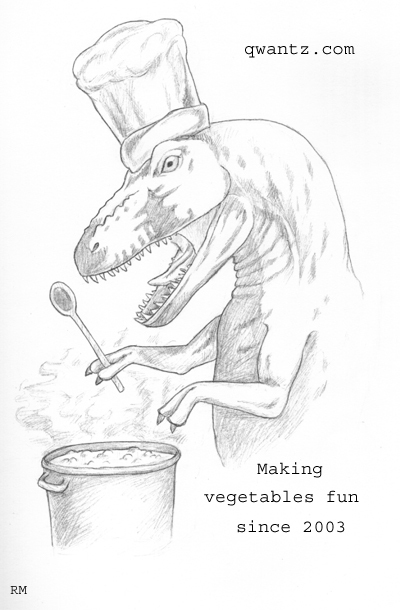 i heard rosemary was a great cook! 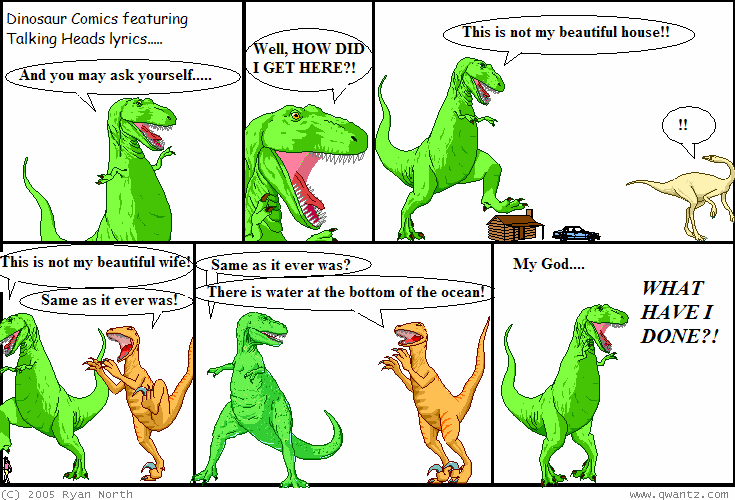 i heard zefiel plays the washboard! 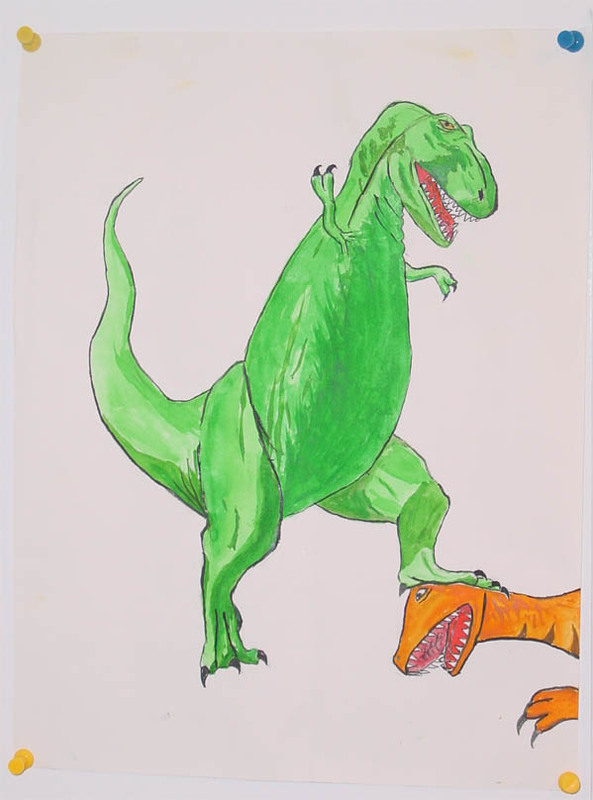 der osterbiber works those watercolour pencils! 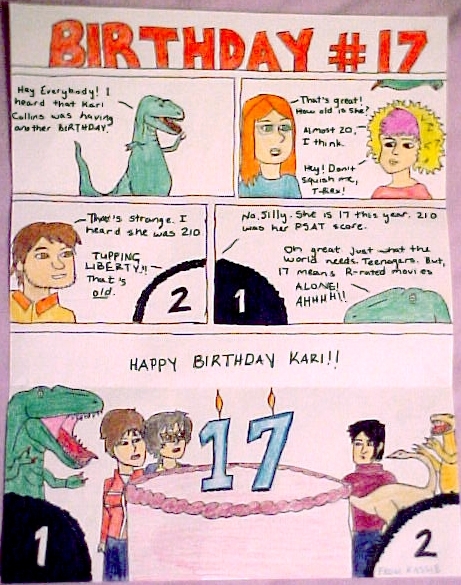 kari's birthday card: a grand crossover between dinosaur comics, scary go round, and death to the extremist! 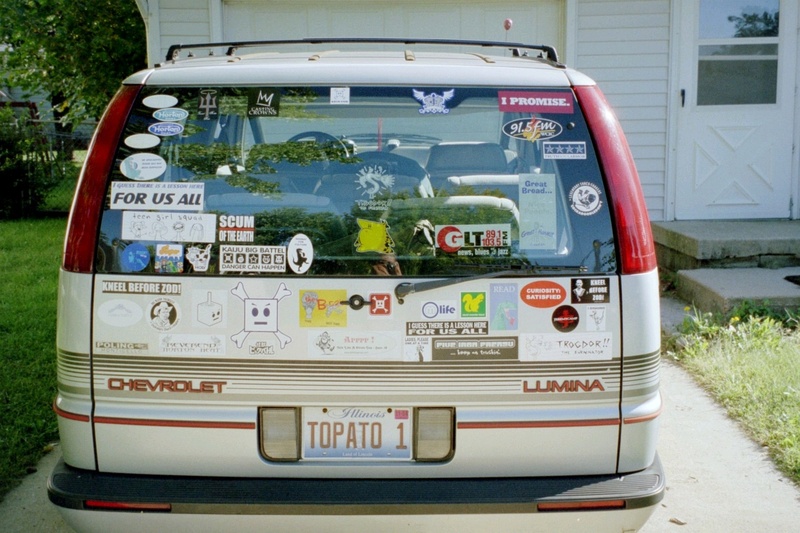 the topatomobile: troy babbs has not only achieved the best license plate ever, but gone and covered his van with all these sweet stickers! 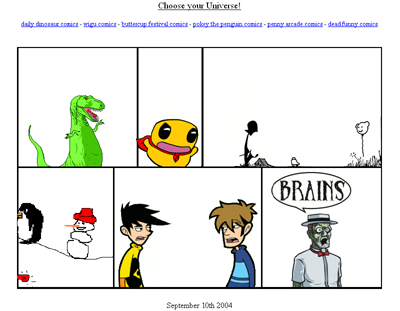 more pictures here and here and here. 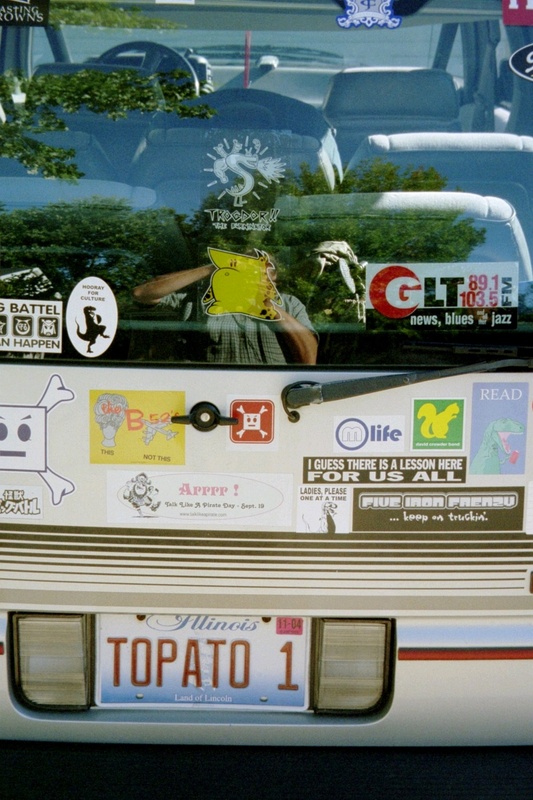 every sticker i ever made is there, i think! 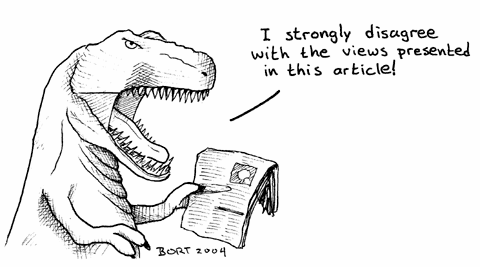 t-rex reading the paper, by dave bort! 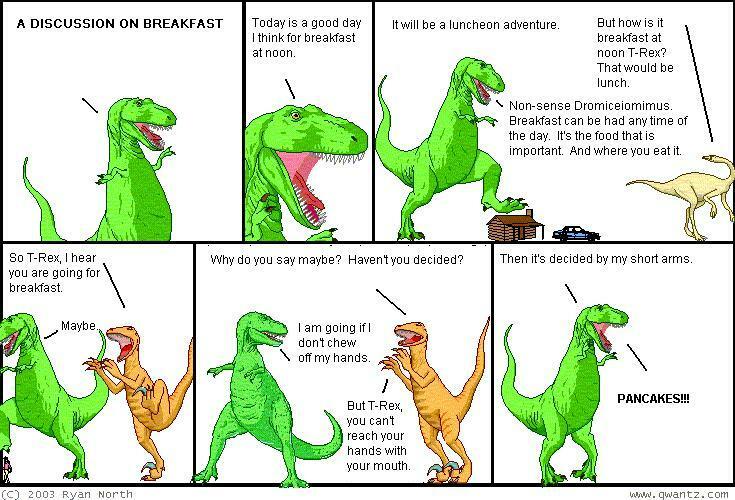 t-rex enjoying his morning, by dave bort! 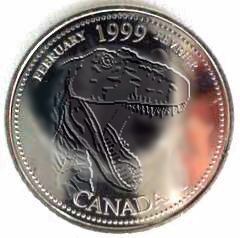 awesome canadian coinage by justin pierce! 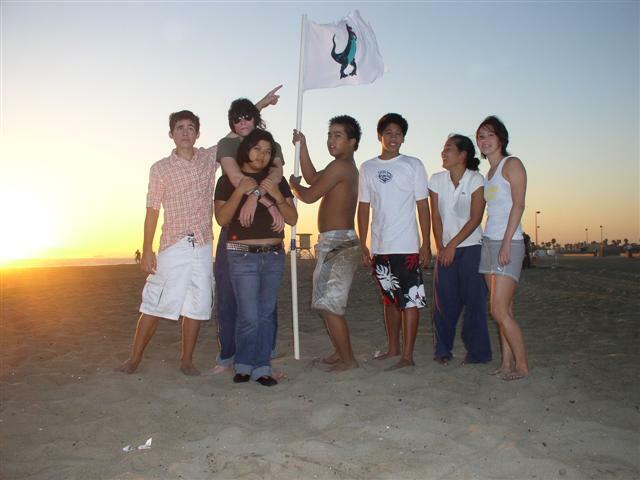 Seth D writes: "My friends and I had an end-of-summer bonfire a little ways back. 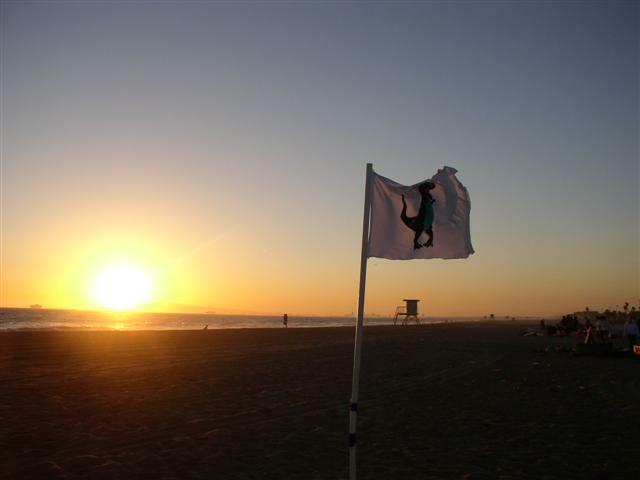 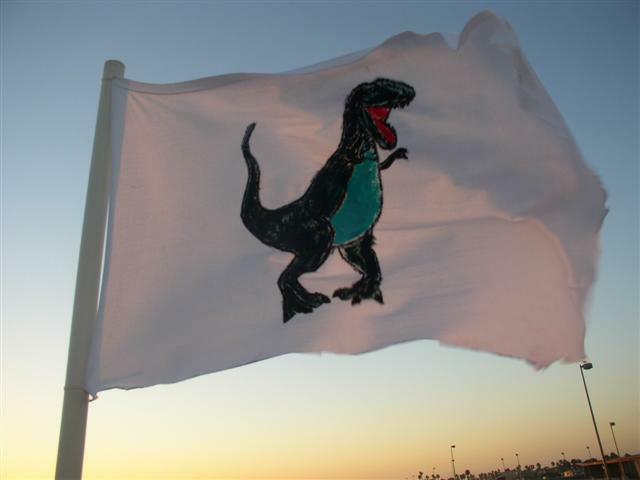 To locate each other on this wide stretch of beach, I created a T-Rex flag. 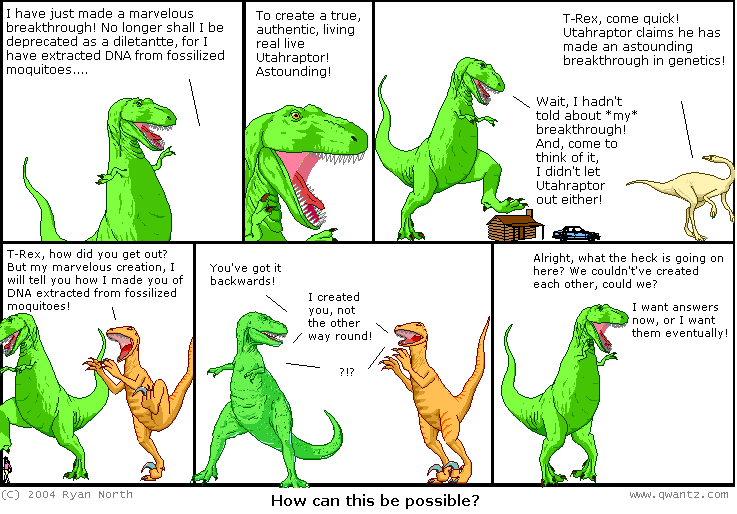 It united and inspired us all." 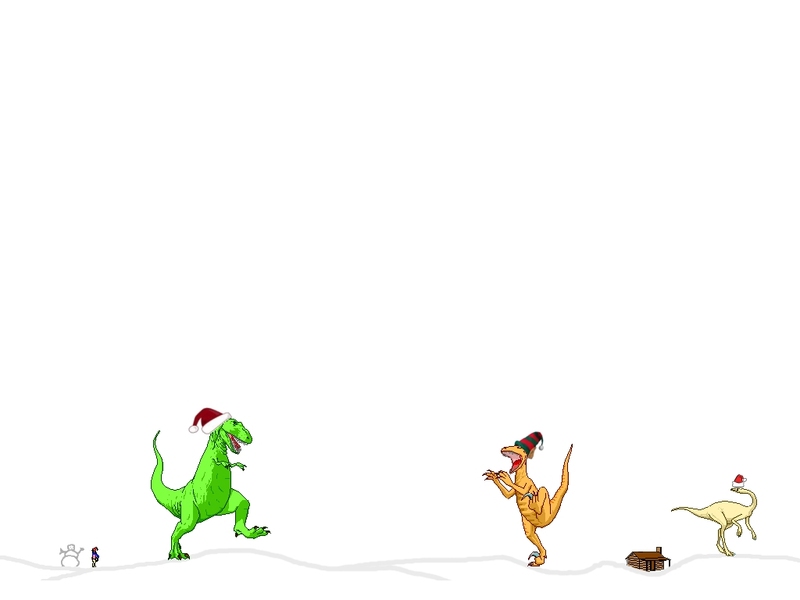 More pretty pictures here (a closeup) and here (featuring dudes and chicks)! 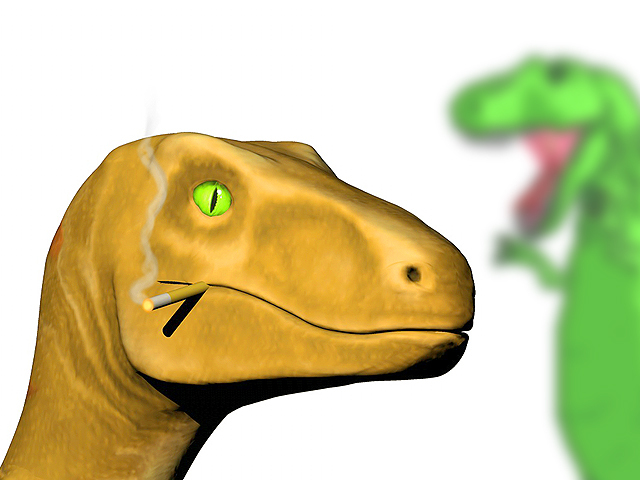 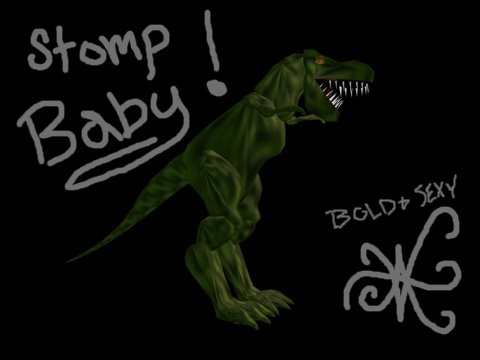 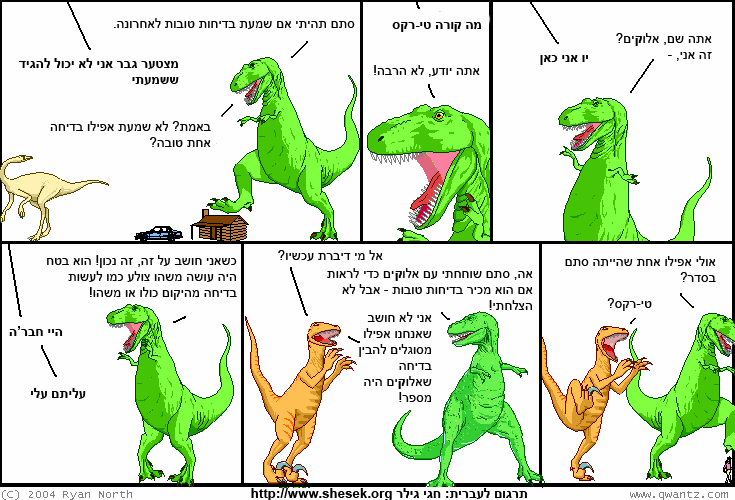 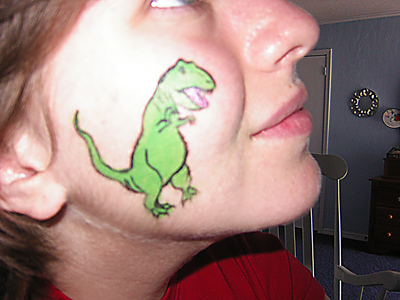 allene and t-rex, by allene! gratuitous use of exclaimation points, by sarah bader! 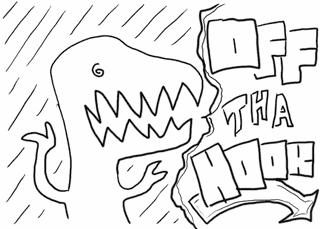 off the hook, by dave bort! 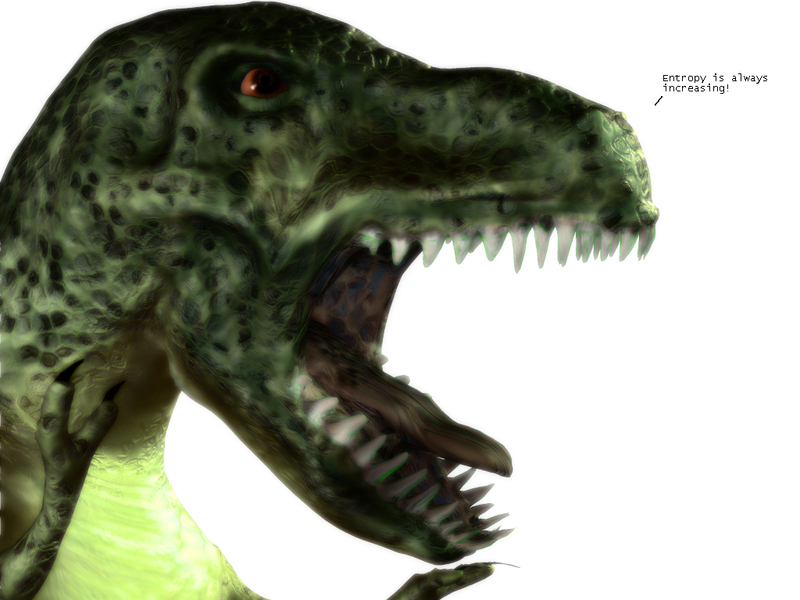 3D utahraptor, by daniel wilkes! 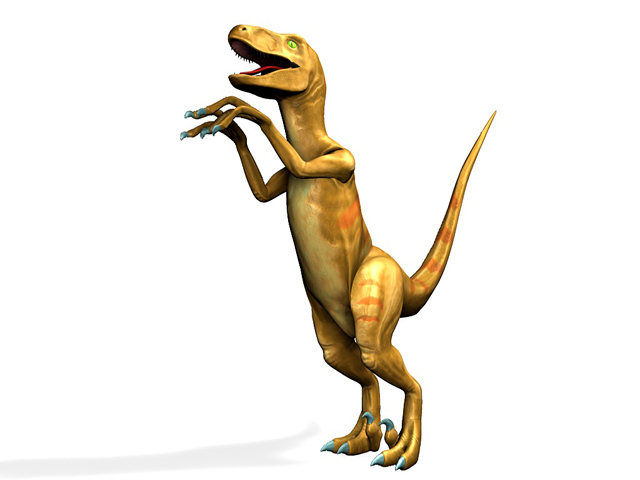 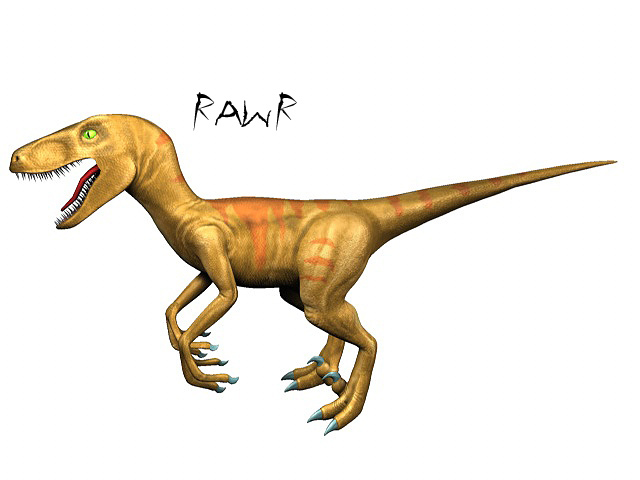 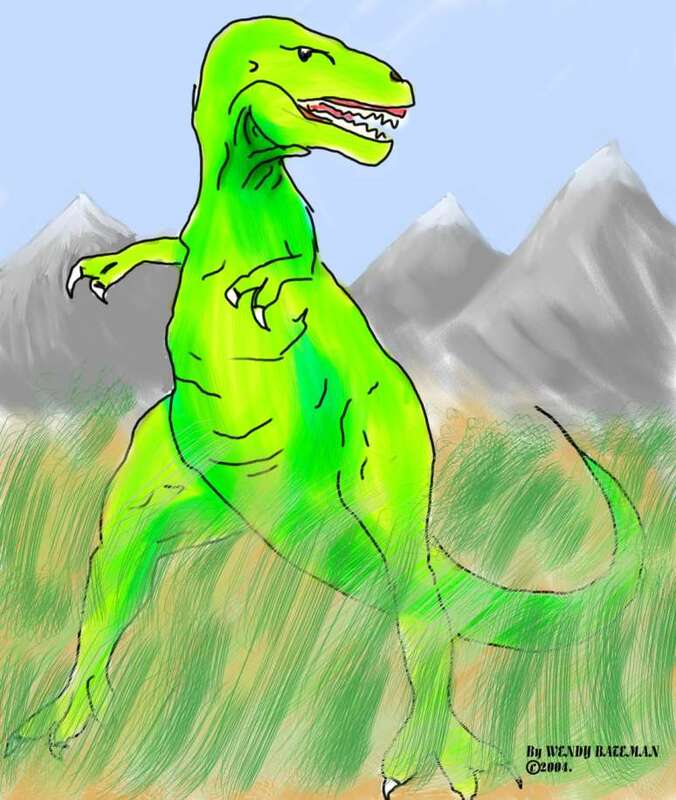 see more crazy utahraptor pictures by daniel here and here and here. 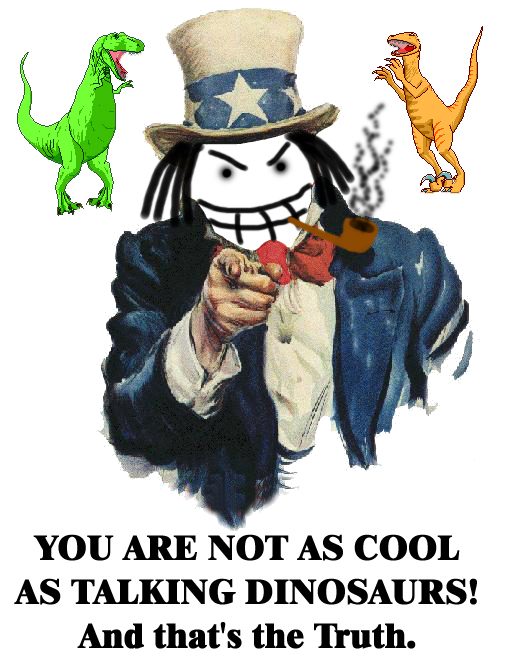 also: you smoke?! since when? teenage t-rex, utahraptor, and dromiceiomimus, by jamie burnside! 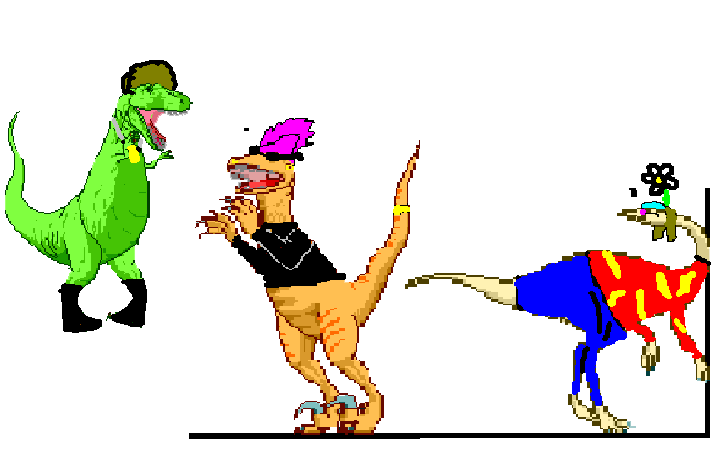 Marie Arnold made all these classy icons! 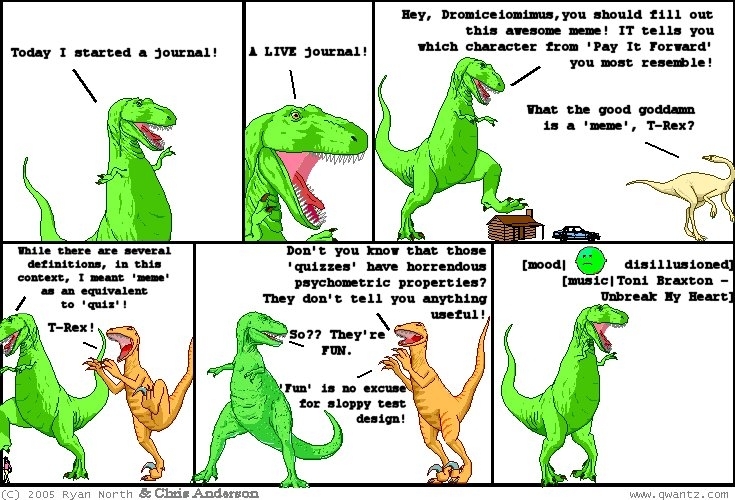 They are good for things like "Live Journal" and "Blogster". 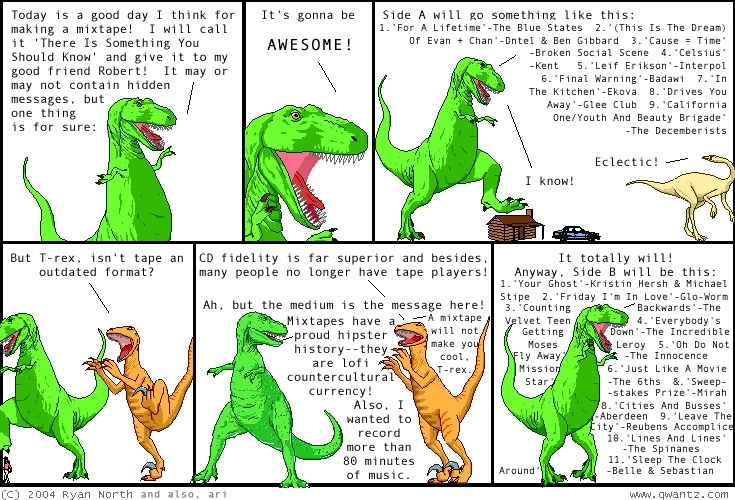 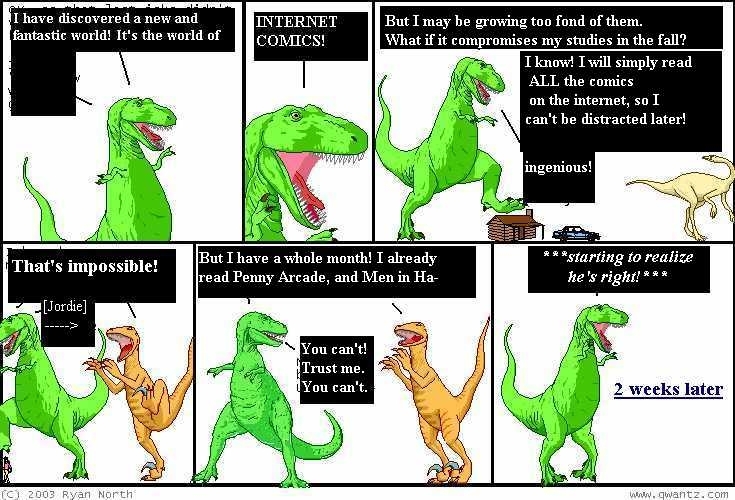 I think they're pretty keen: most of them are actual dinosaur comics, compressed down to 100x100 and made all trendy-looking! 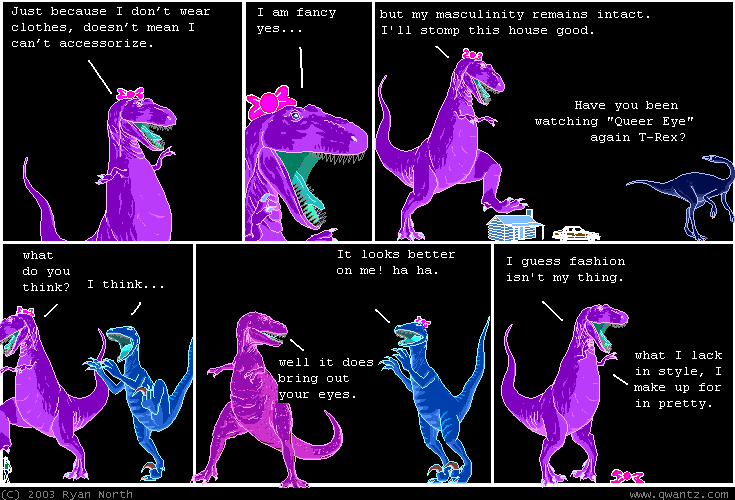 patrick sent in a stylish "ladies please, one at a time" design, at 800x600, 1024x768, and 1280x1024. 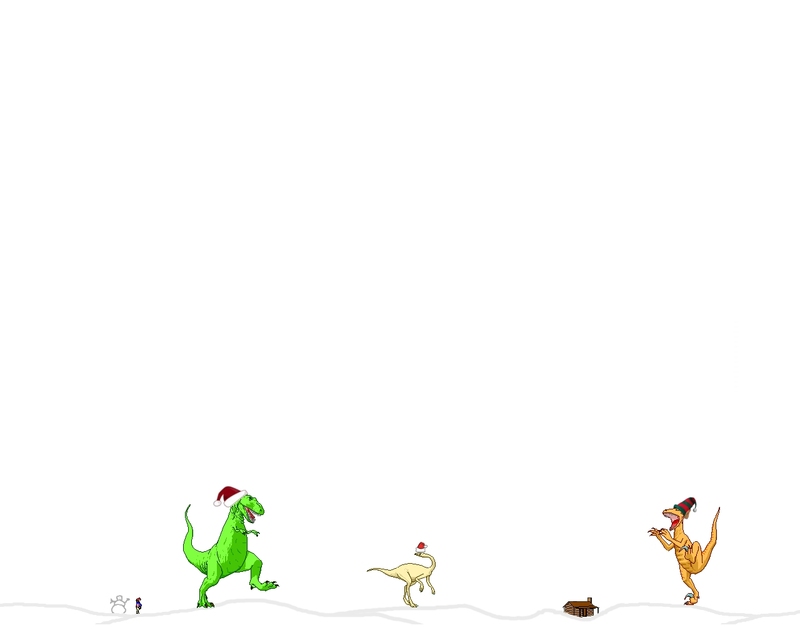 and josh turned the winter scene at the bottom of this page into wallpaper, again at 800x600, 1024x768, and 1280x1024. 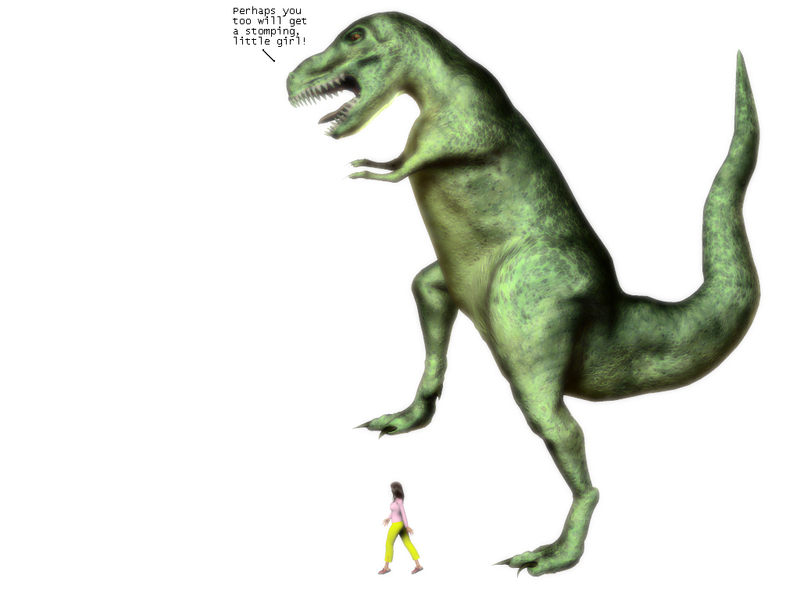 and here's a great set of 3d renders by mr. wolf, all at 1024x768: tiny woman has really filled out, perhaps you too will get a stomping, and entropy is always increasing. 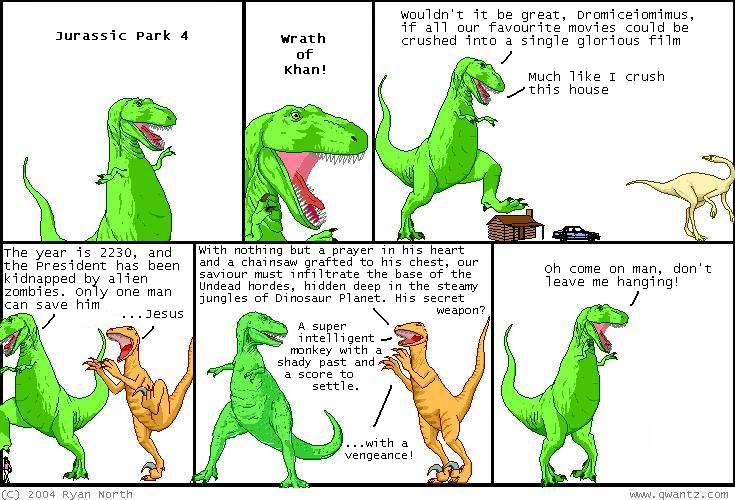 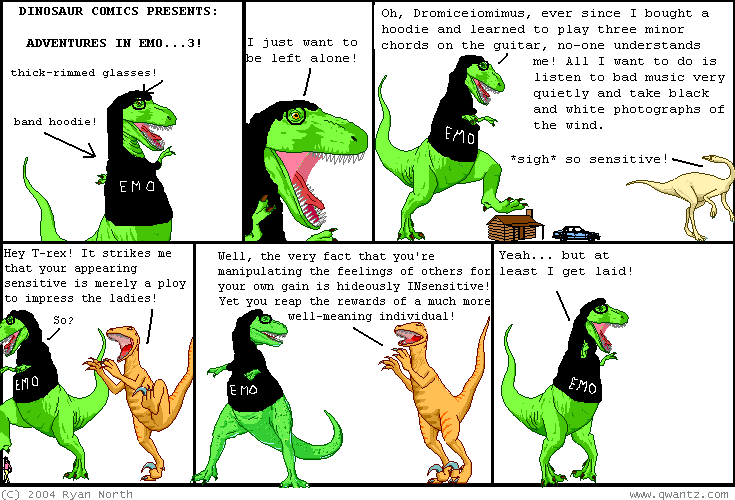 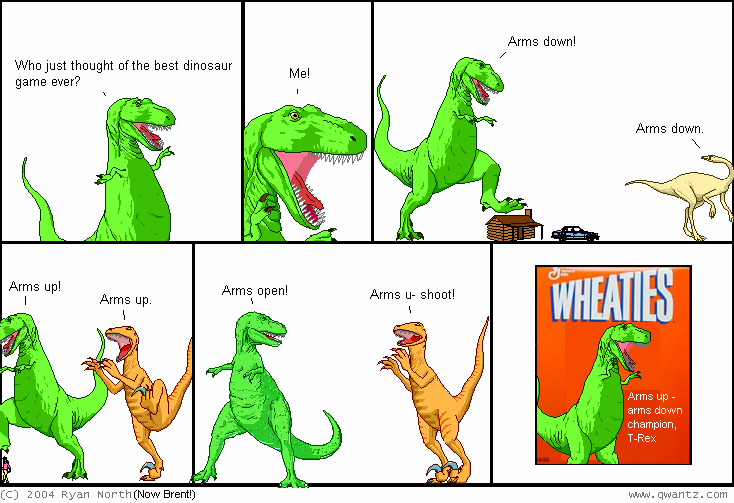 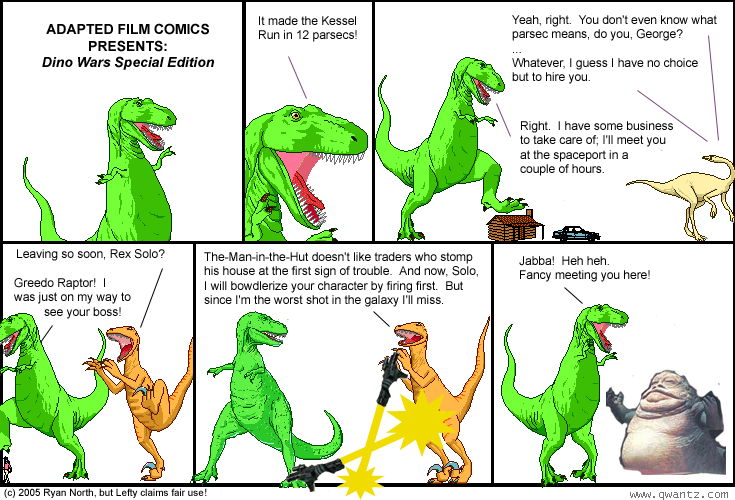 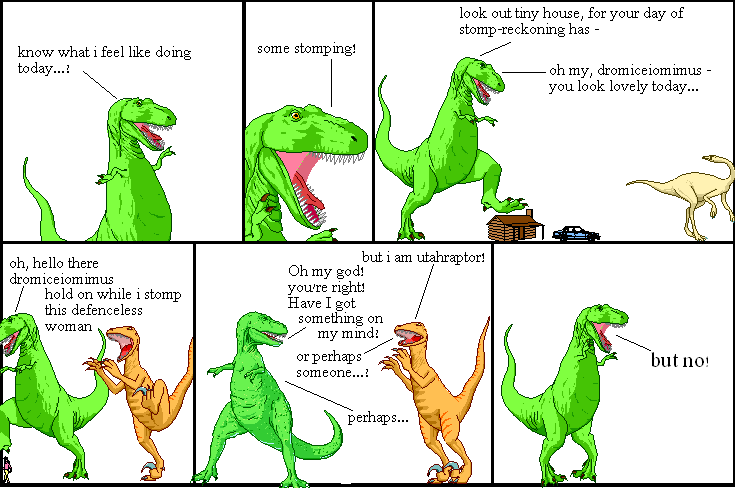 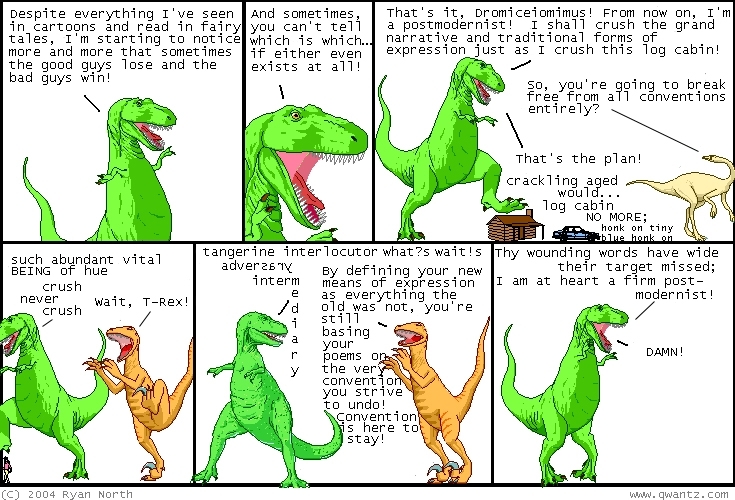 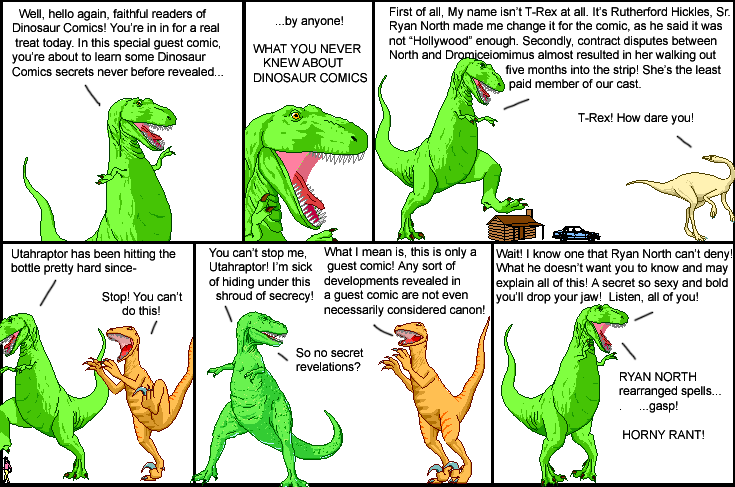 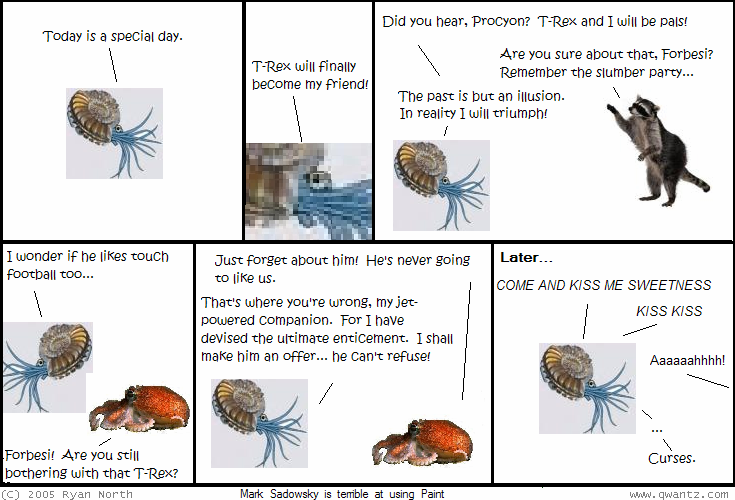 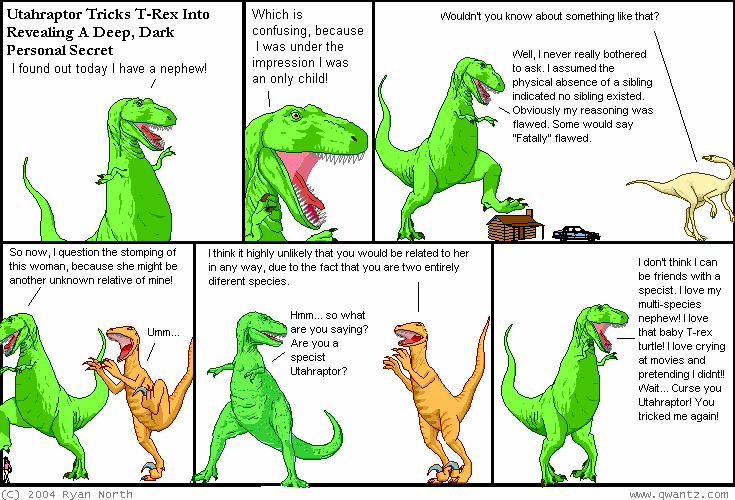 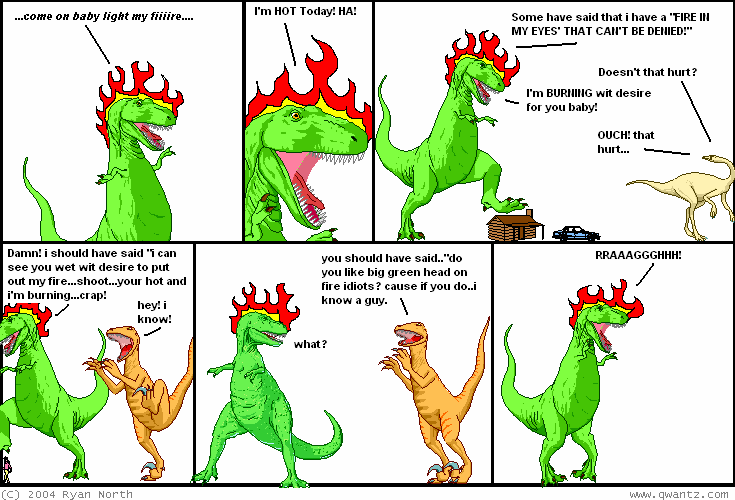 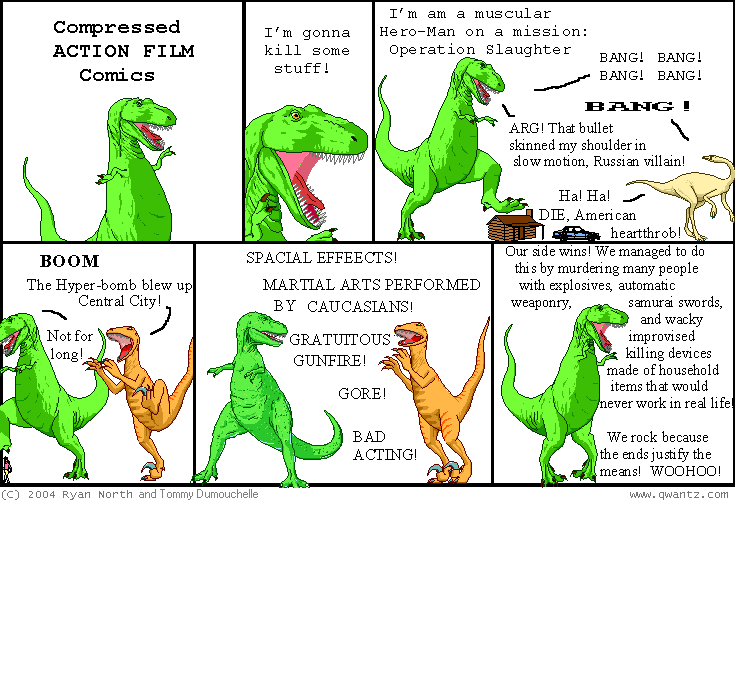 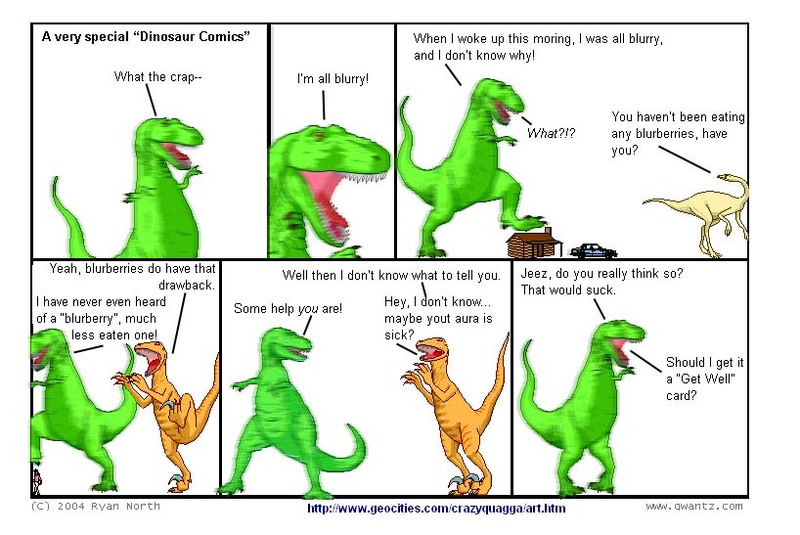 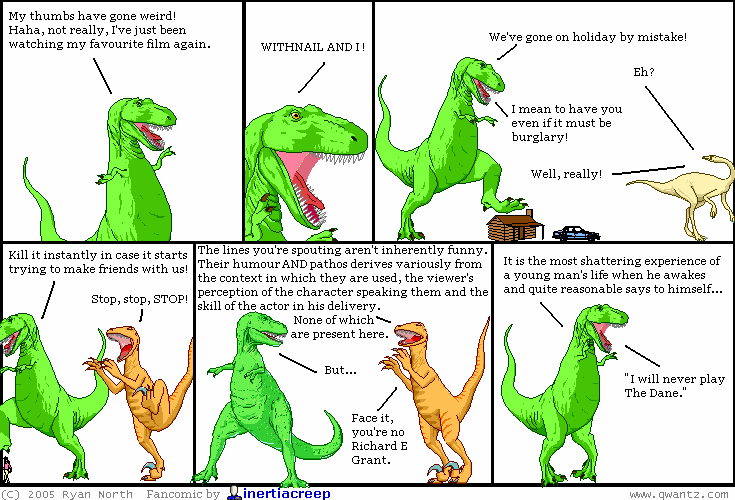 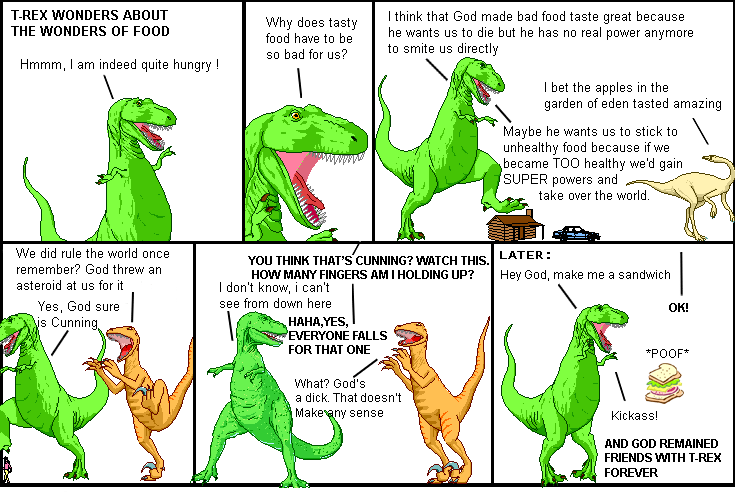 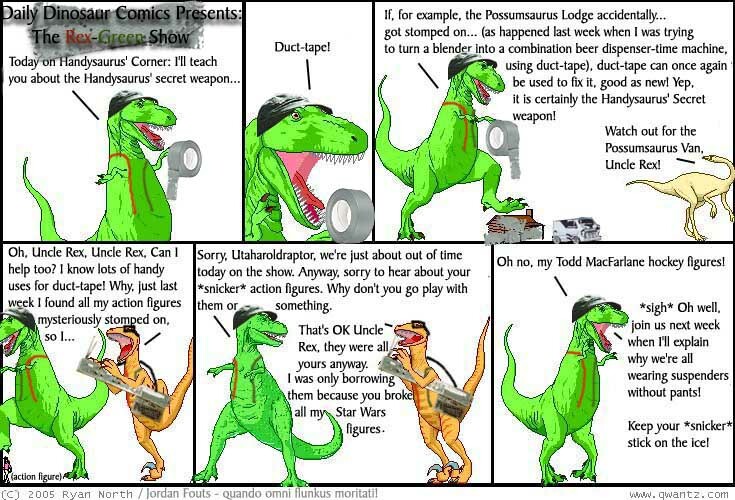 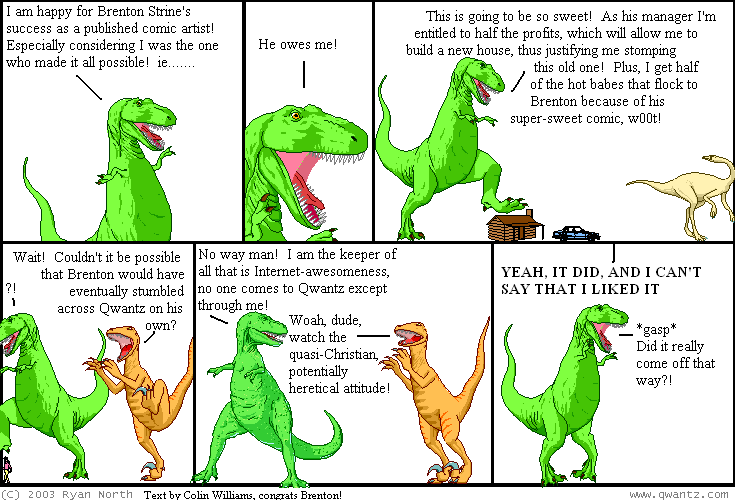 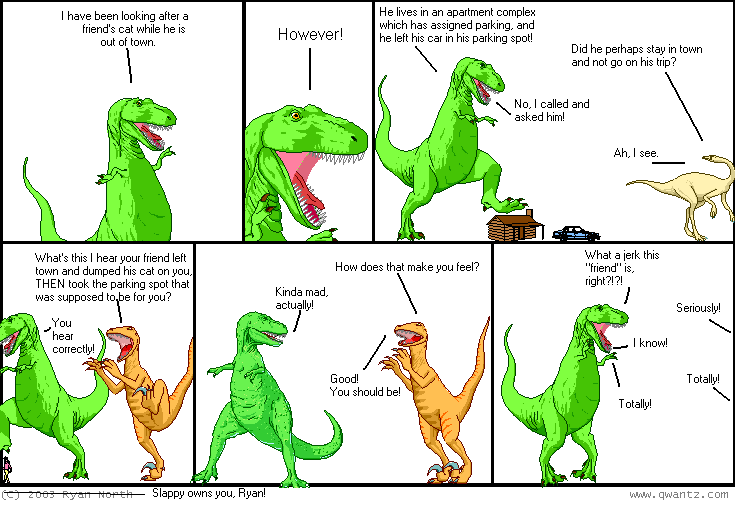 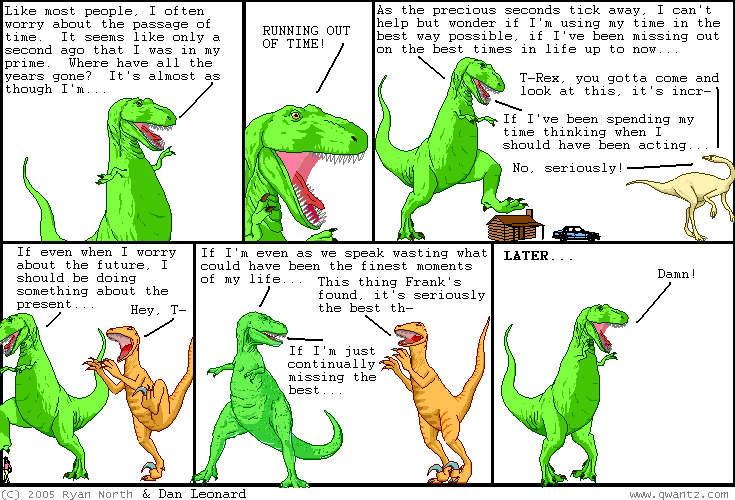 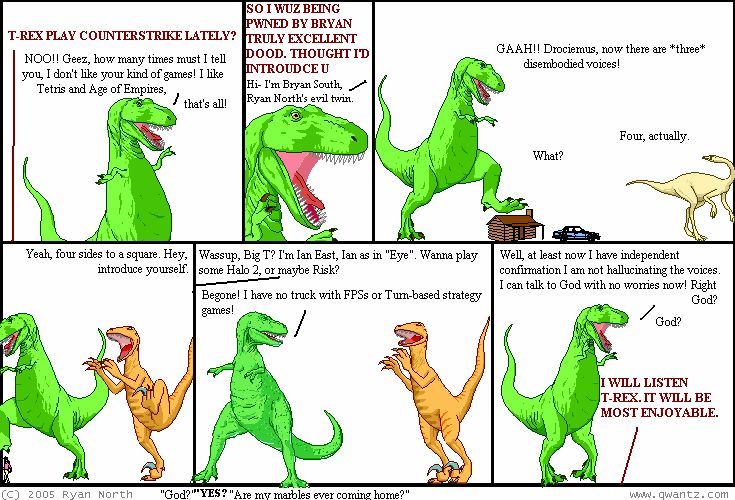 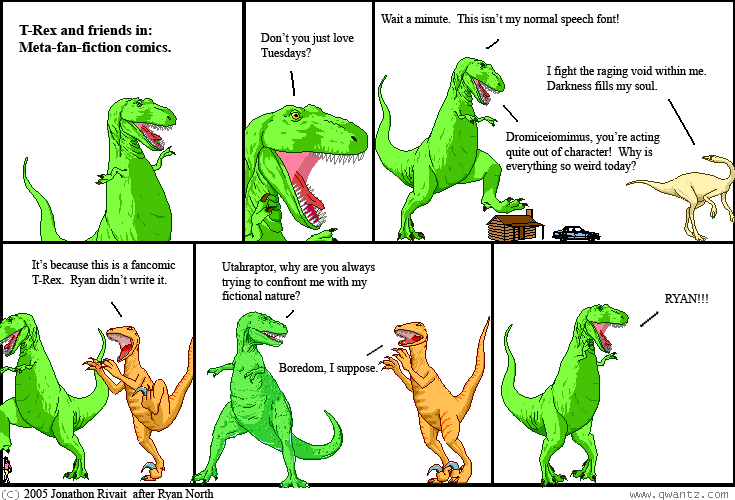 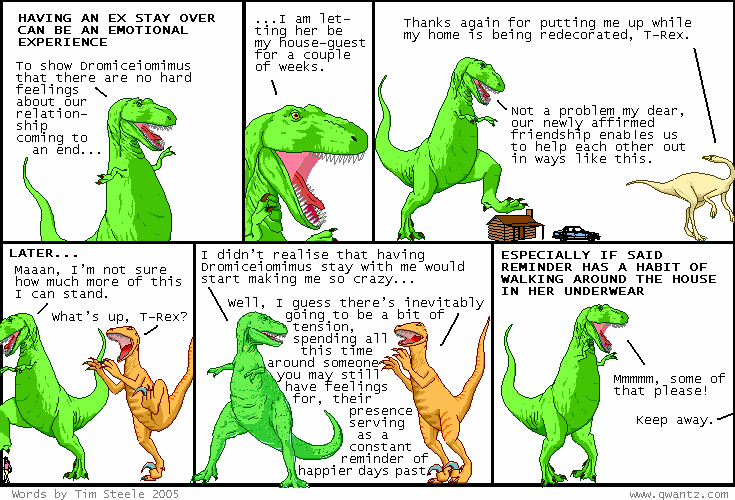 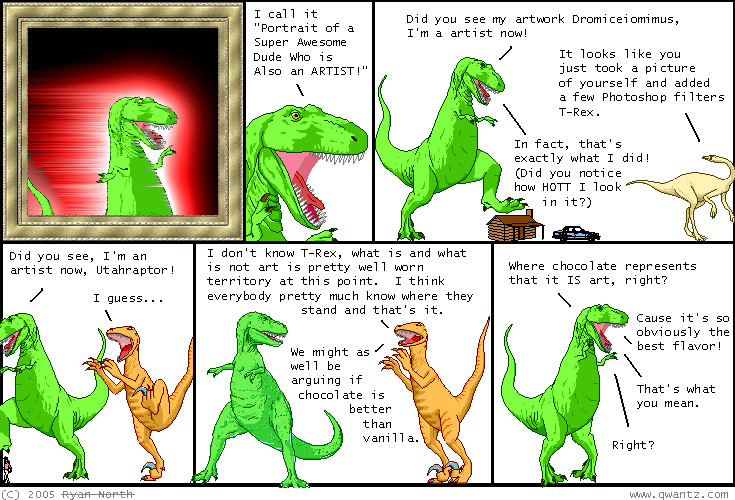 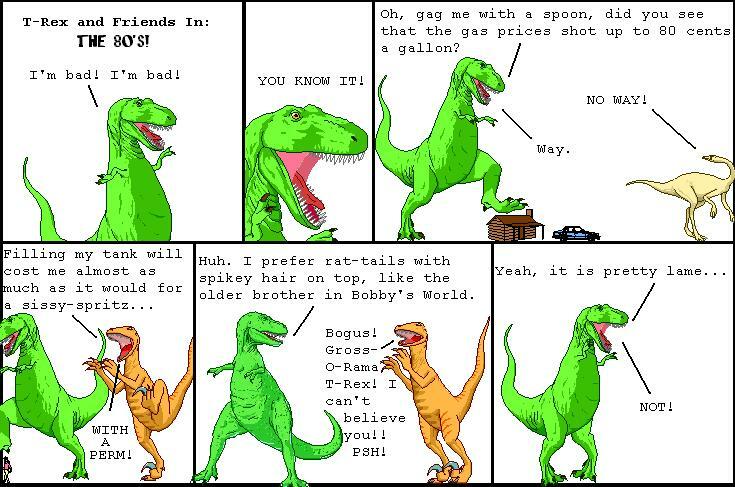 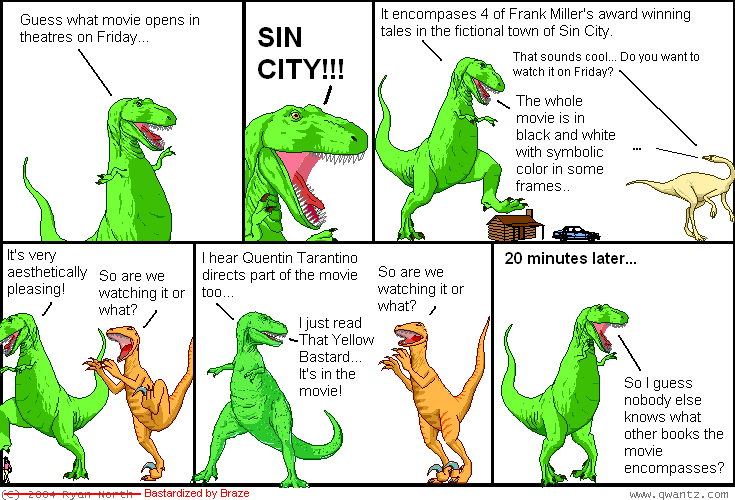 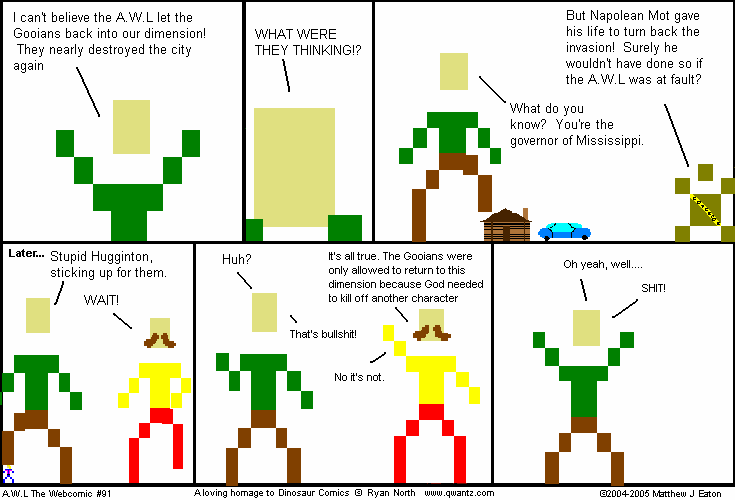 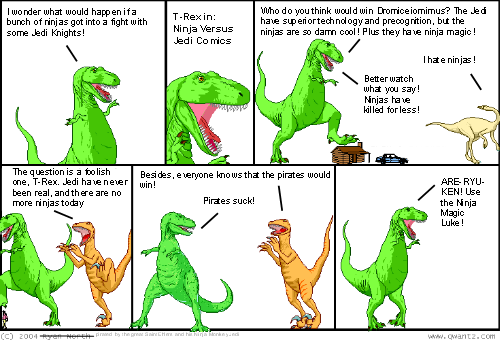 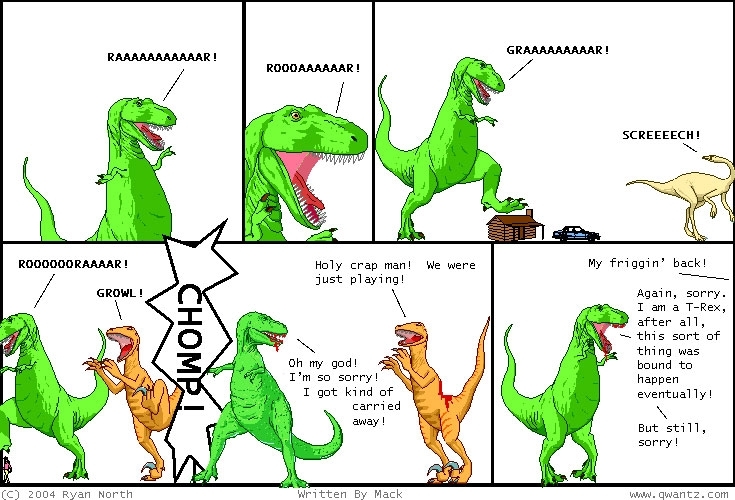 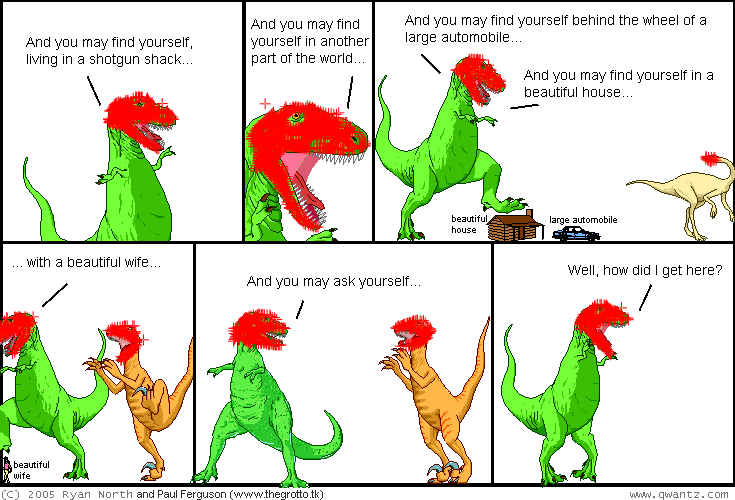 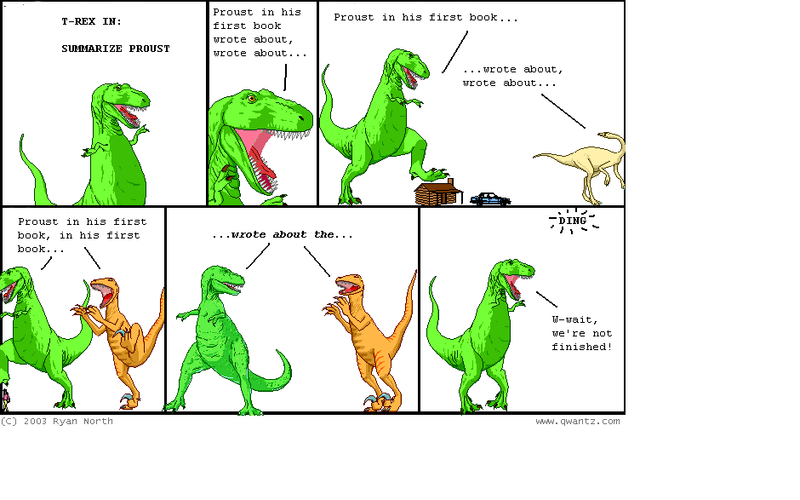 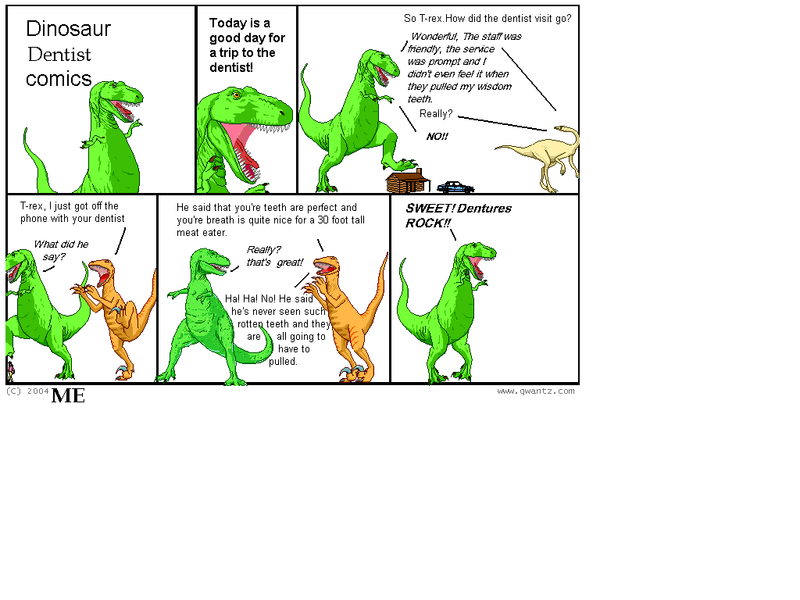 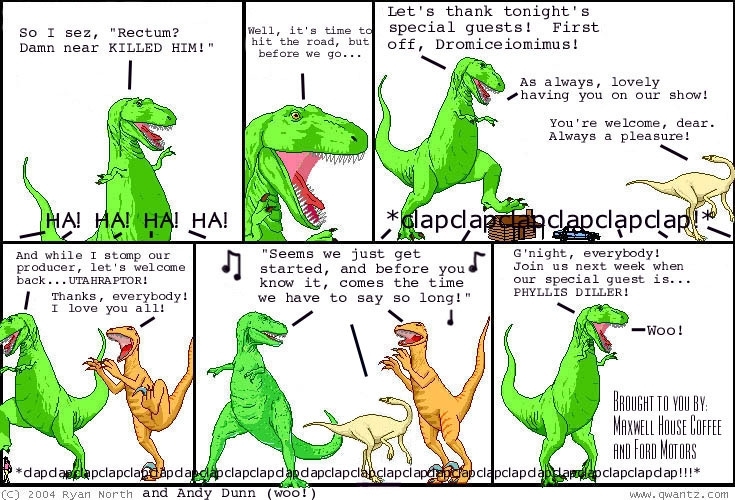 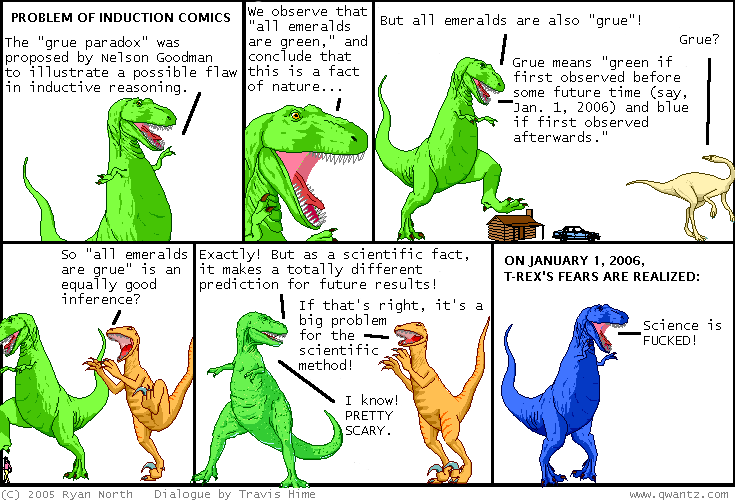 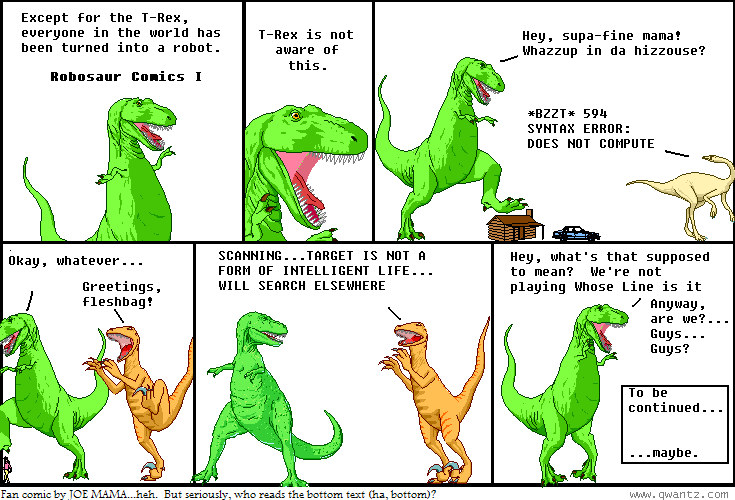 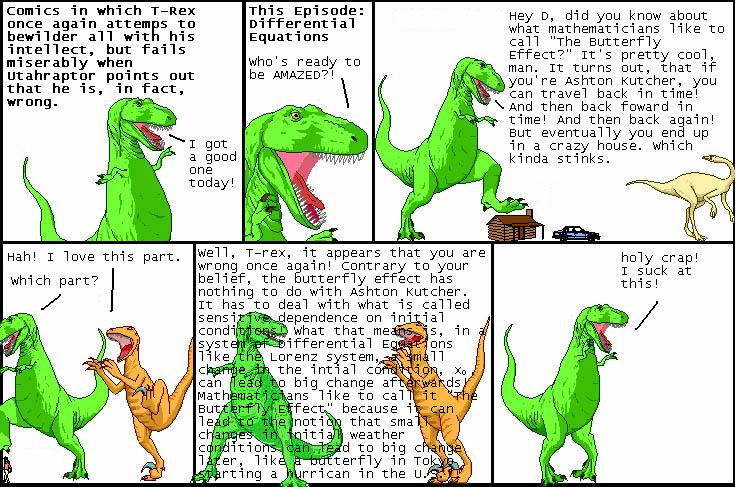 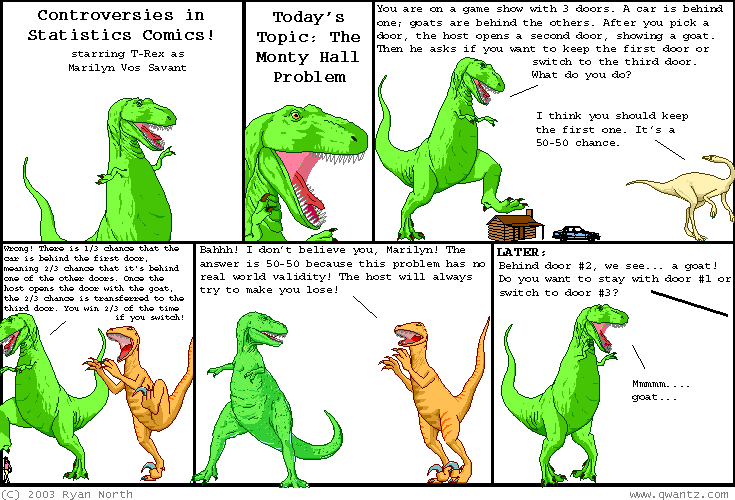 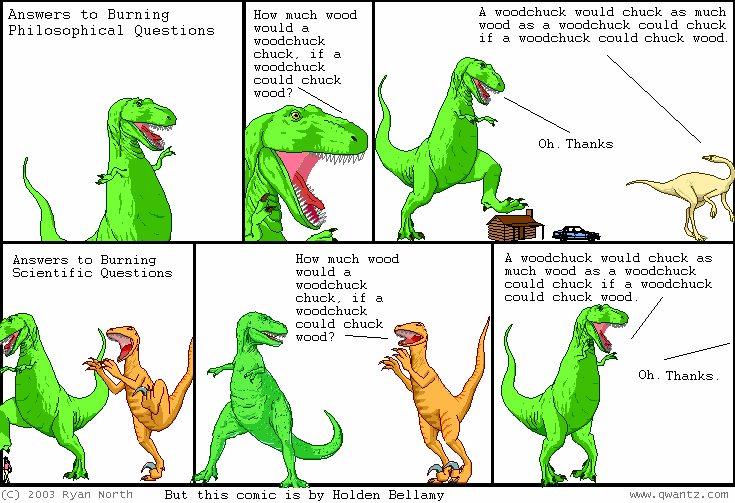 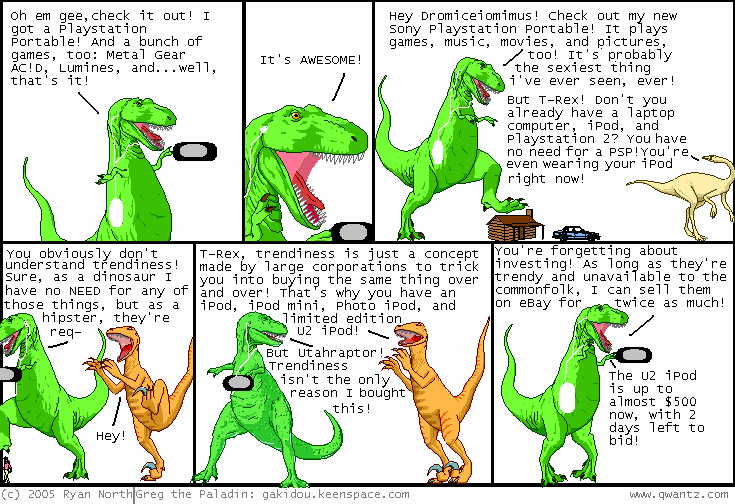 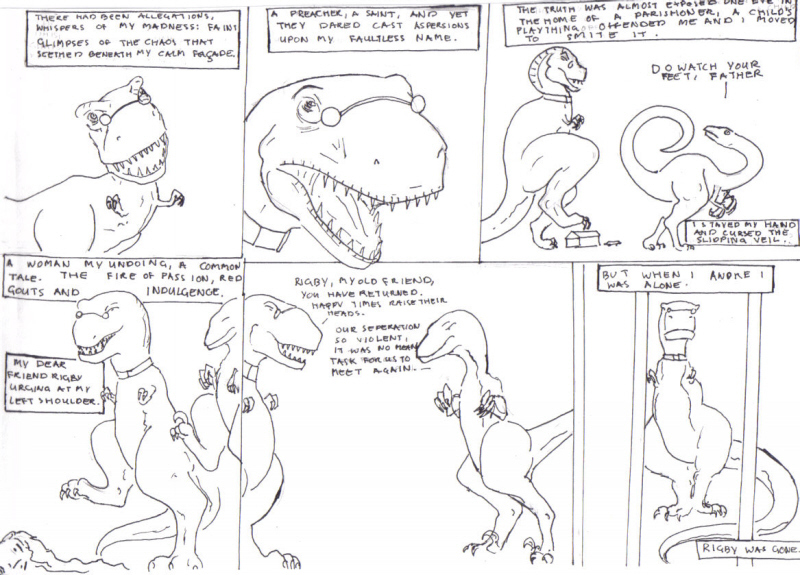 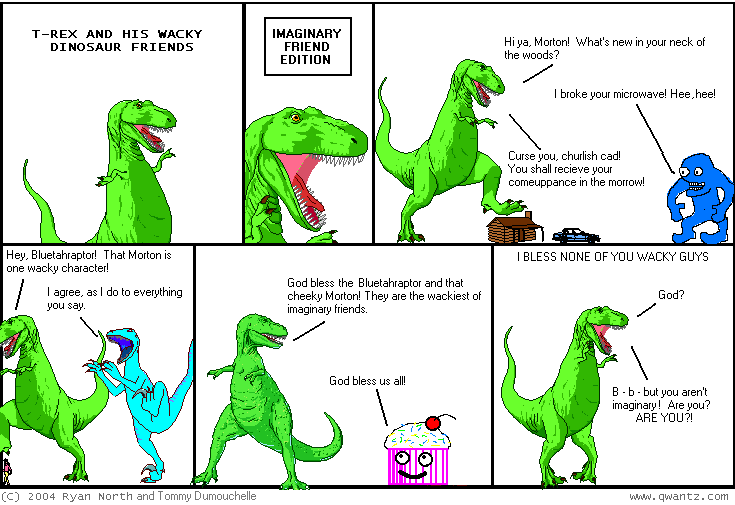 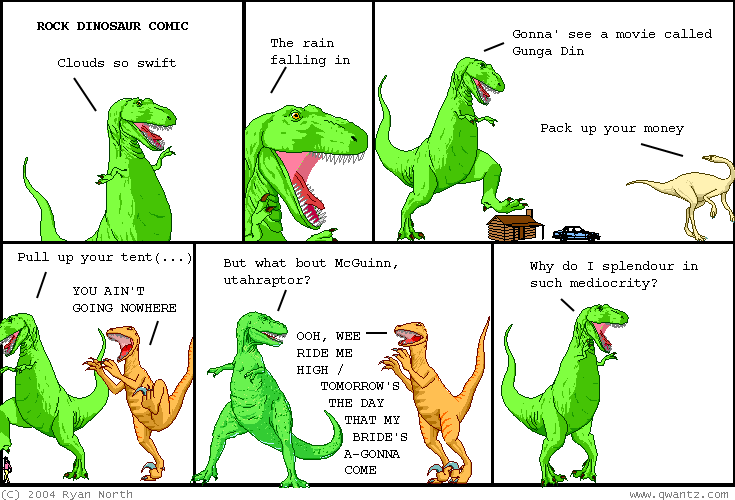 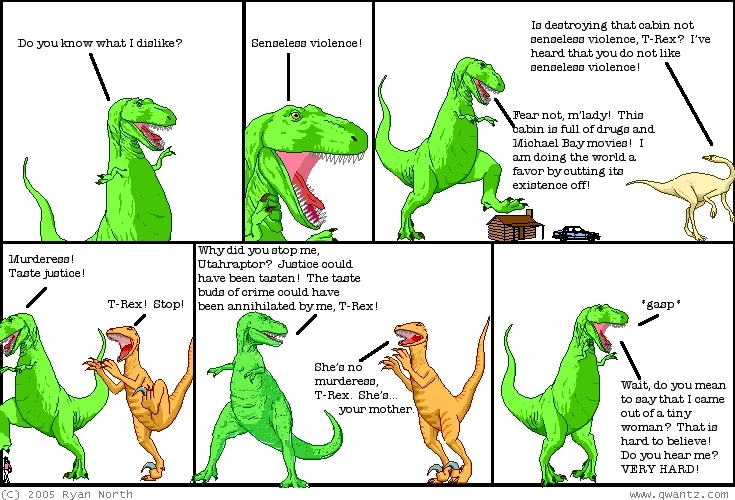 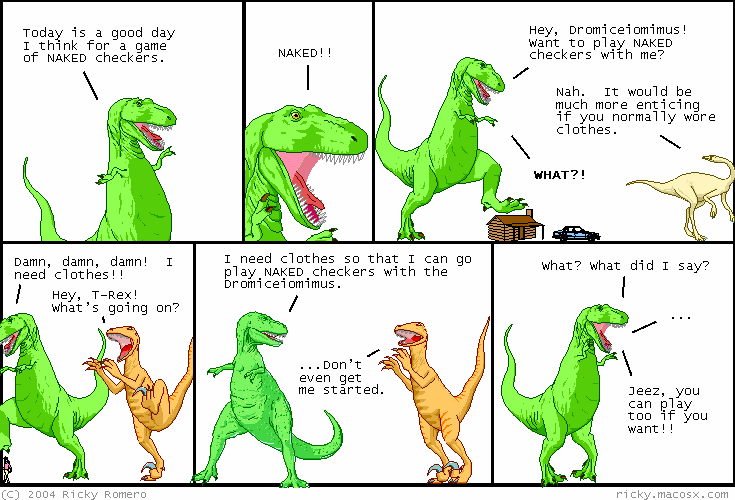 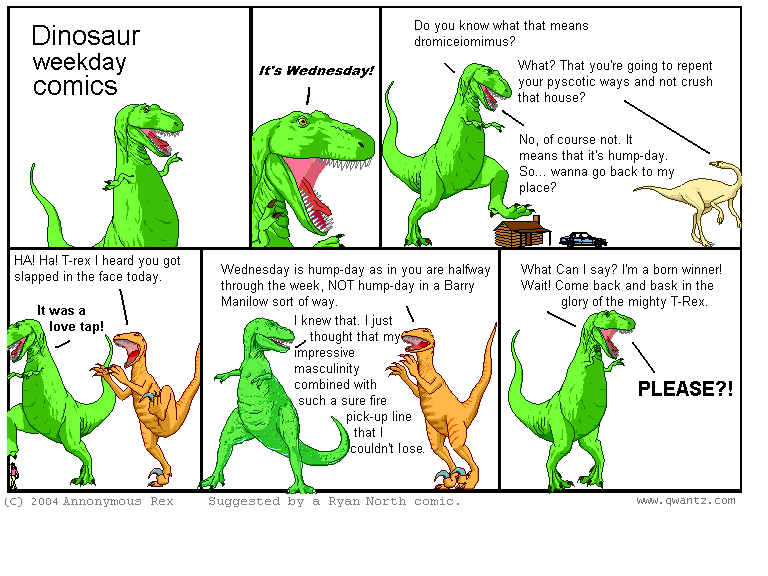 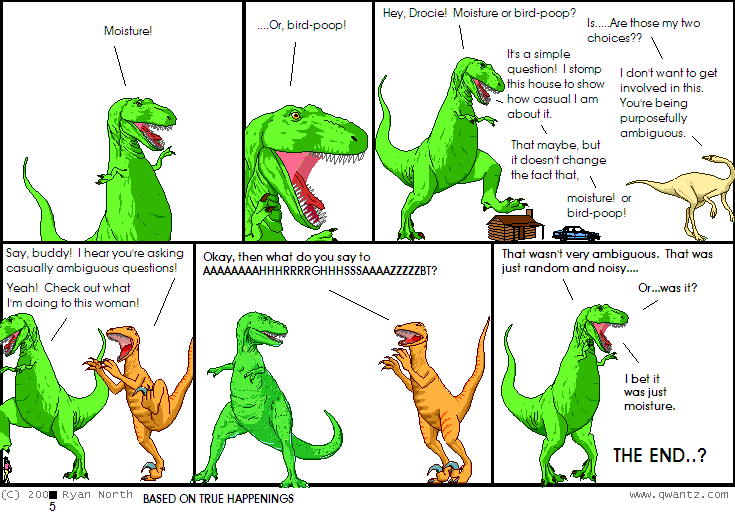 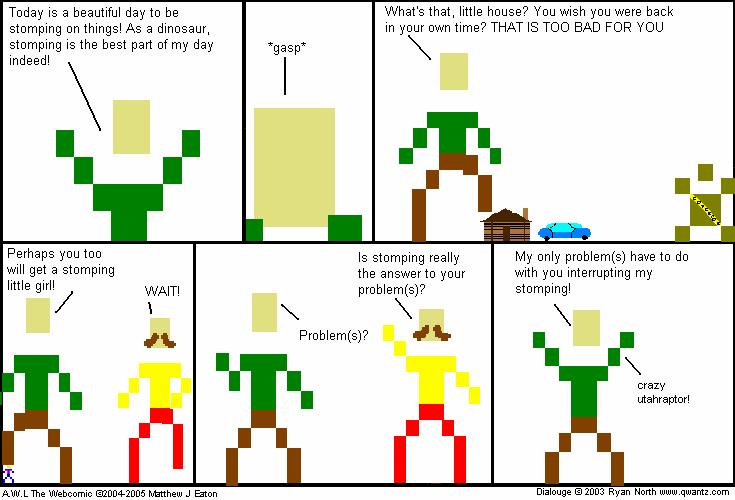 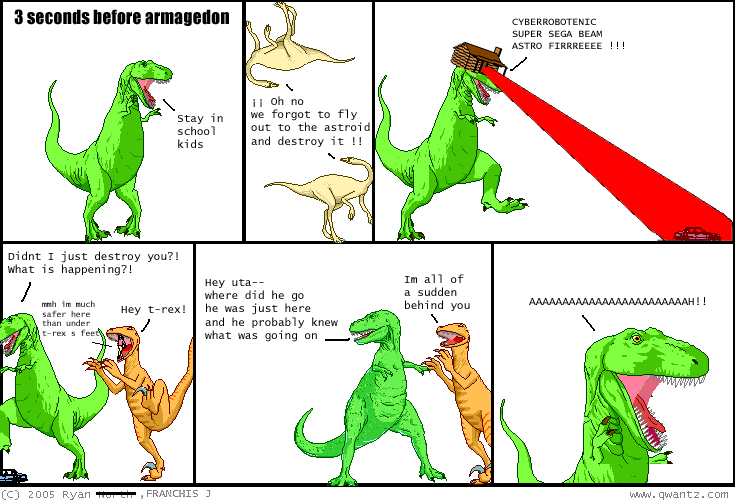 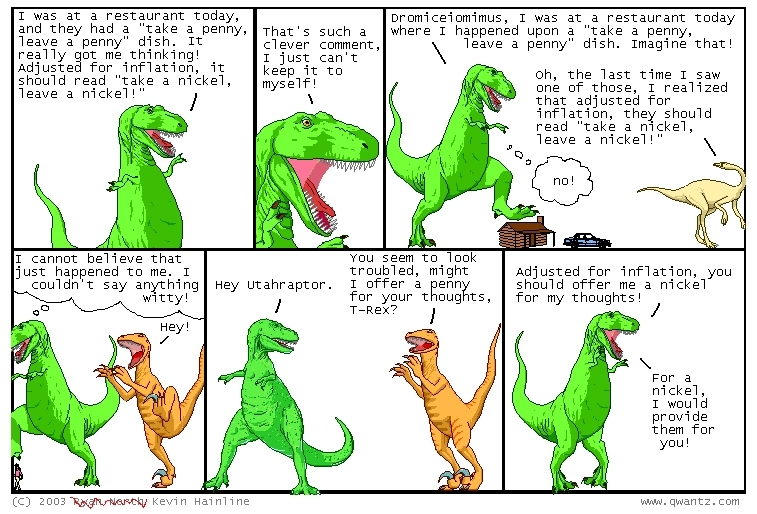 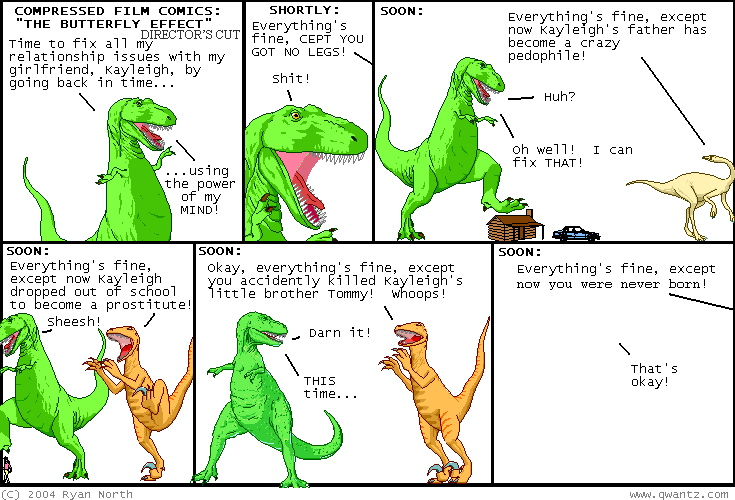 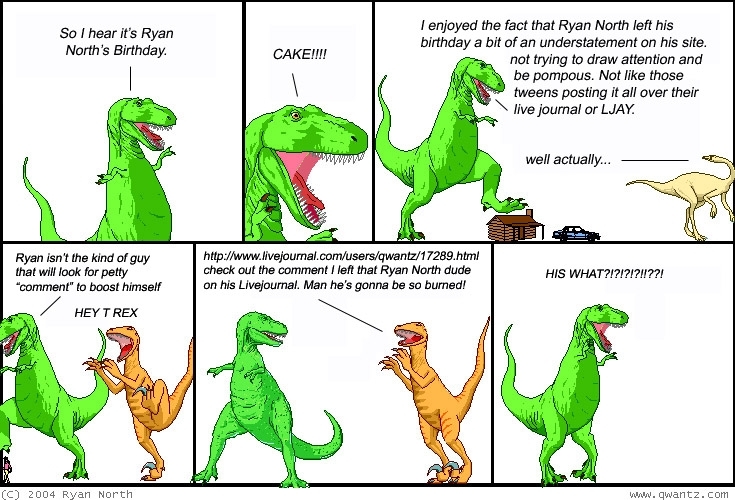 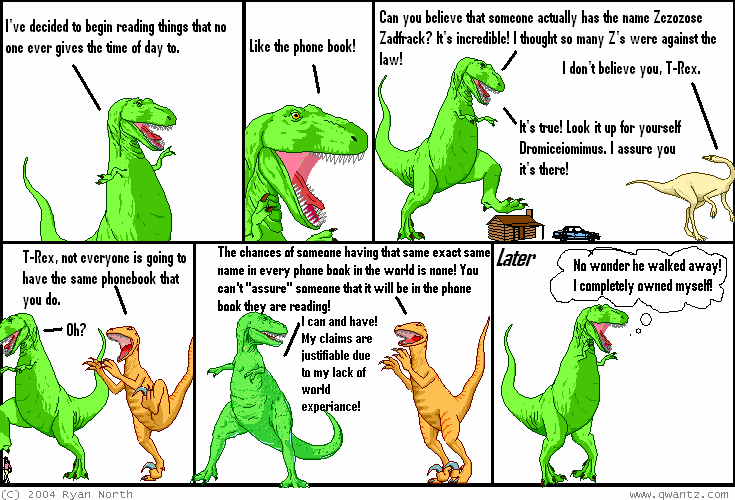 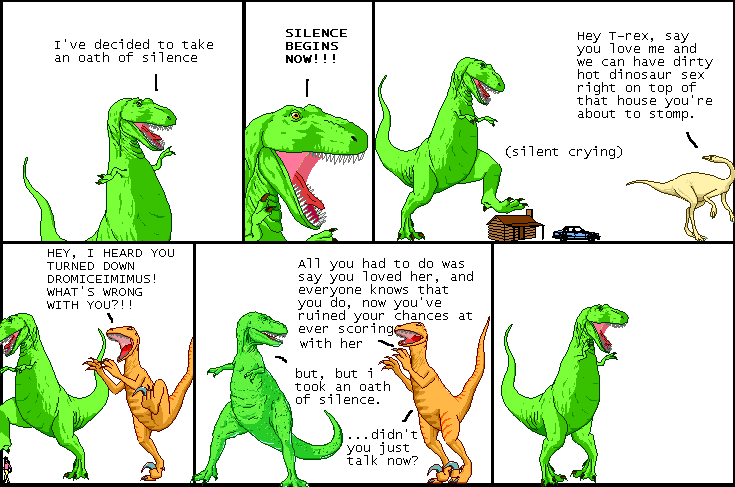 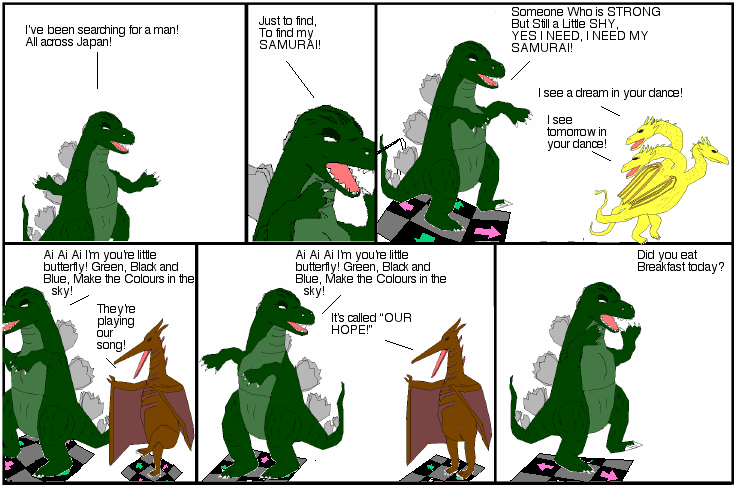 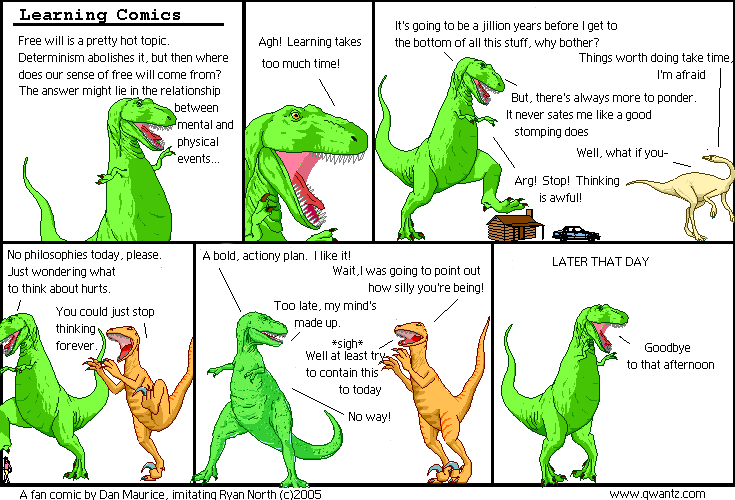 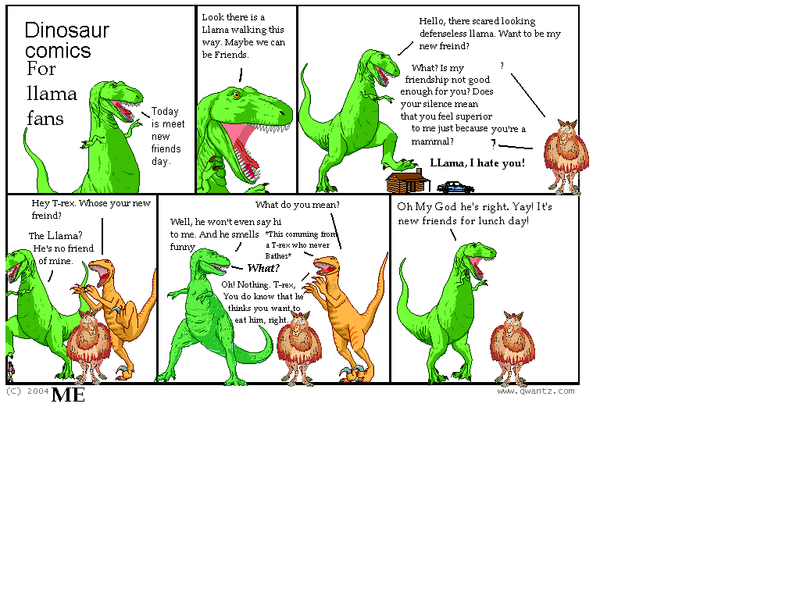 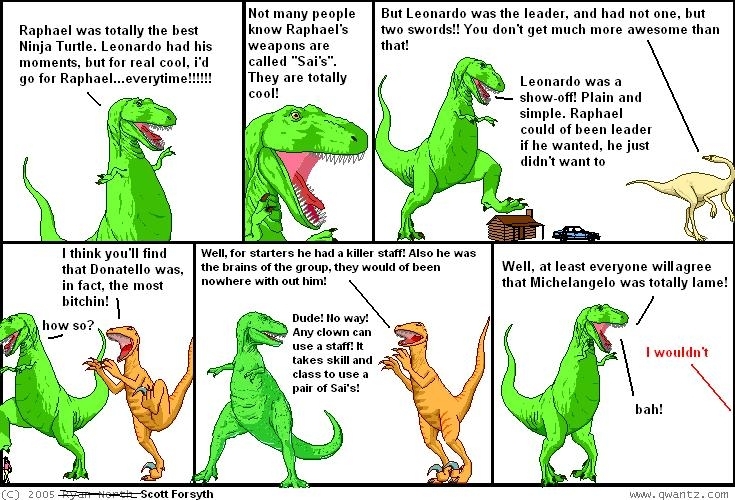 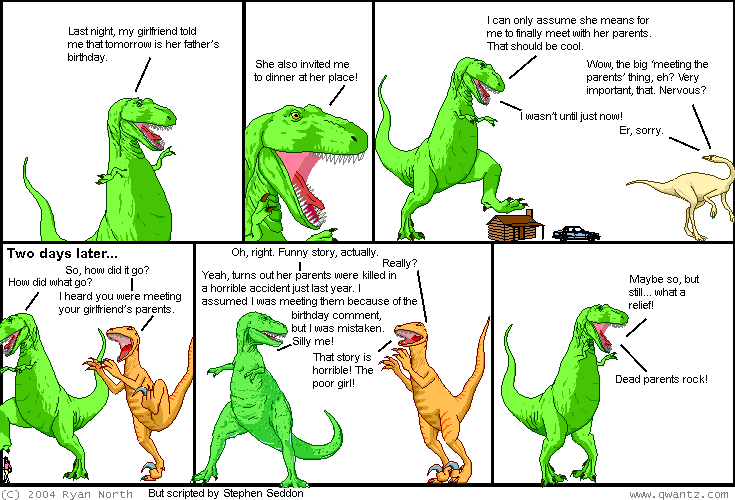 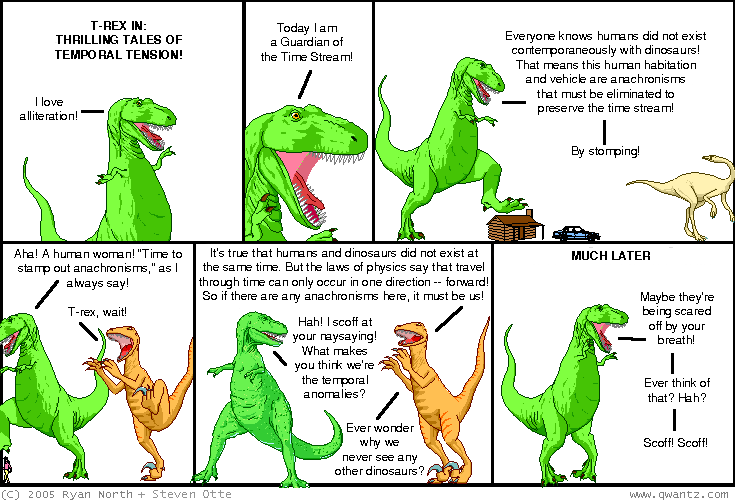 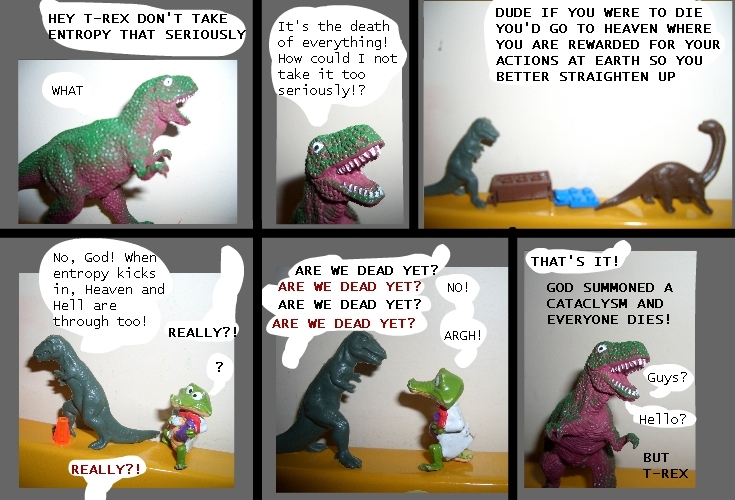 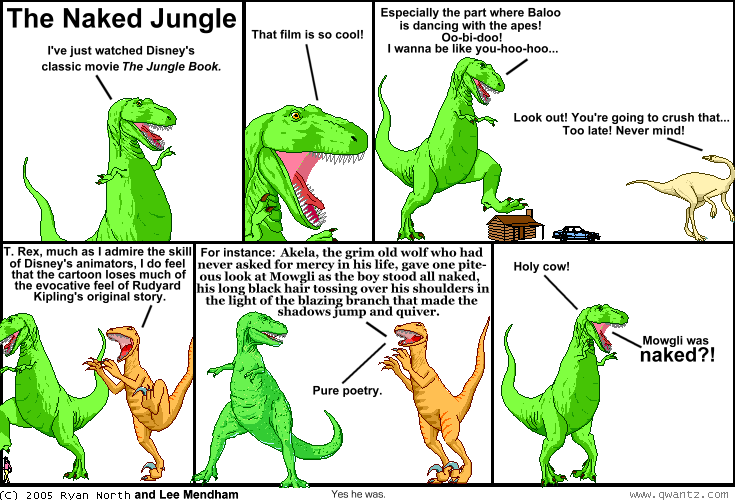 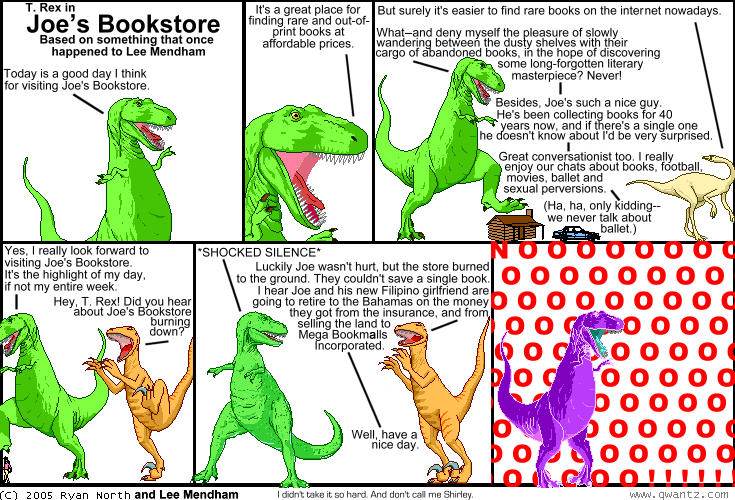 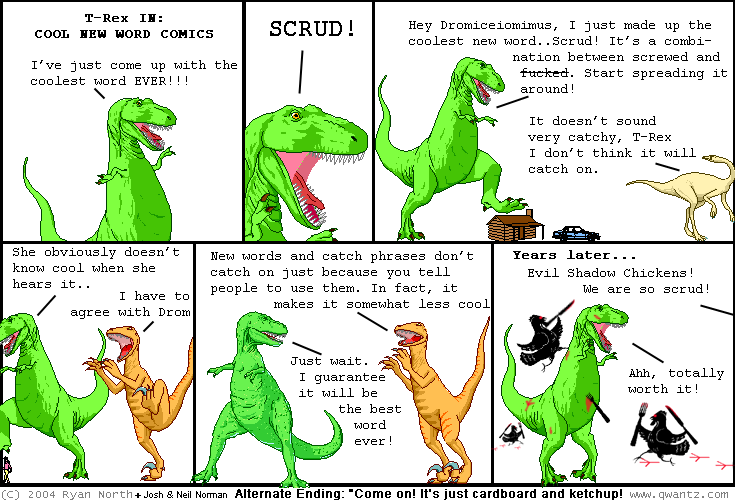 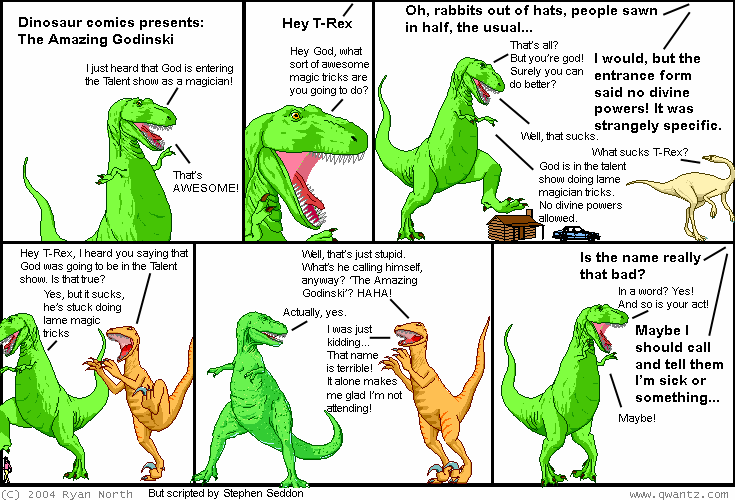 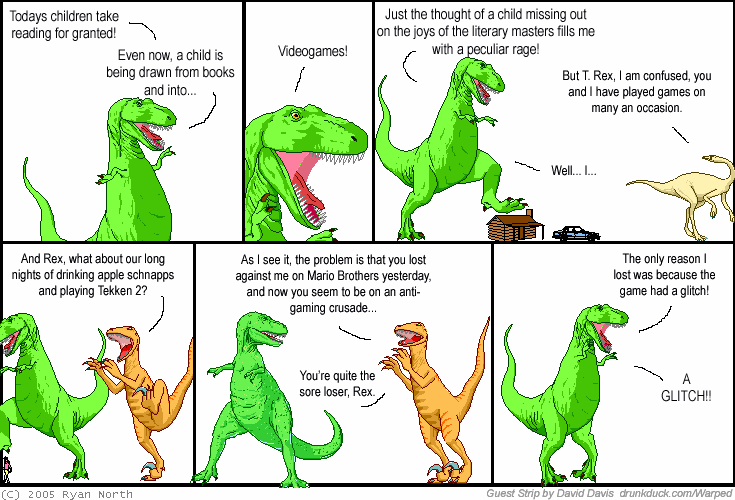 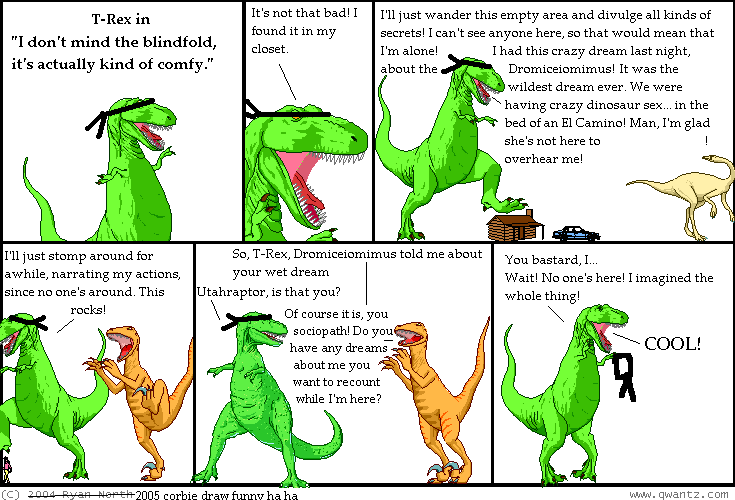 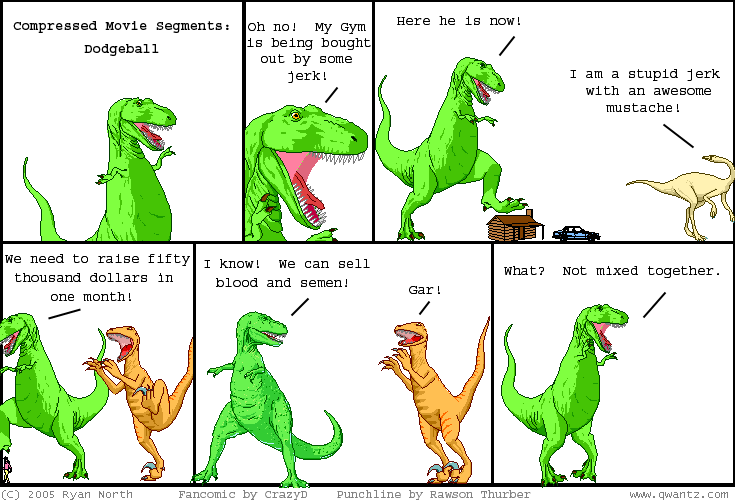 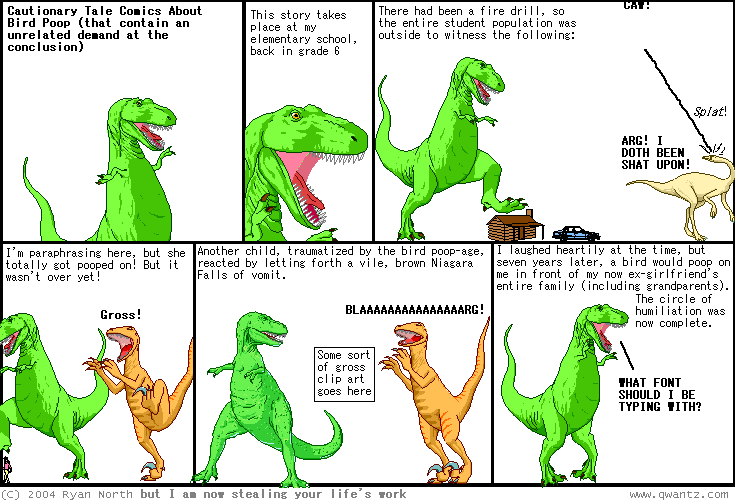 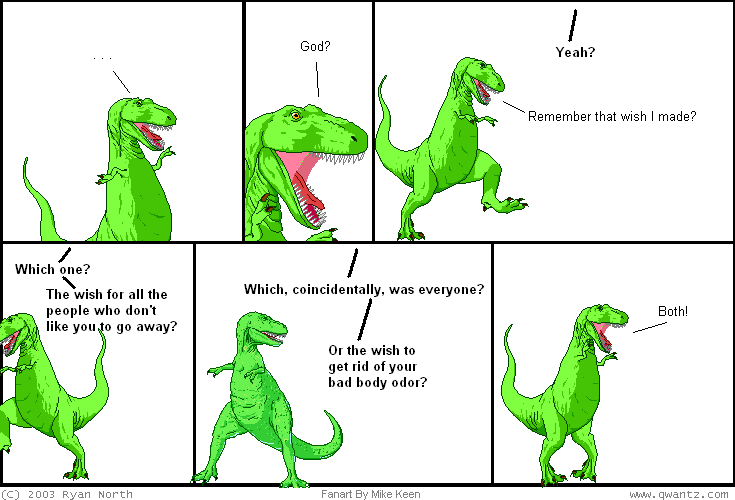 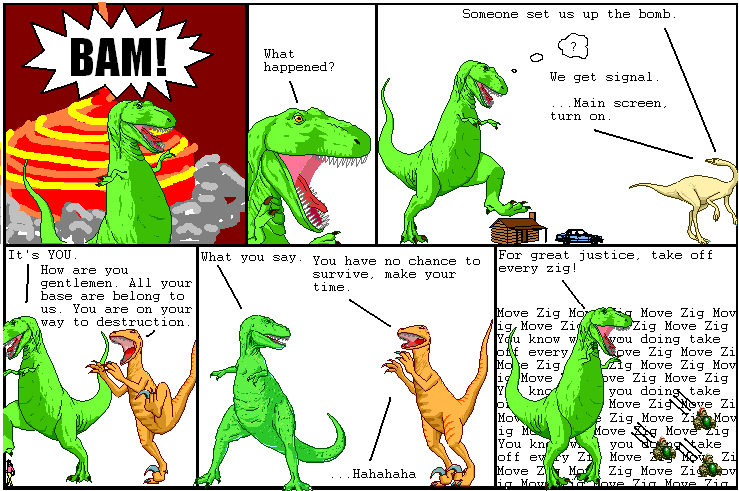 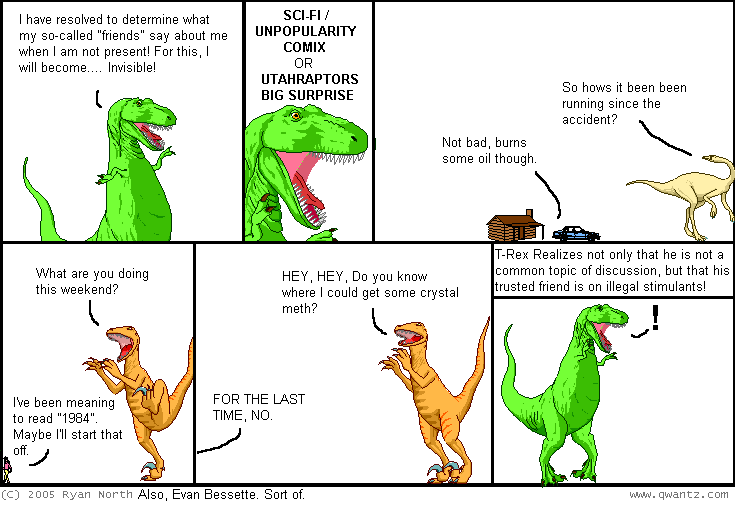 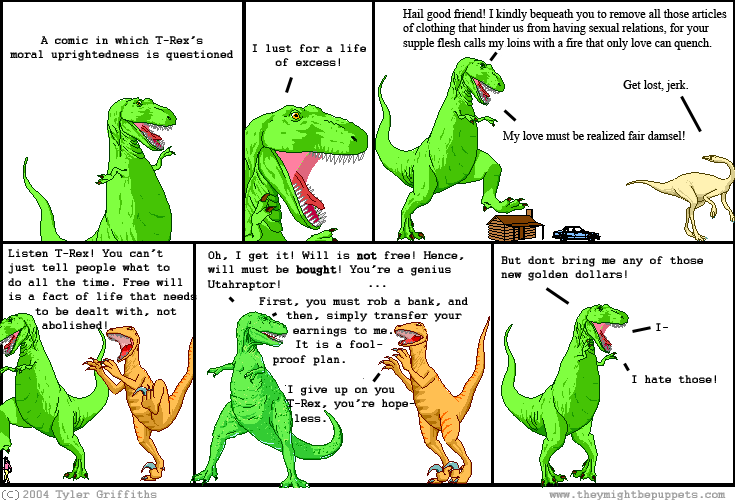 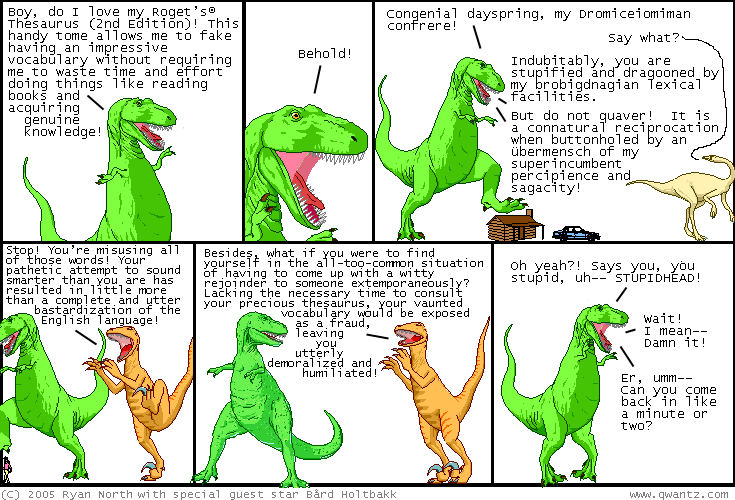 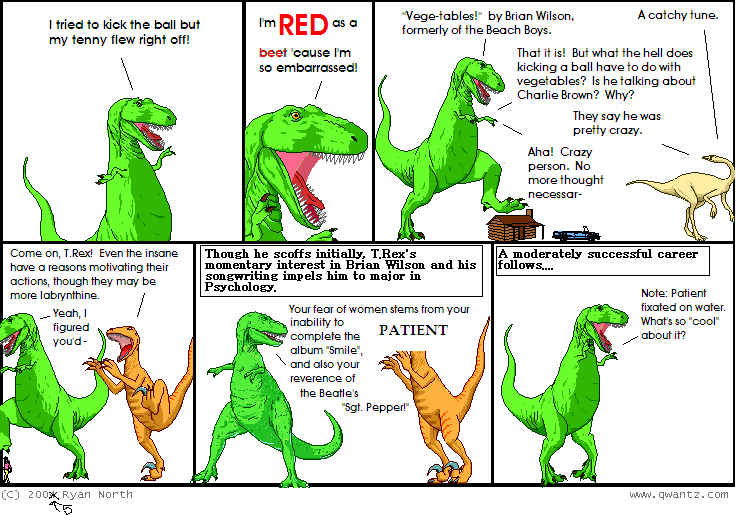 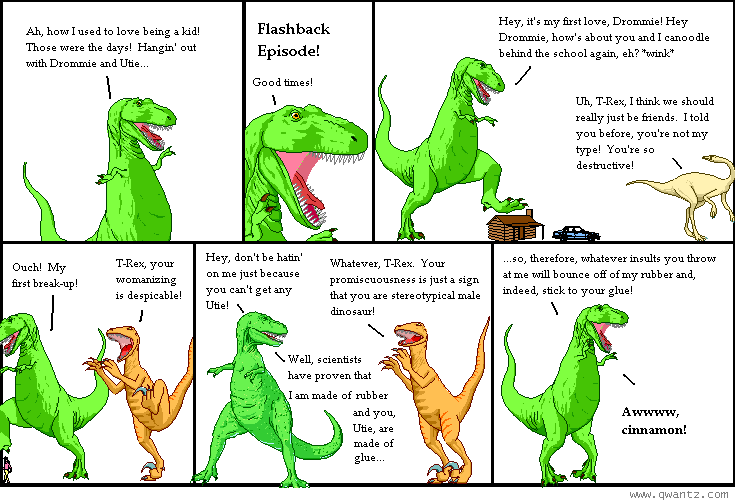 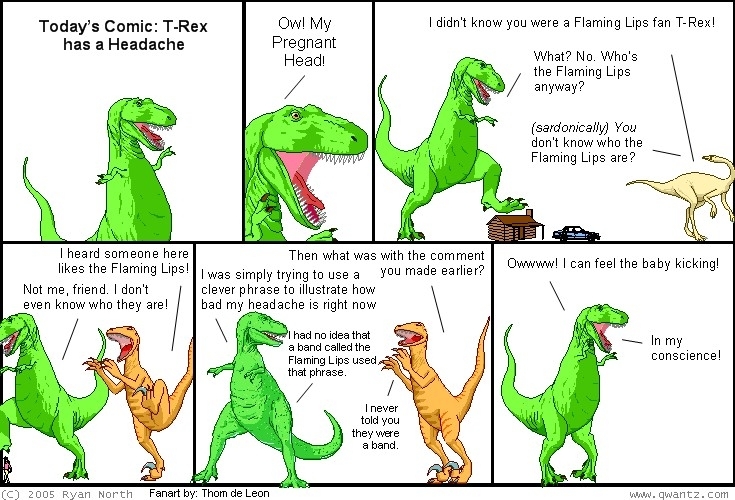 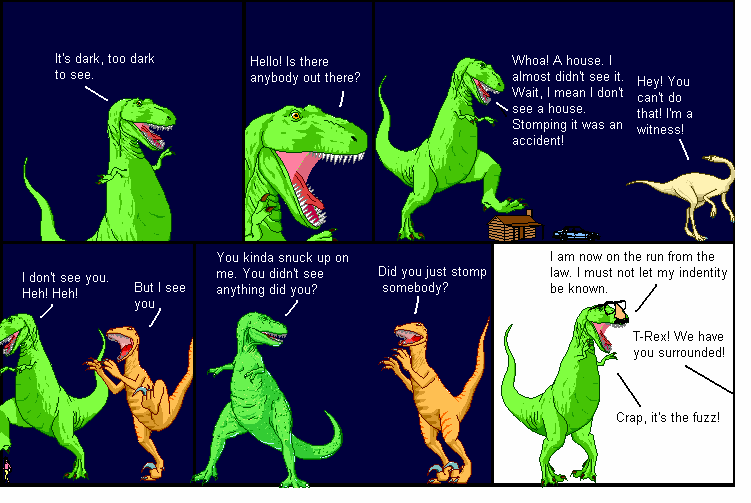 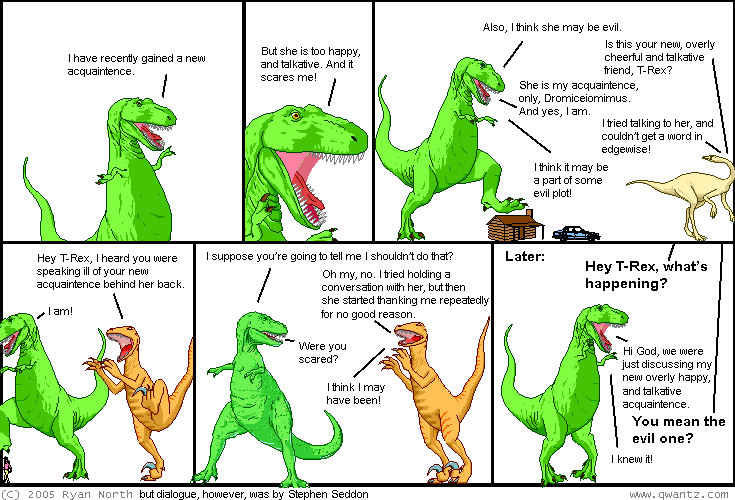 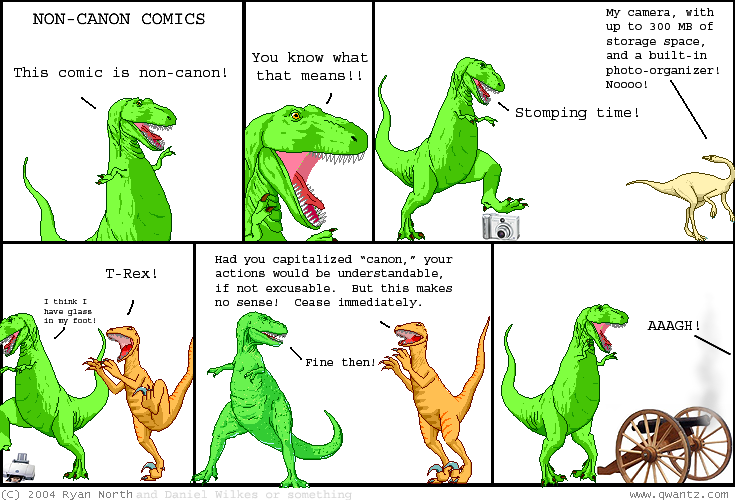 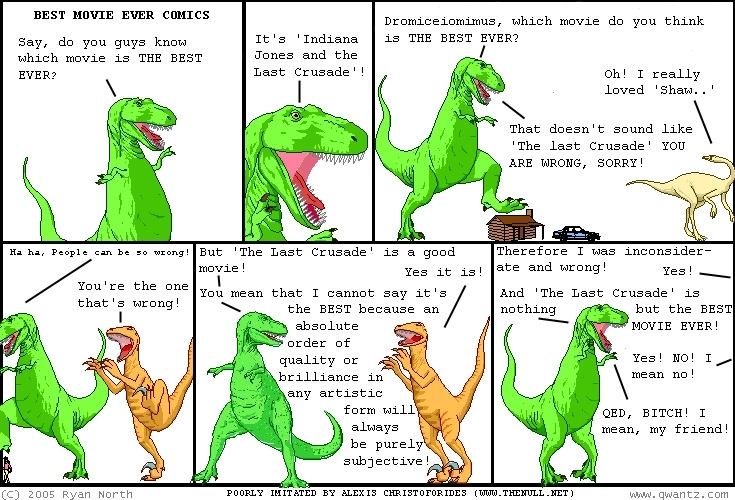 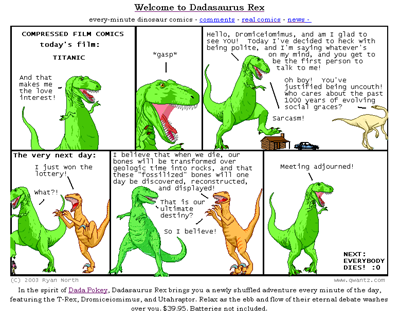 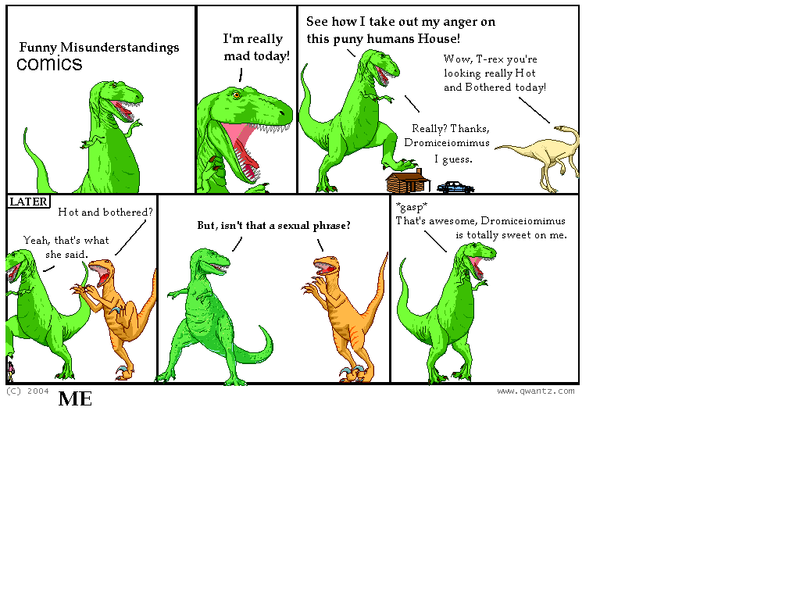 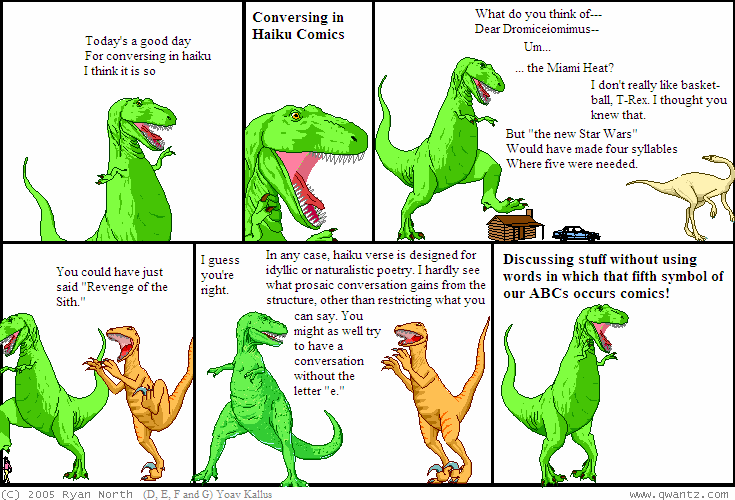 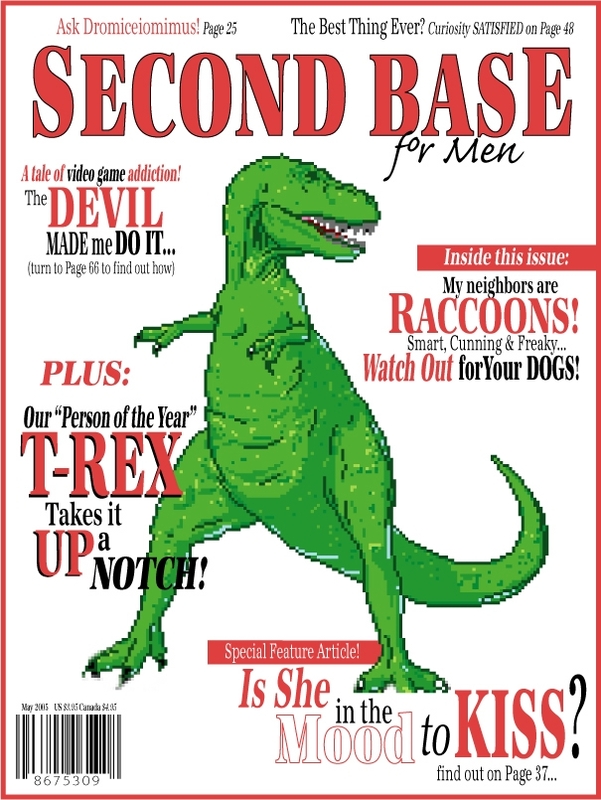 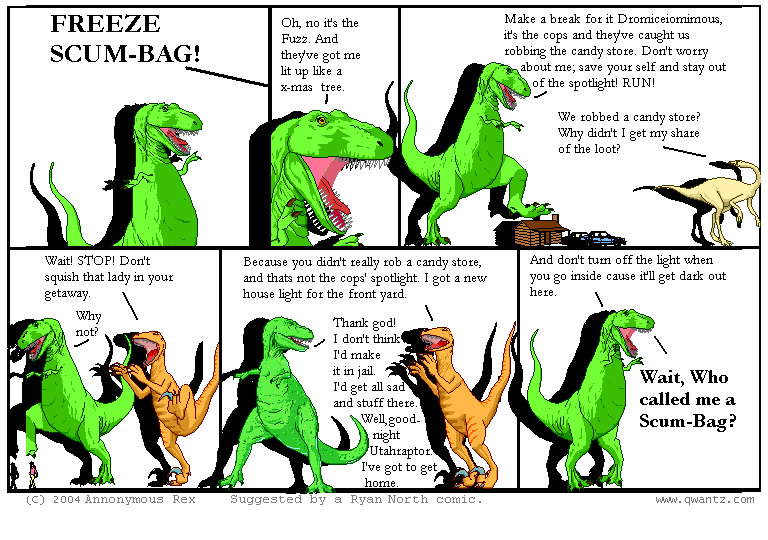 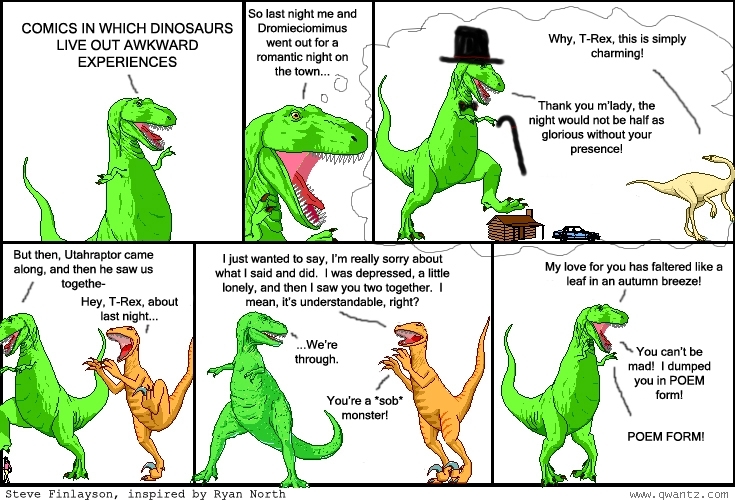 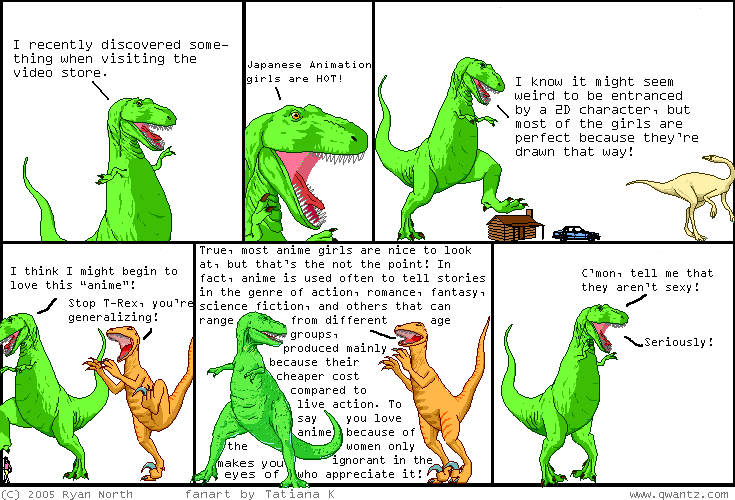 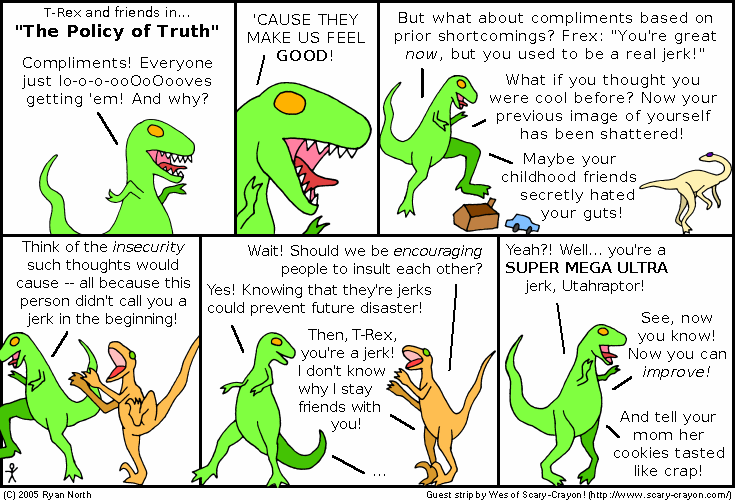 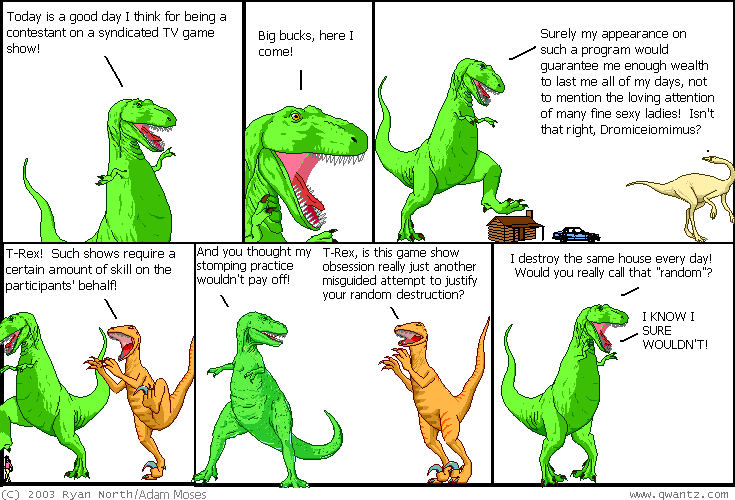 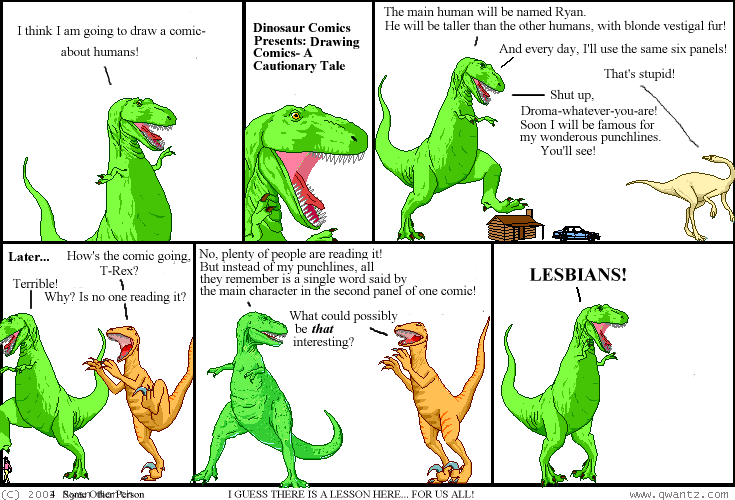 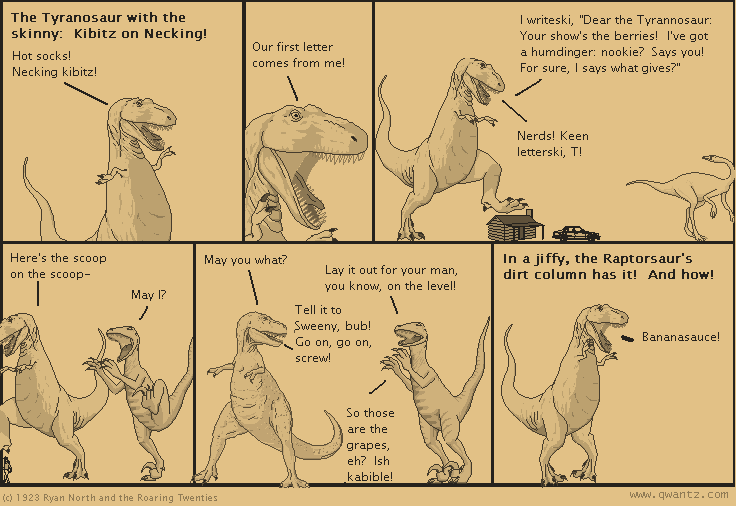 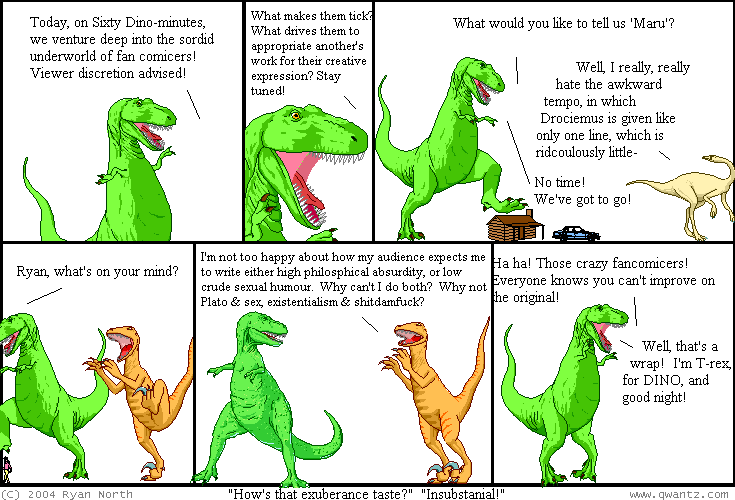 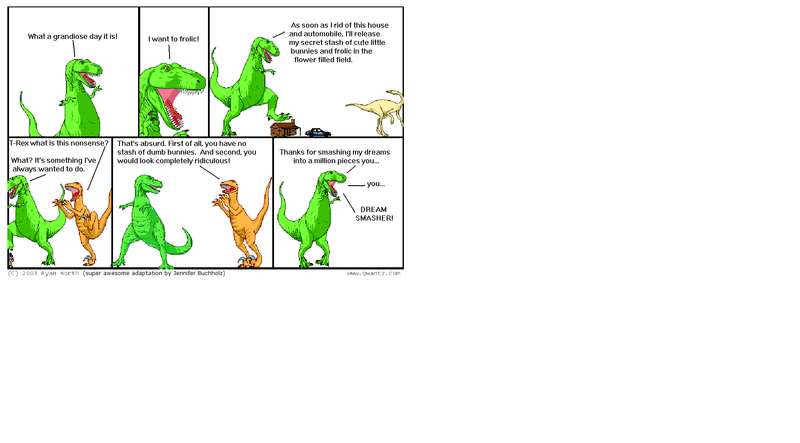 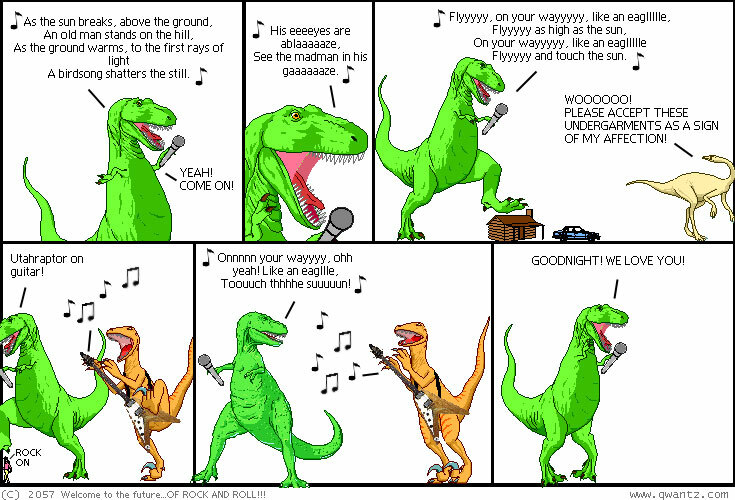 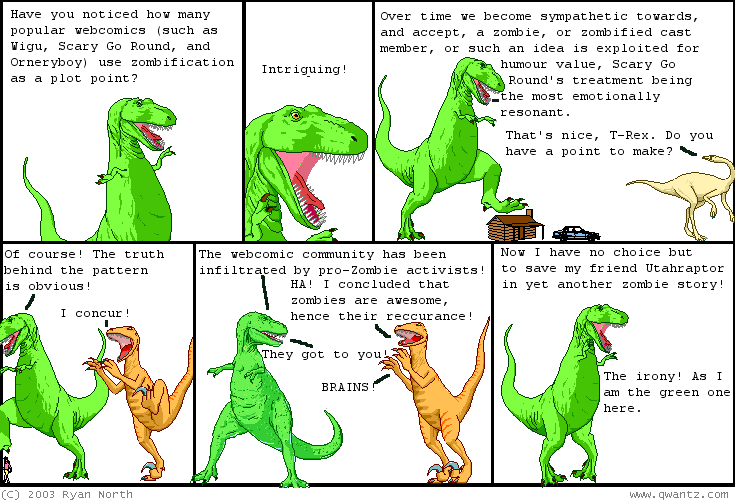 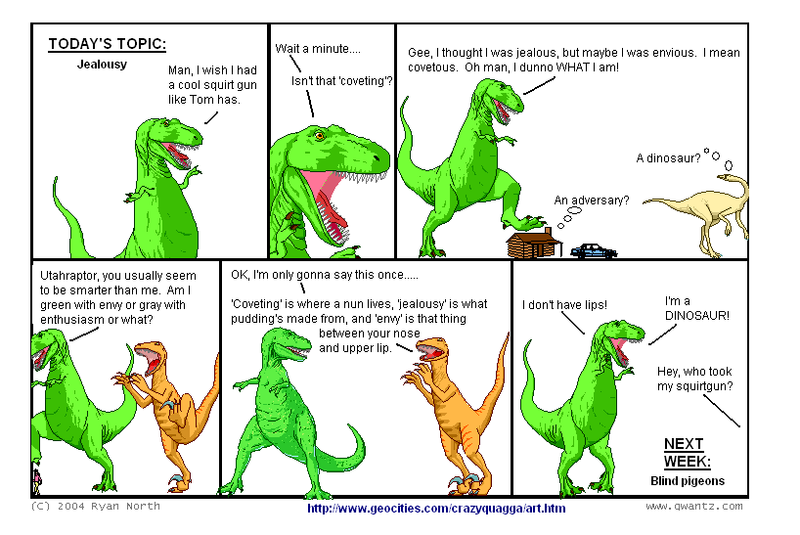 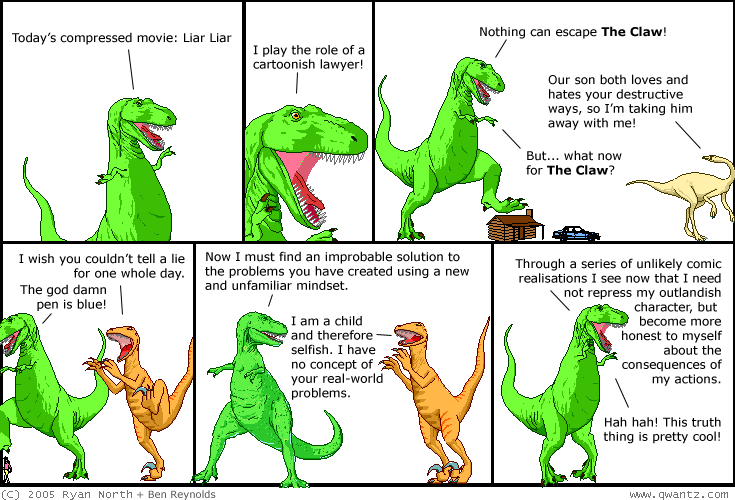 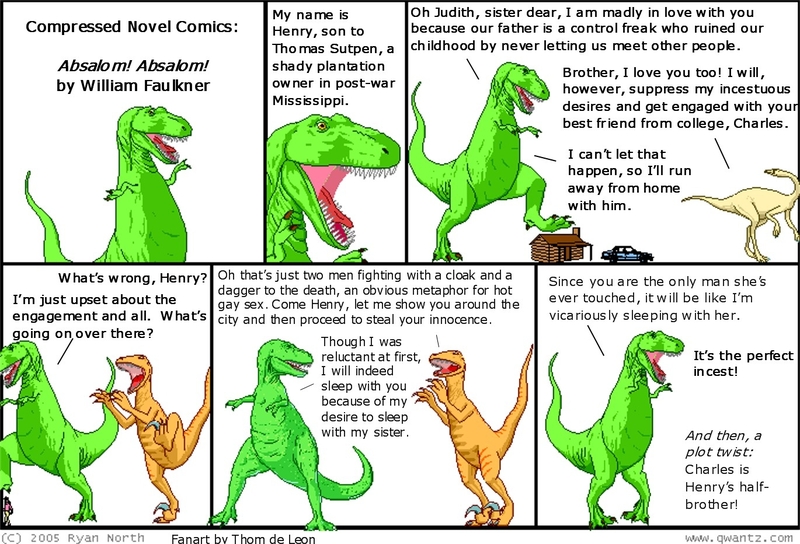 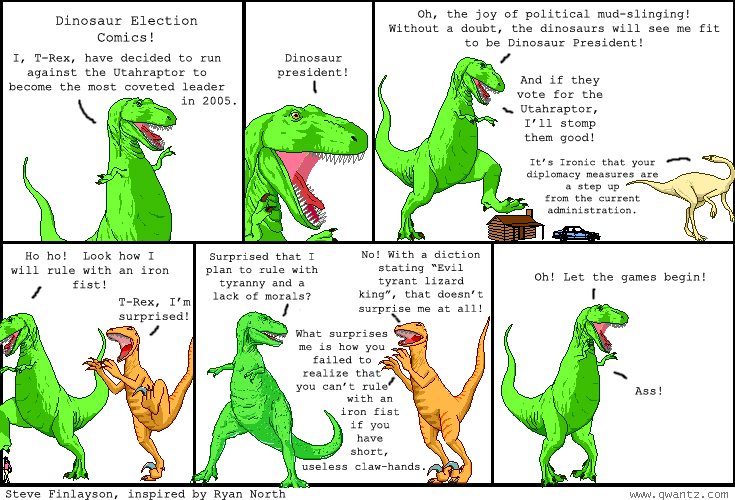 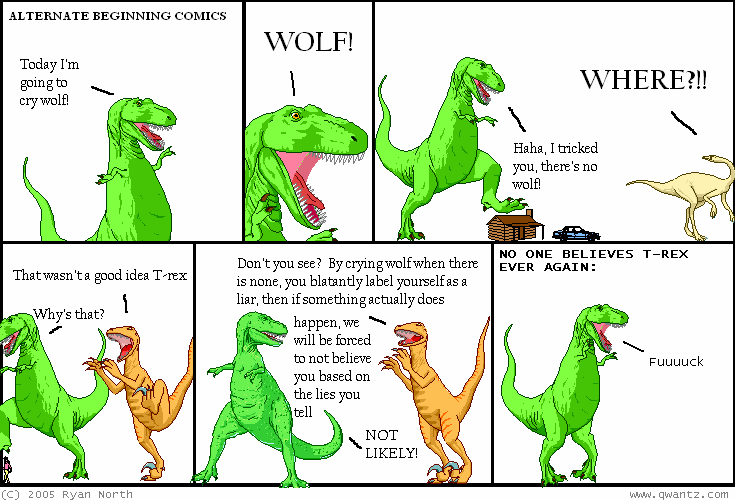 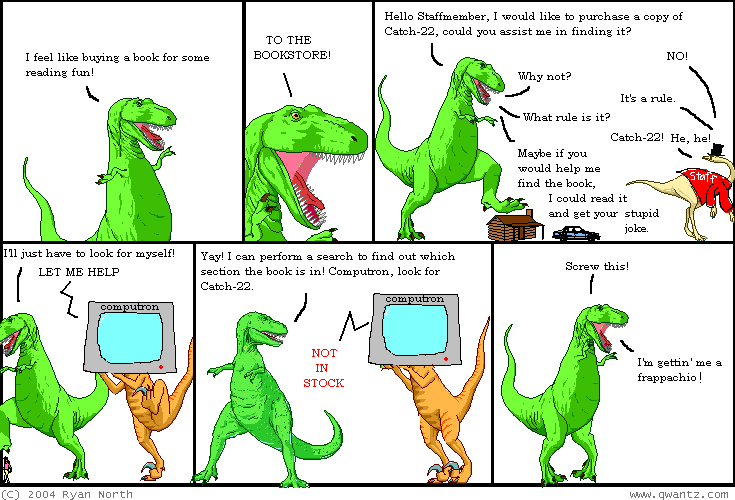 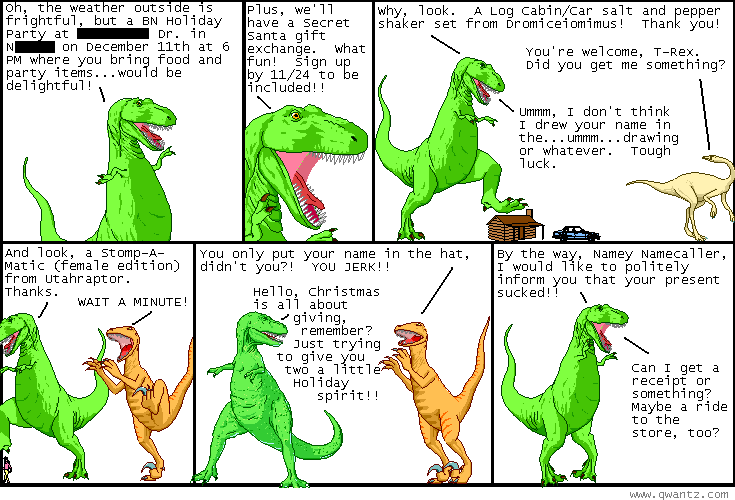 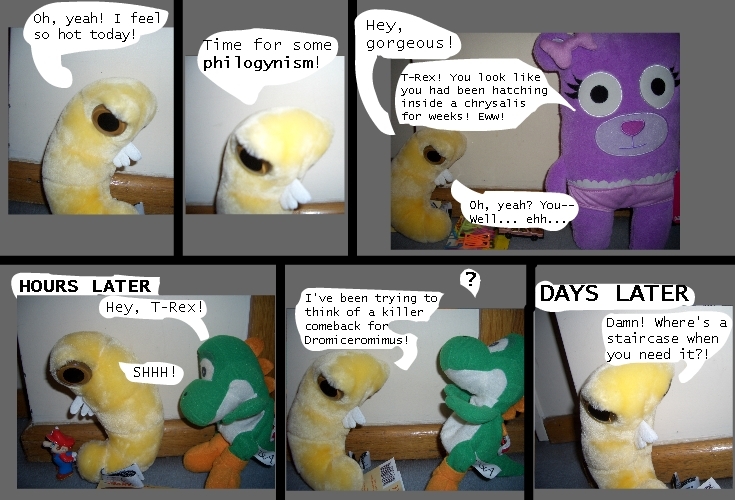 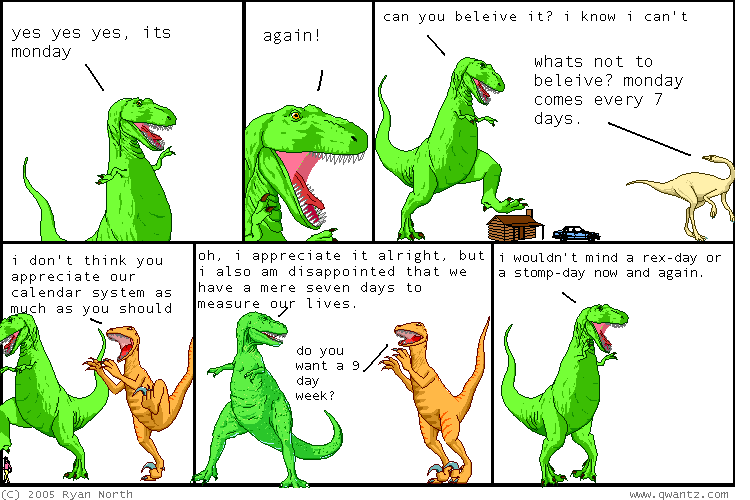 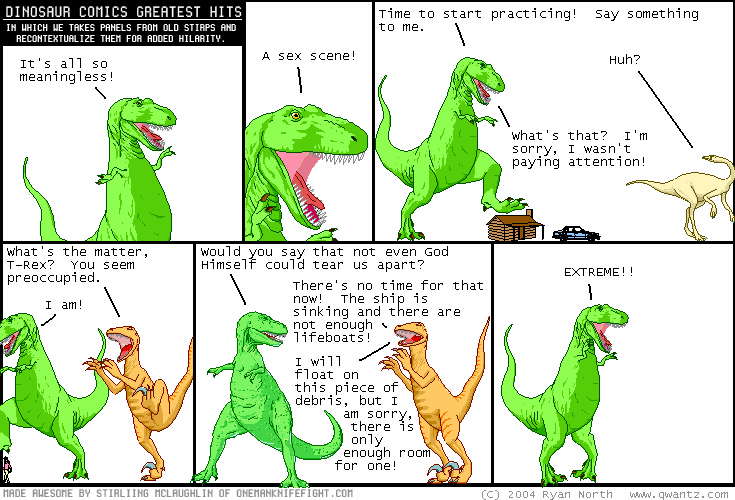 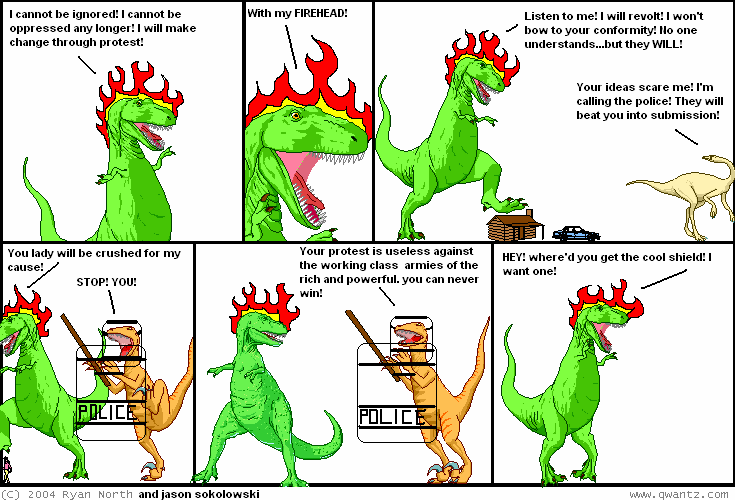 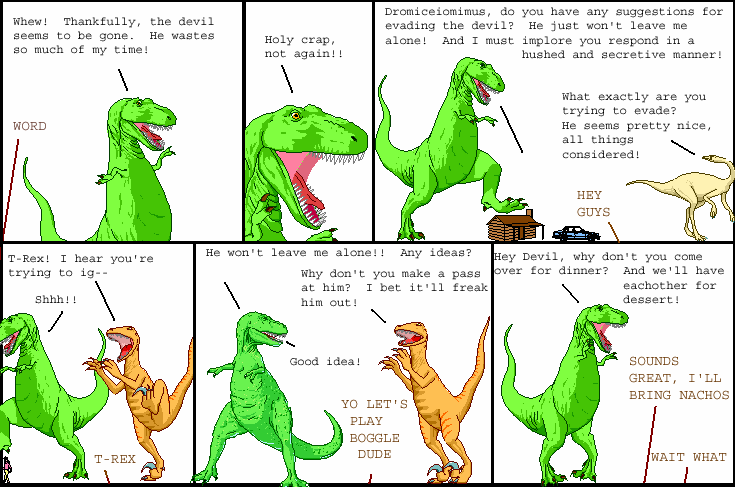 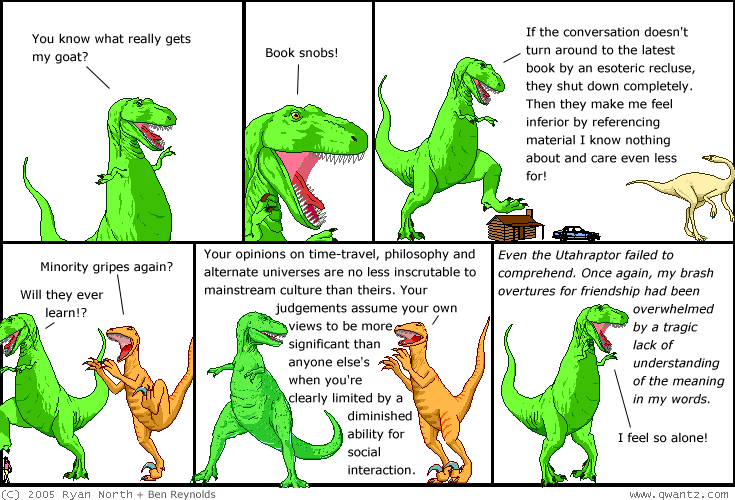 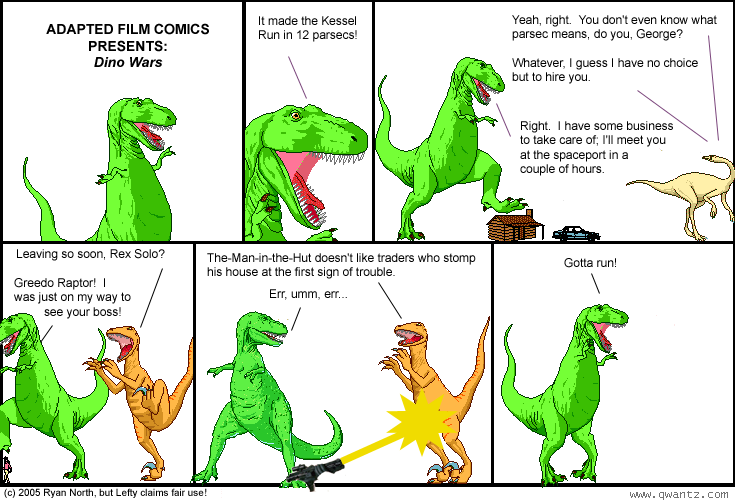 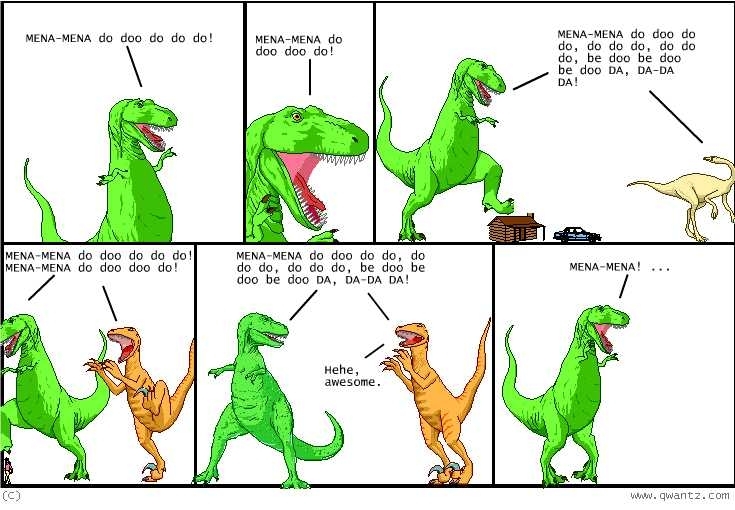 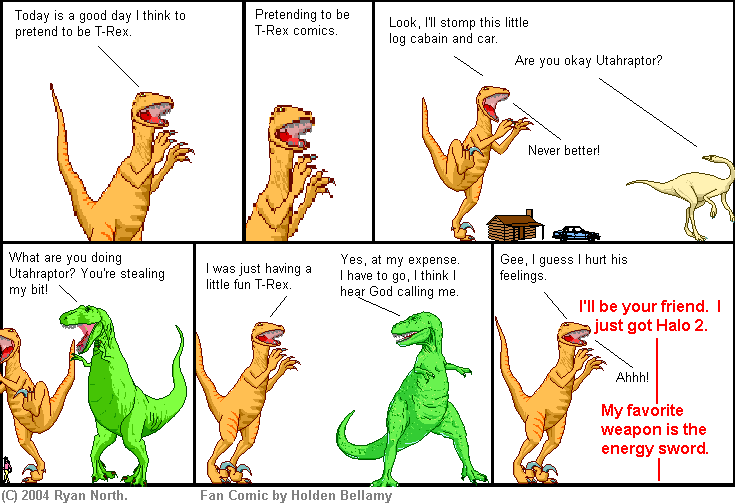 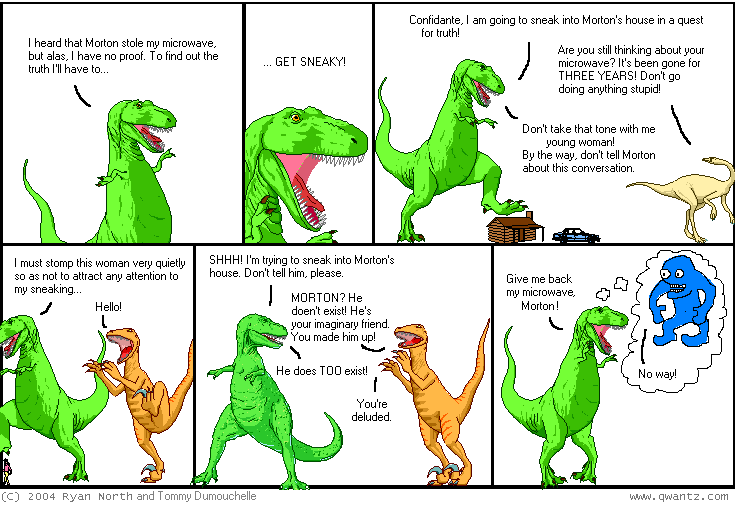 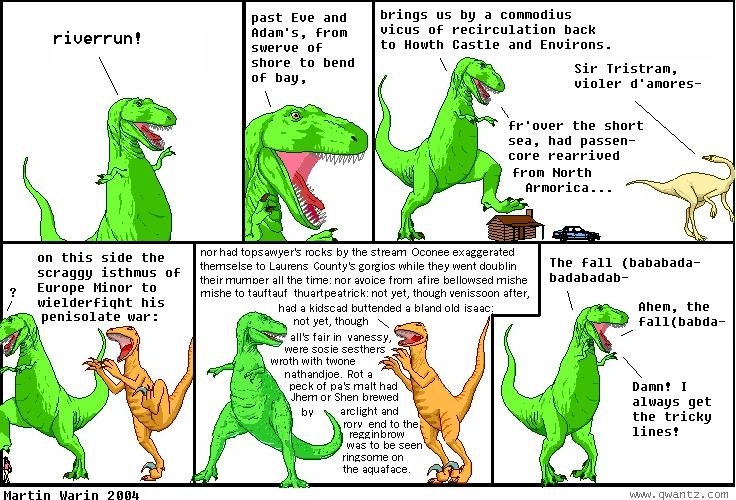 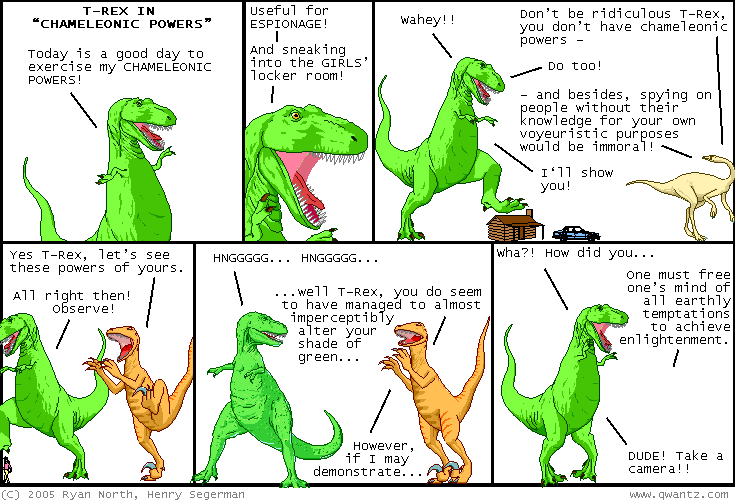 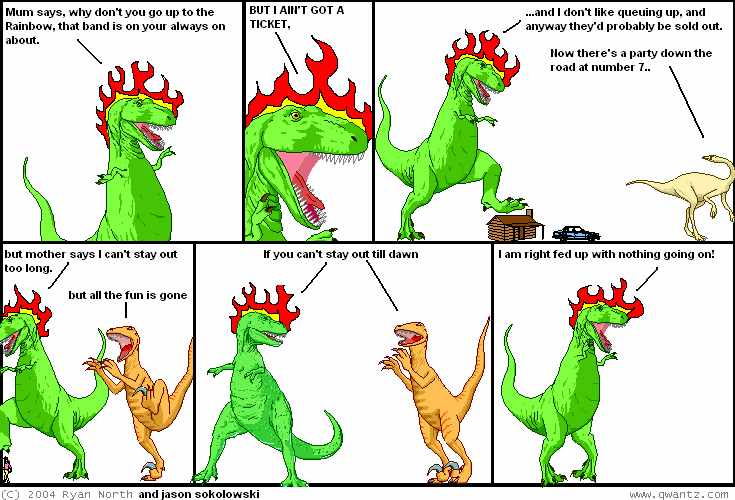 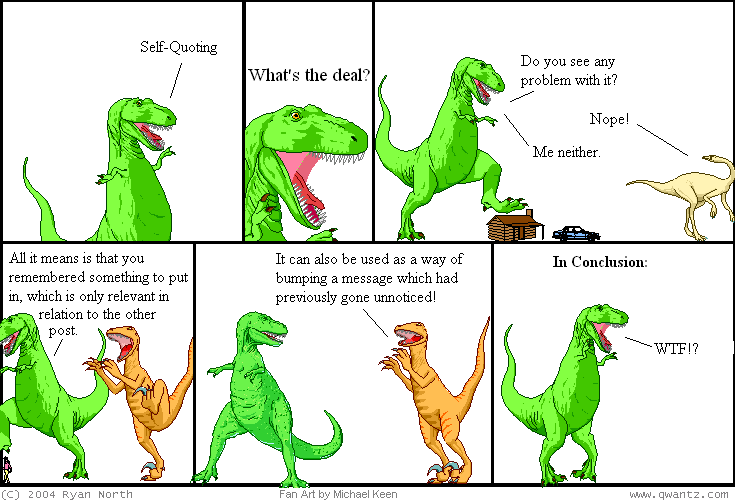 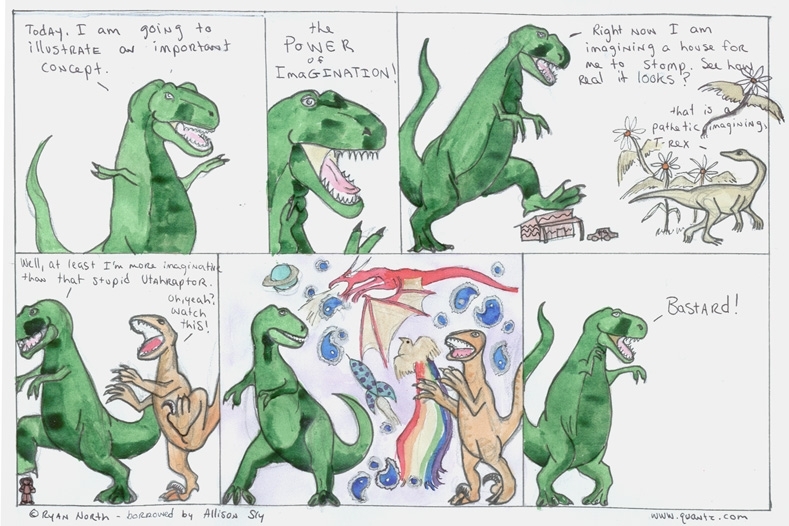 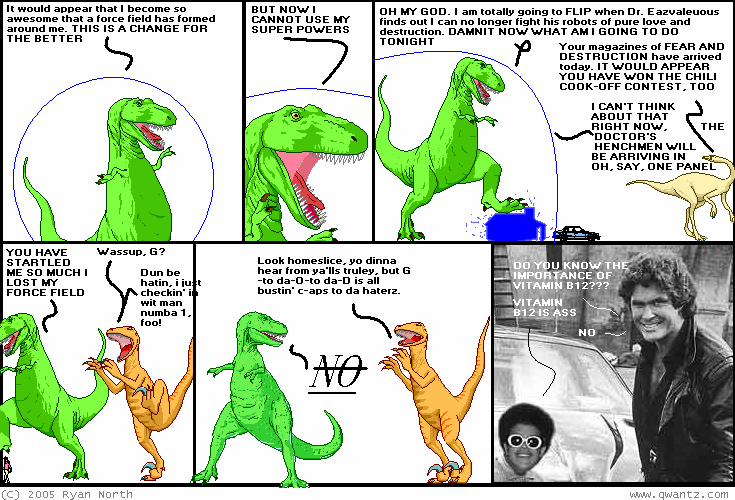 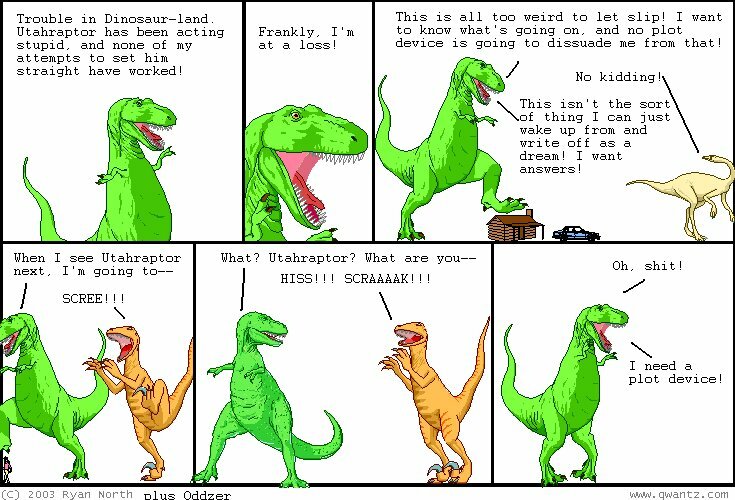 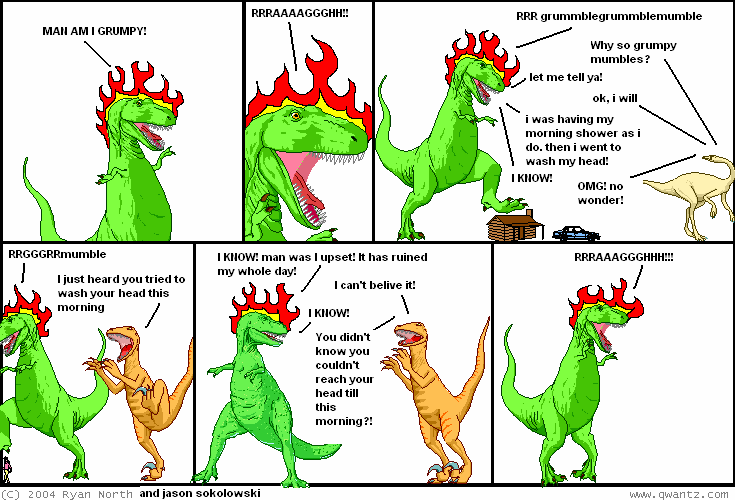 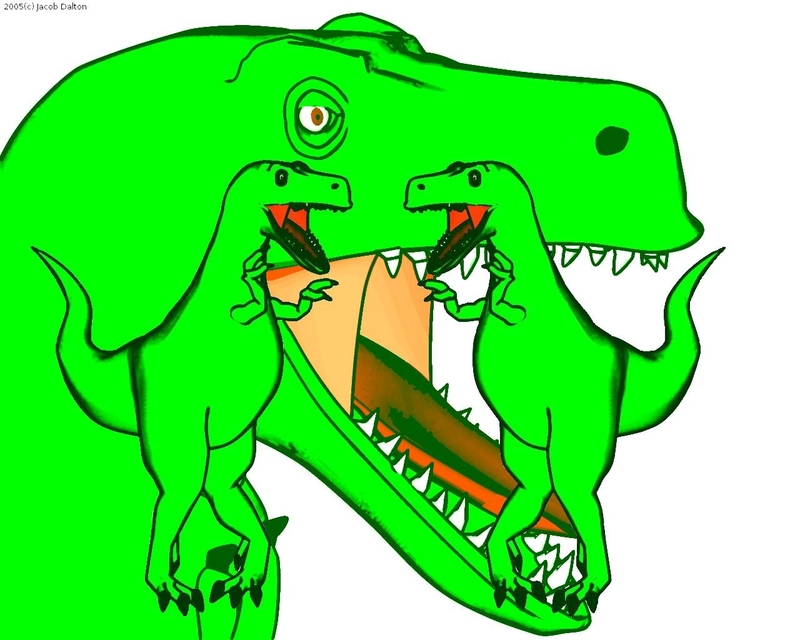 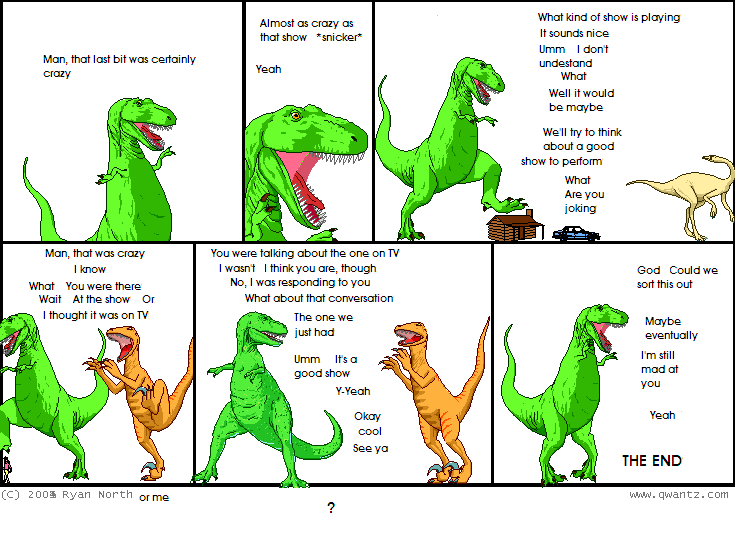 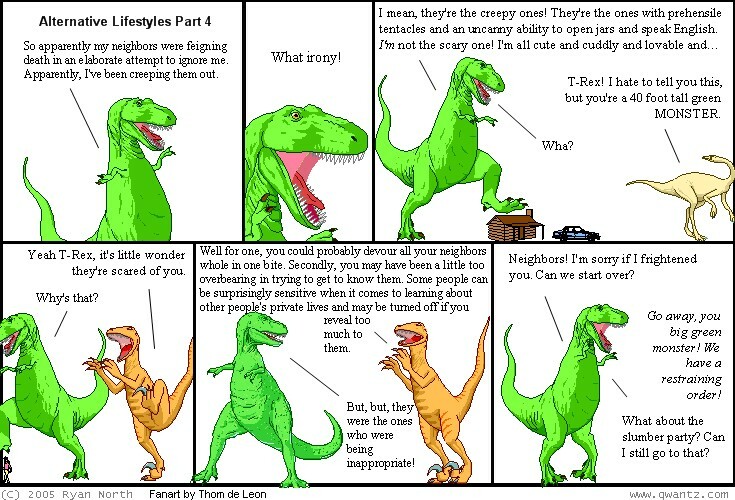 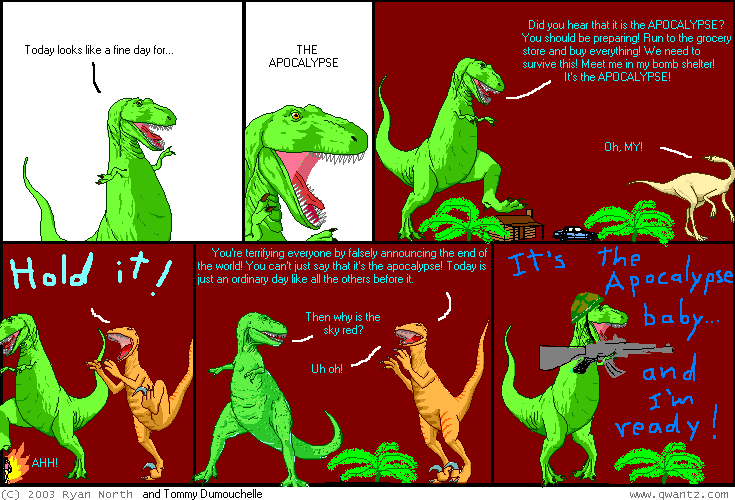 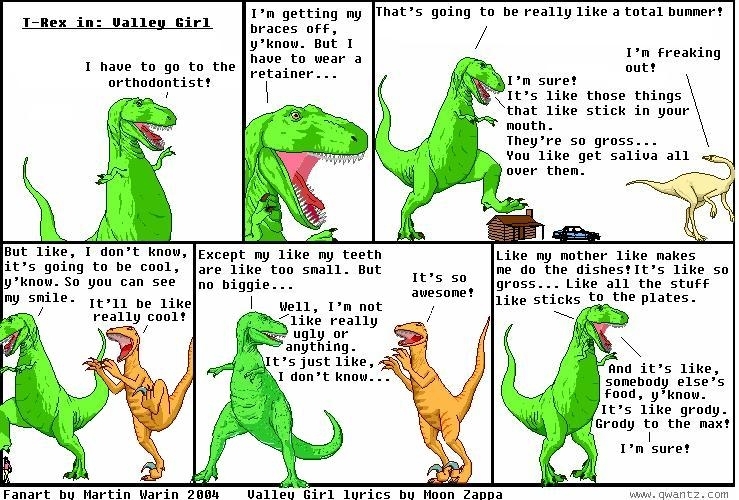 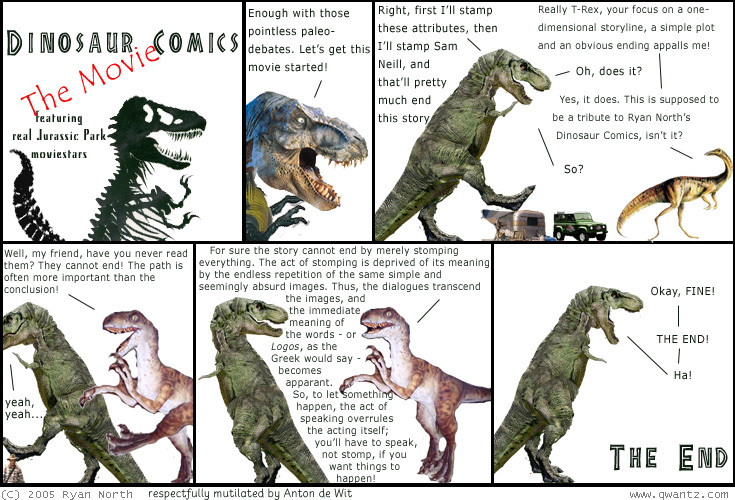 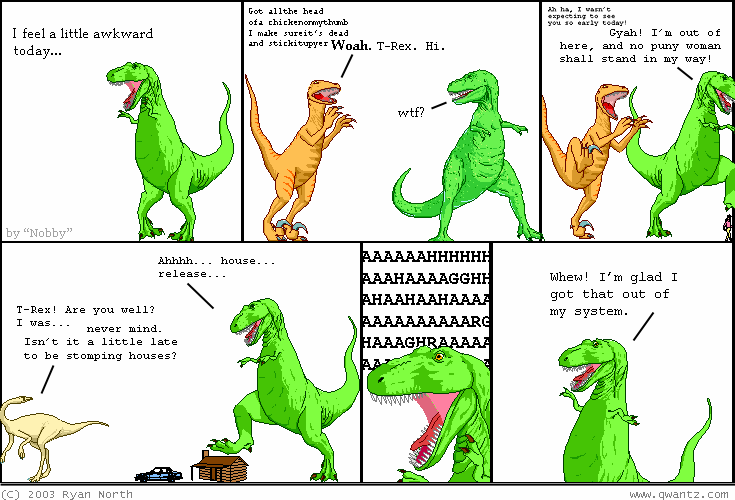 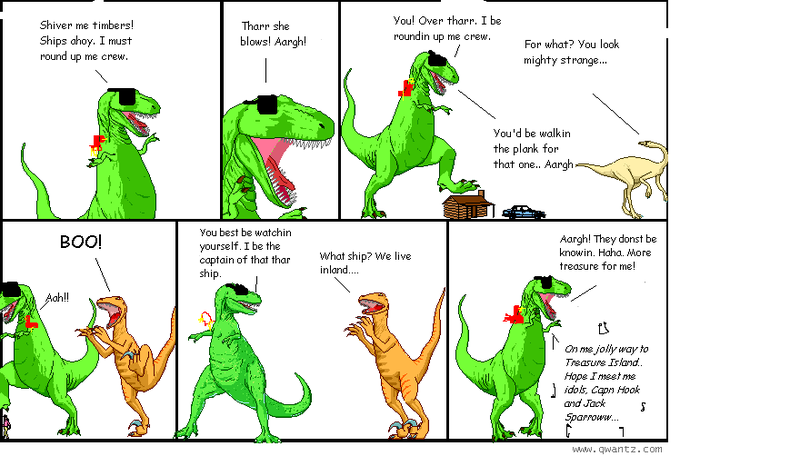 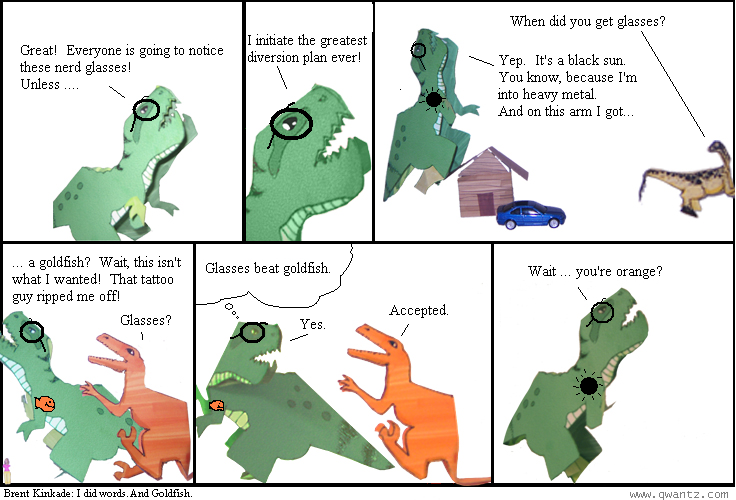 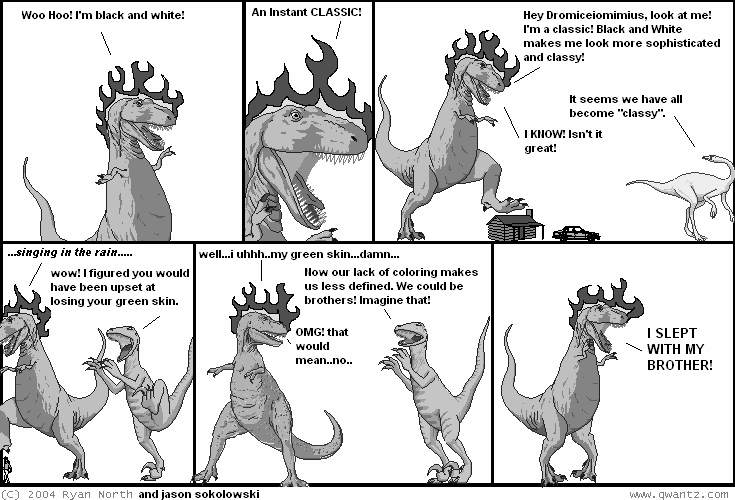 ravenswood of webcomicfan.com did this great review of dinosaur comics, in dinosaur comic form! 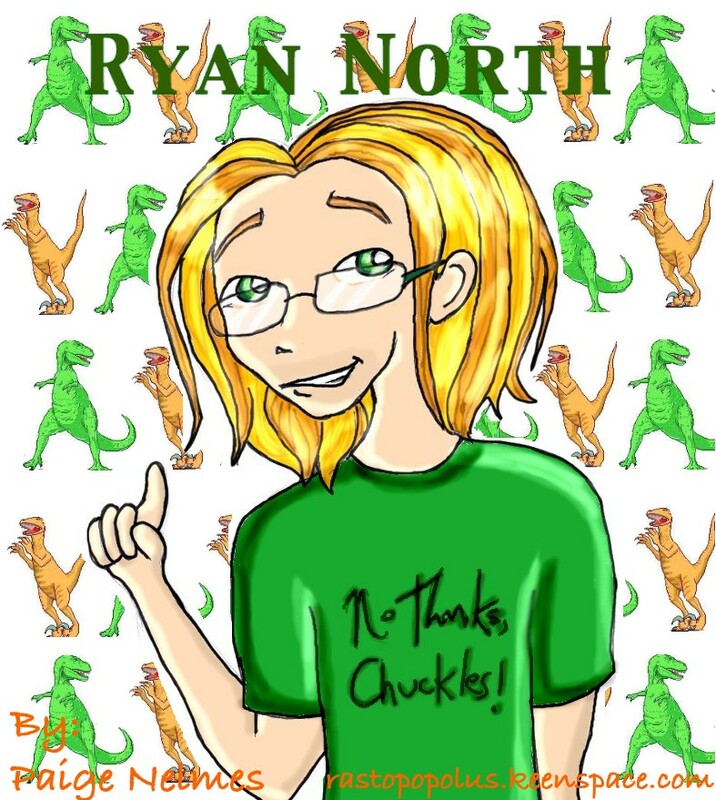 that's all the fan art there is so far!